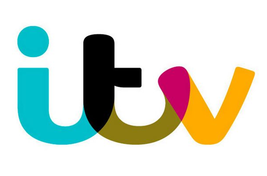 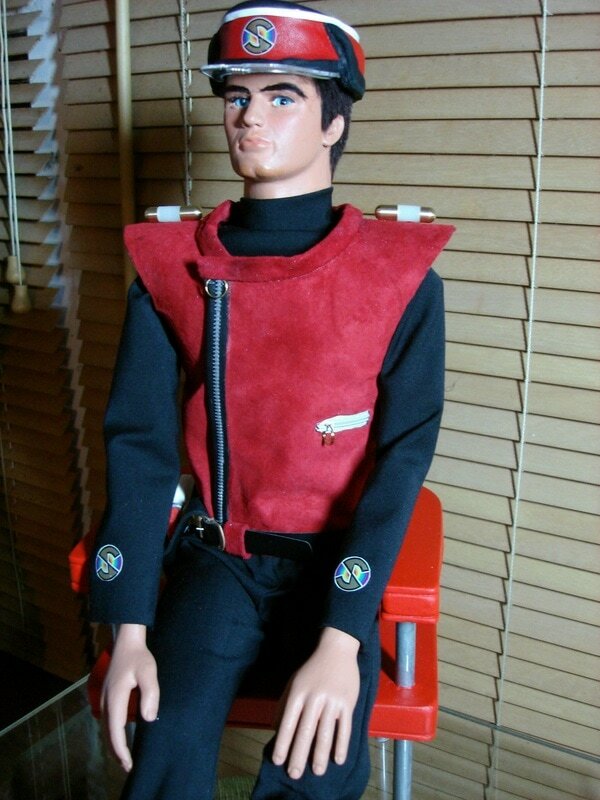 LICENCED BY ITV VENTURES LTD.
"I cannot quite believe how accurate Duncan's recreations are. 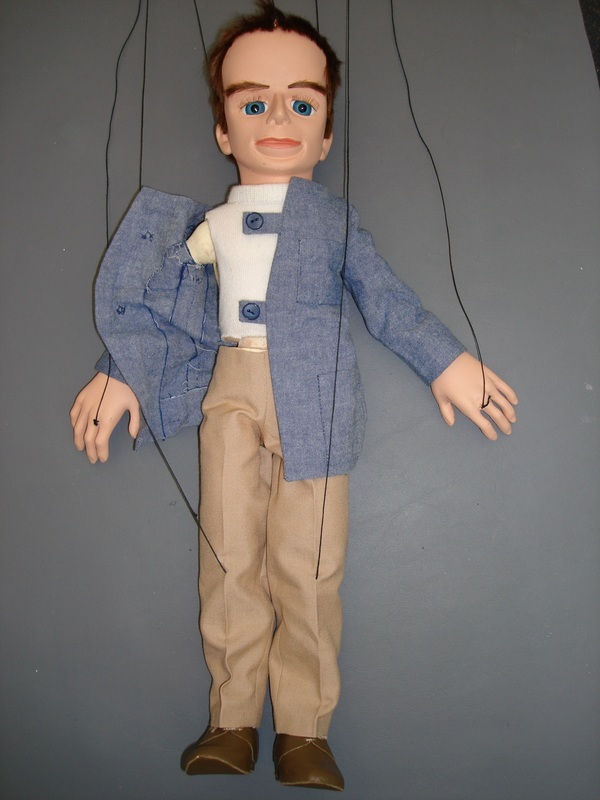 From first contact to receipt of the puppet I was consulted and kept informed throughout the process. 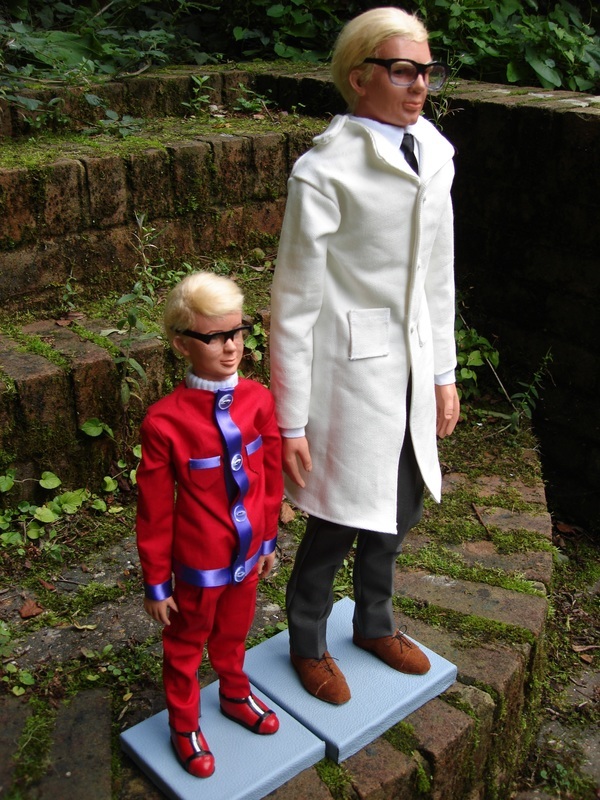 Wonderful. " 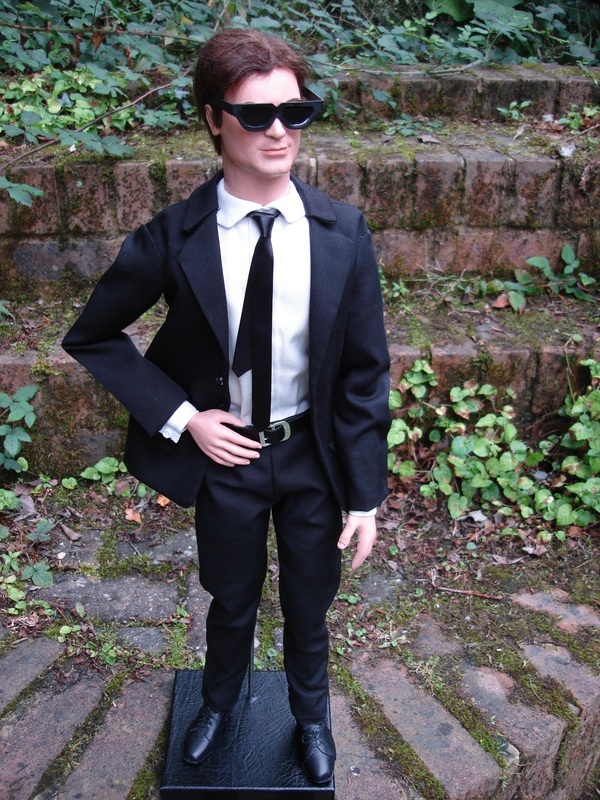 "OMG.. it is just phenomenal!! 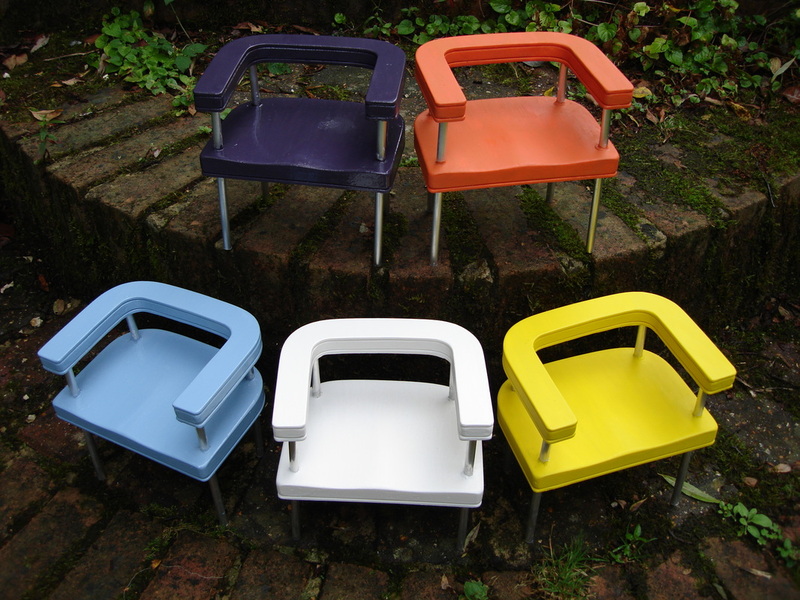 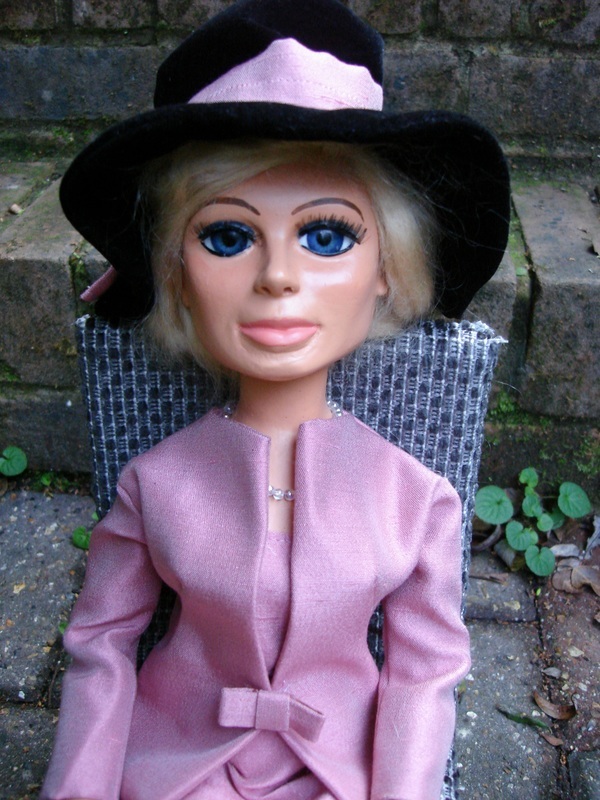 … I've been looking at your site for ages and have always wanted to own one one day!.. 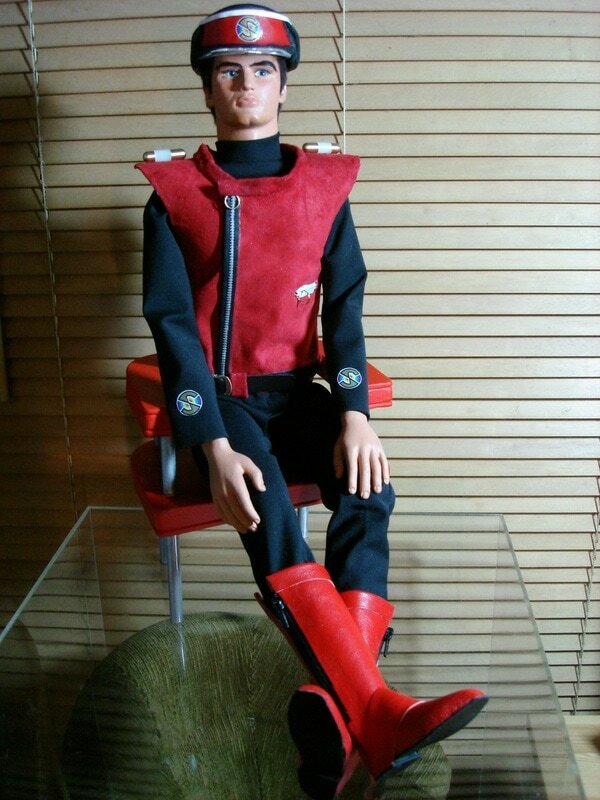 and now there it is, my own piece of Thunderbirds sitting in my dining room!!.. 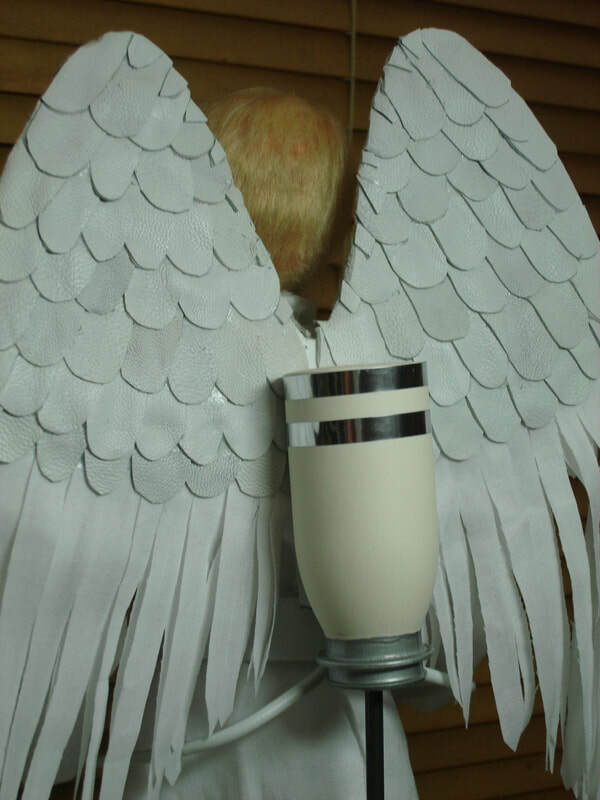 Thank you so much.. words can't describe how I felt when i opened it up.. you are so talented.. 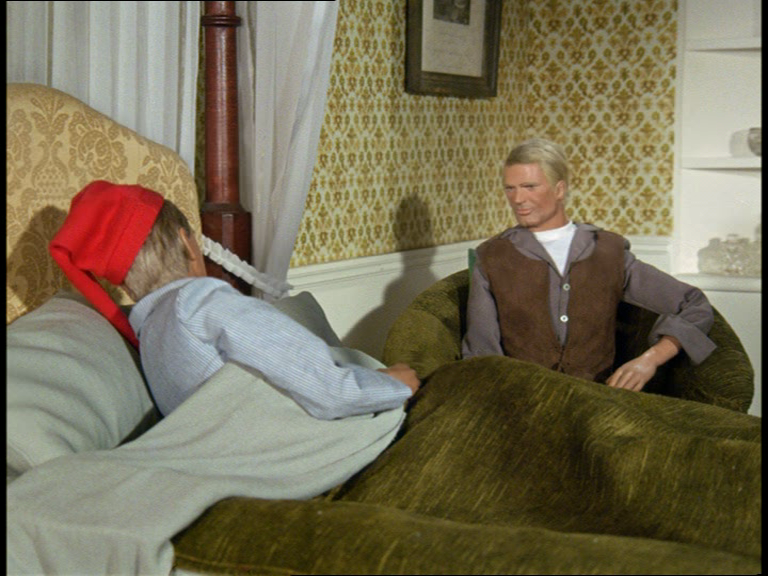 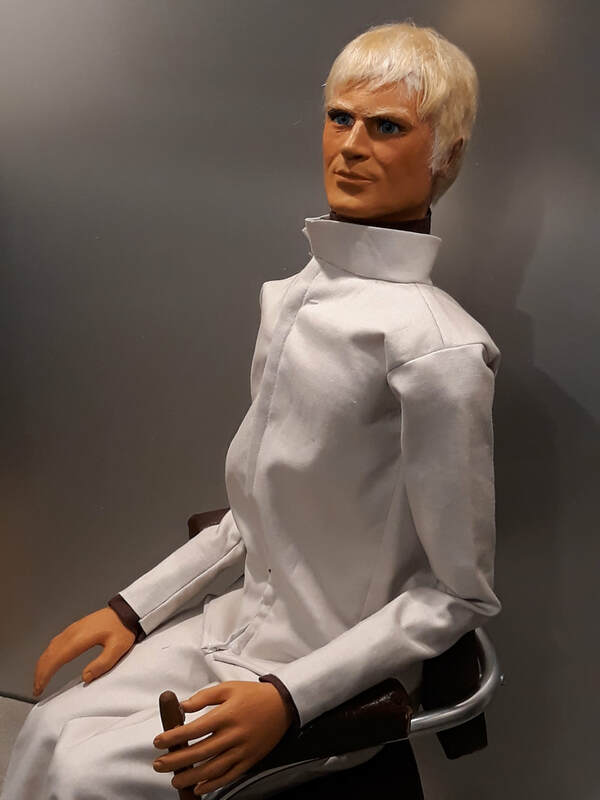 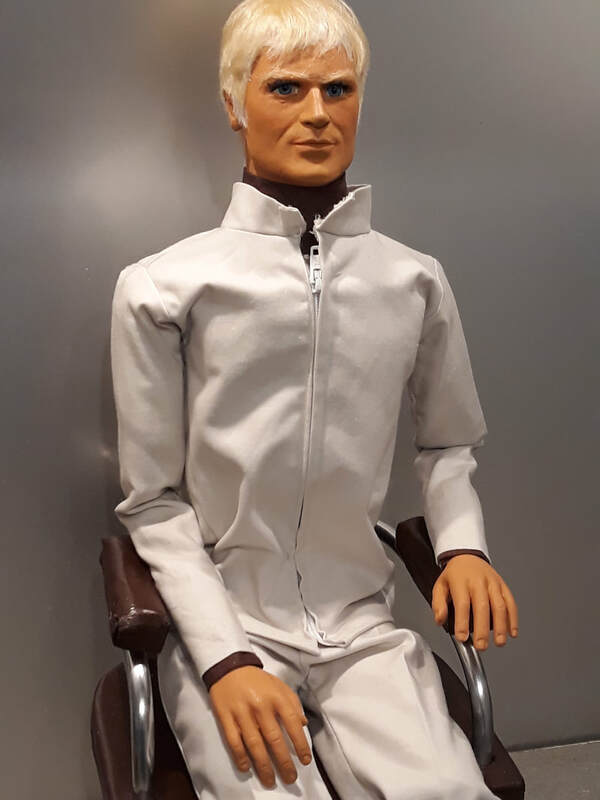 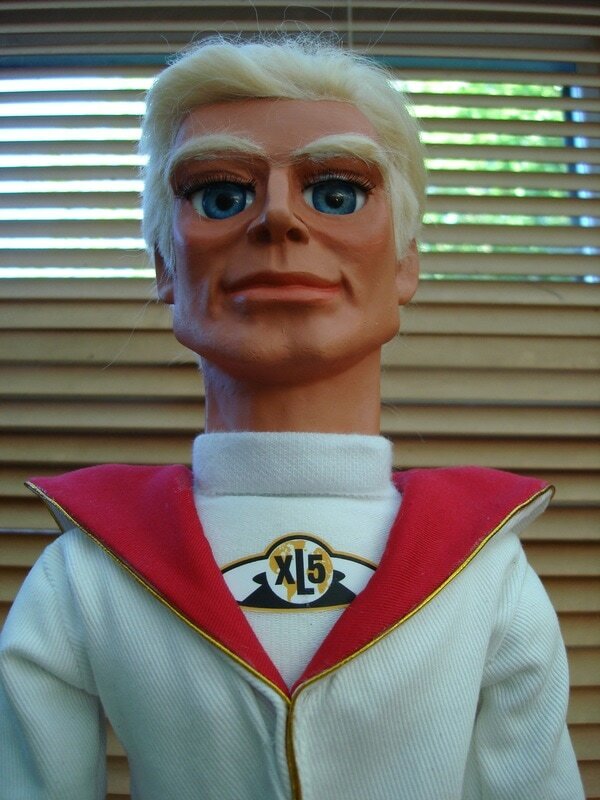 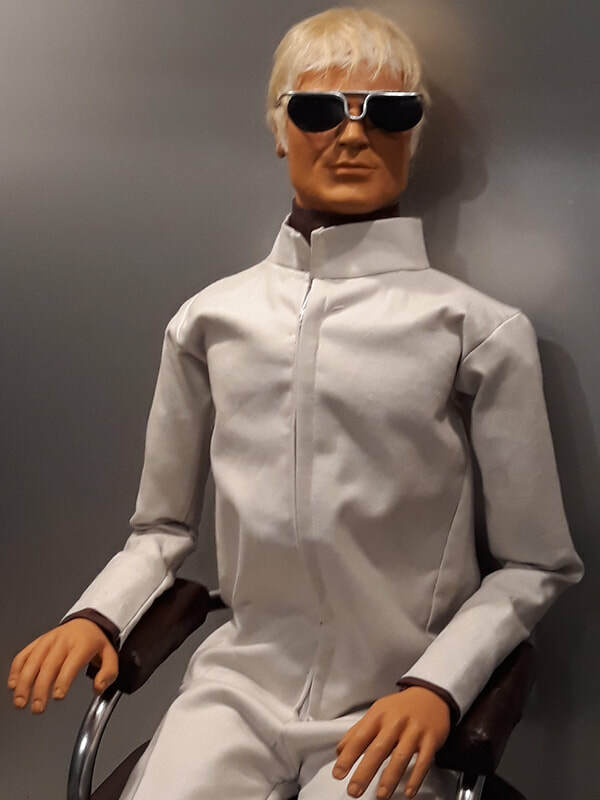 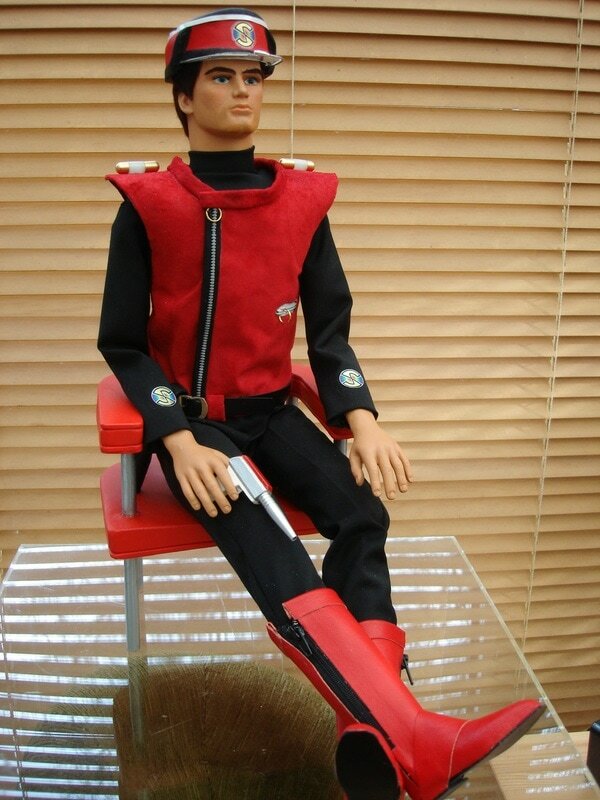 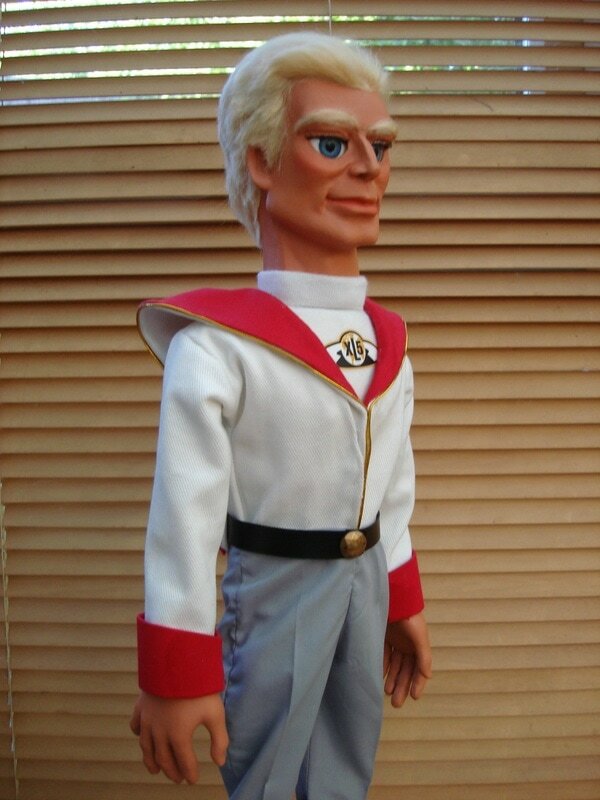 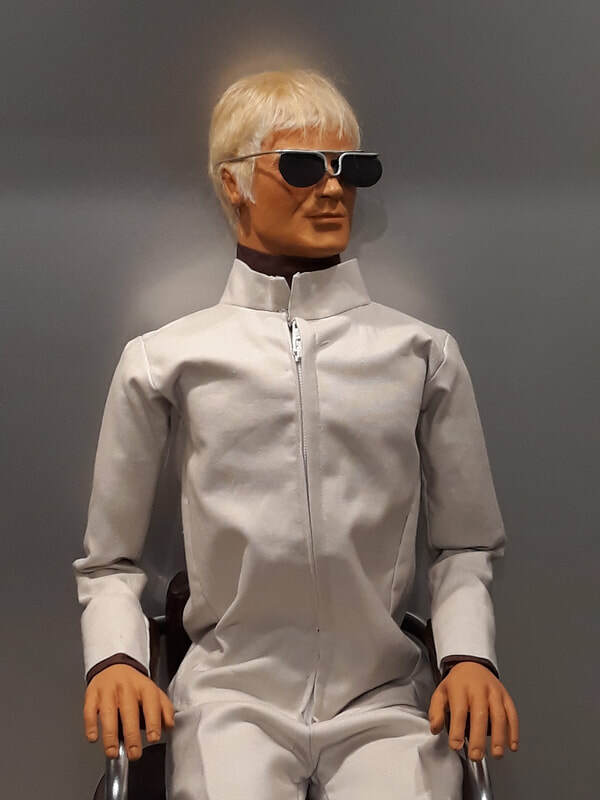 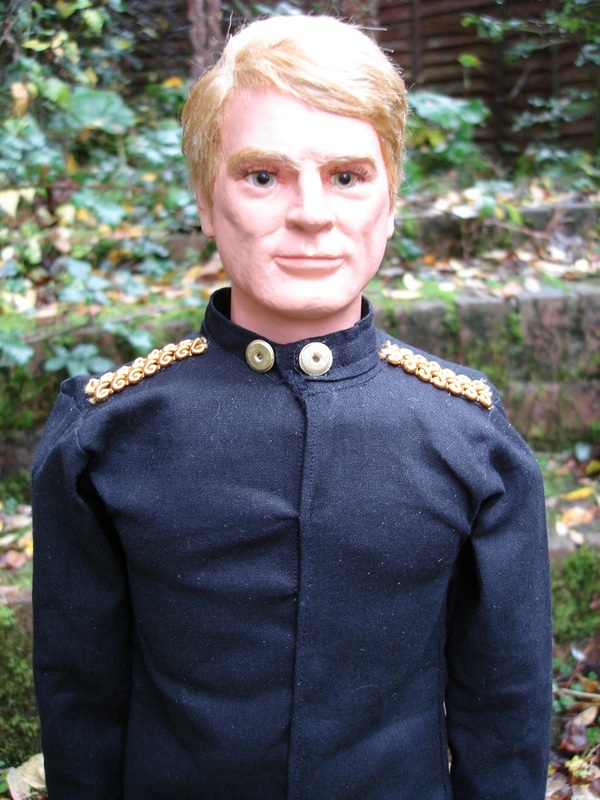 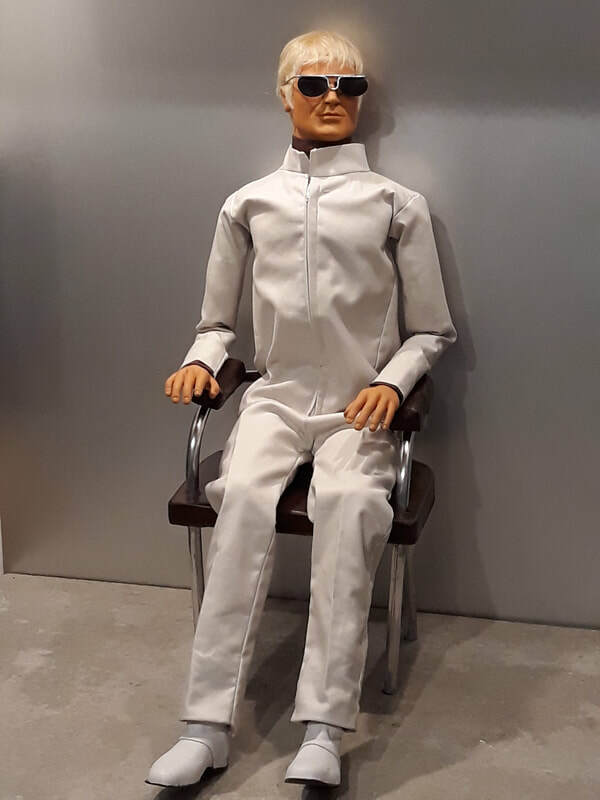 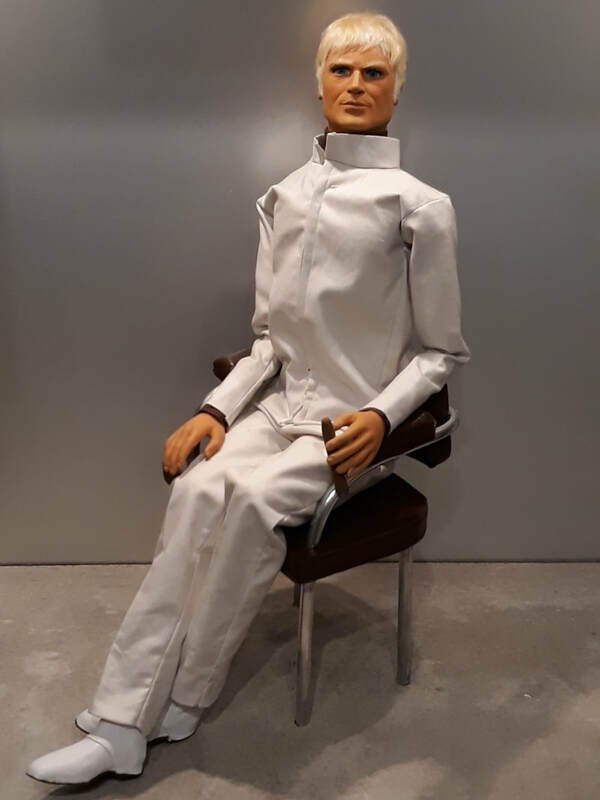 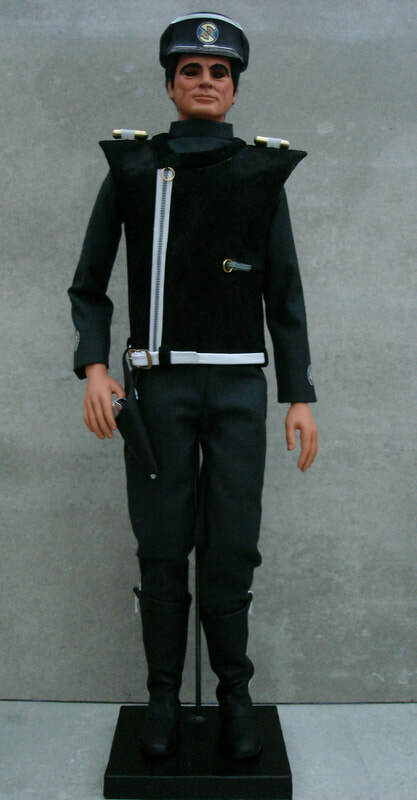 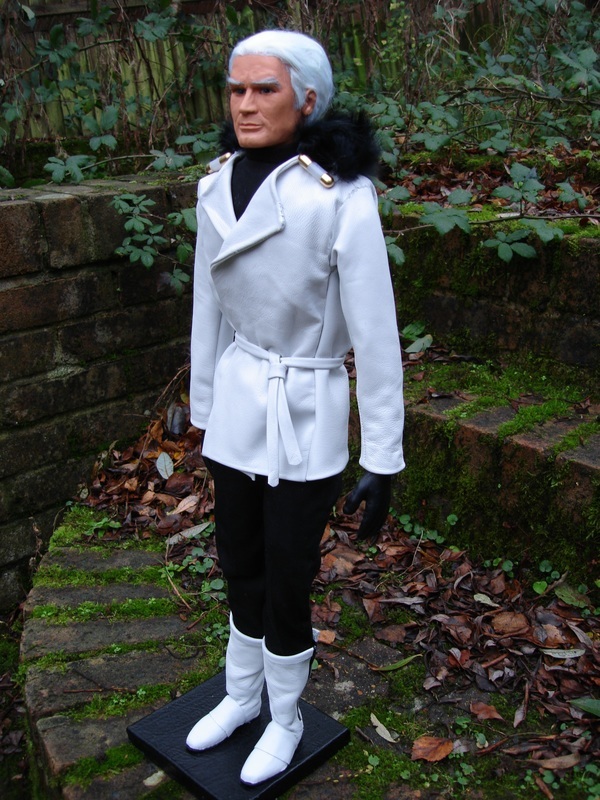 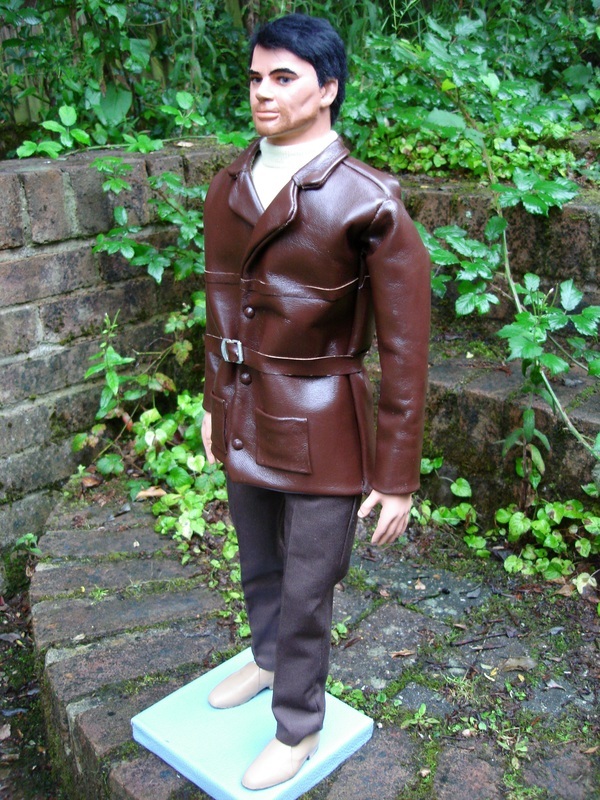 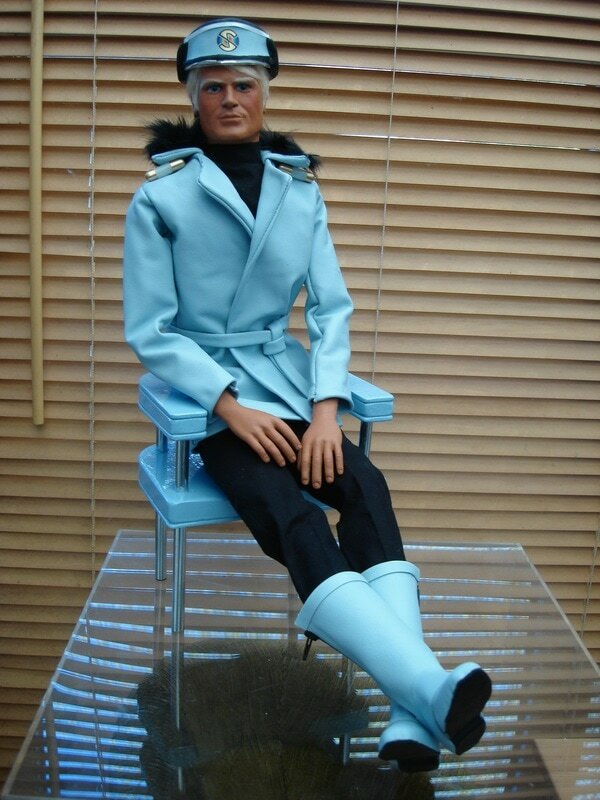 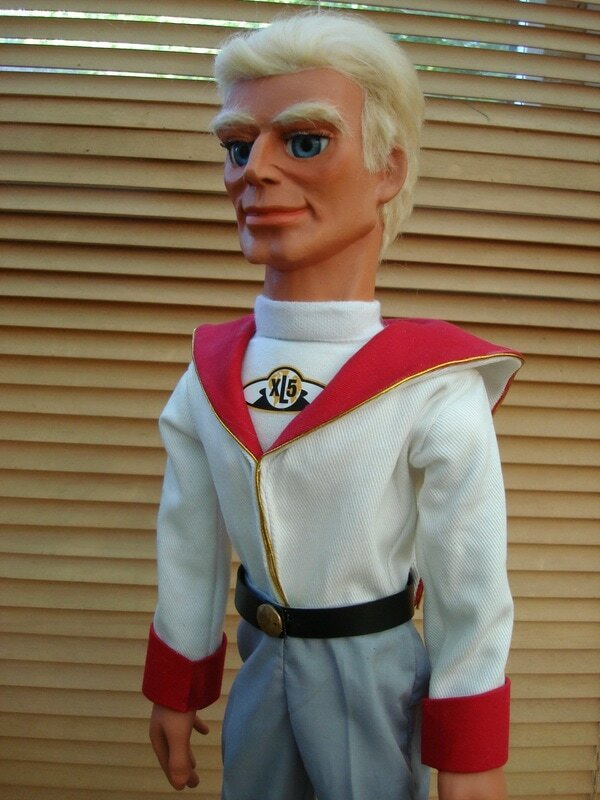 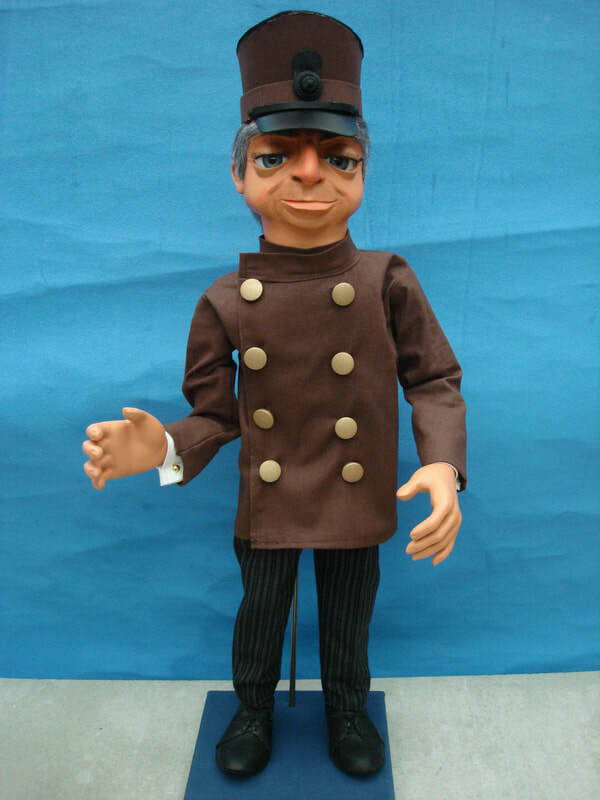 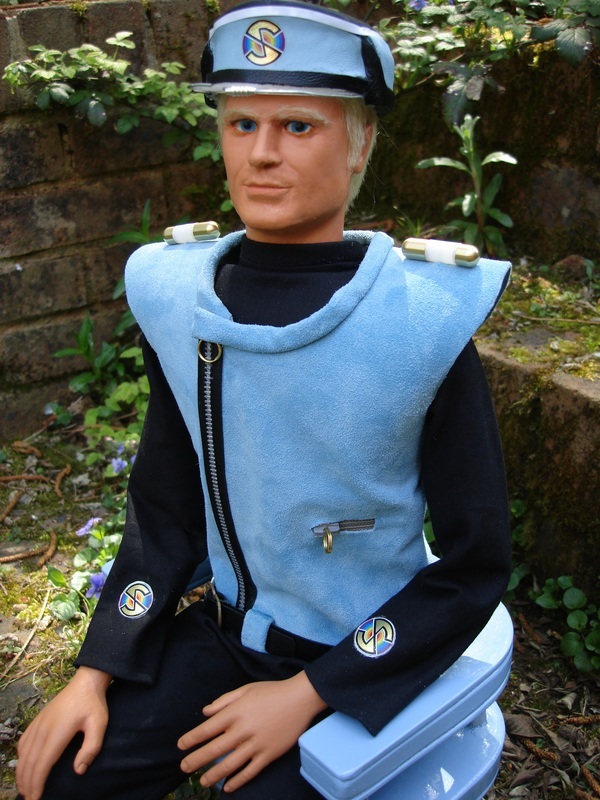 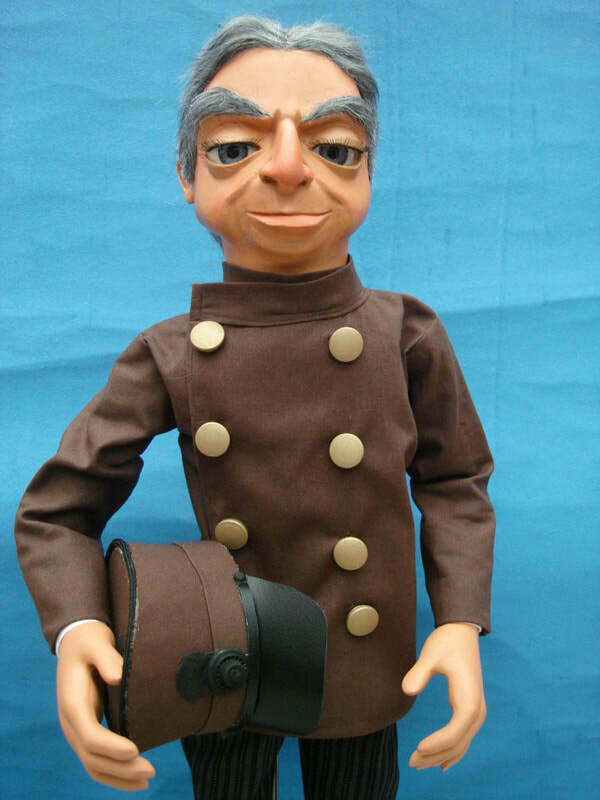 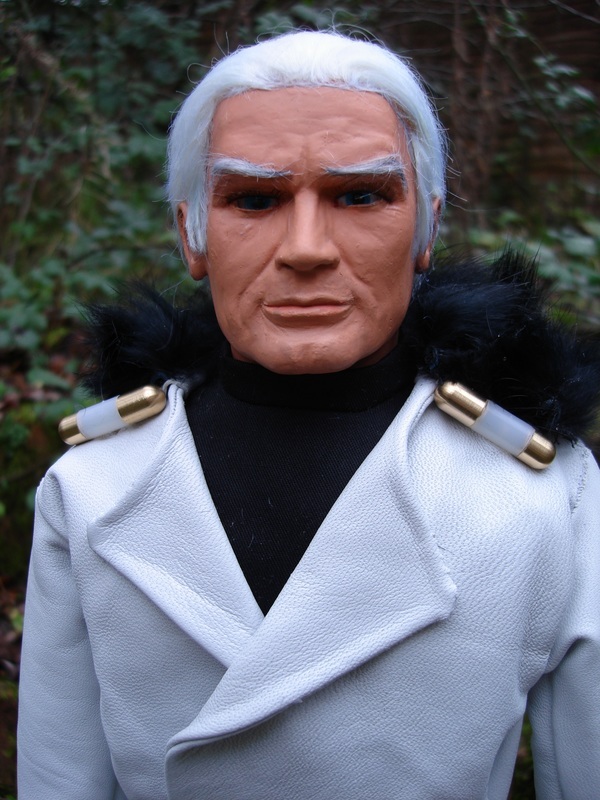 I can quote to make any character - real or fictional - in the style of a SUPERMARIONATION puppet, either as a semi-caricature Thunderbirds-type puppet (large head and hands) or as a more realistically-proportioned Captain Scarlet-type puppet, like Ed Straker. 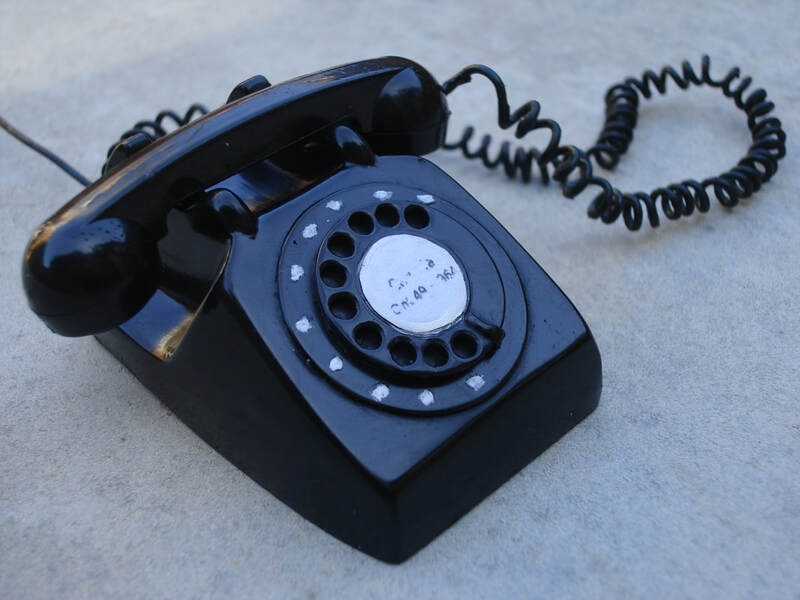 OR USE THE CONTACT FORM ACCESSED FROM THE BLACK TOOLBAR AT THE TOP OF THIS PAGE. 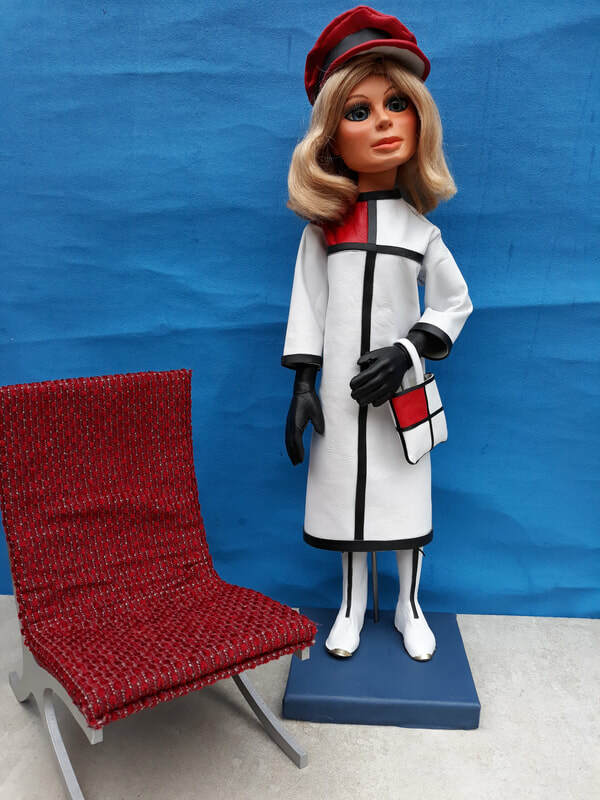 PARKER WAS SOLD IN THE 'WHAT MONEY CAN'T BUY AUCTION' WITH ALL PROCEEDS GOING TO GREAT ORMOND STREET HOSPITAL FOR SICK CHILDREN IN LONDON. 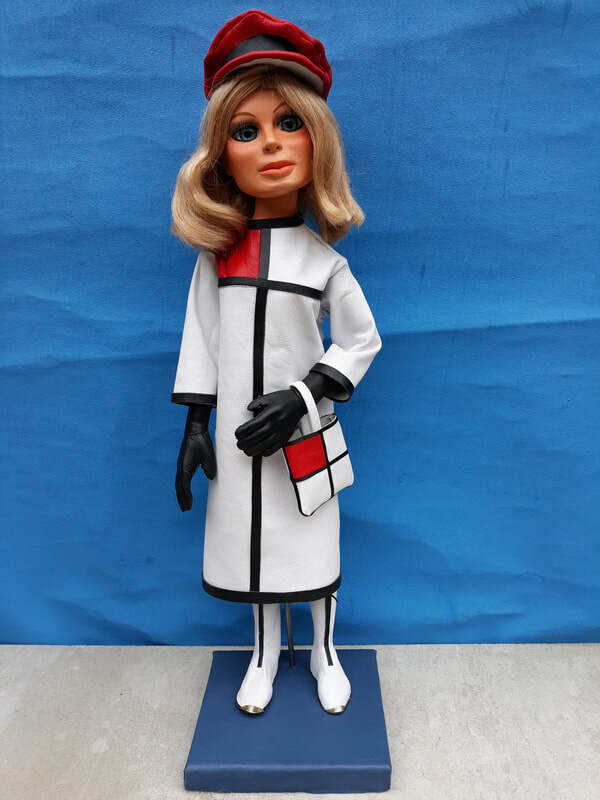 REPLICA OF THE FAMOUS LEATHER YSL MONDRIAN OUTFIT AS SEEN IN 'THE DUCHESS ASSIGNMENT'. 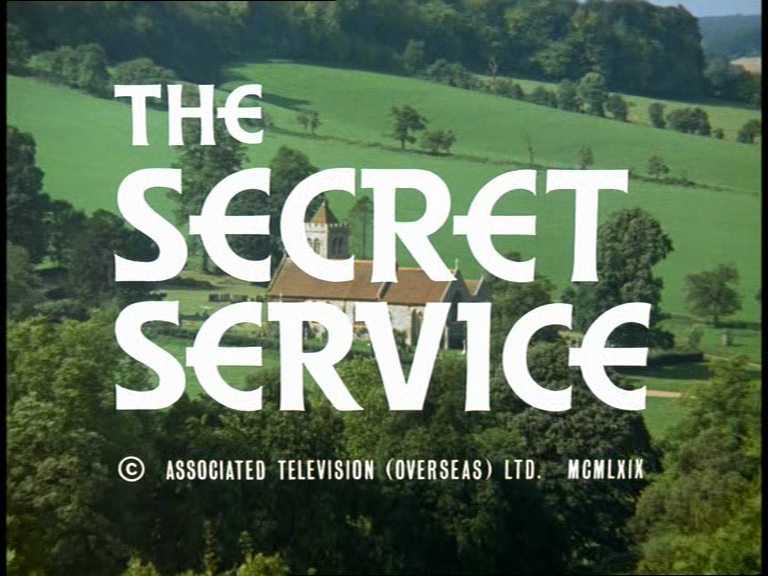 The Secret Service (See screen grabs above). 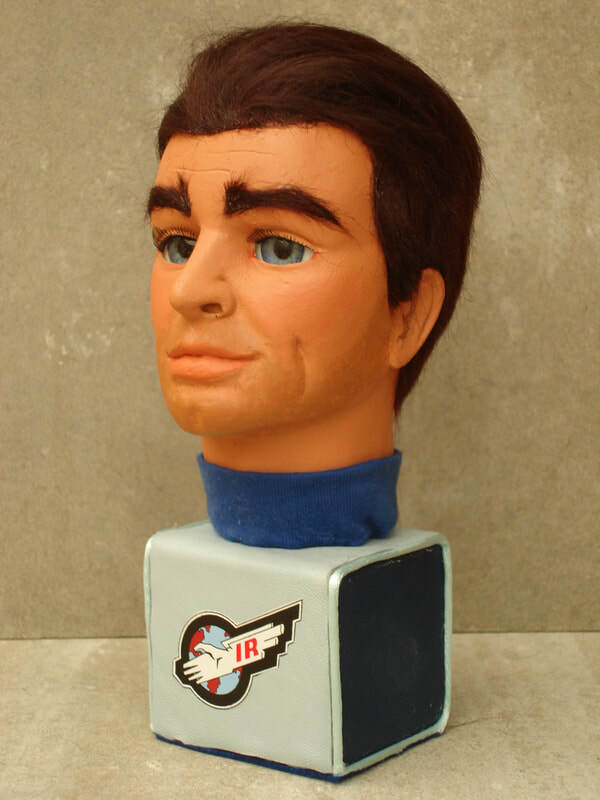 STUDIO-SCALE HEAD-ONLY DISPLAY...Can be made either with or without the cap and/or gun as part of the display. 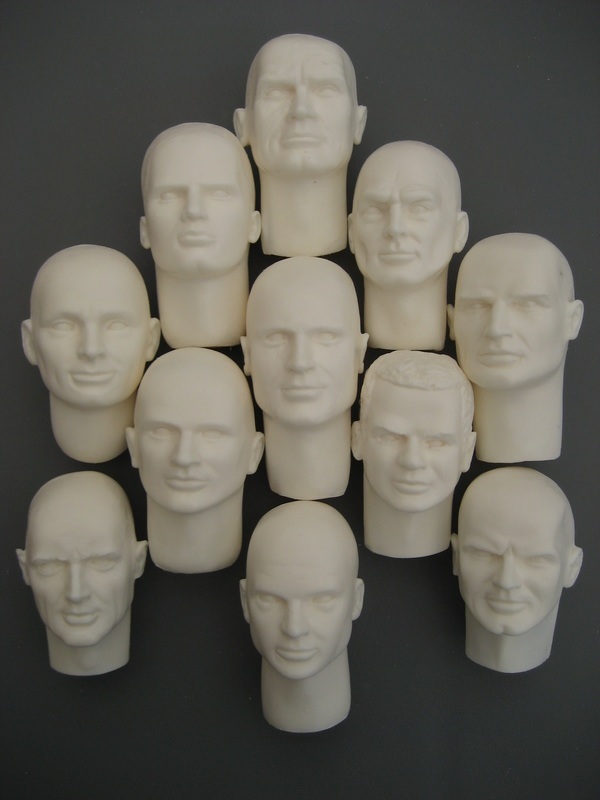 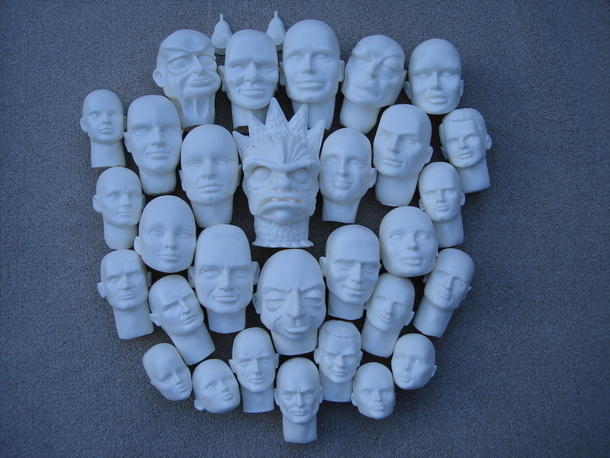 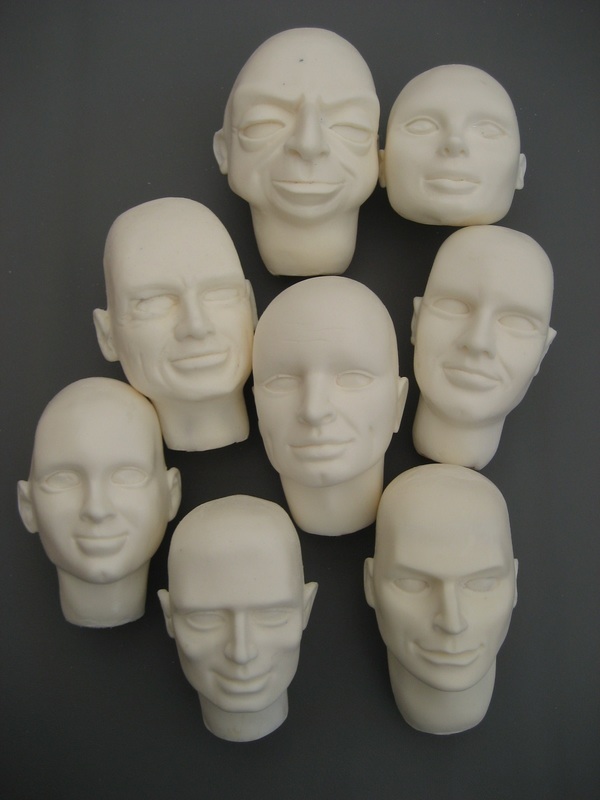 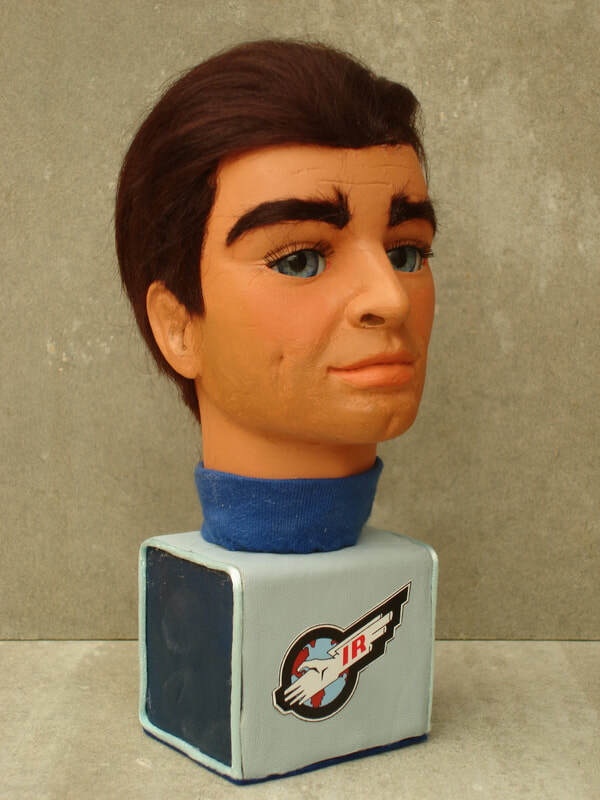 Prices start at £200 for a display like this of any available studio-scale Supermarionation character head cast. 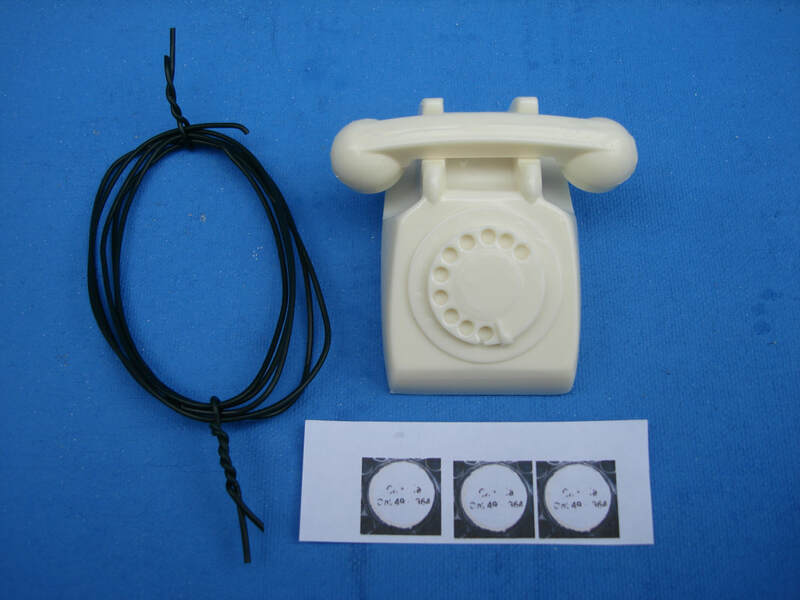 Delivery approx. 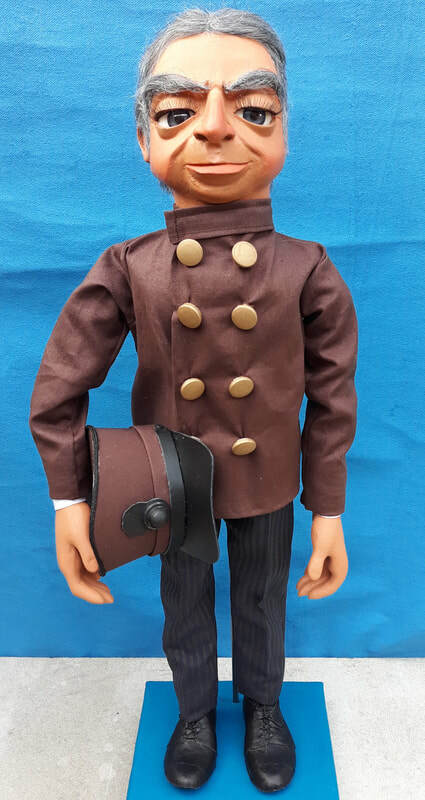 3 - 4 weeks from receipt of 50% deposit. 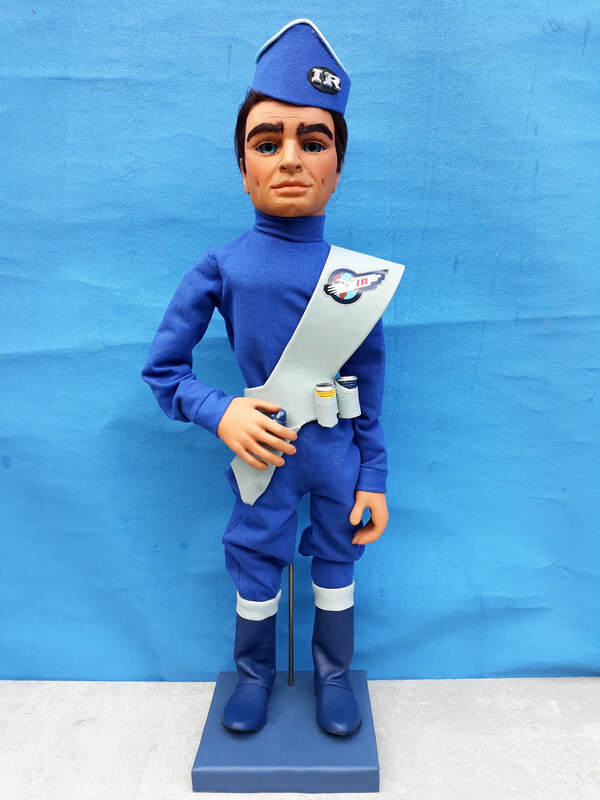 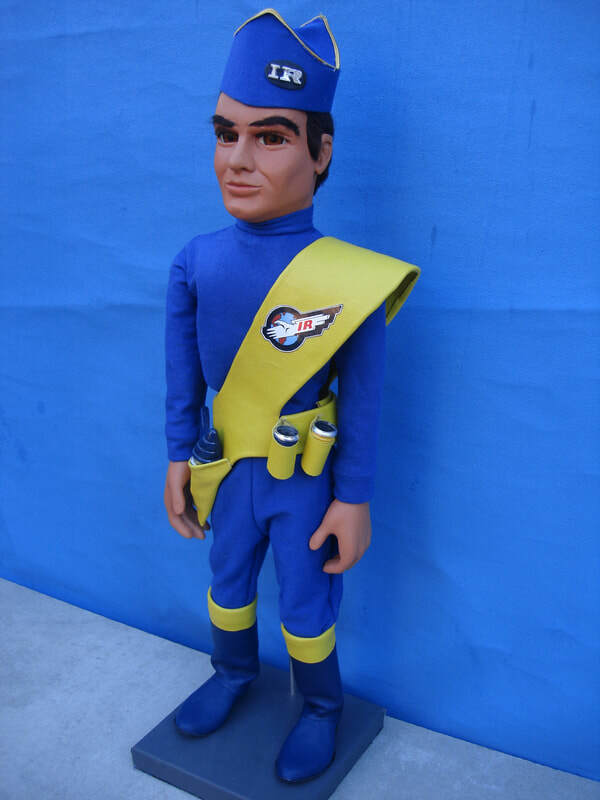 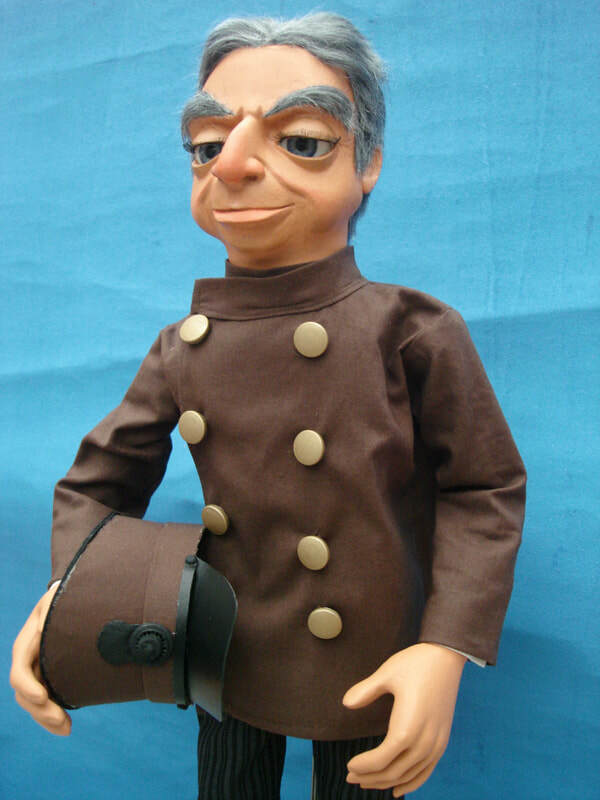 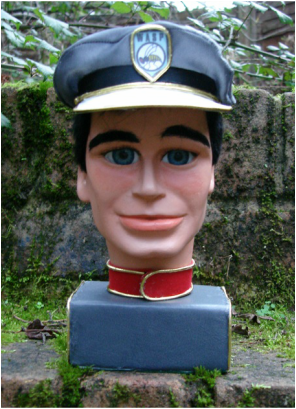 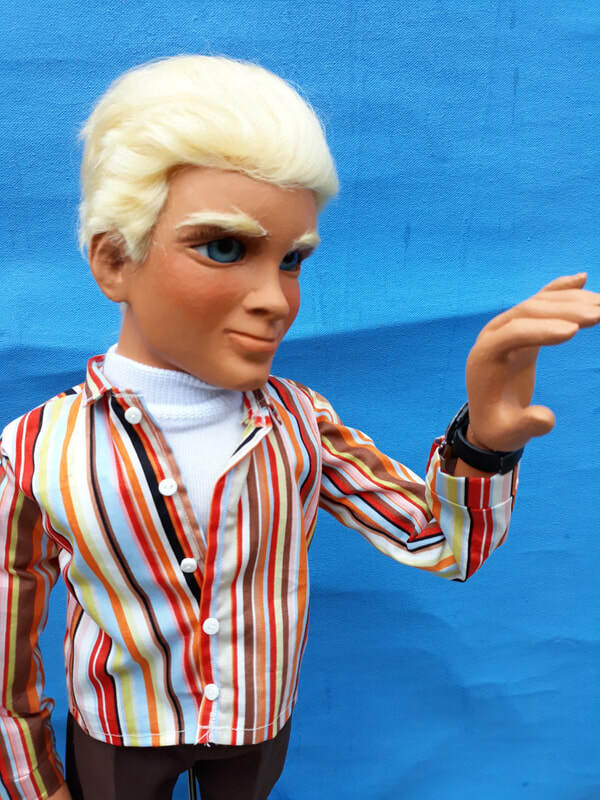 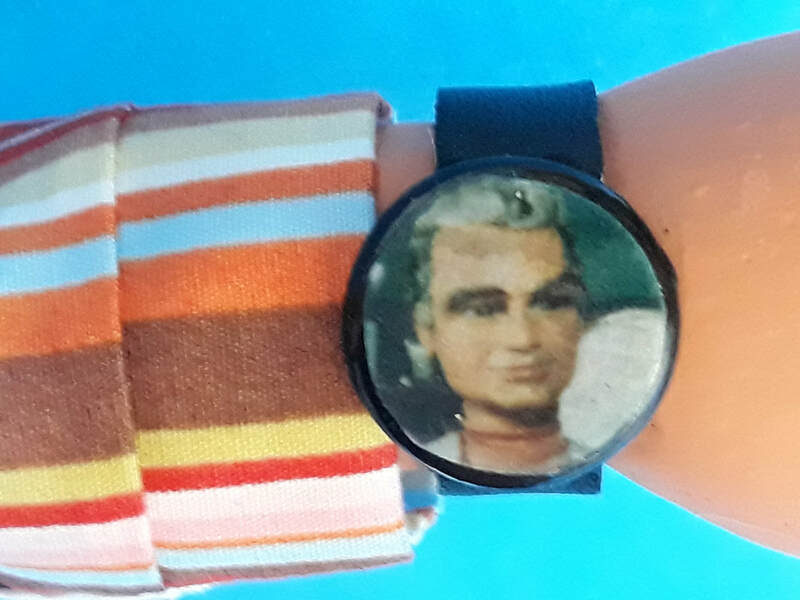 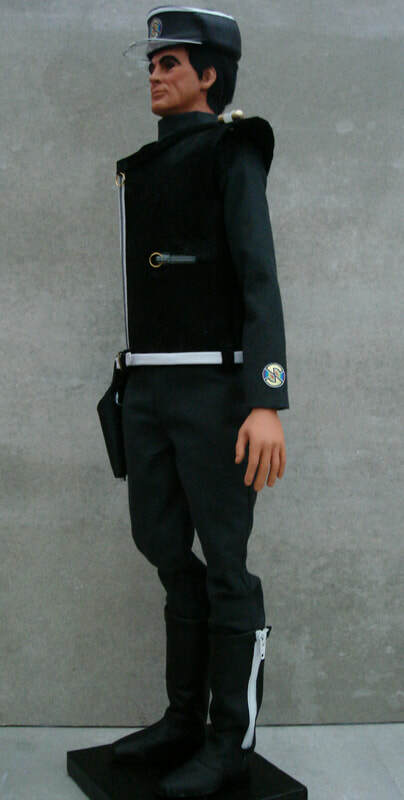 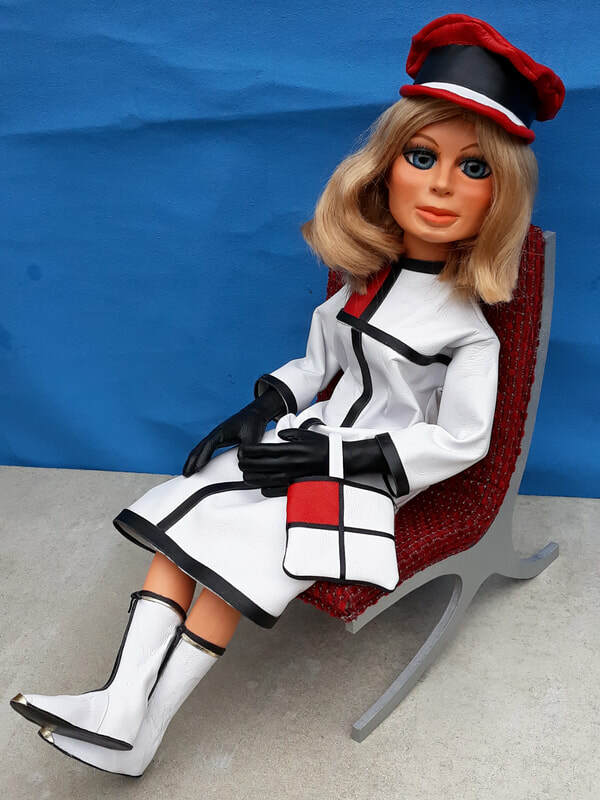 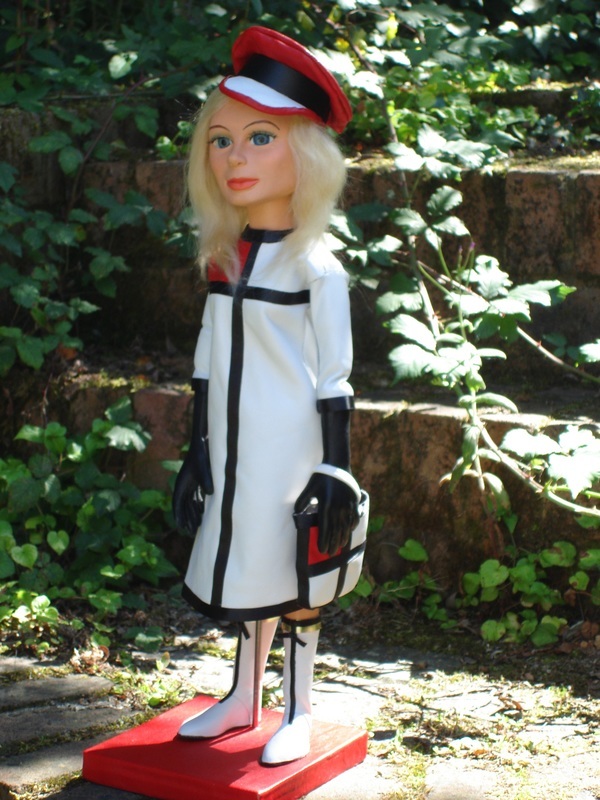 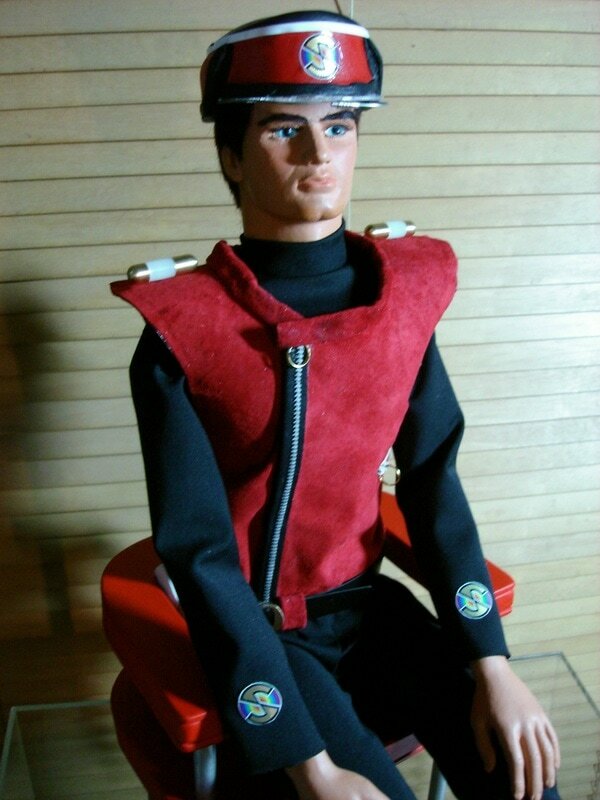 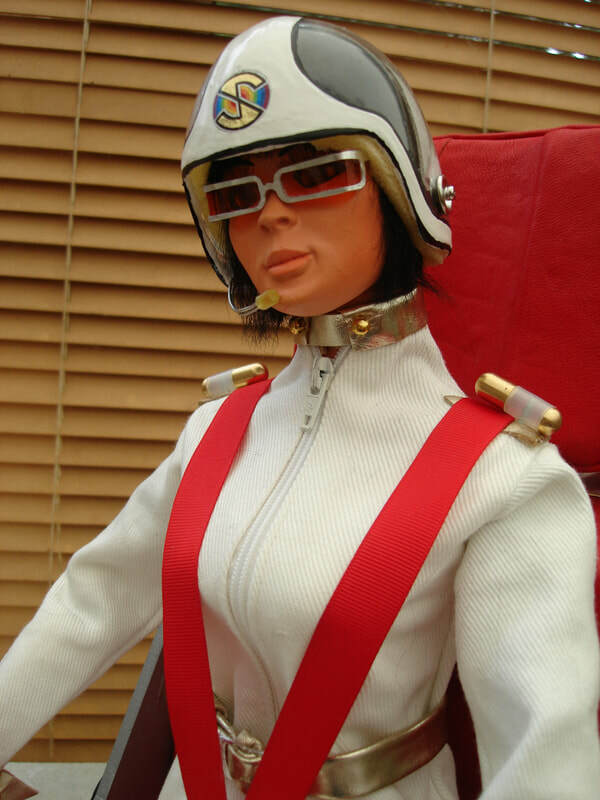 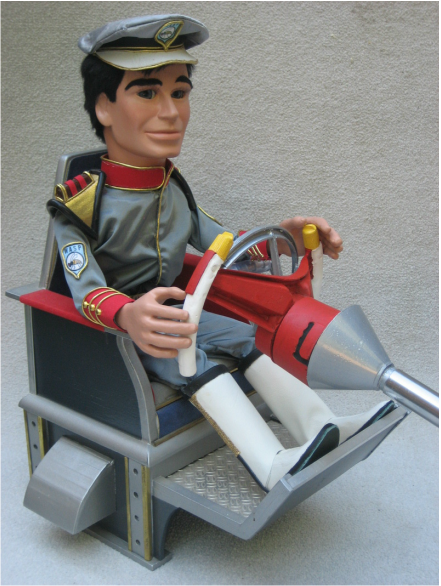 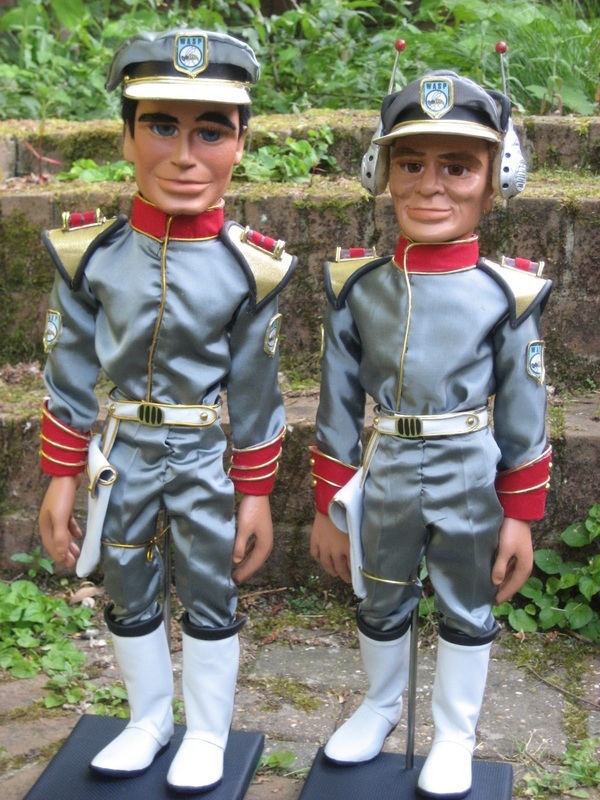 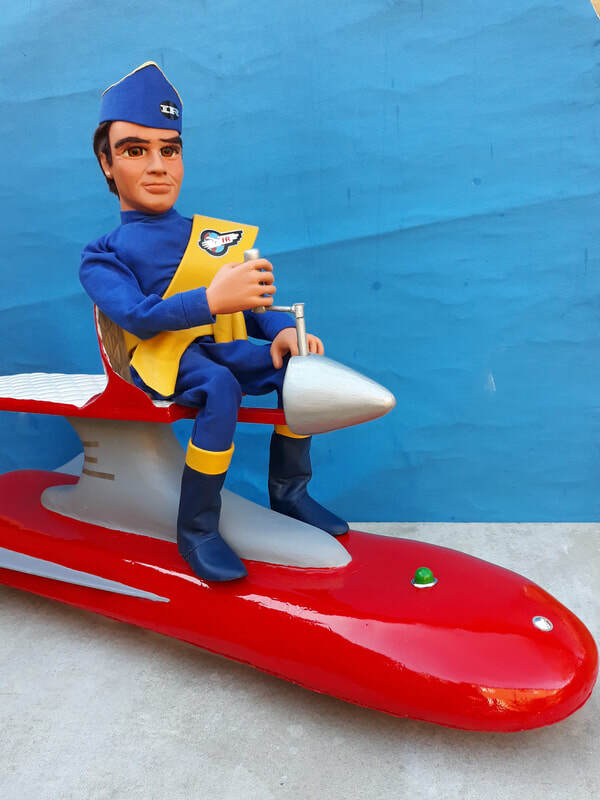 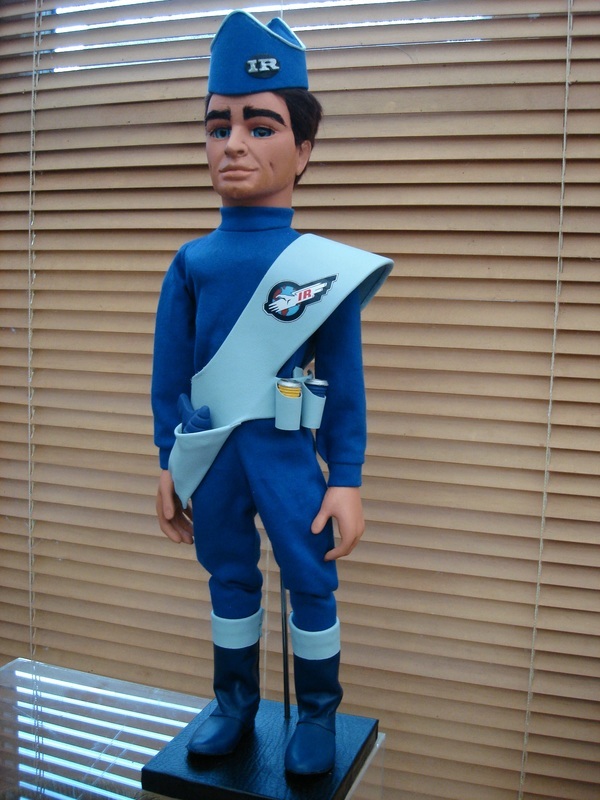 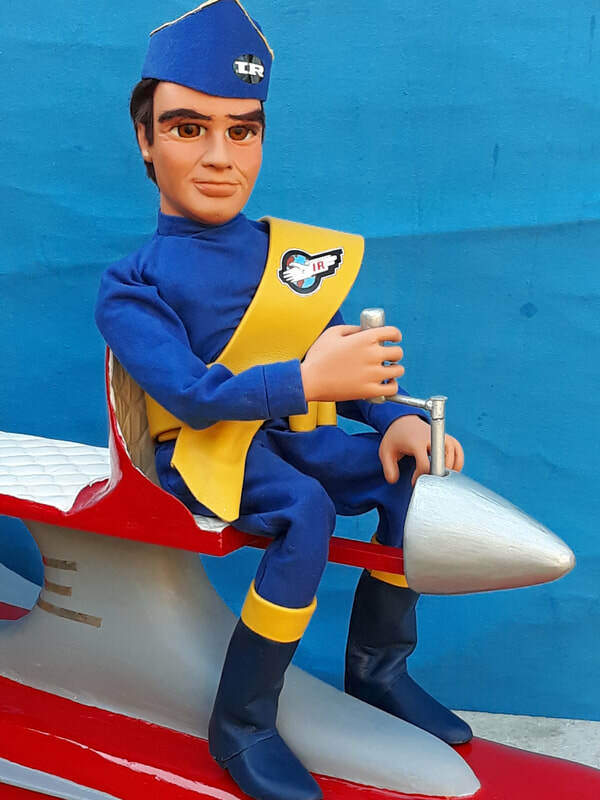 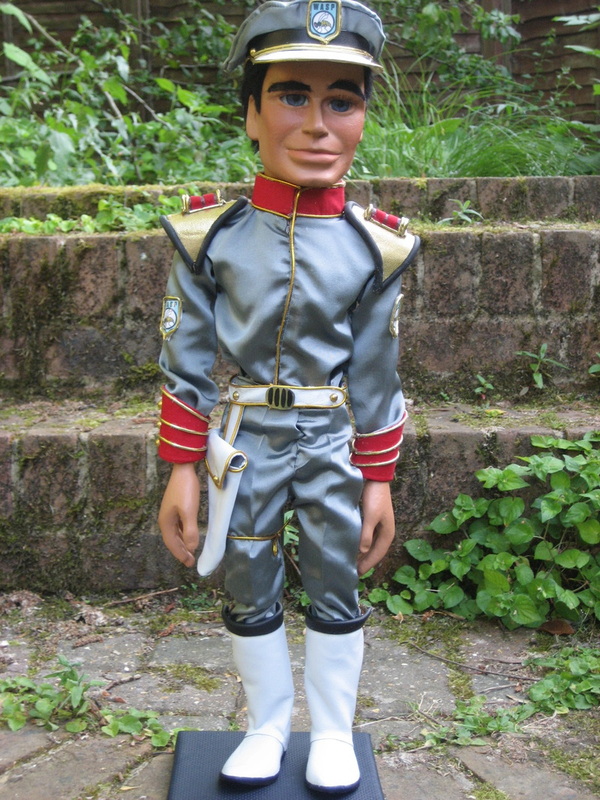 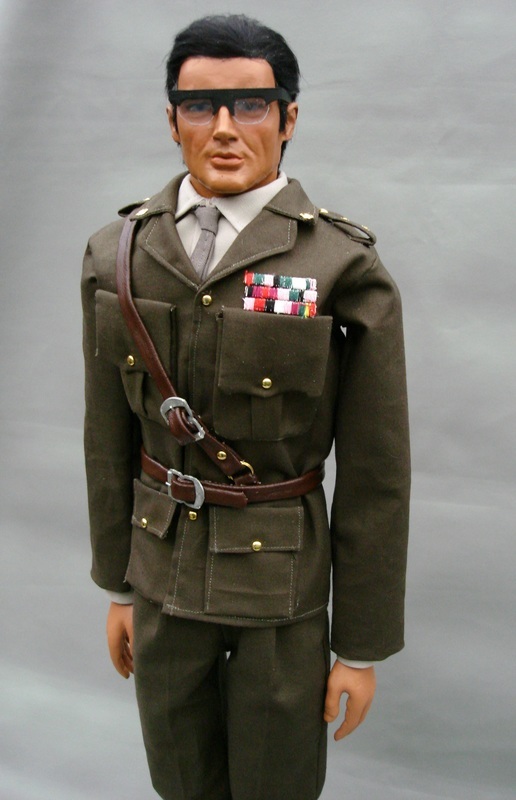 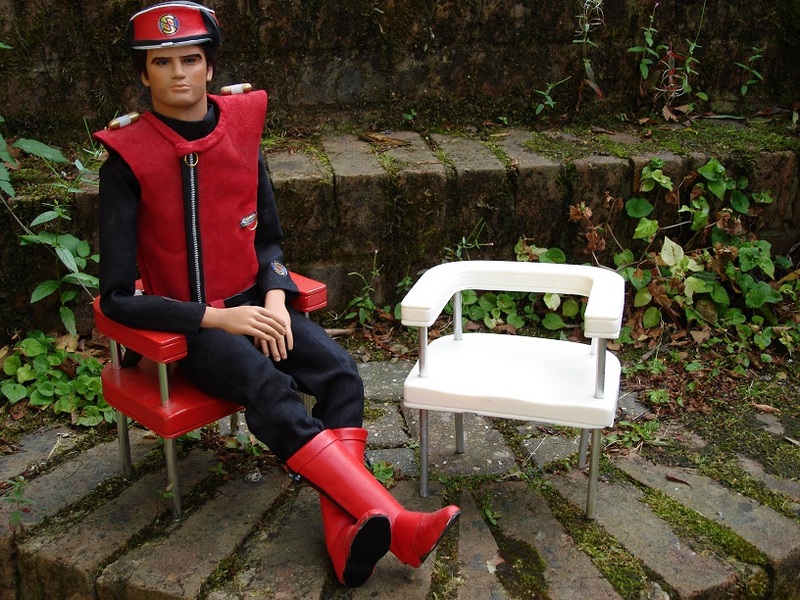 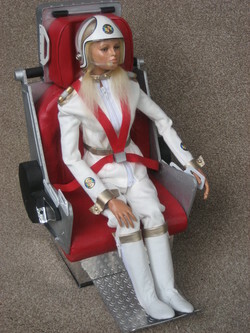 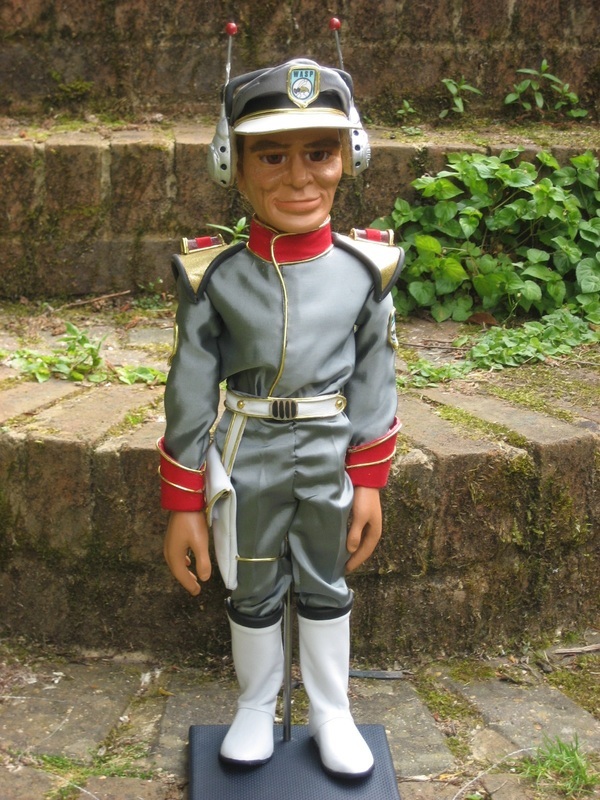 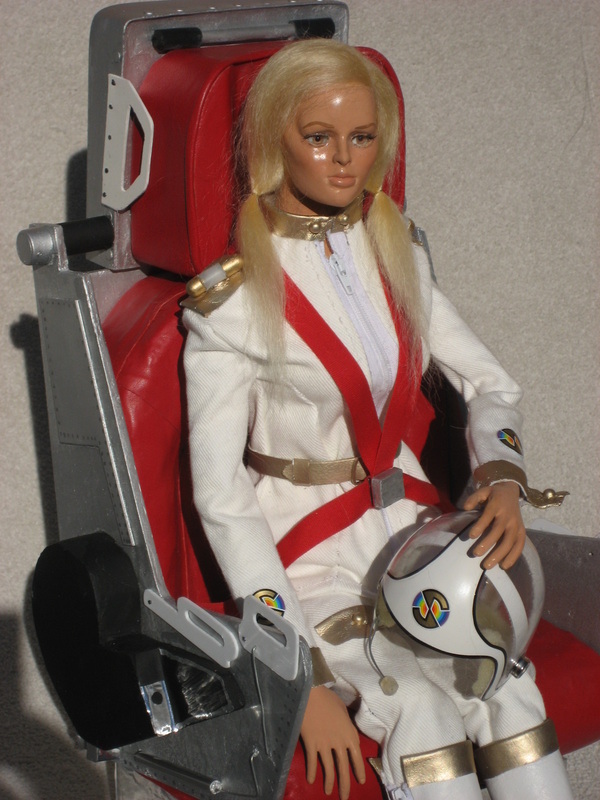 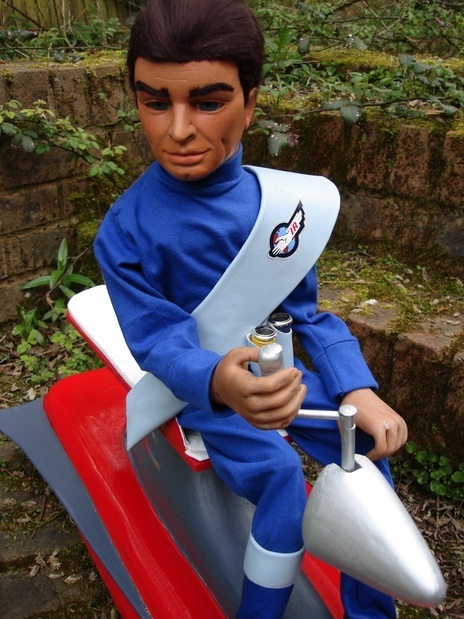 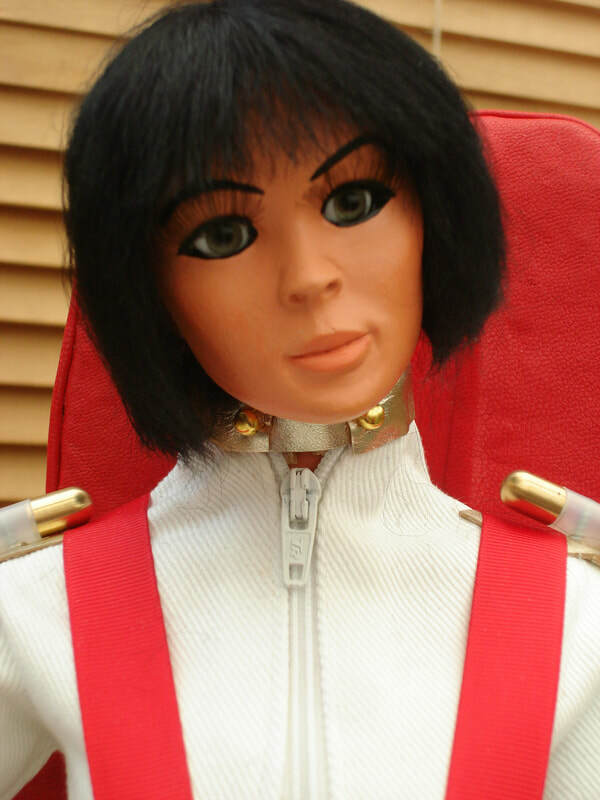 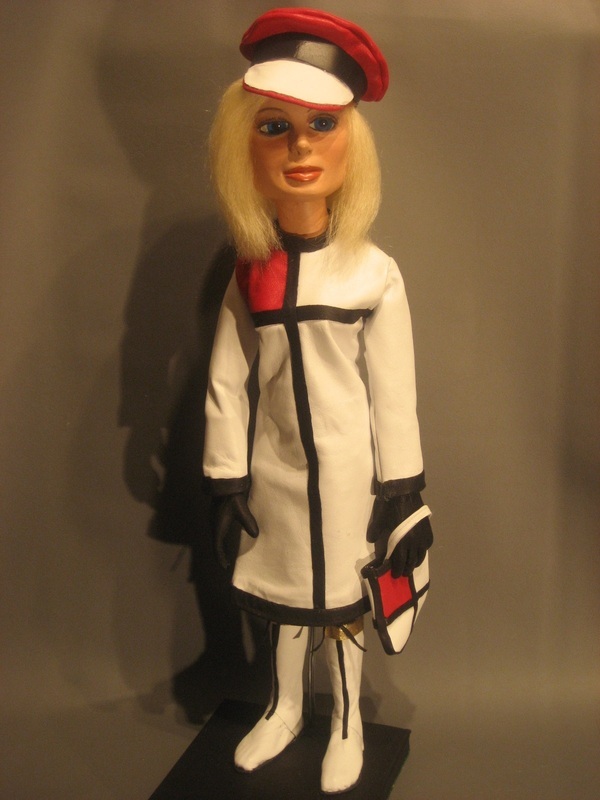 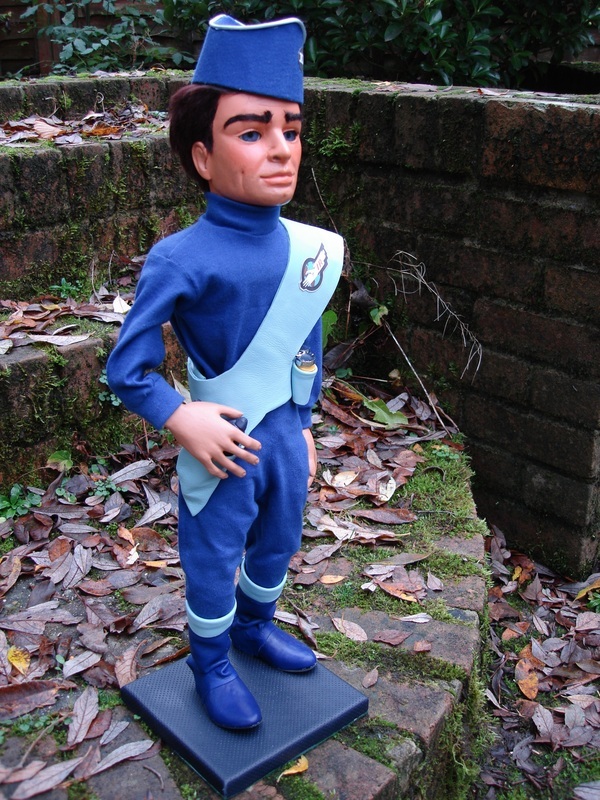 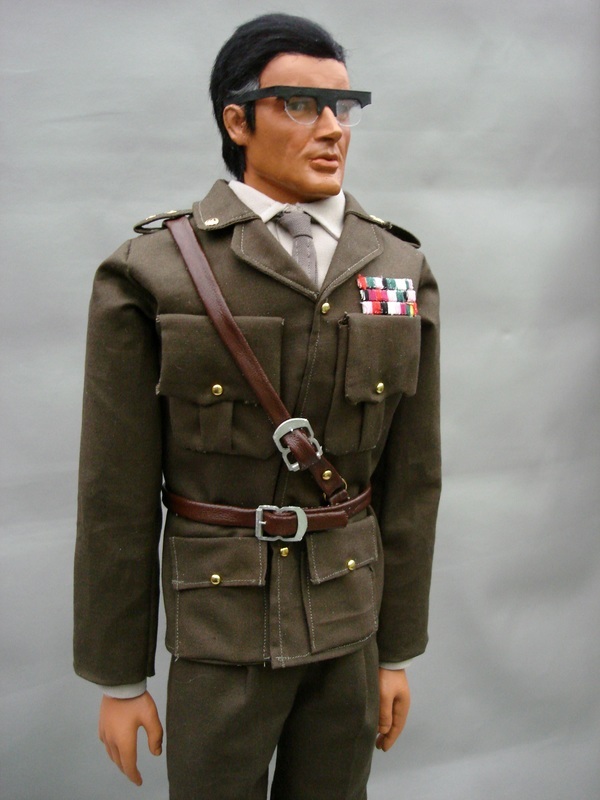 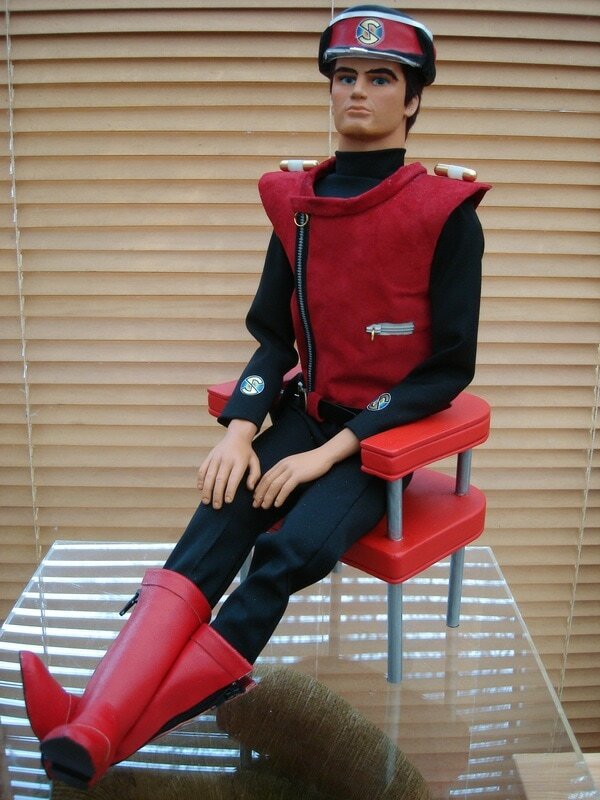 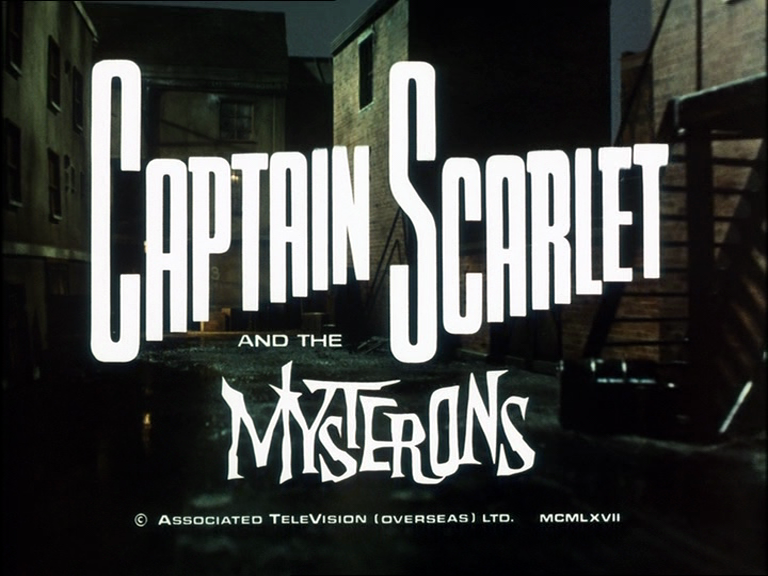 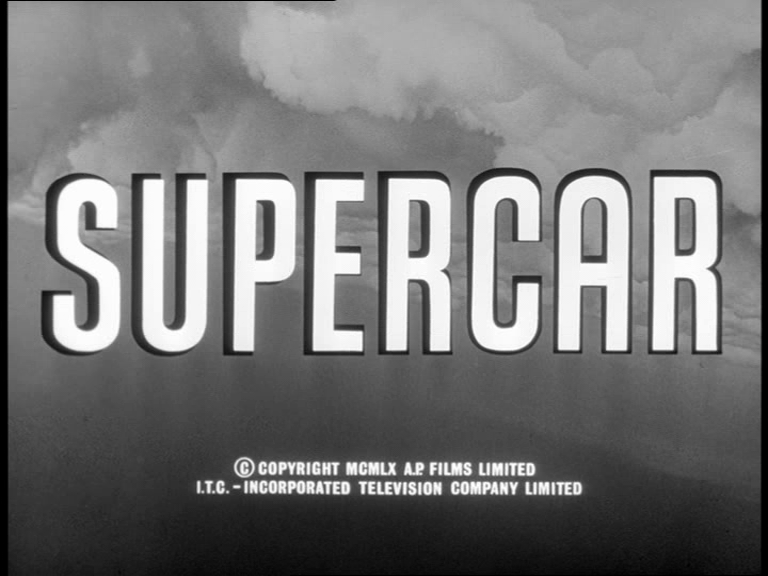 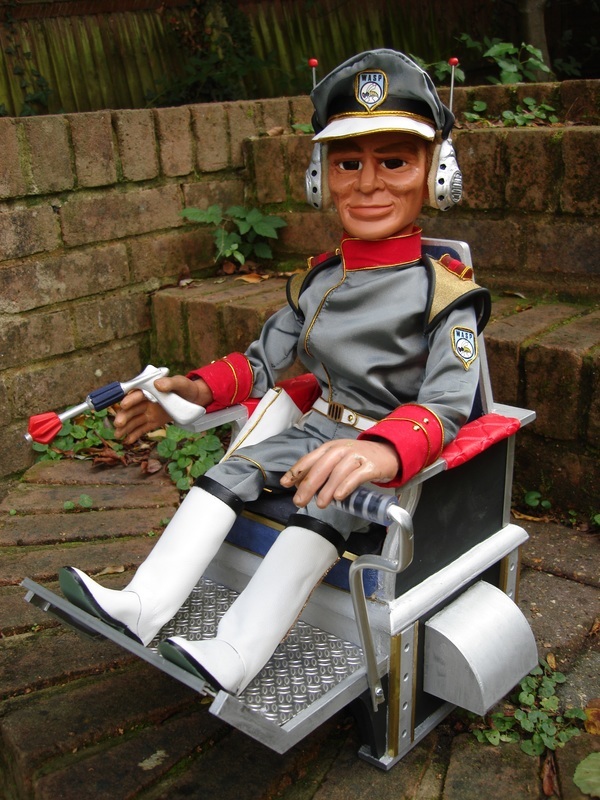 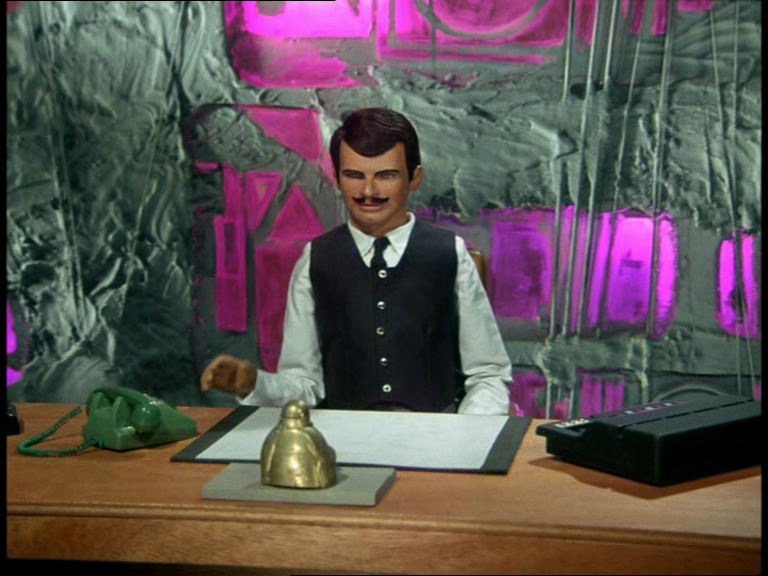 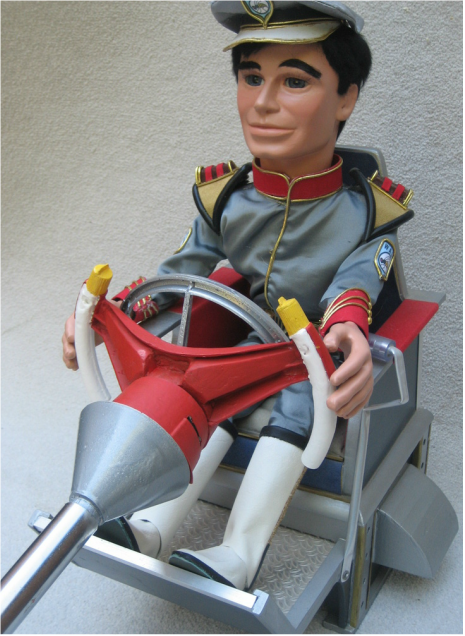 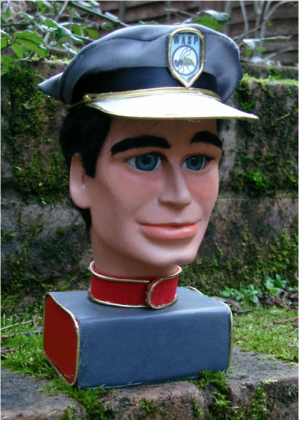 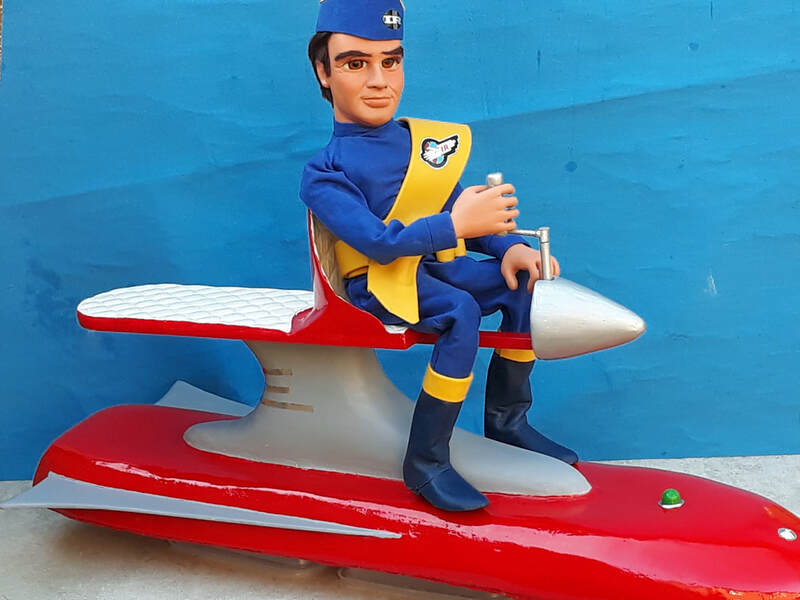 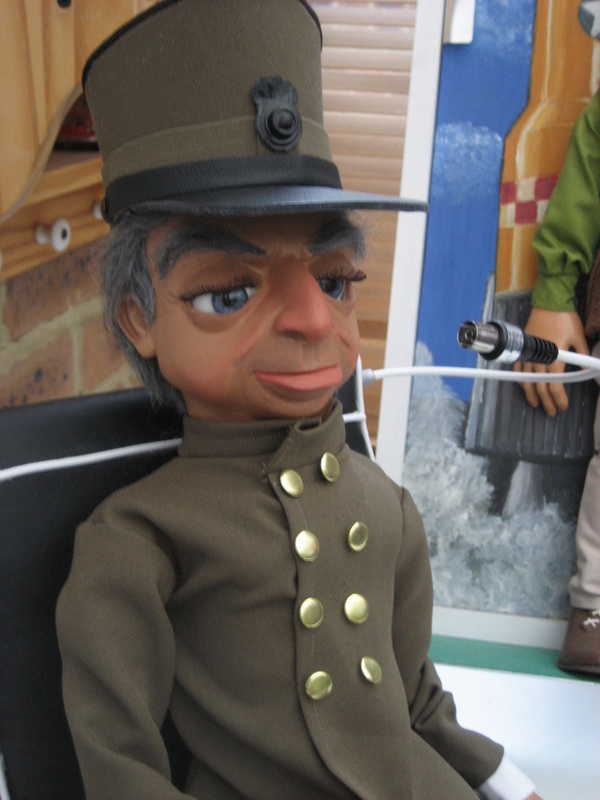 I can quote to make any character - real or fictional - in the style of a SUPERMARIONATION puppet, either as a semi-caricature Thunderbirds-type puppet (large head and hands) or as a more realistically-proportioned Captain Scarlet-type puppet, like 'V'. 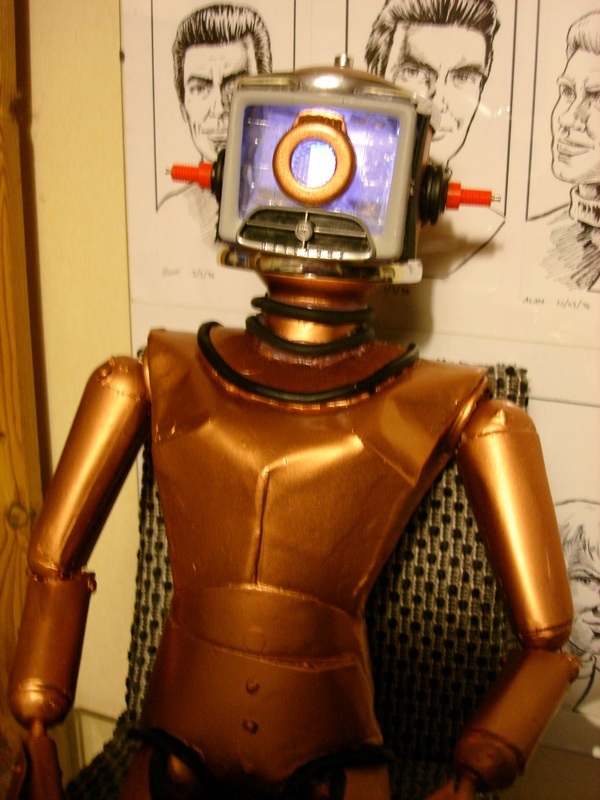 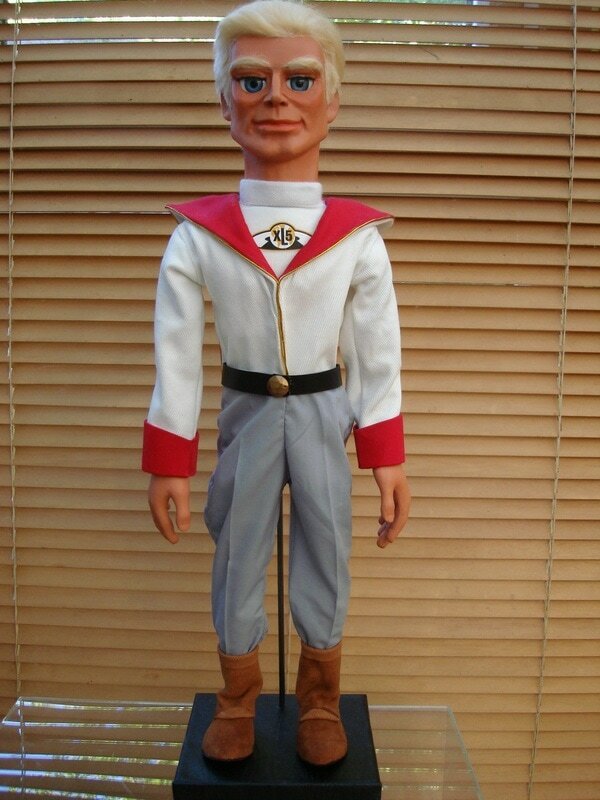 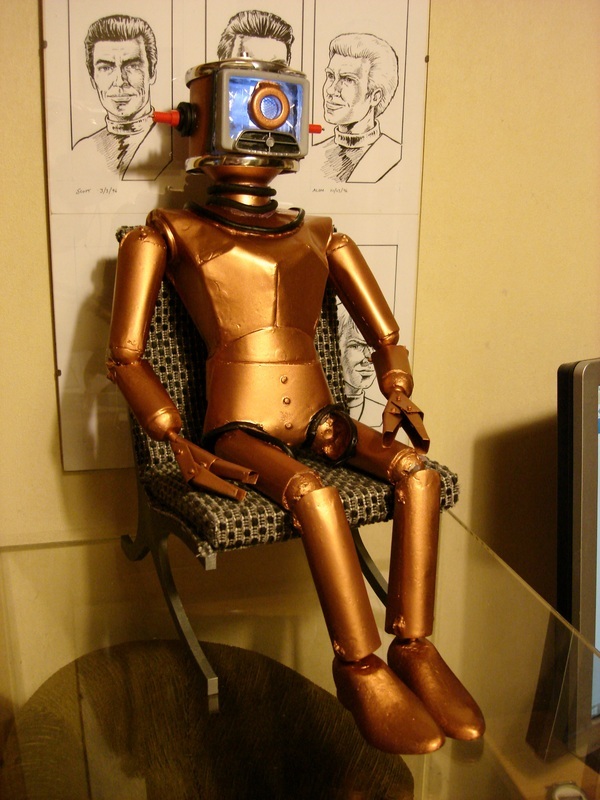 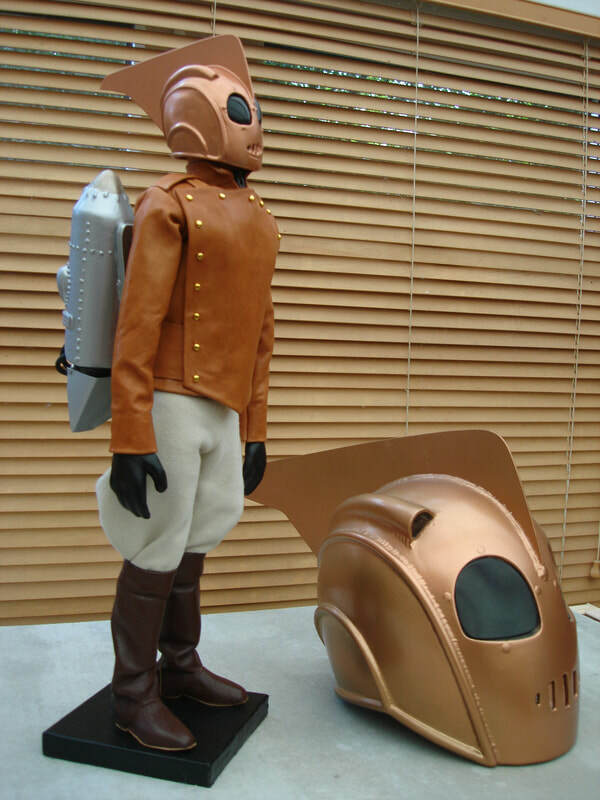 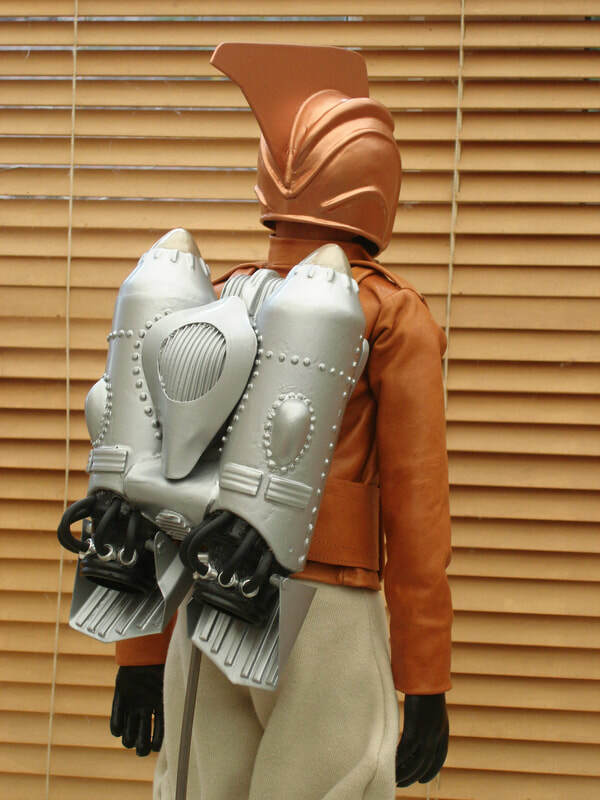 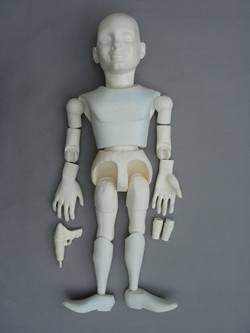 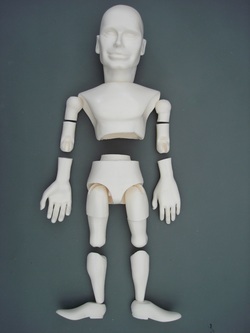 Special One-Off Scratch-Build of 'The Rocketeer' as a Supermarionation-type puppet. 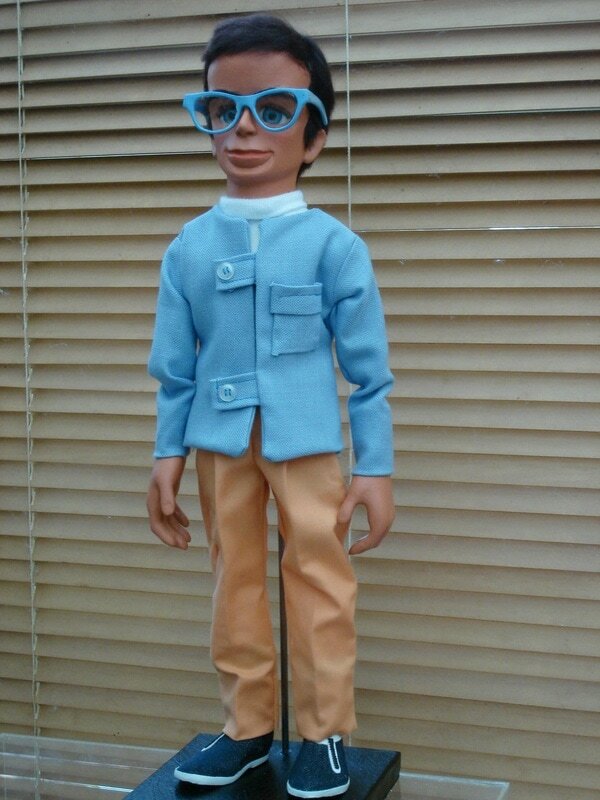 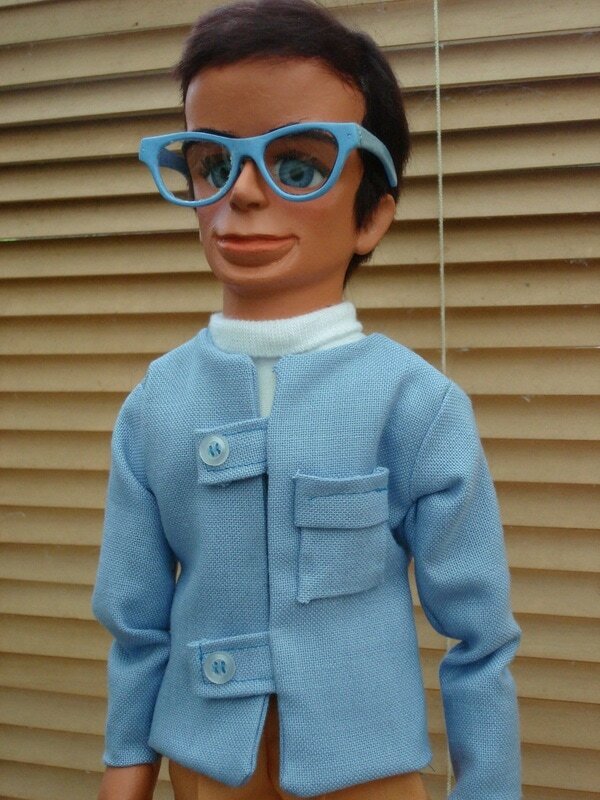 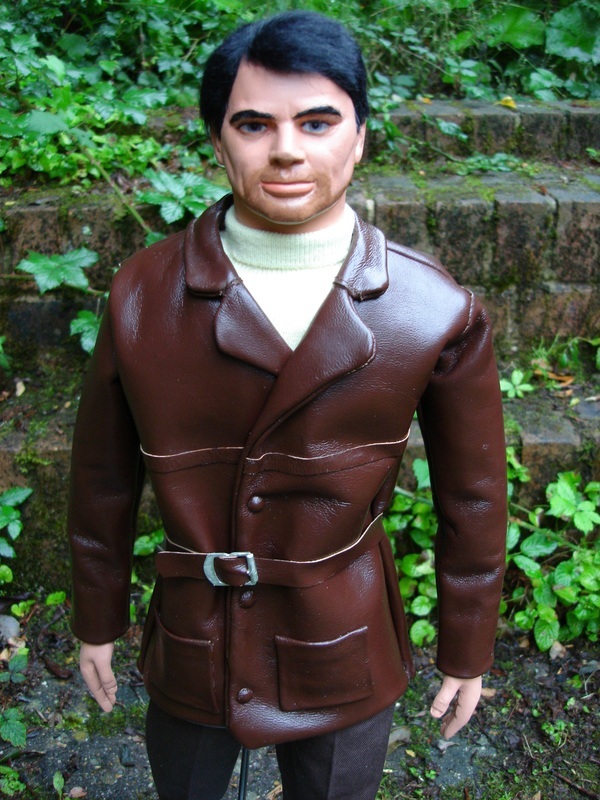 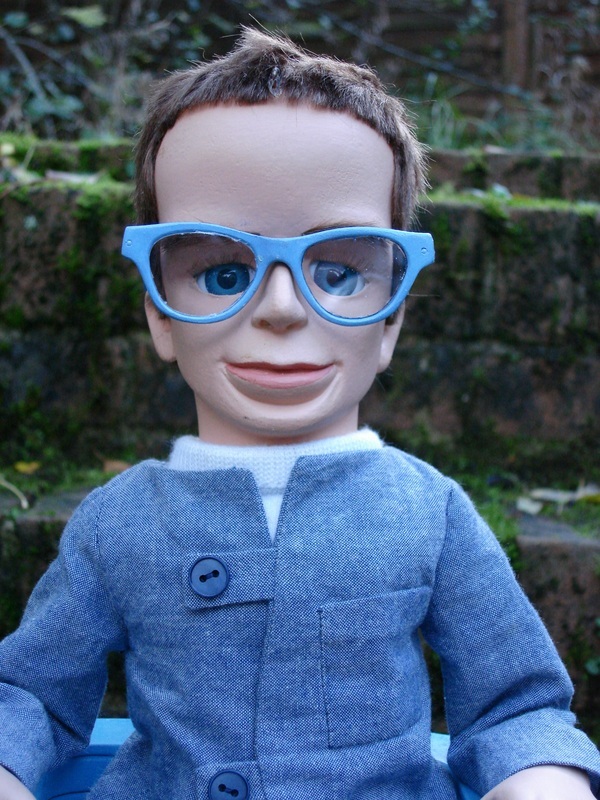 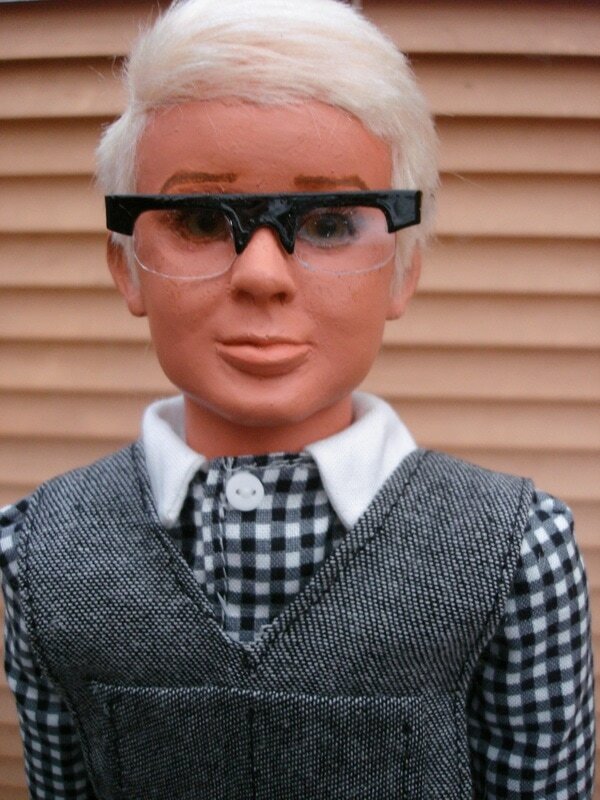 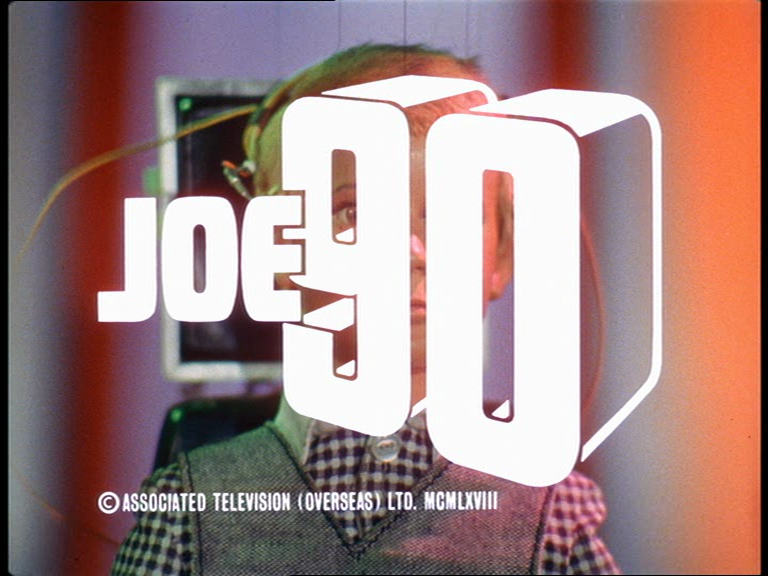 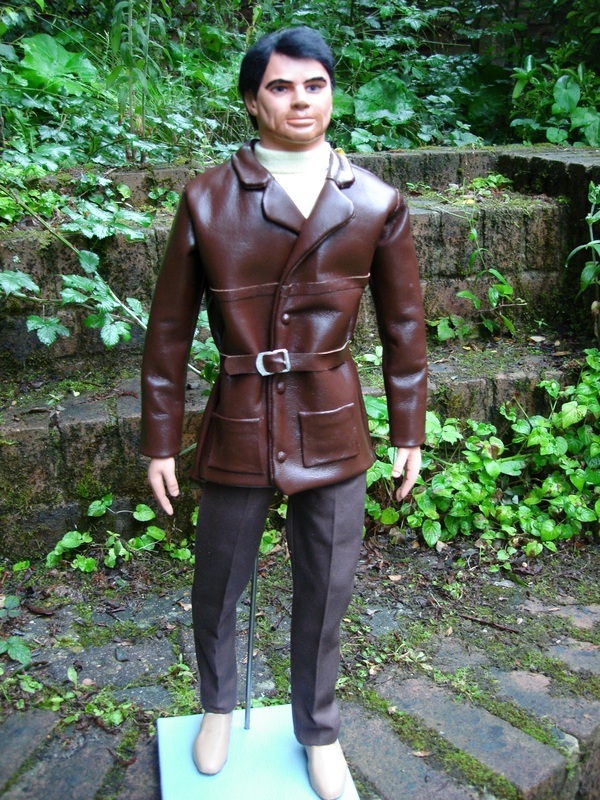 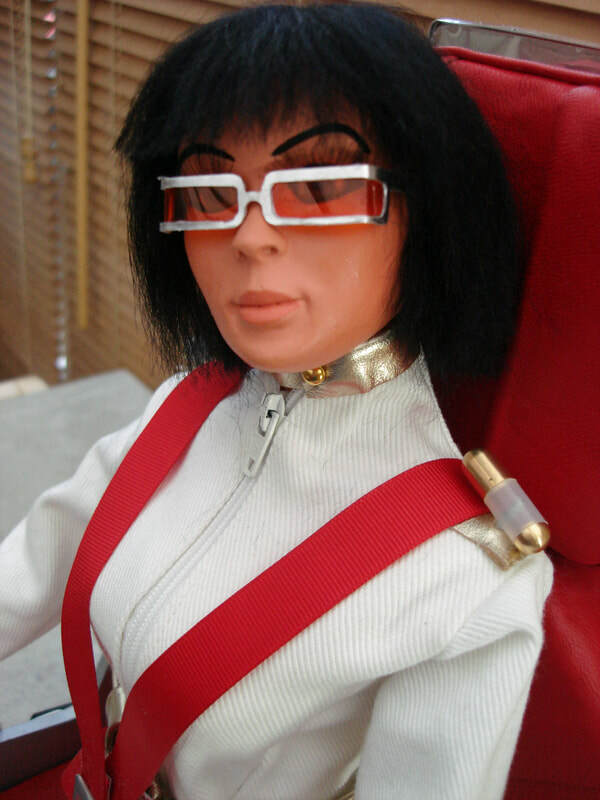 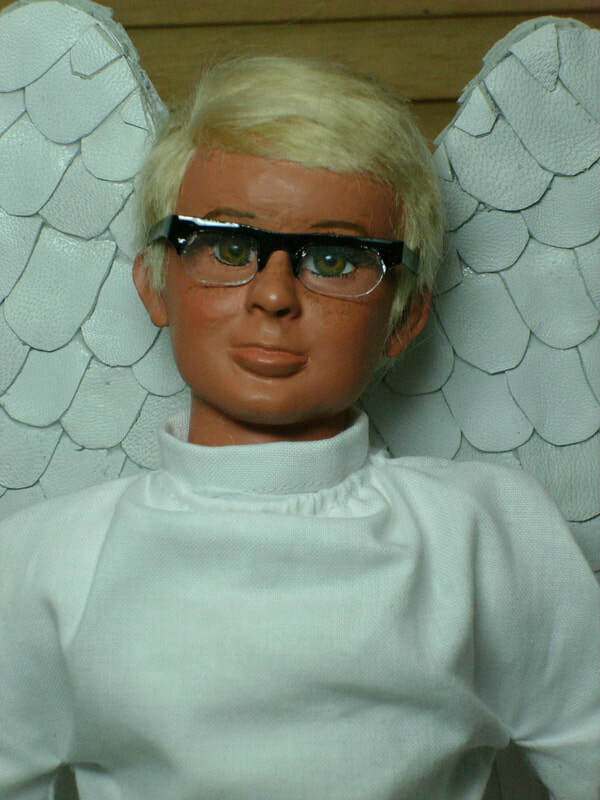 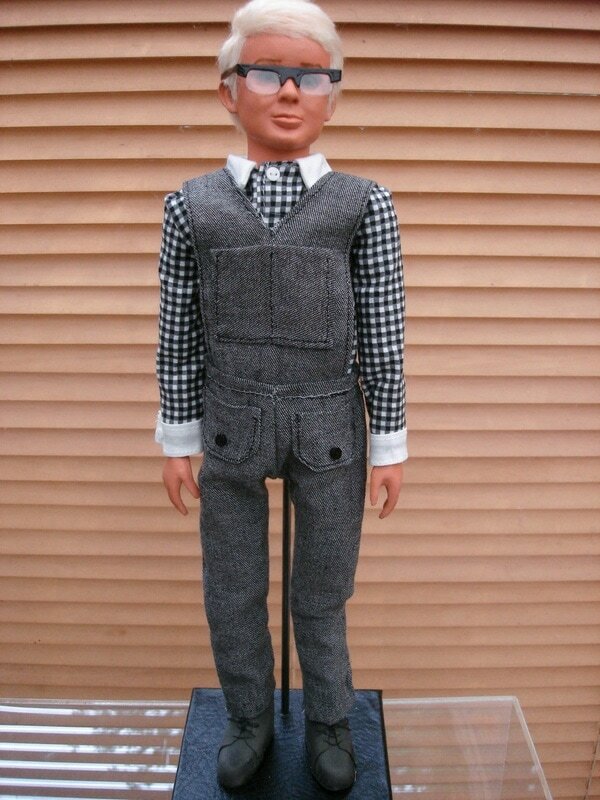 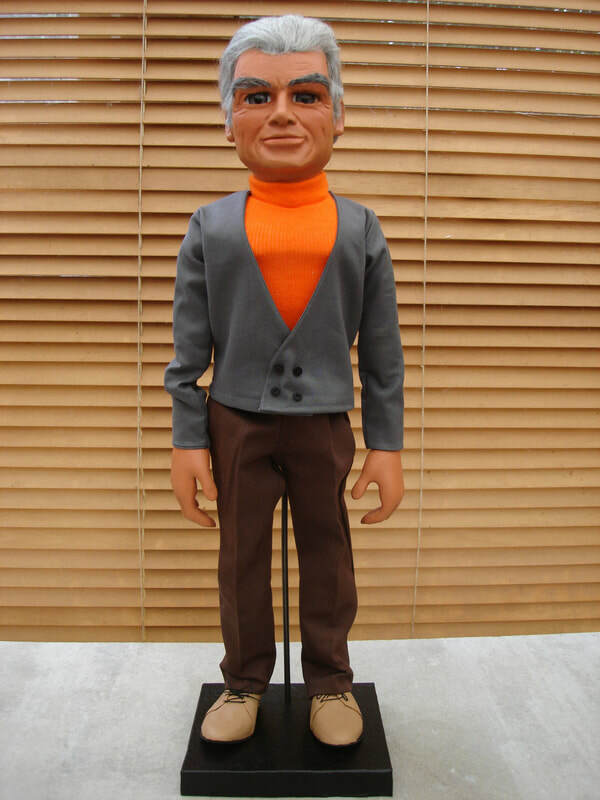 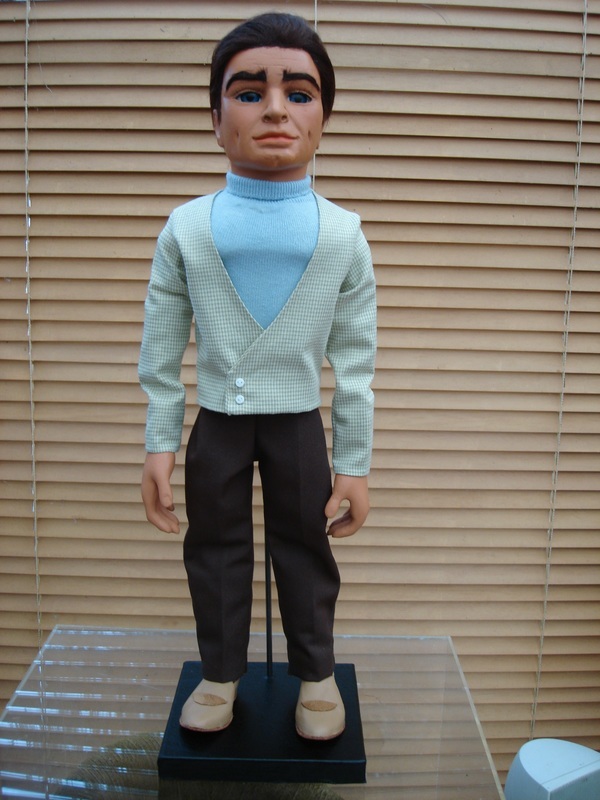 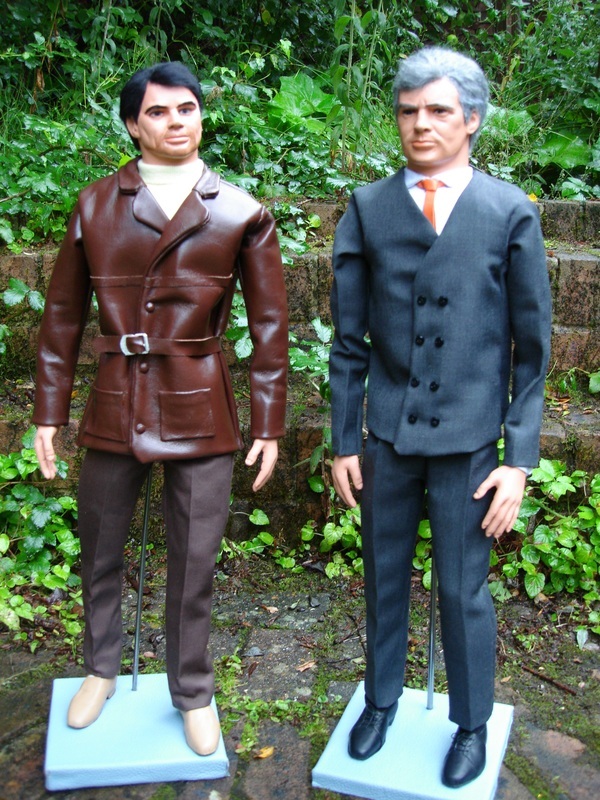 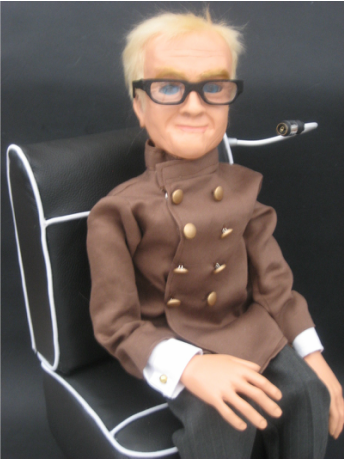 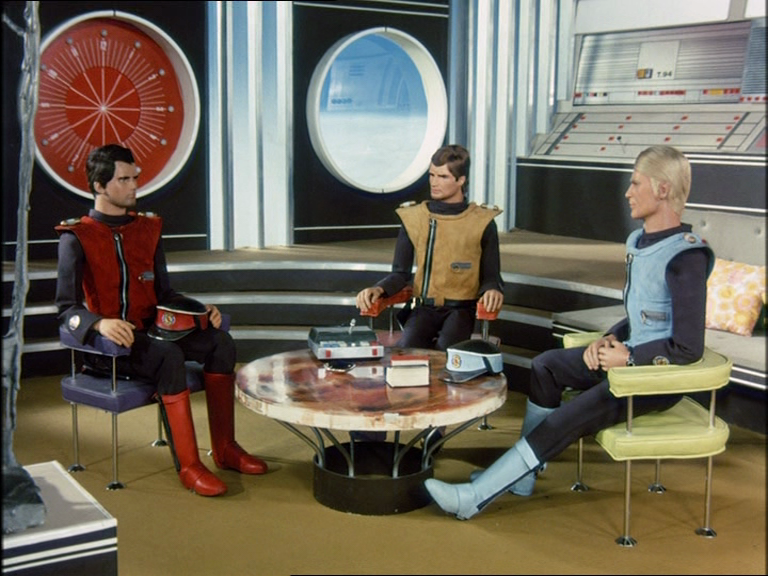 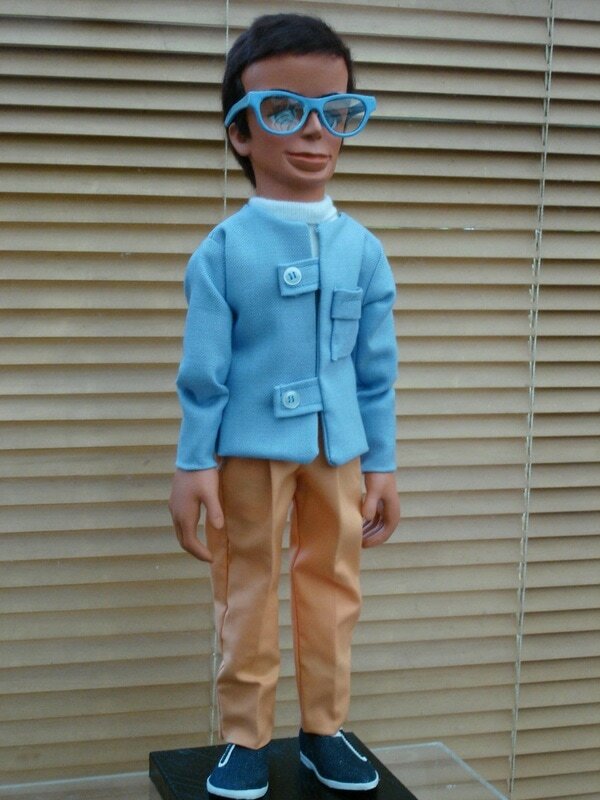 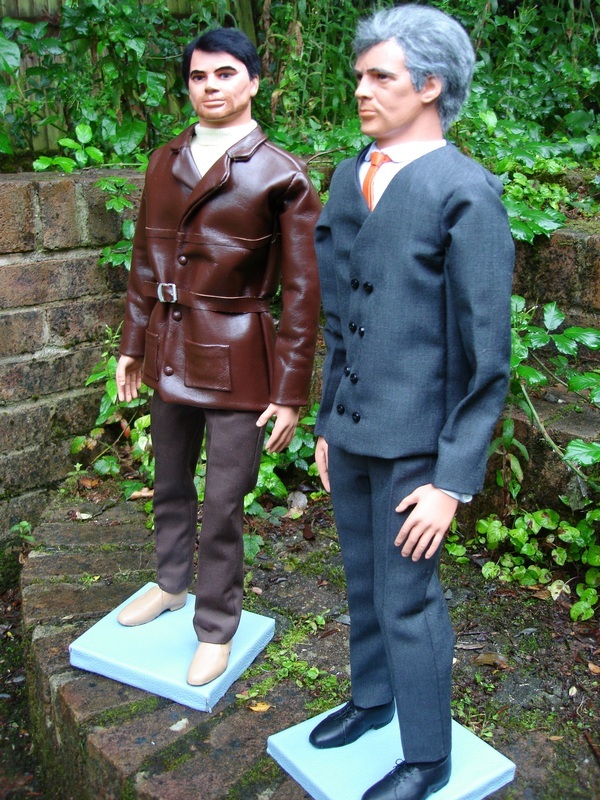 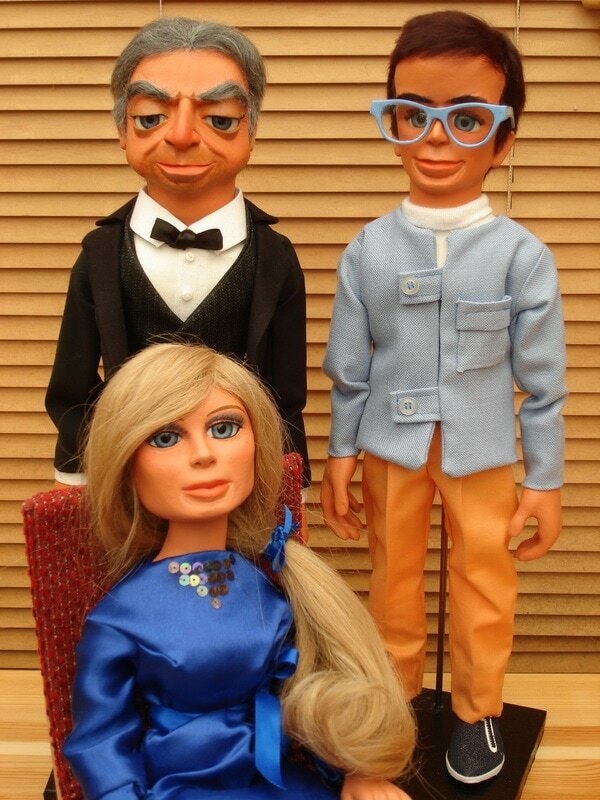 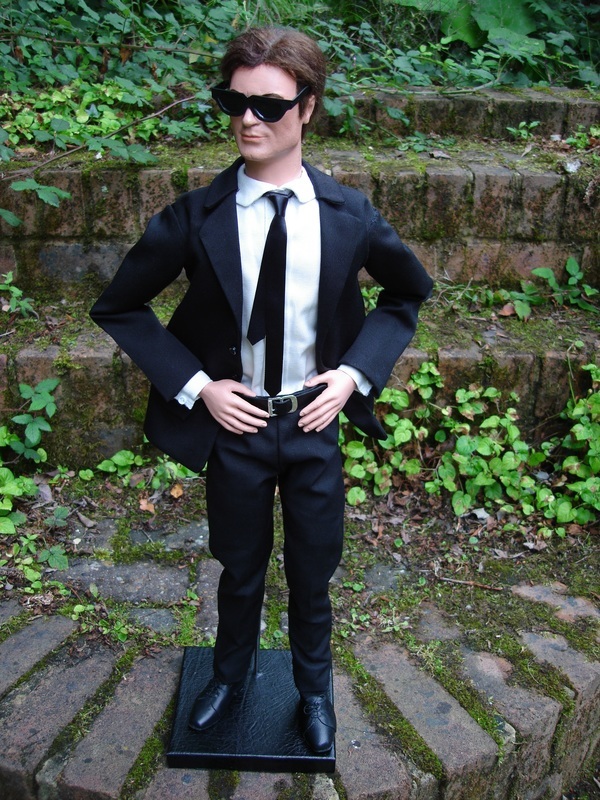 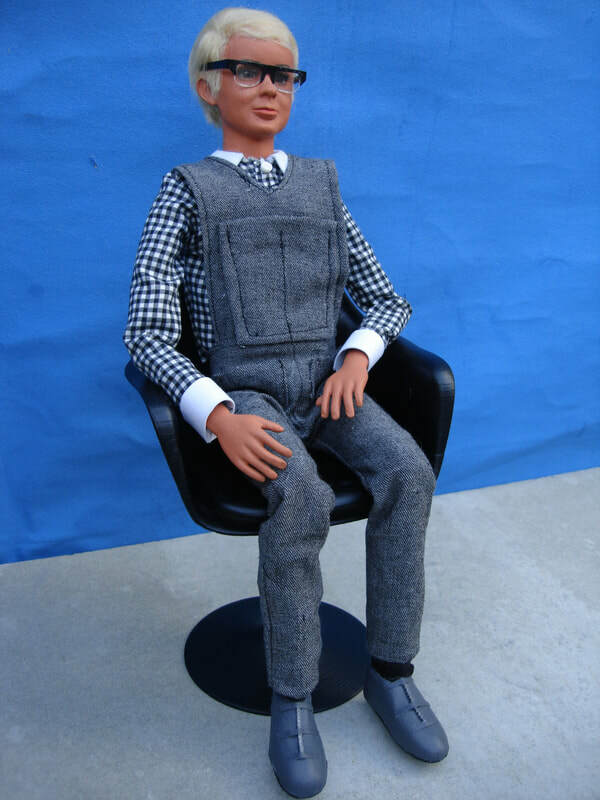 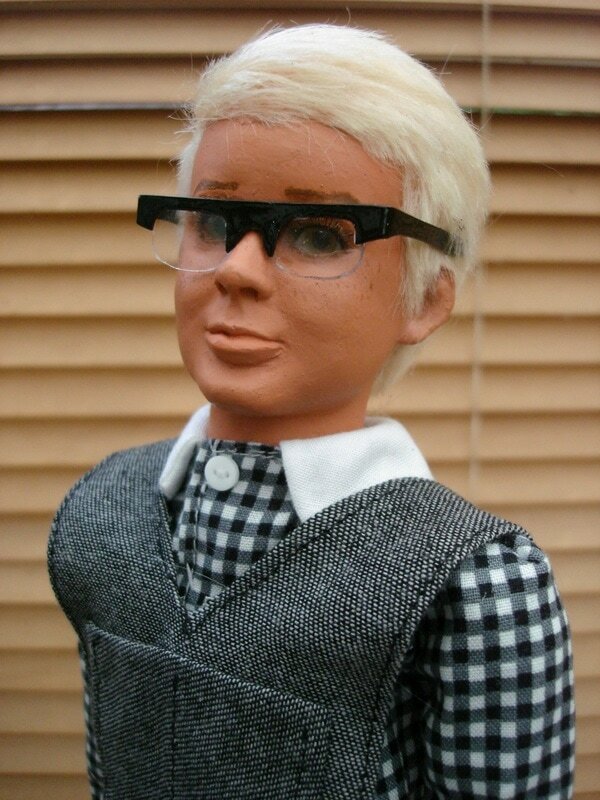 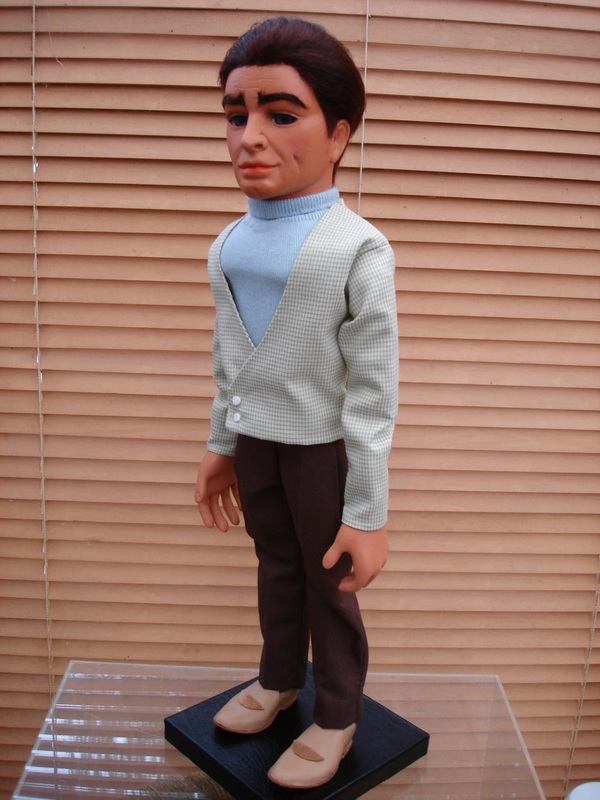 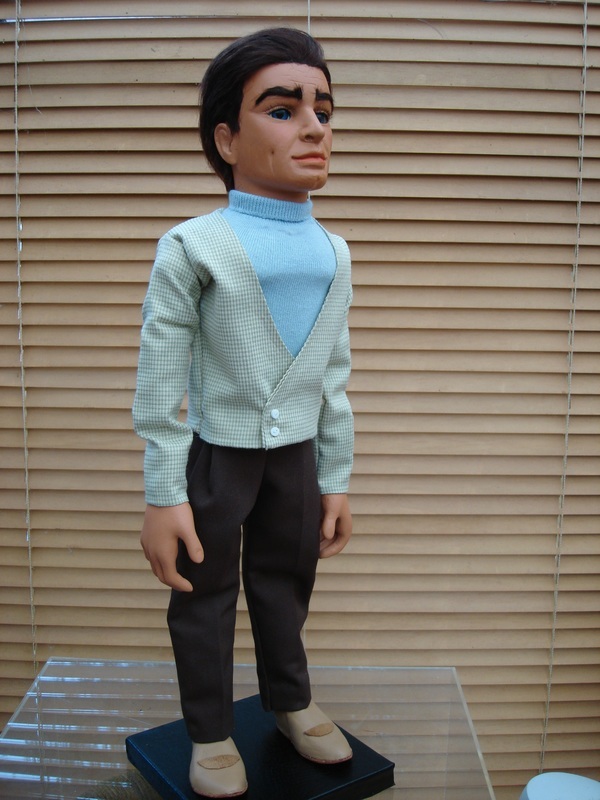 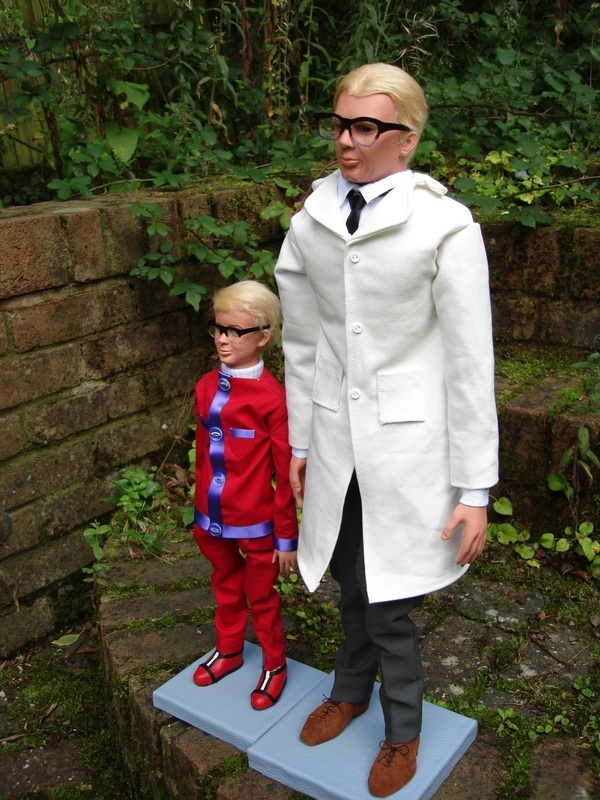 ...Thanks for making my dream come true ..."
"My Joe 90 looks like he stepped off the set in the 1960s. 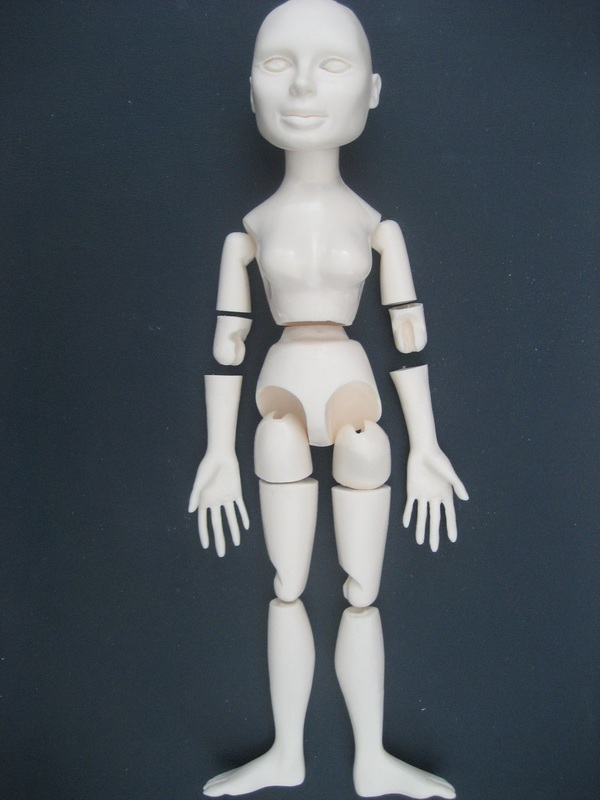 The accuracy is unbelievable." 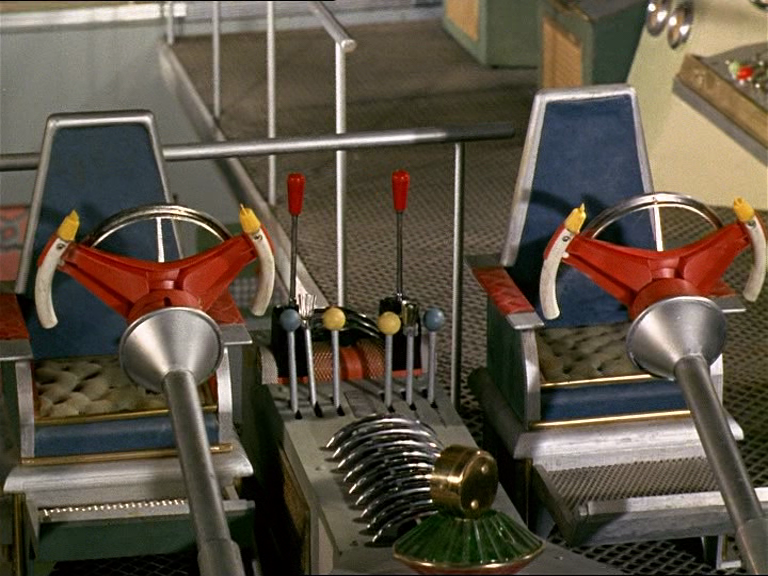 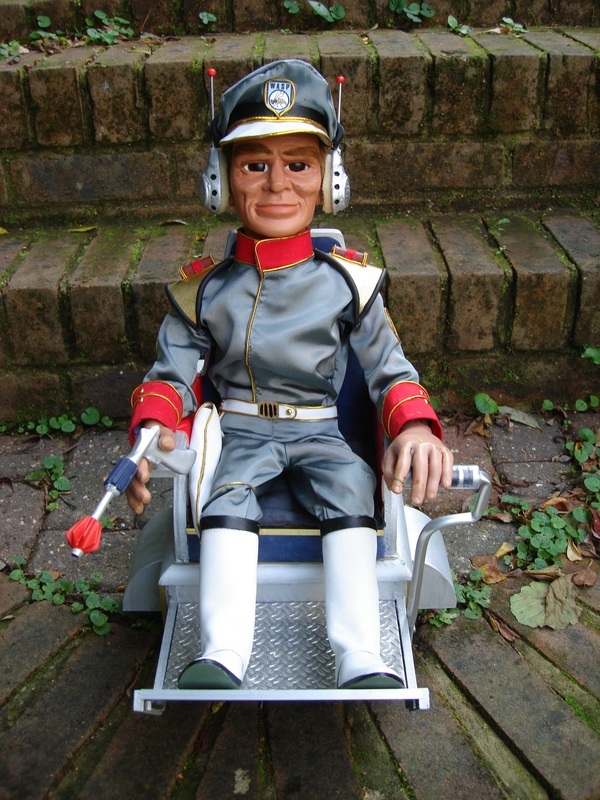 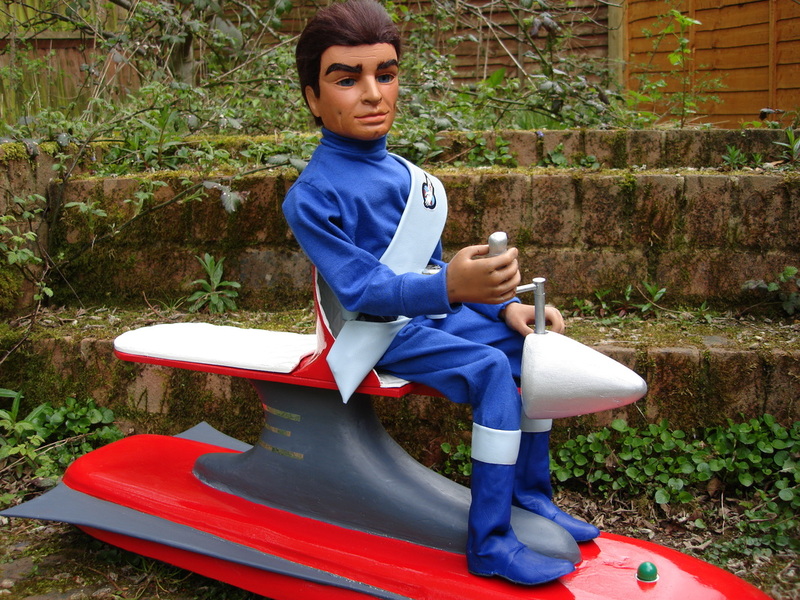 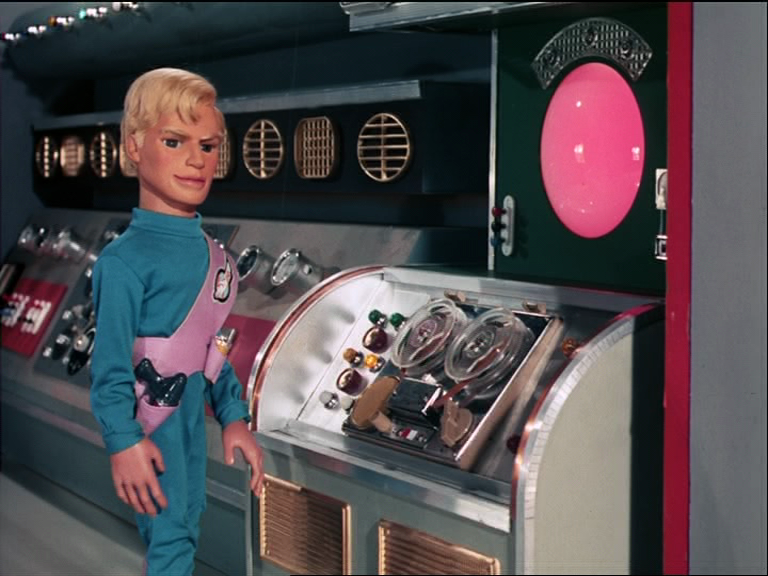 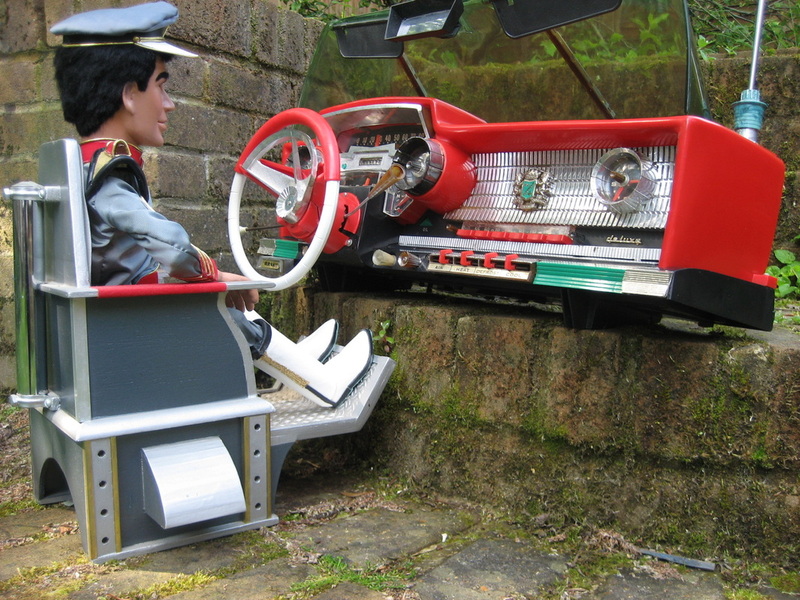 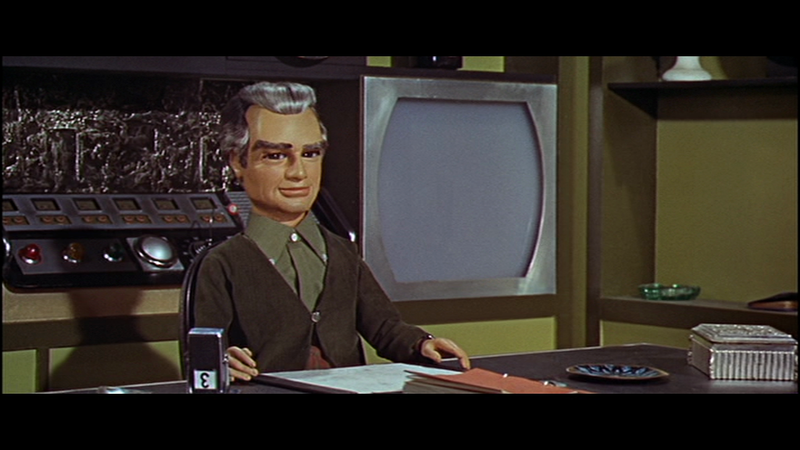 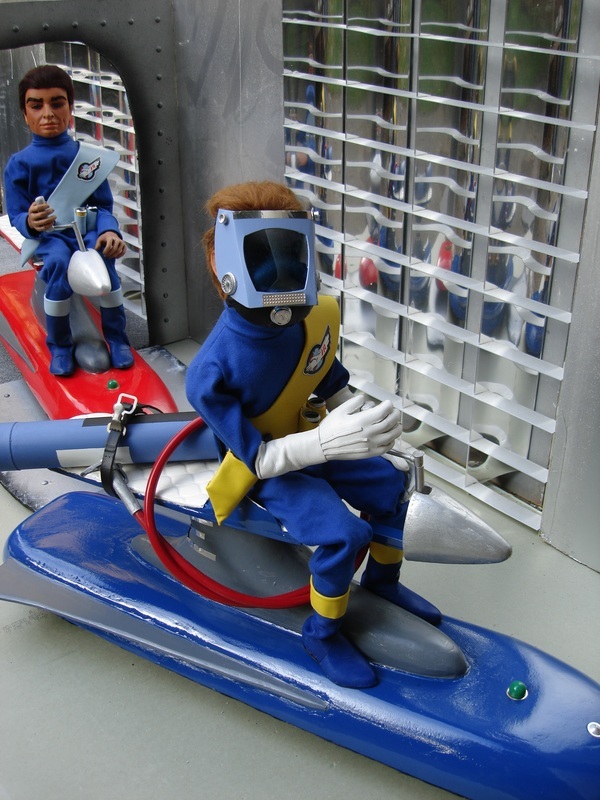 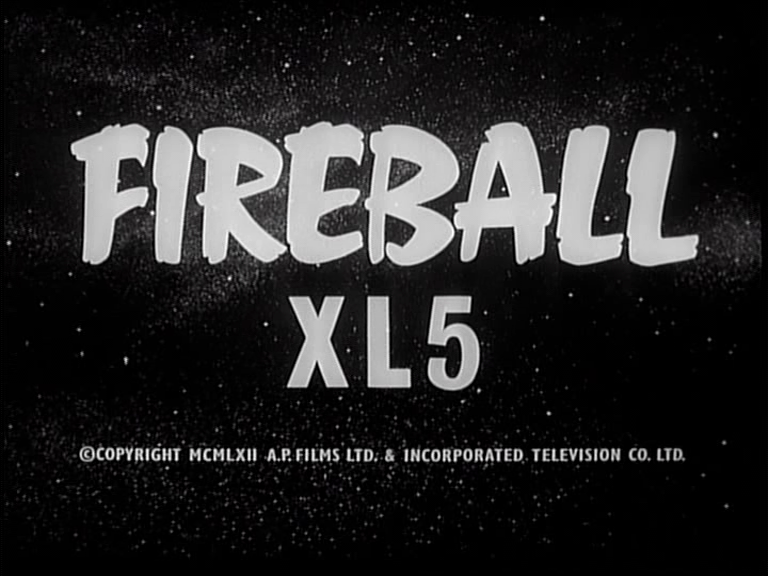 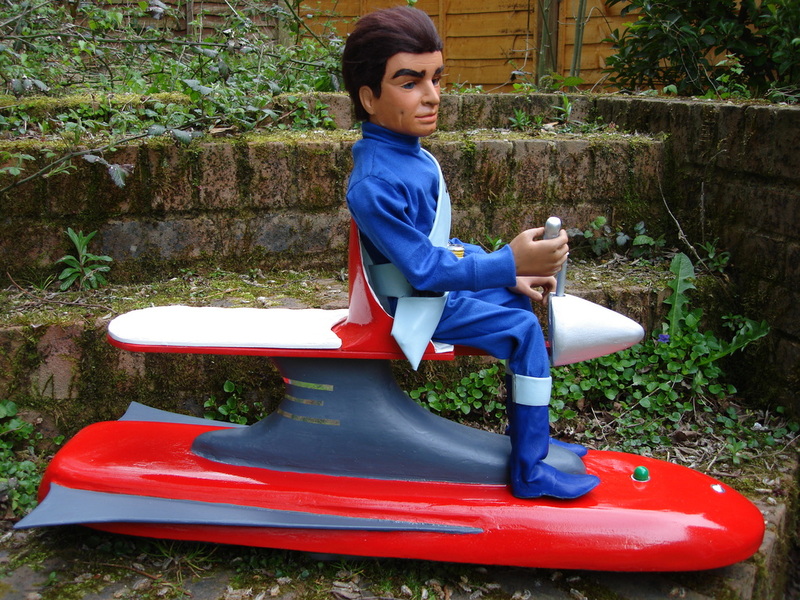 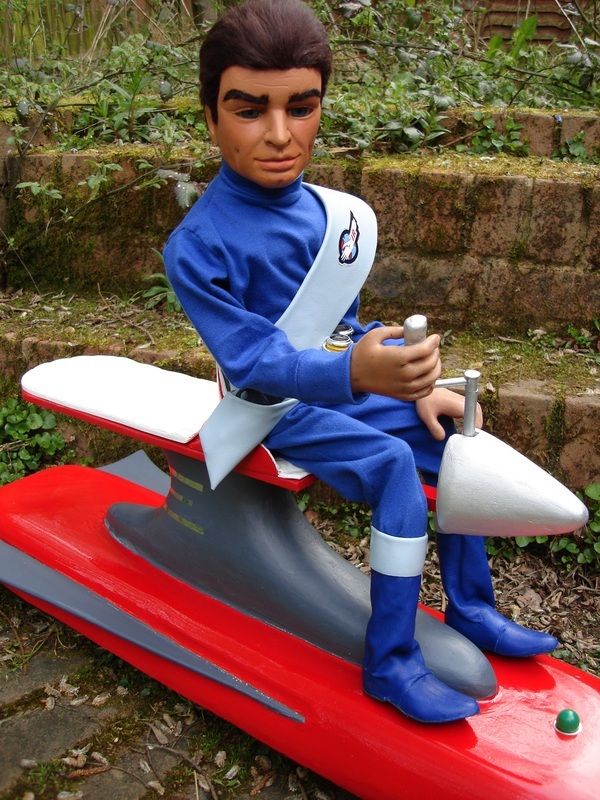 "Steve Zodiac looks poised to get behind the controls of Fireball XL5. 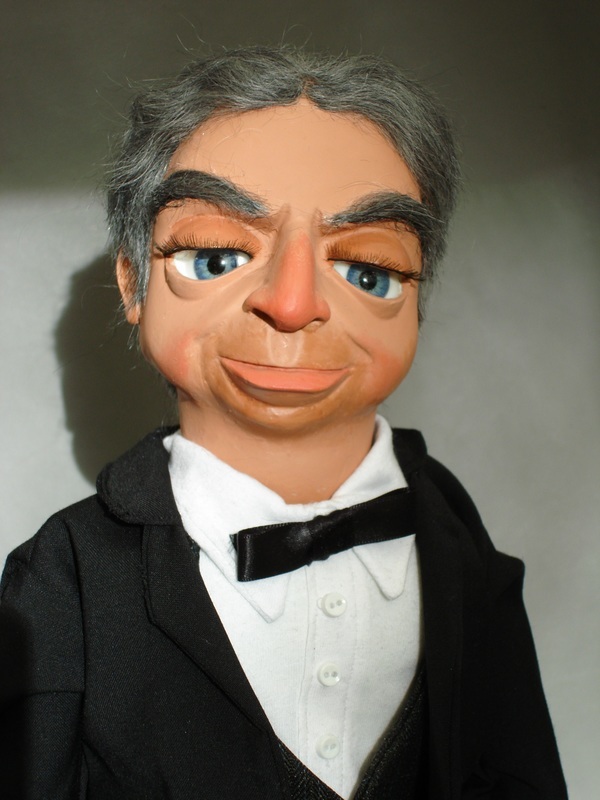 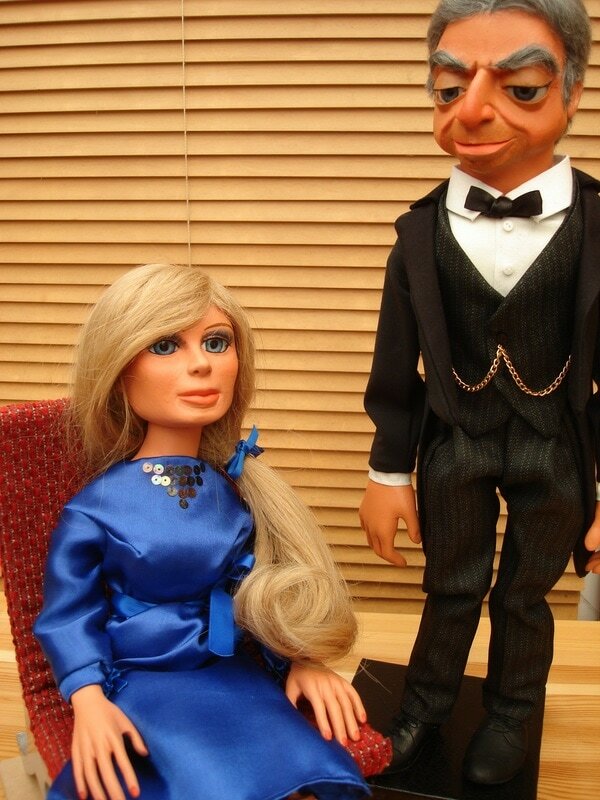 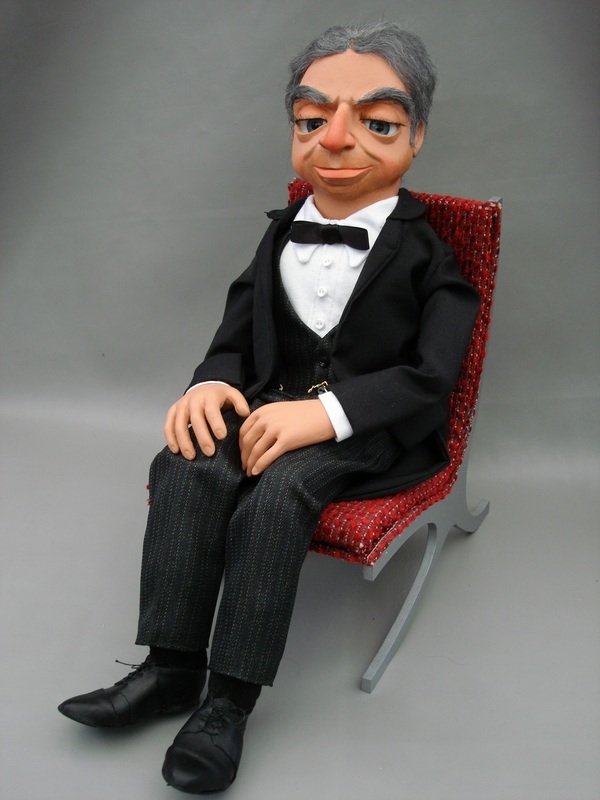 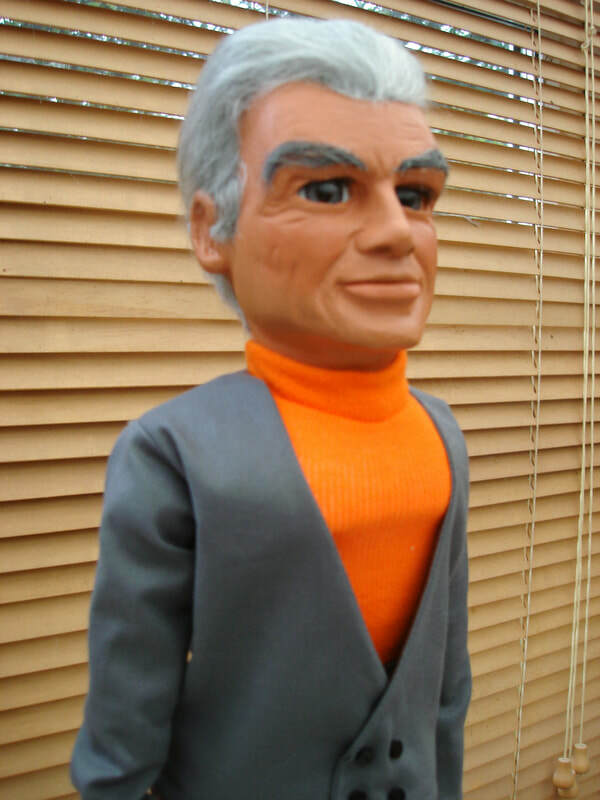 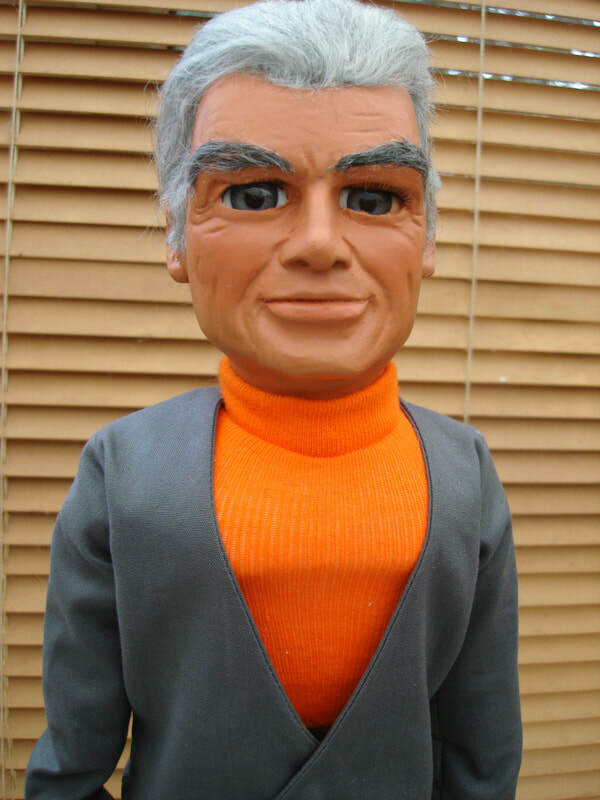 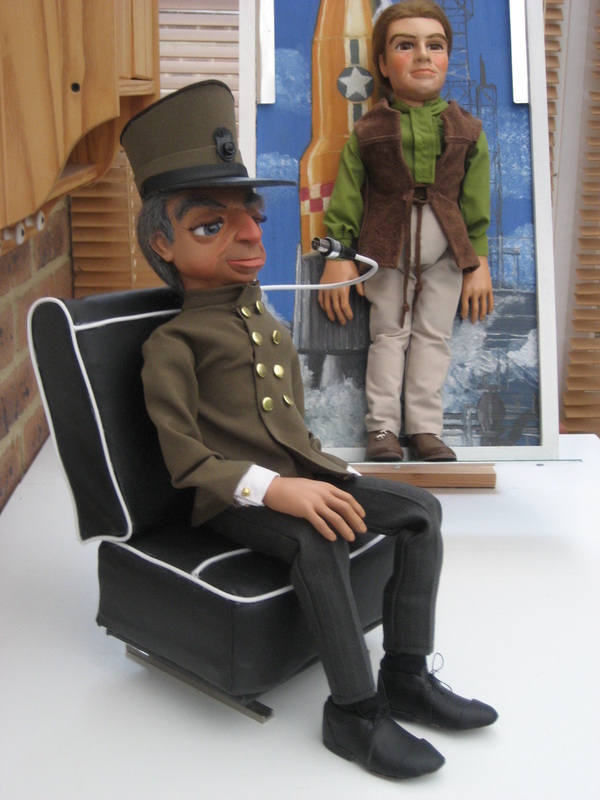 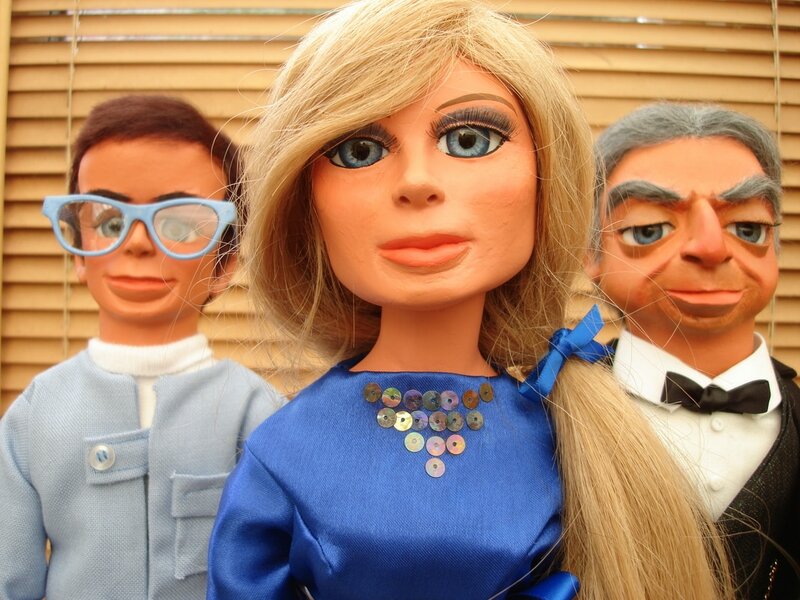 Now which Supermarionation puppet shall I commission next?" 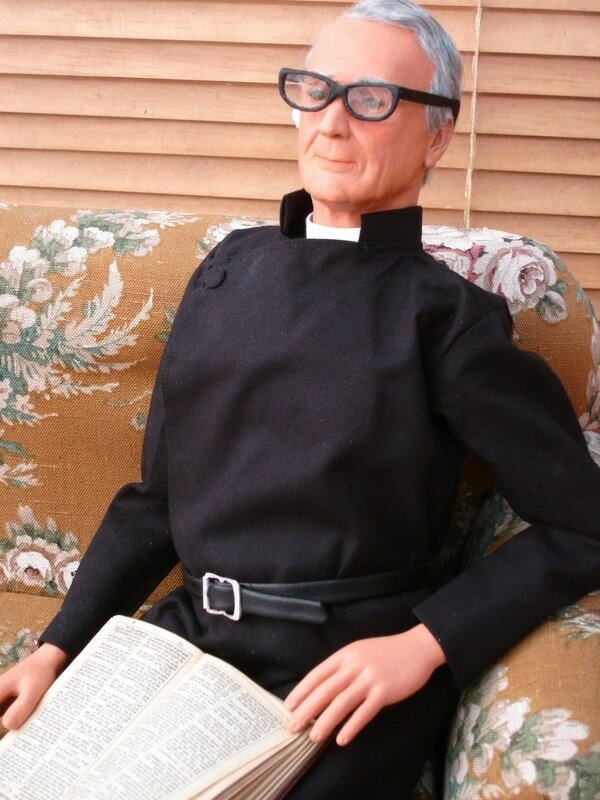 ...You are a master of this art and he is perfect." 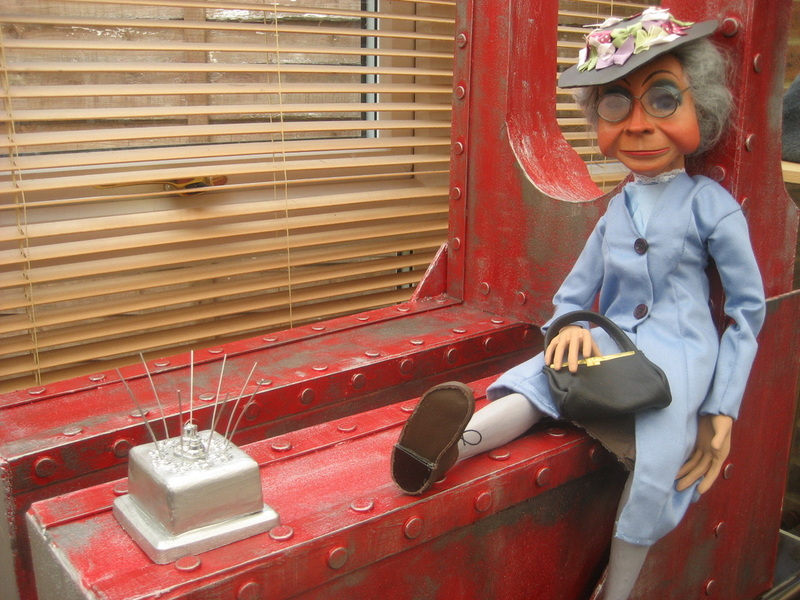 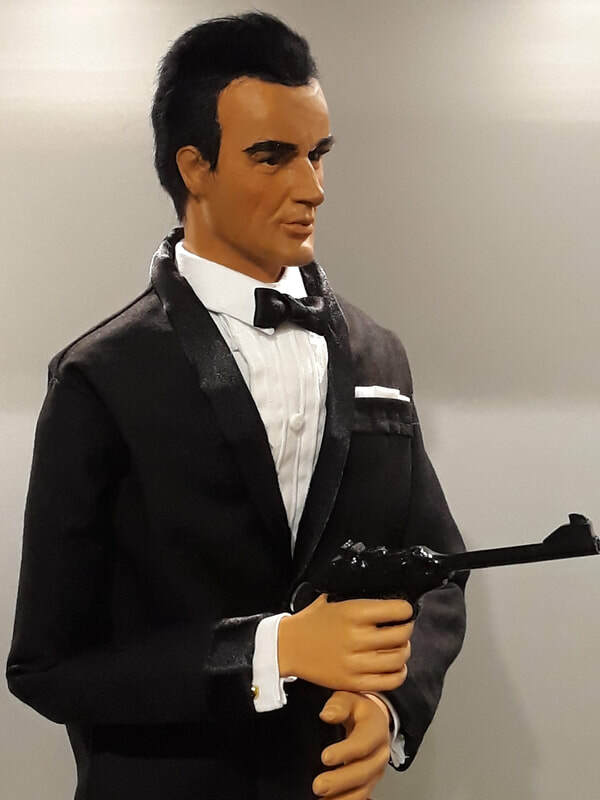 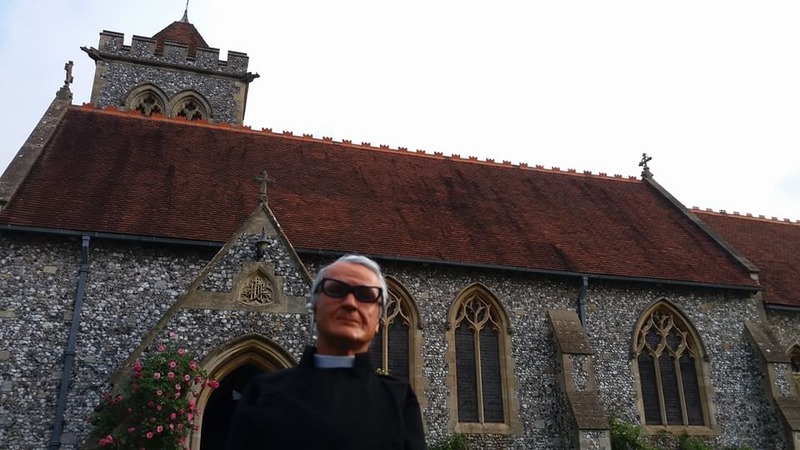 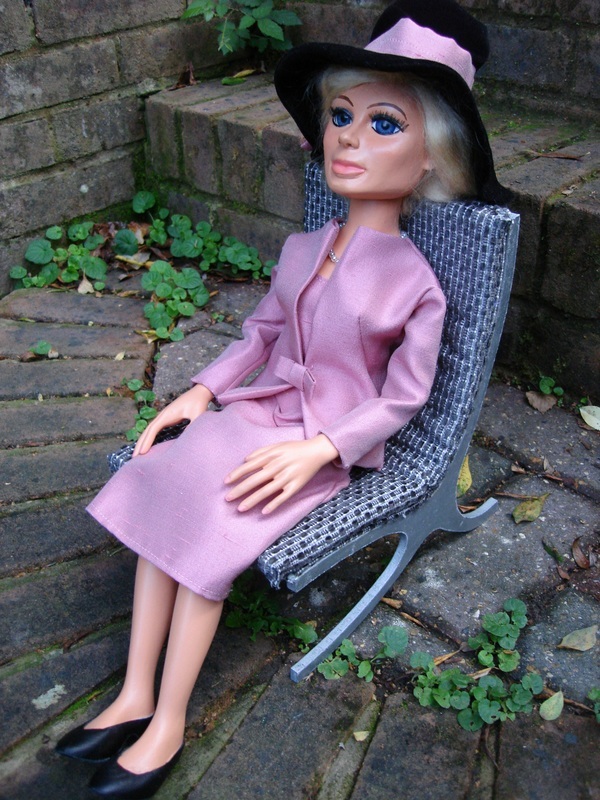 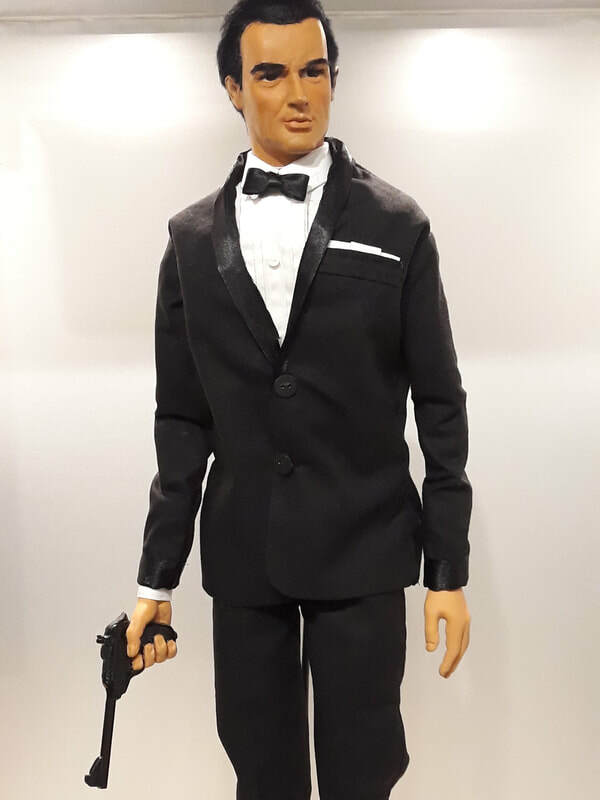 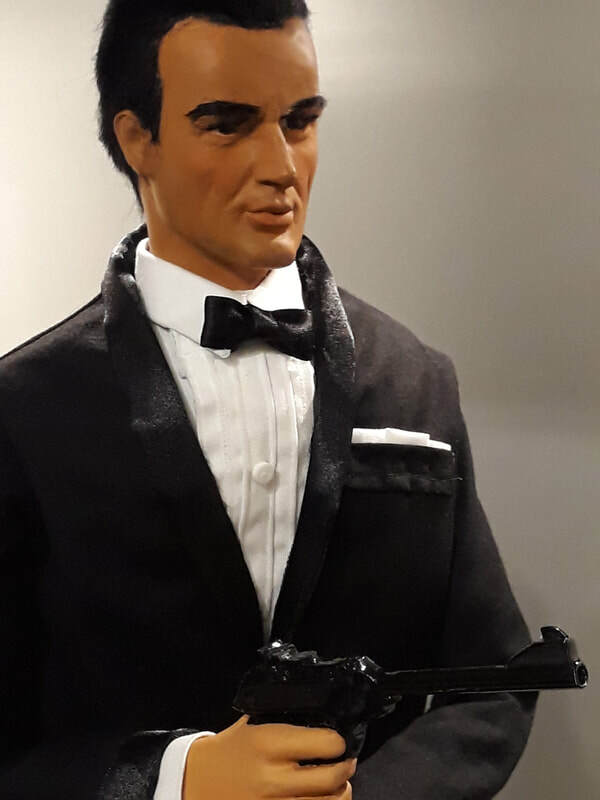 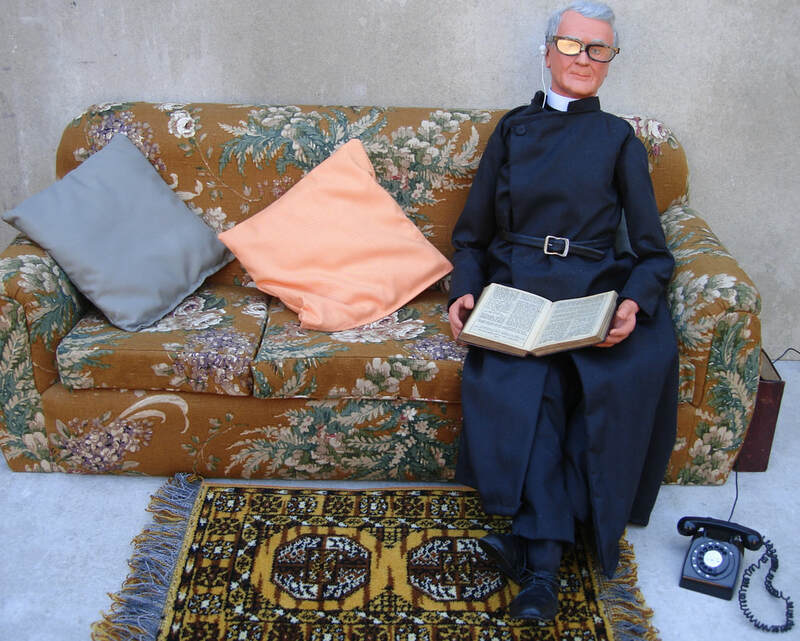 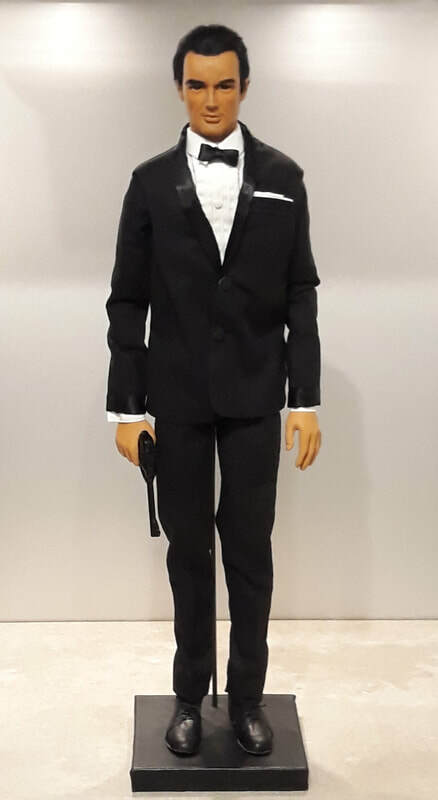 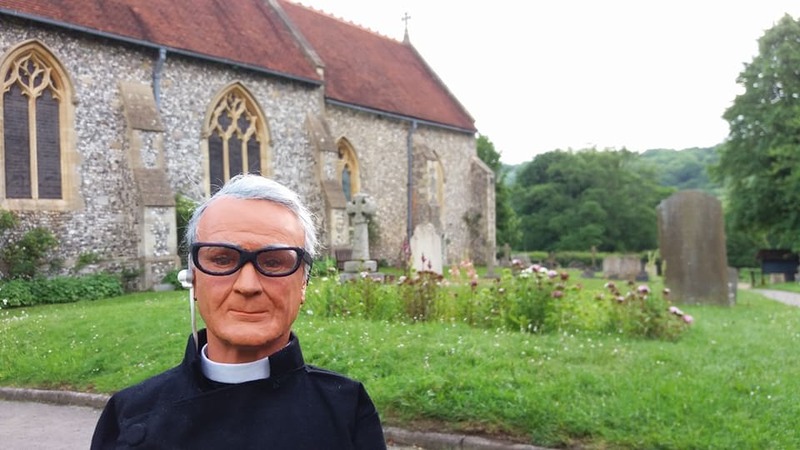 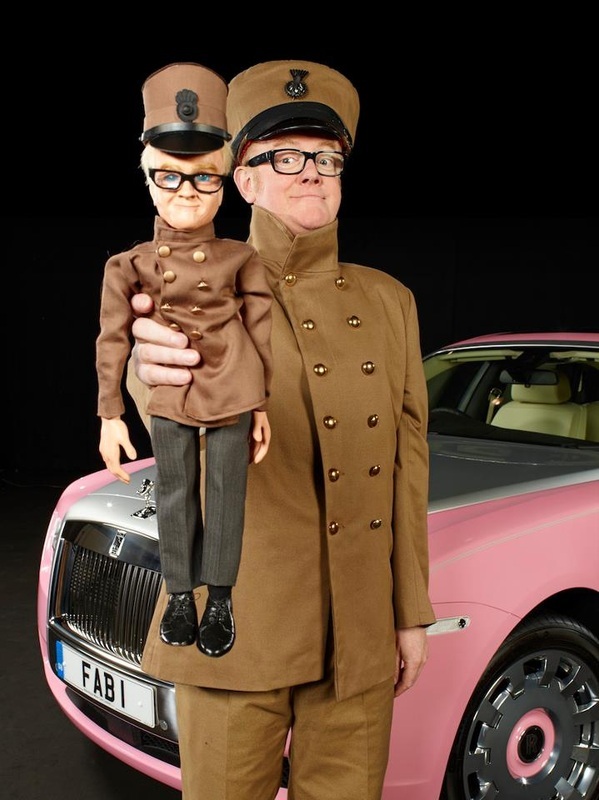 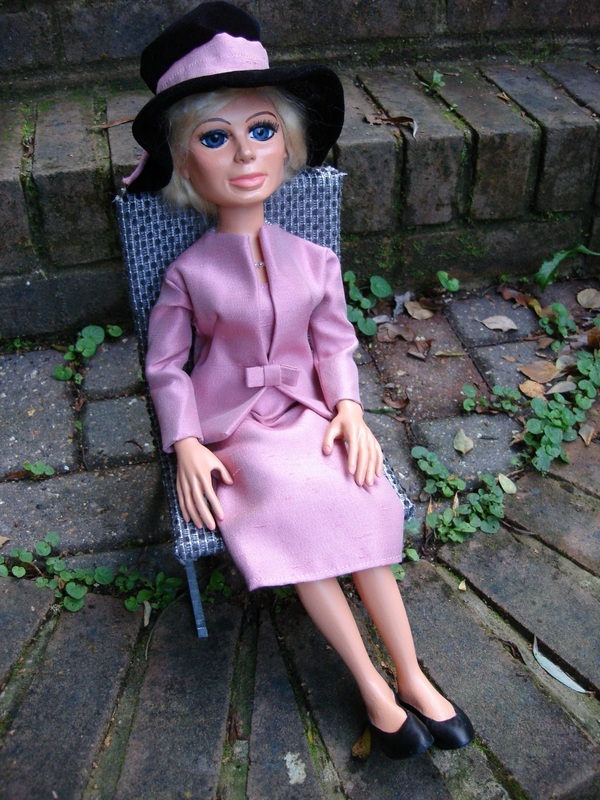 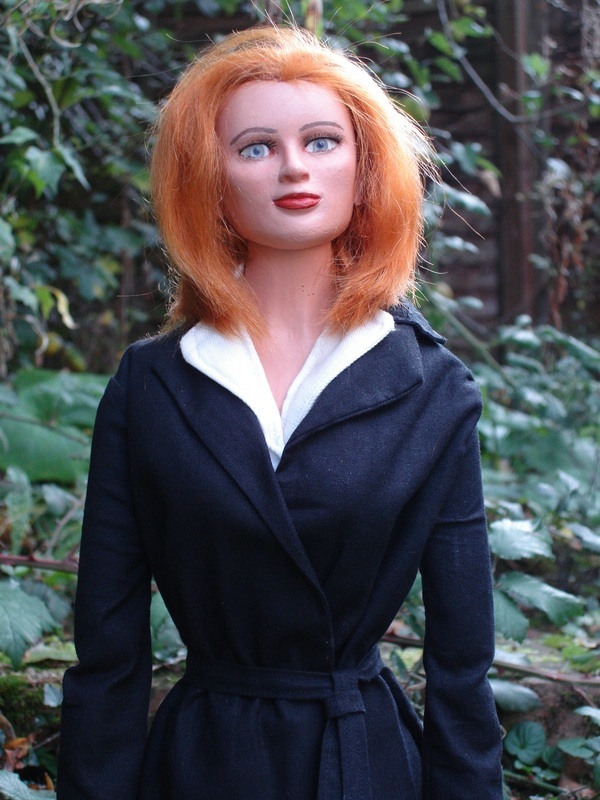 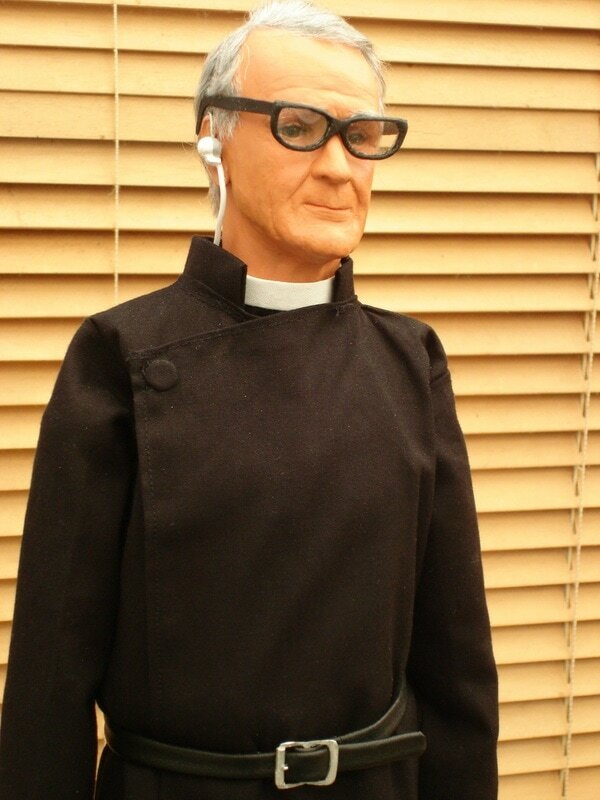 In May 2017, Pat took her replica Father Stanley Unwin puppet to the church in Hughenden, Buckinghamshire, where the title sequence for The Secret Service was filmed. 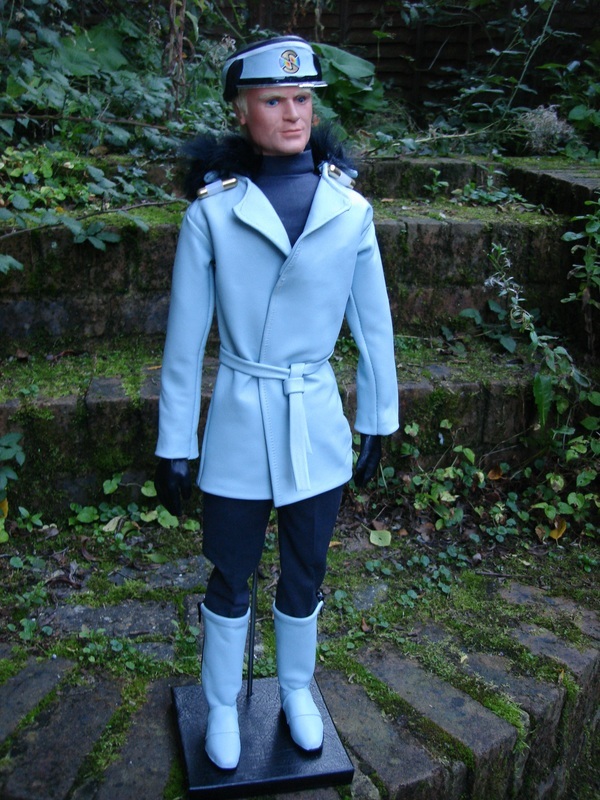 "I'm delighted with Captain Blue in his winter coat. 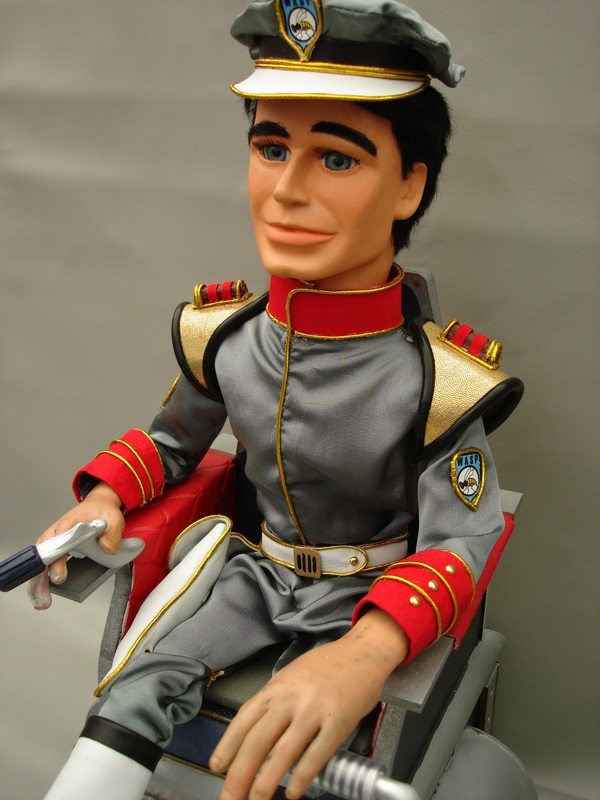 Such attention to detail, right down to the Spectrum badges and perfect smile on his face. 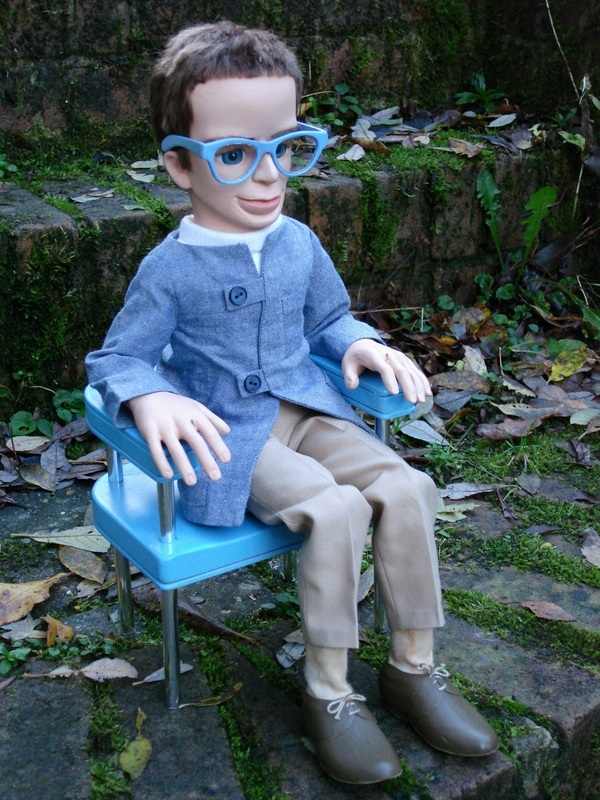 He's as happy as I am." 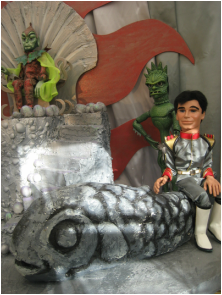 "As a lifelong fan of Stingray, I can only commend you for the Troy and Phones puppets you made for me. 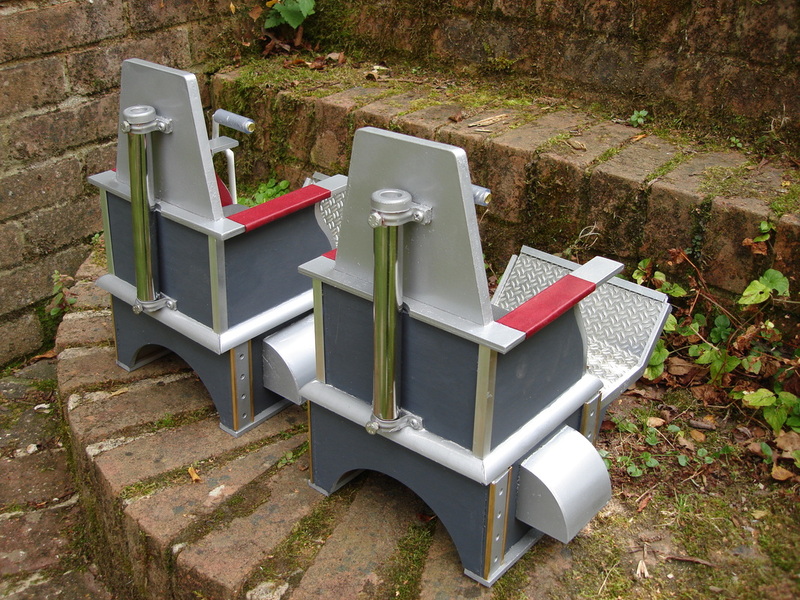 They are both really, really excellent in all respects, a superb job." 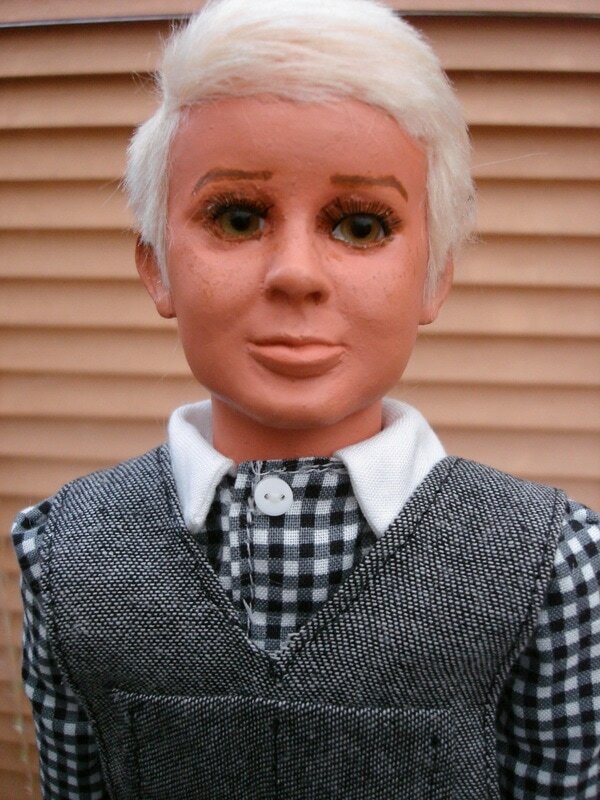 - David, Gateshead, England. 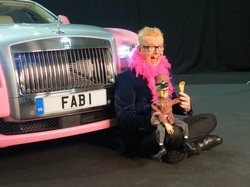 ...awesome in fact! 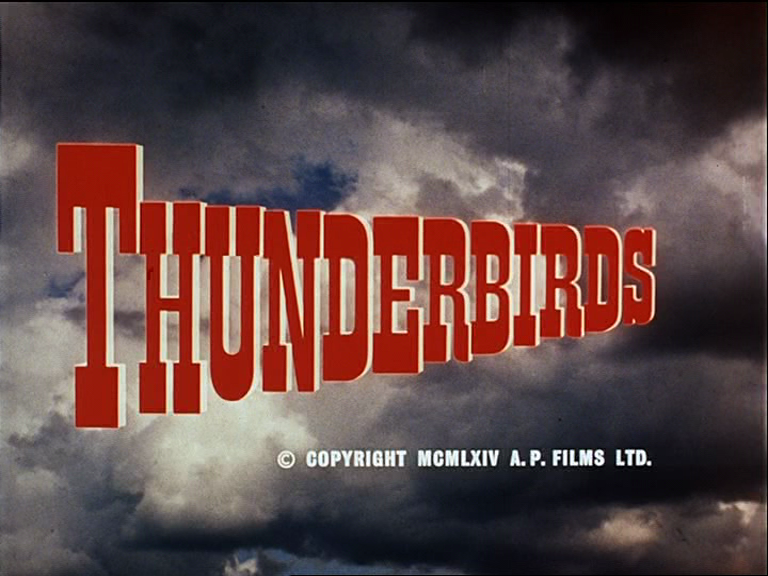 ...just the best! 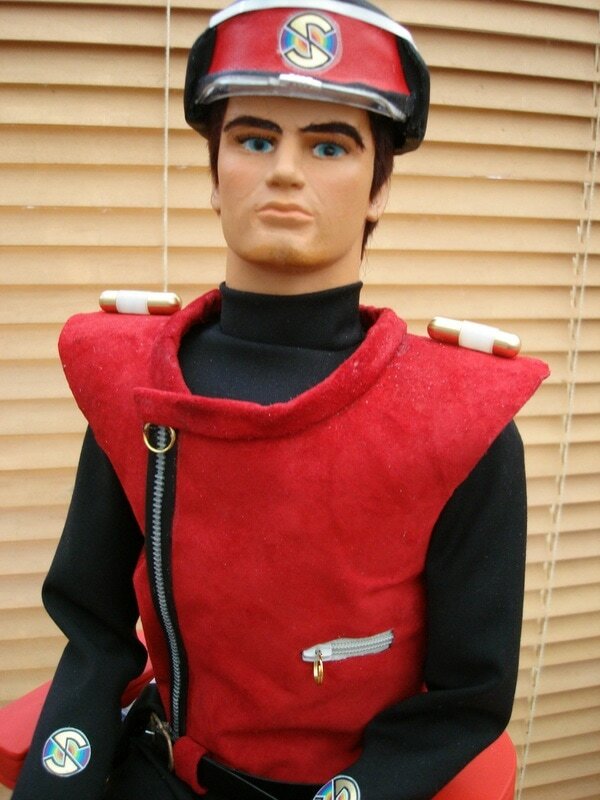 - Tony, Burton on Trent, England. 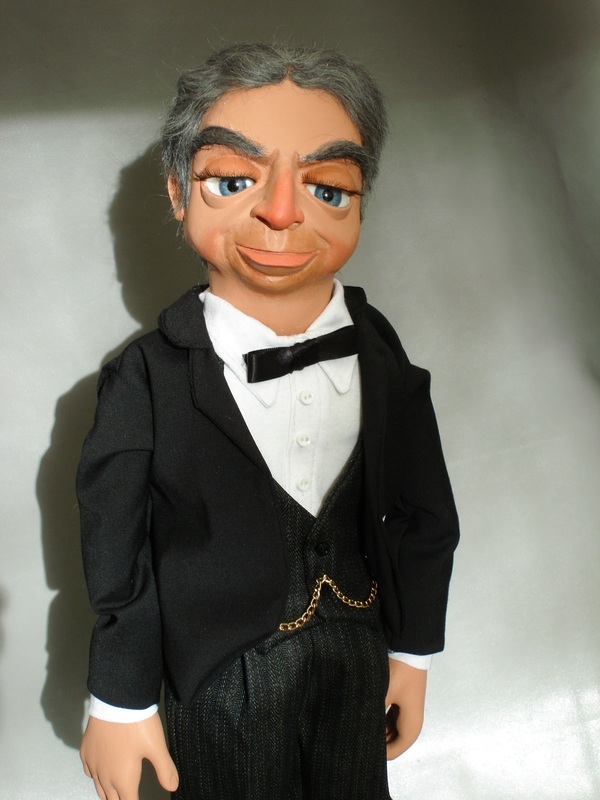 "...Great Jeff Puppet!! 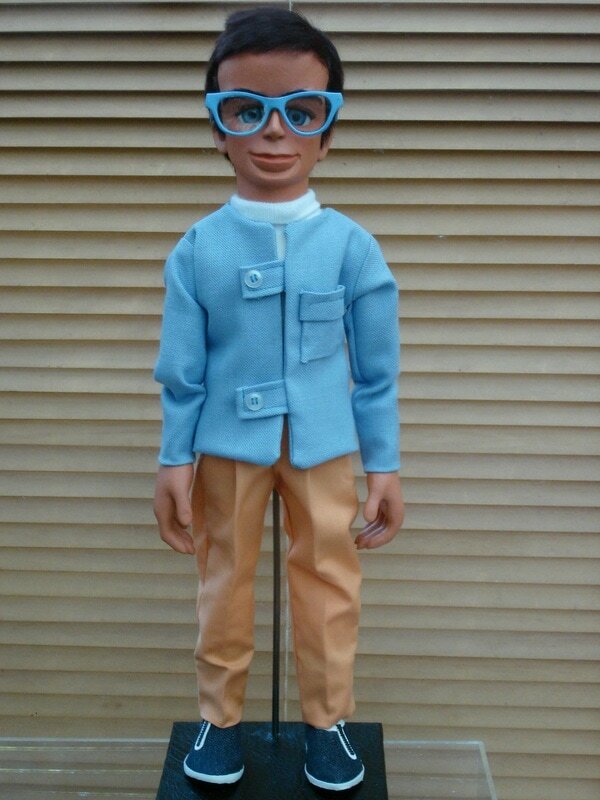 ...Very Great made !!" 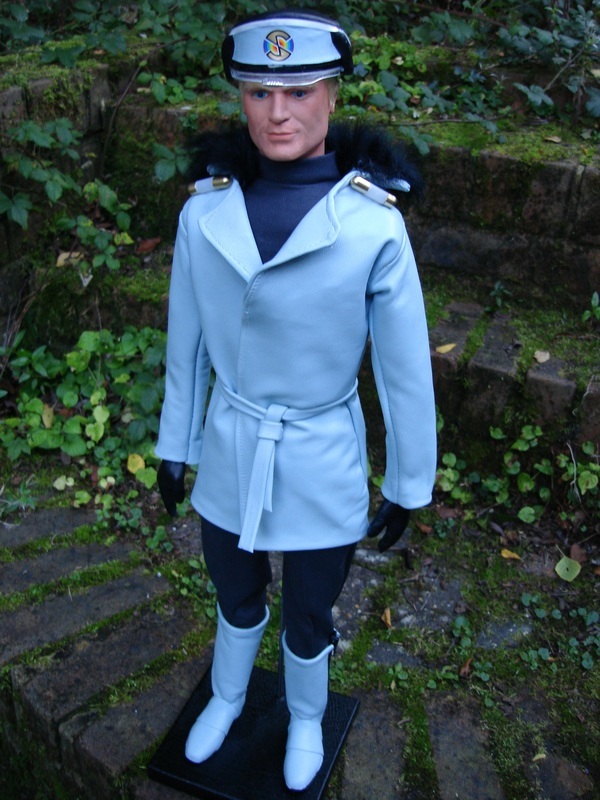 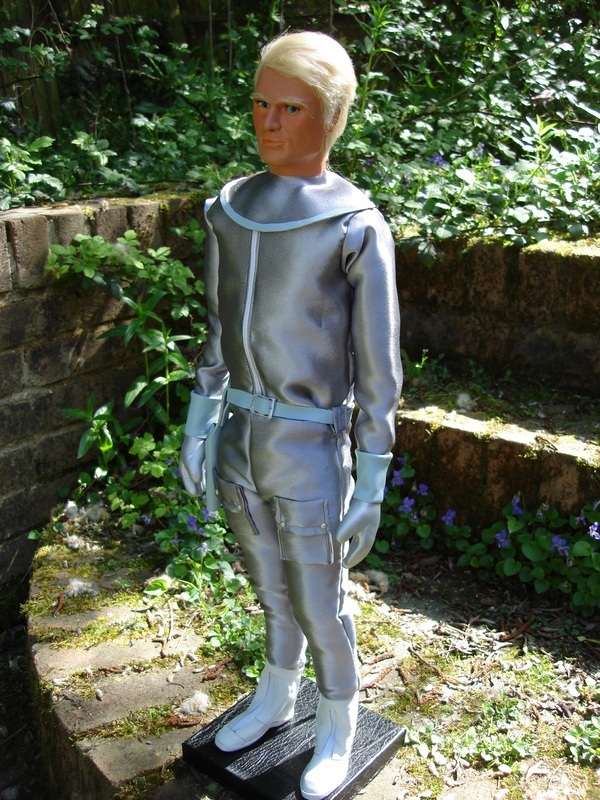 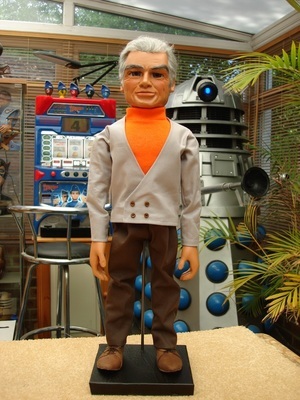 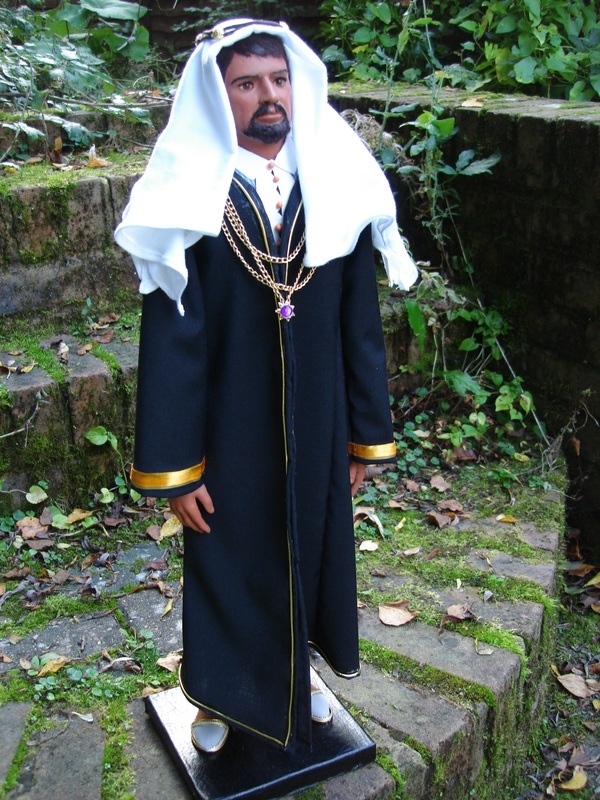 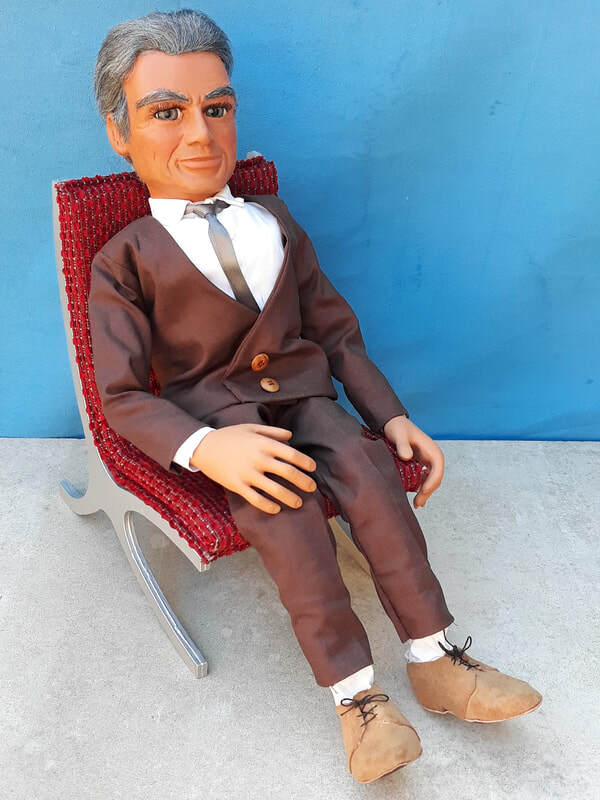 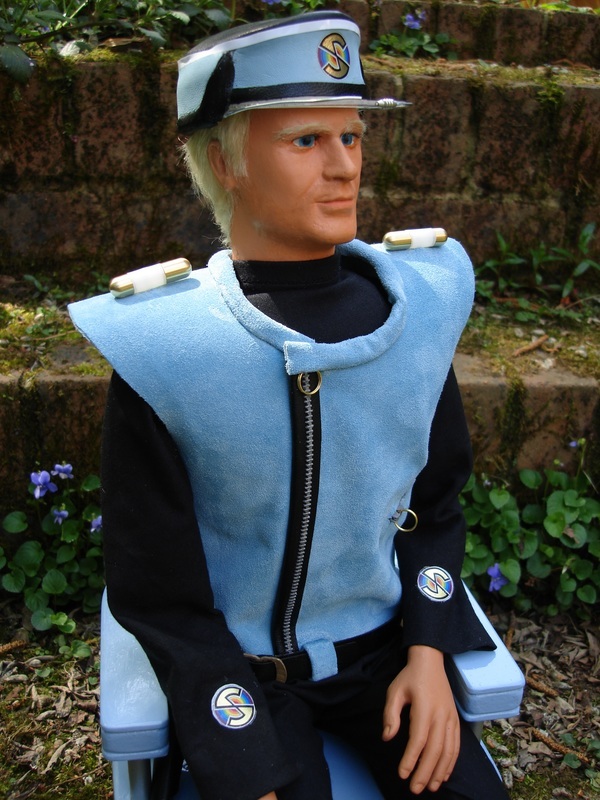 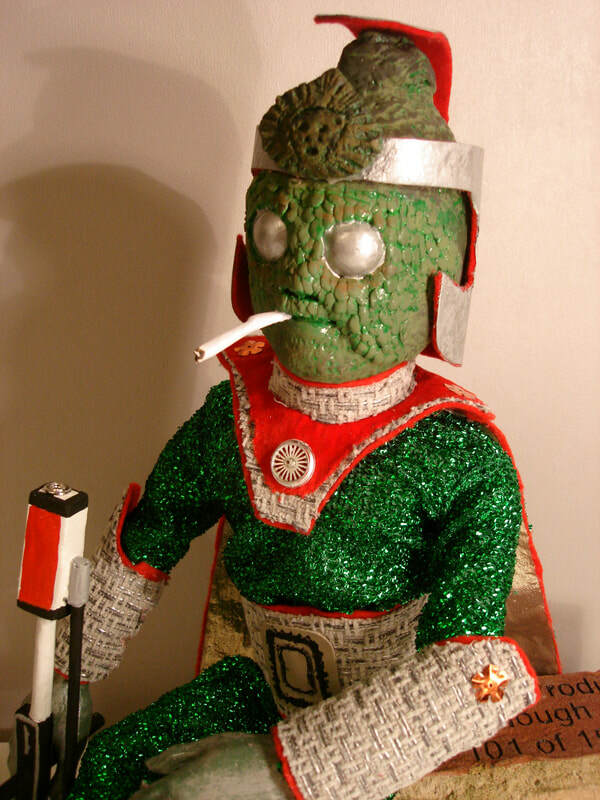 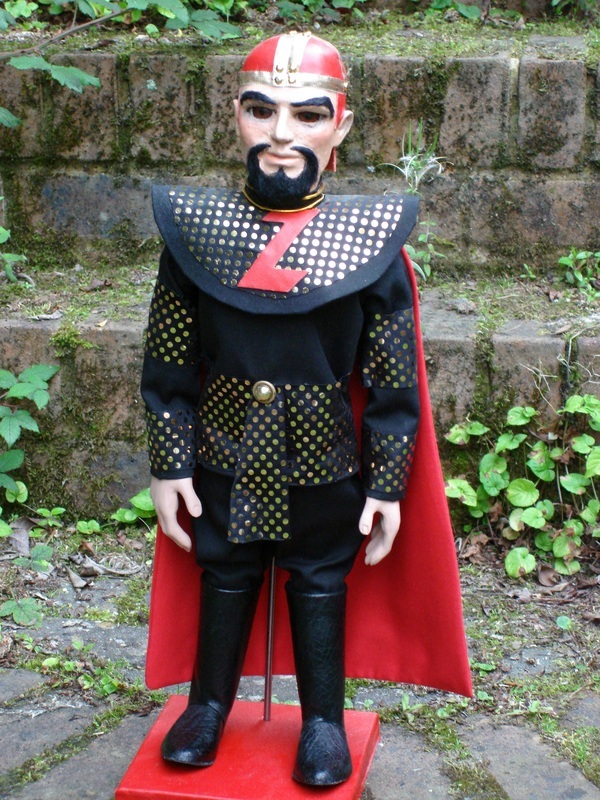 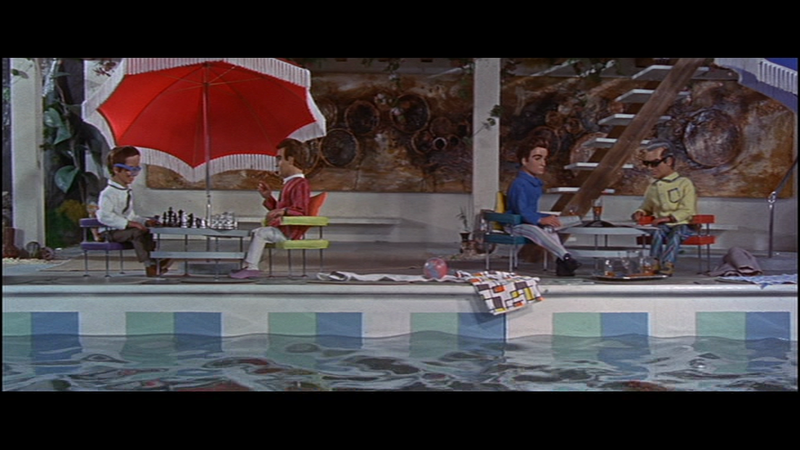 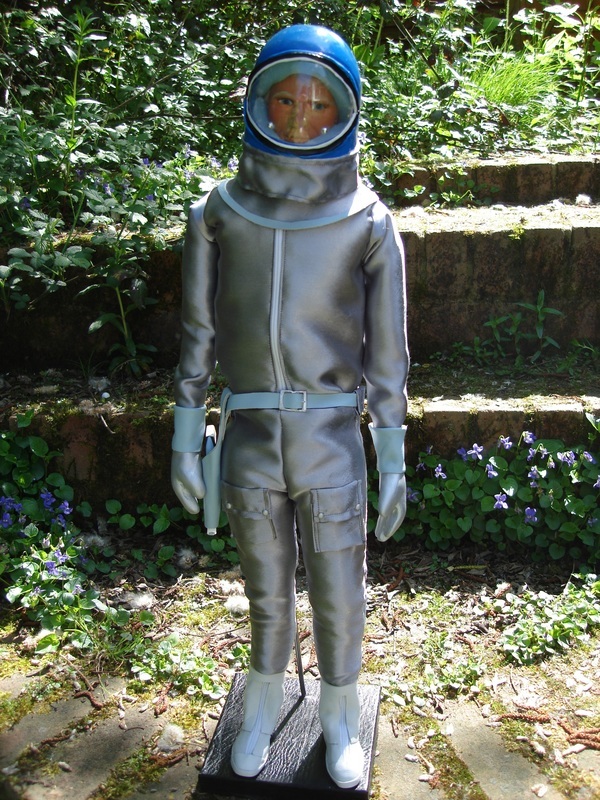 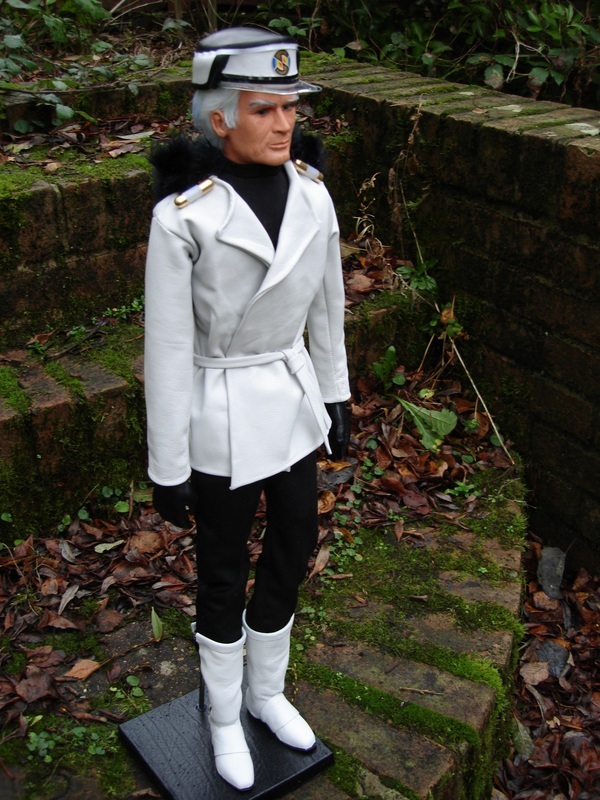 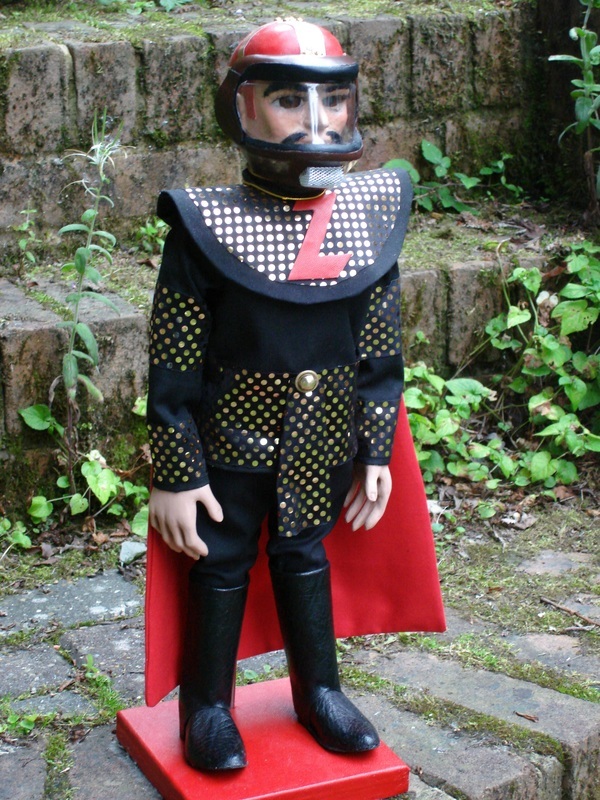 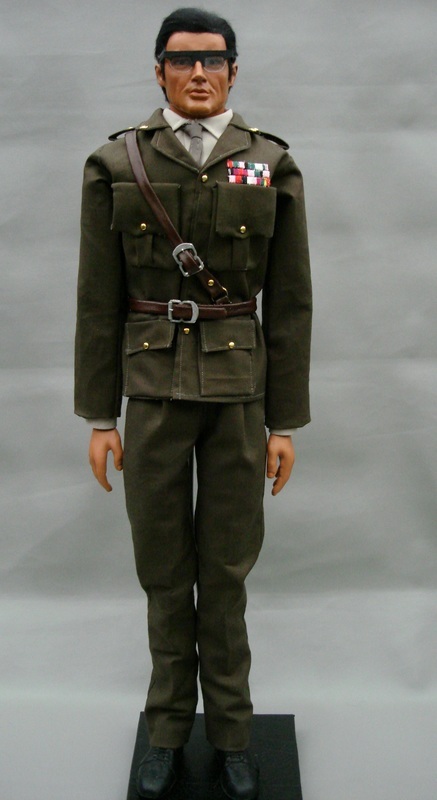 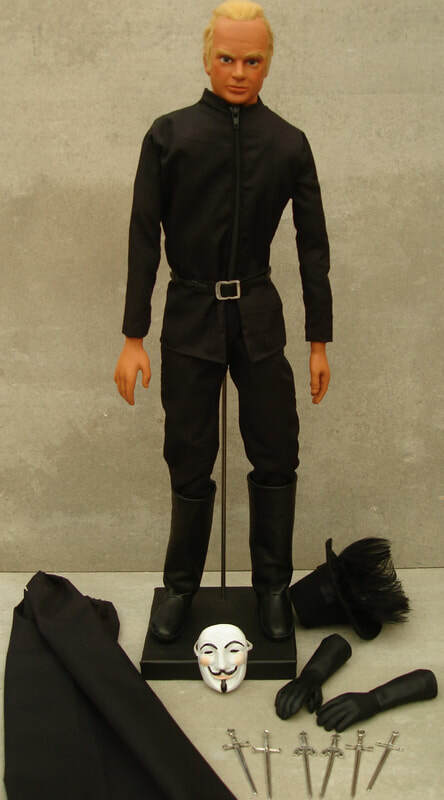 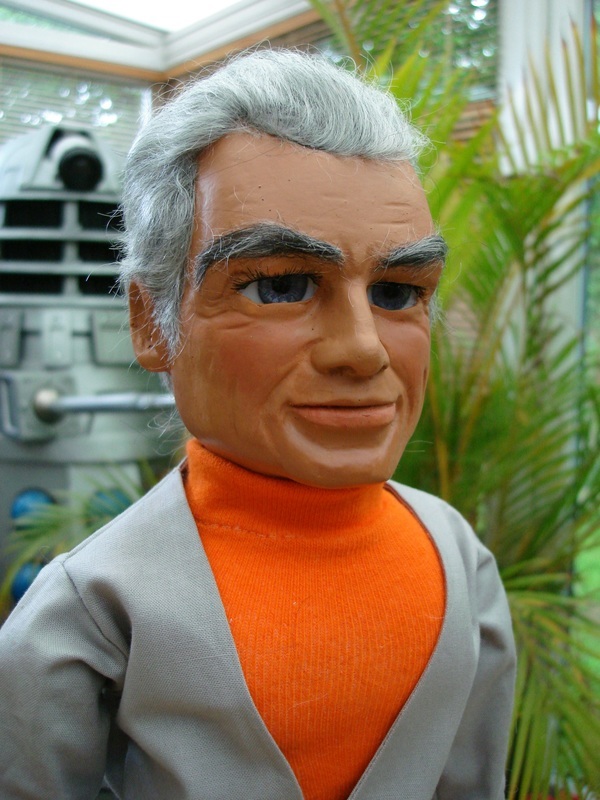 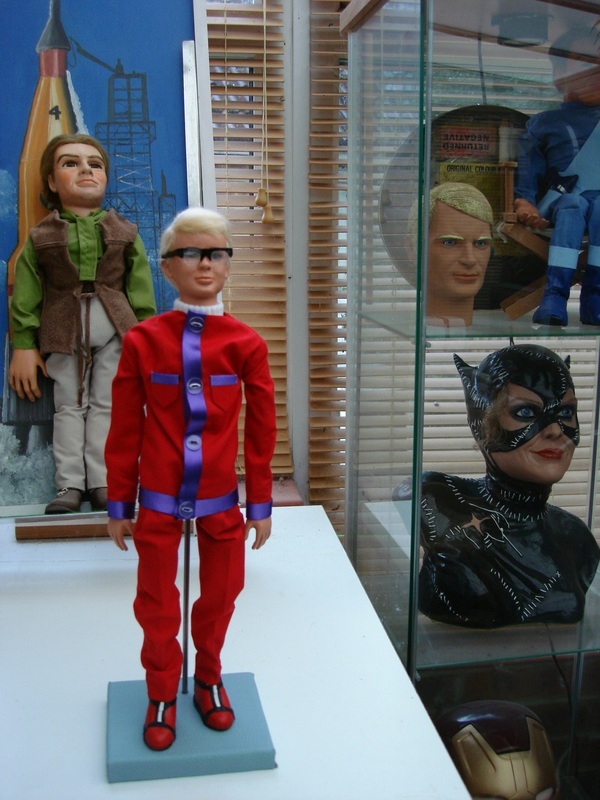 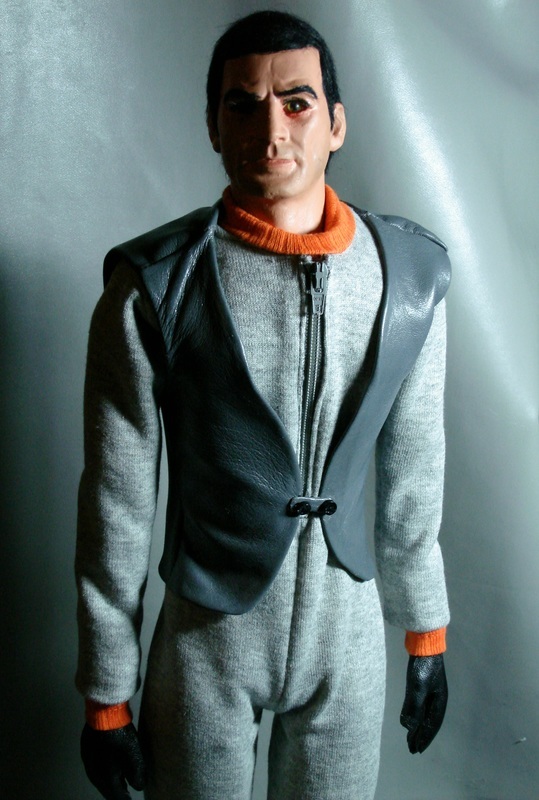 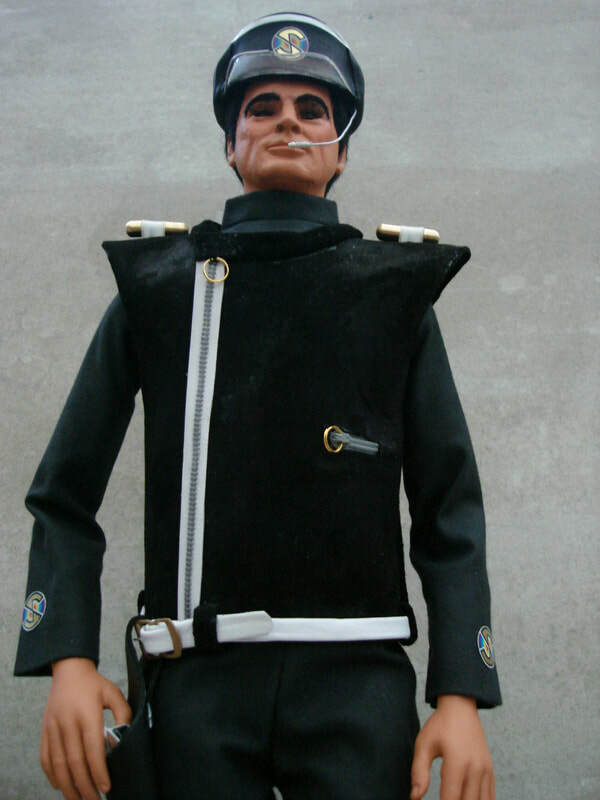 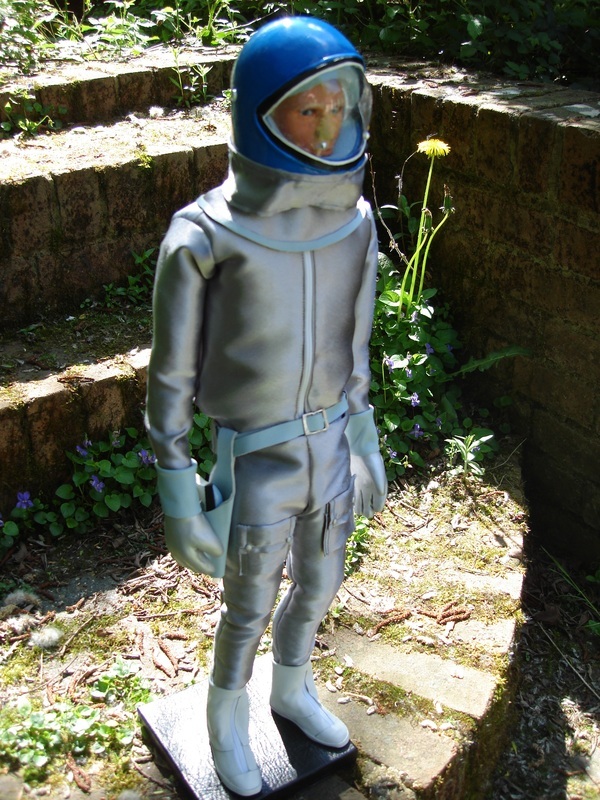 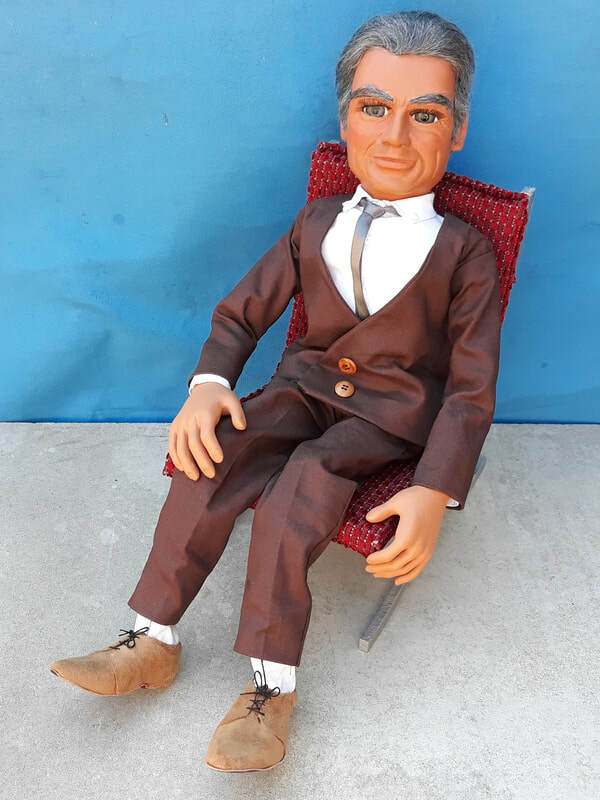 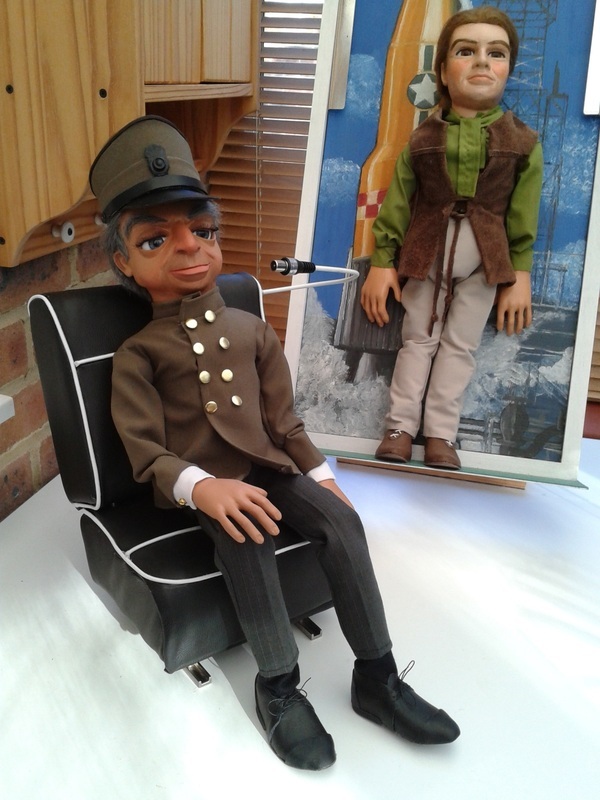 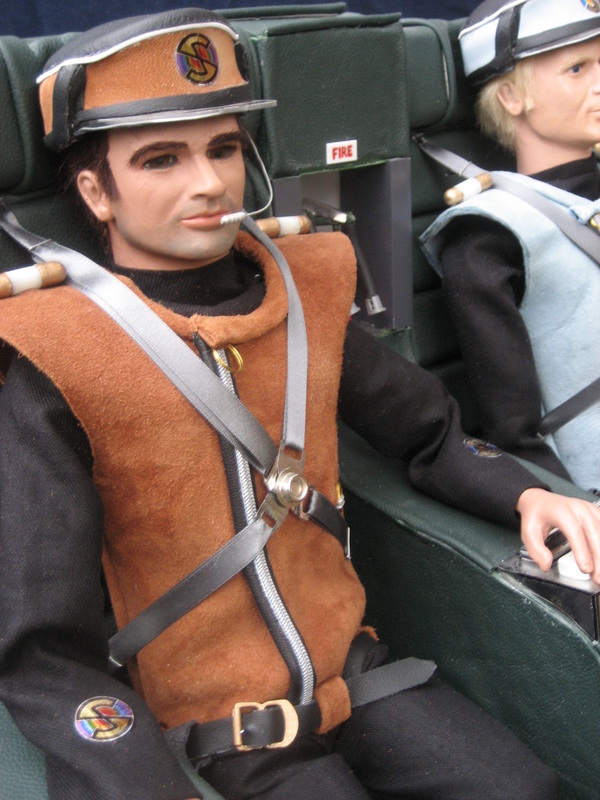 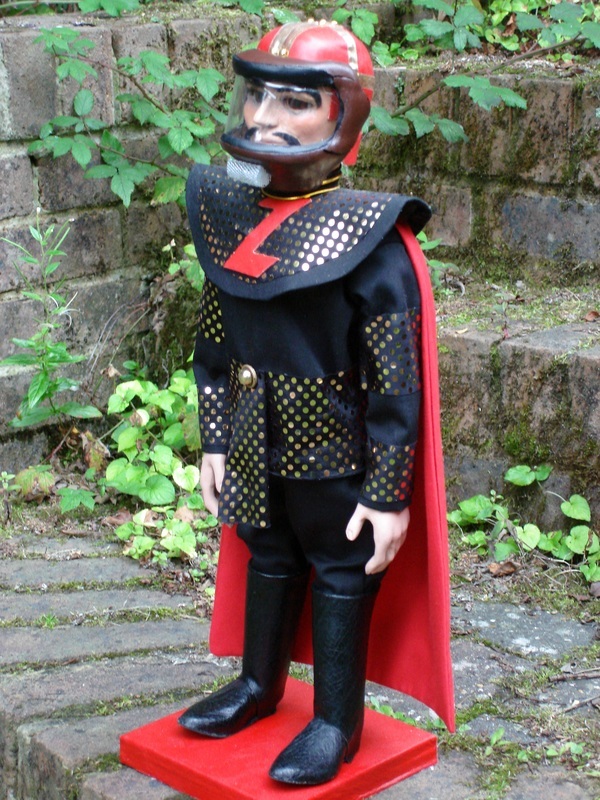 His little outfit is stunning..."
Replica SUPERMARIONATION puppets and puppet-scale props made to order. 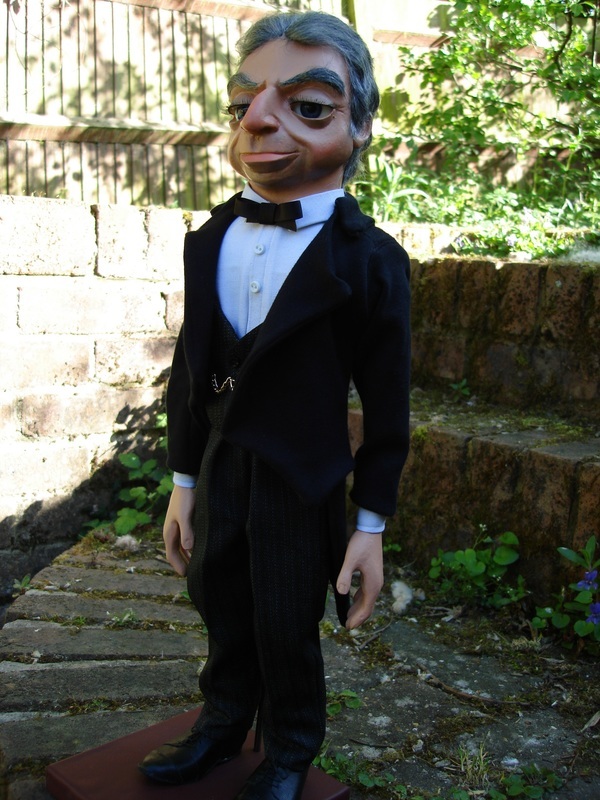 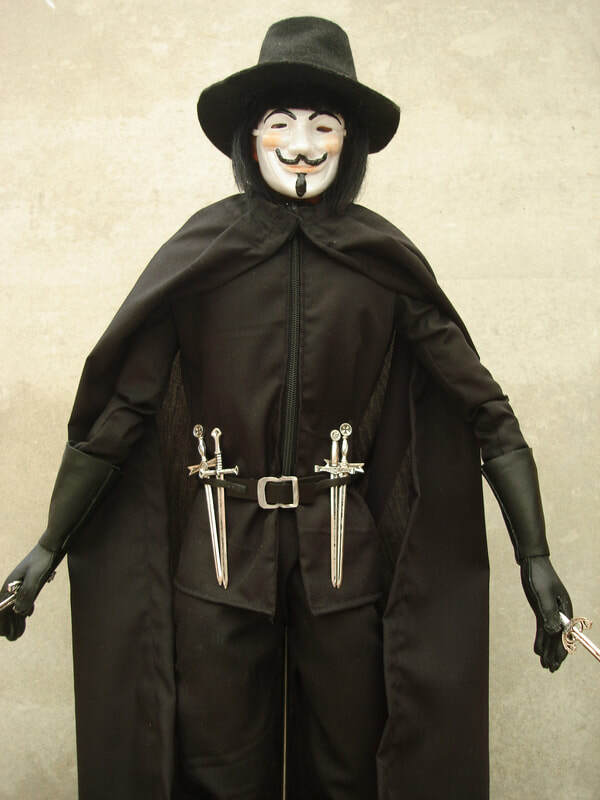 My puppet replicas are all STUDIO SCALE and range in size from around 19" (50cm) to 23" (58cm) tall. 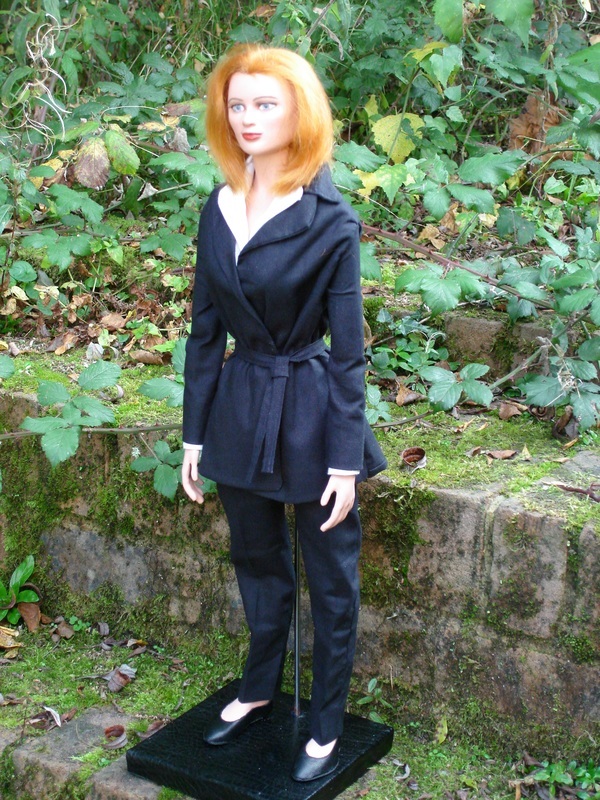 They are fully poseable and have quality fixed glass eyes and fixed lip. 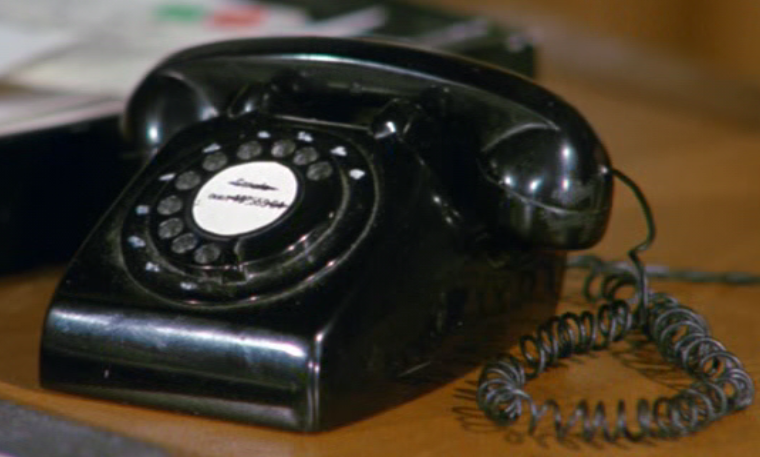 OR use the "Contact" form on the black toolbar at the top of this page. 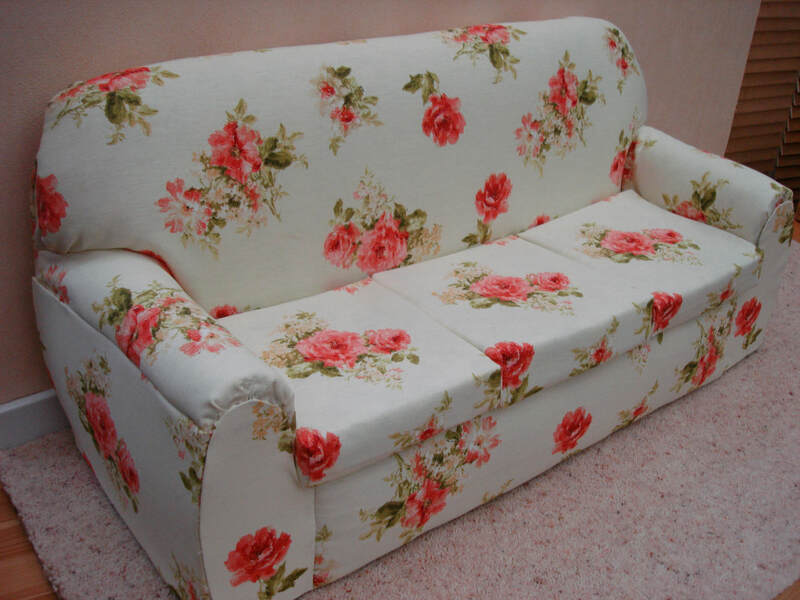 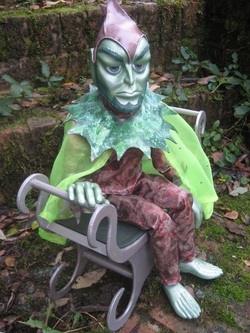 Please ask me for a quote to make Brains in any outfit, with or without a seat and/or prop. 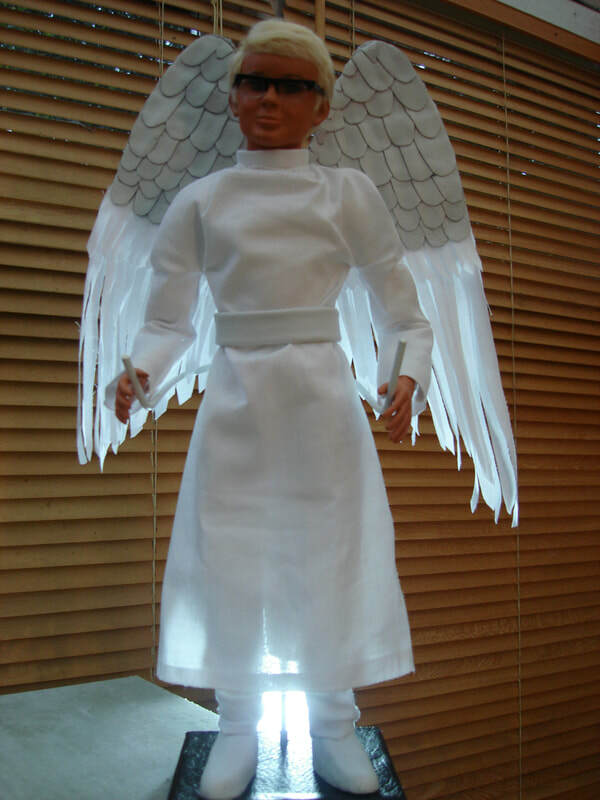 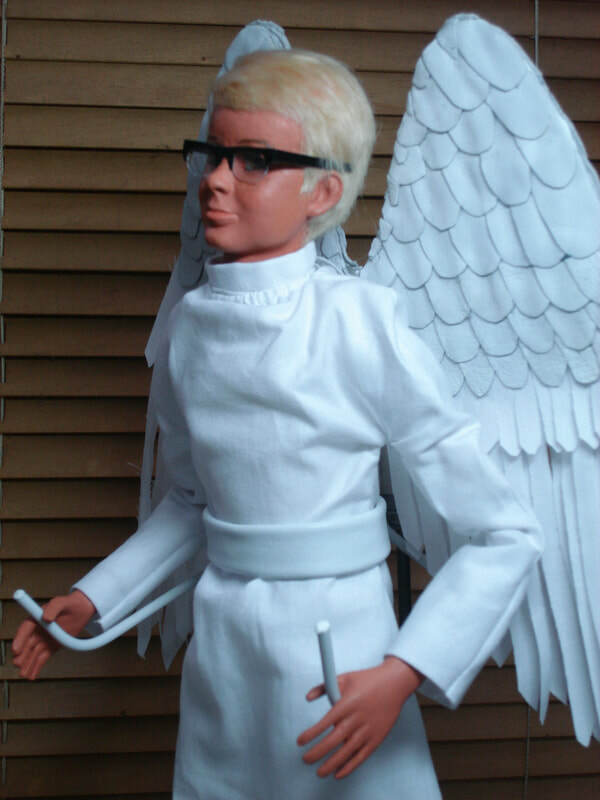 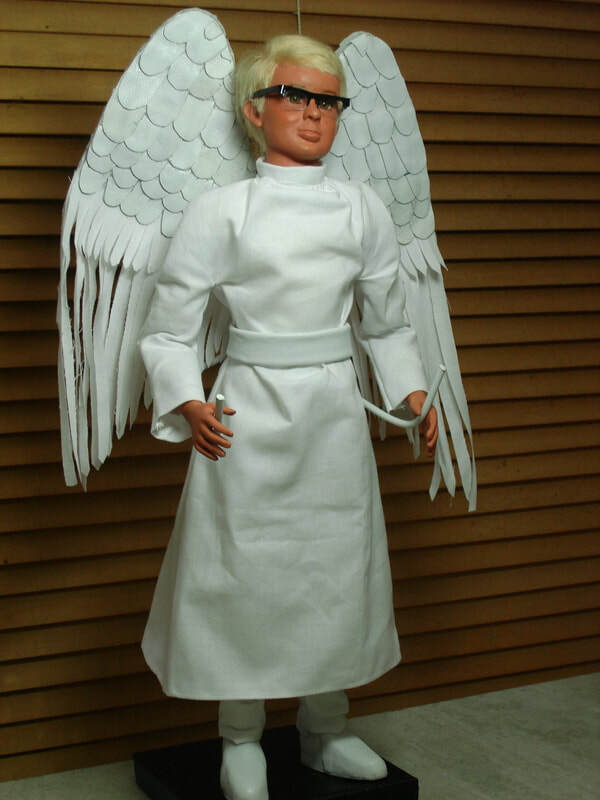 £800 for Replica Angel Puppet Only (supported in a standing pose by a custom-made doll stand). 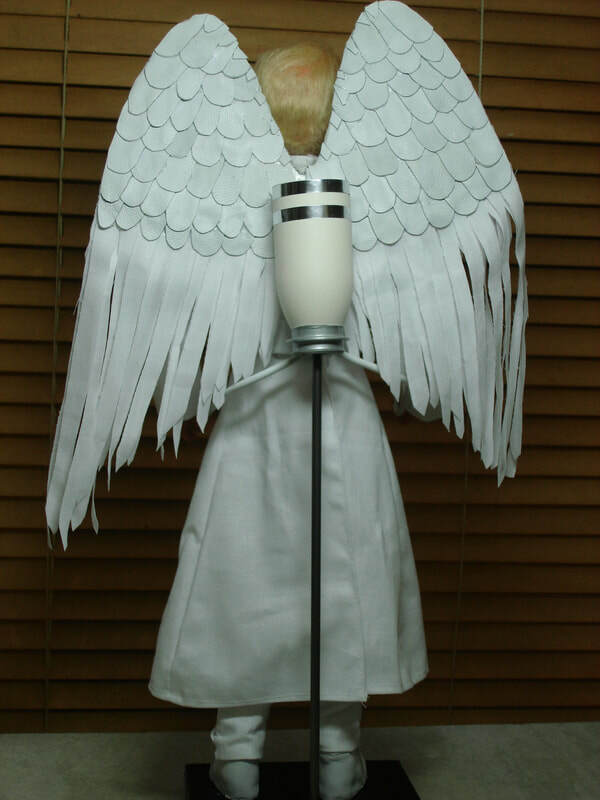 ANGEL PUPPET KIT - SUPPLIED WITH HEAD OF EITHER DESTINY, SYMPHONY, HARMONY OR MELODY ANGELS £130 PLUS SHIPPING. 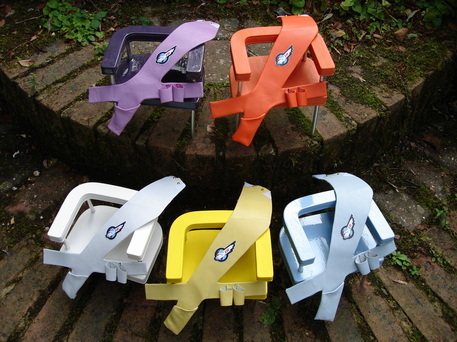 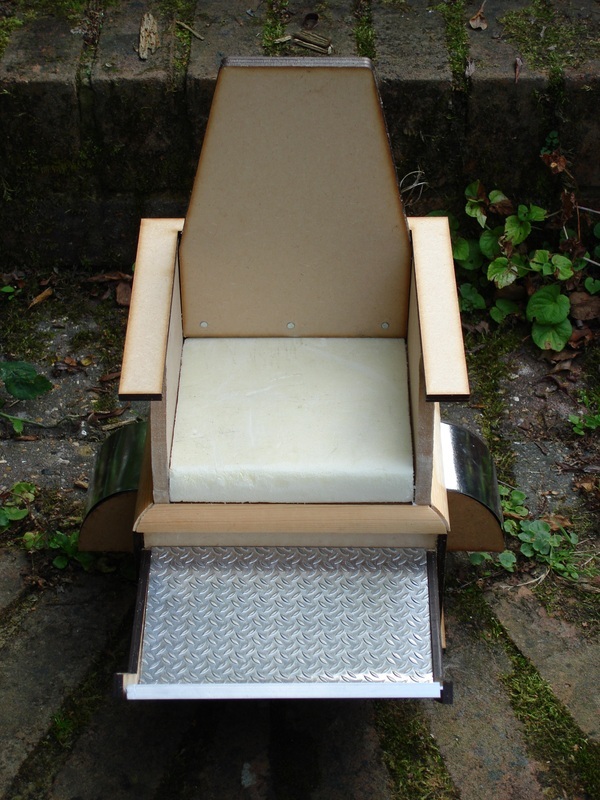 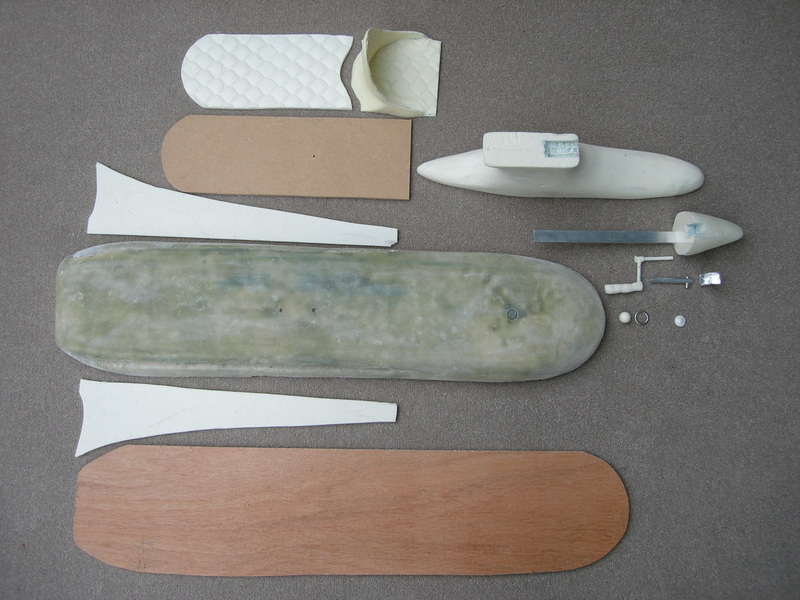 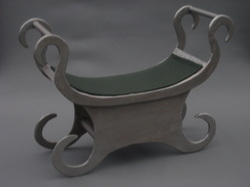 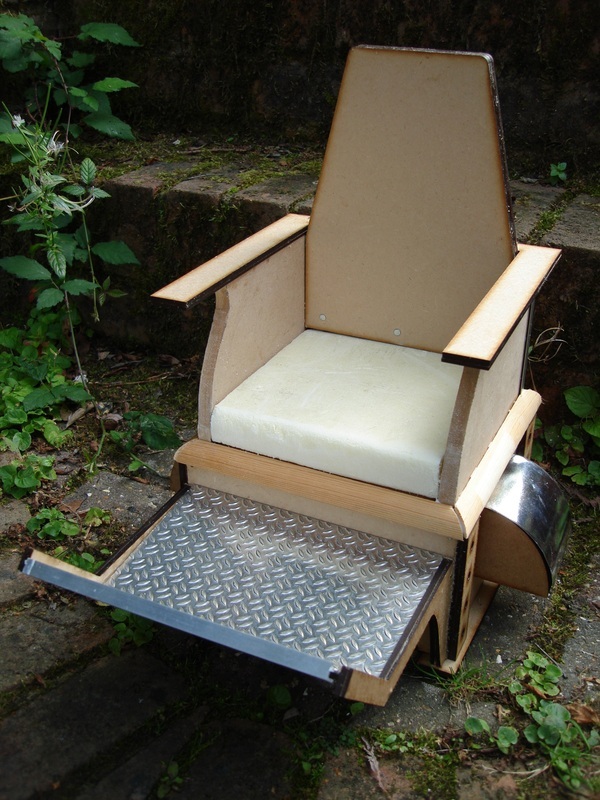 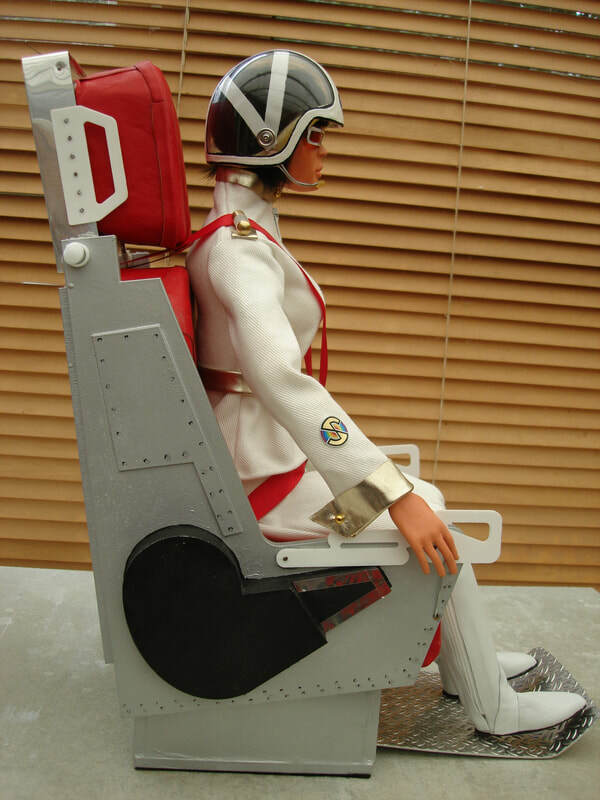 Laser-cut studio-scale Angel Interceptor Ejector Seat, complete with barley-pattern metal footplate, pre-cut and shaped seat cushions in foam board, laser-cut white plastic handles/levers. 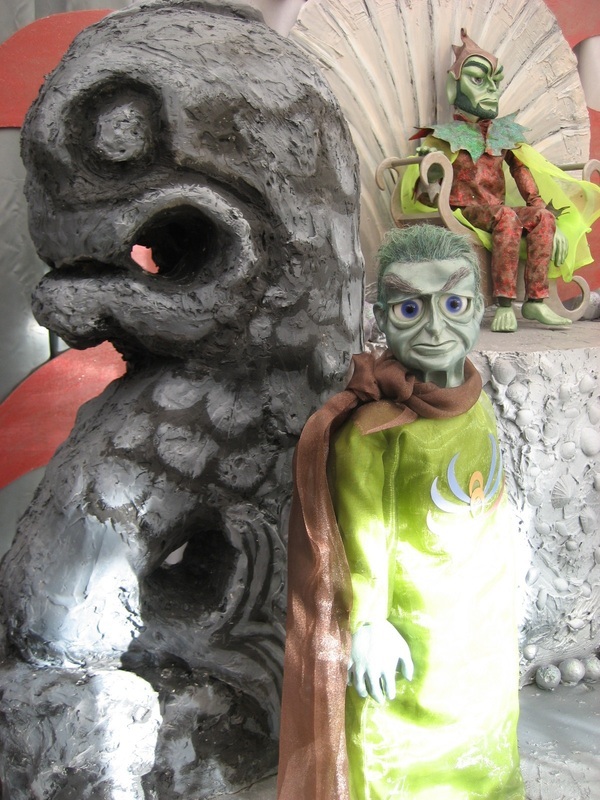 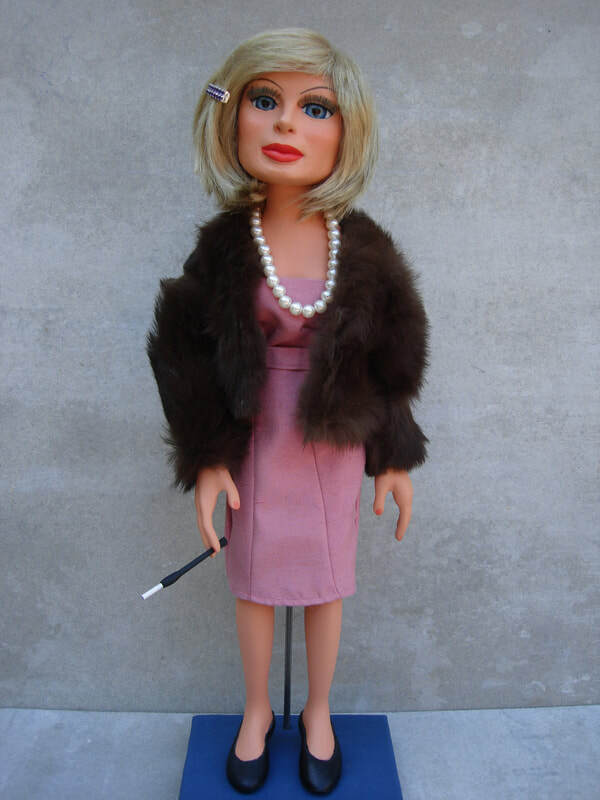 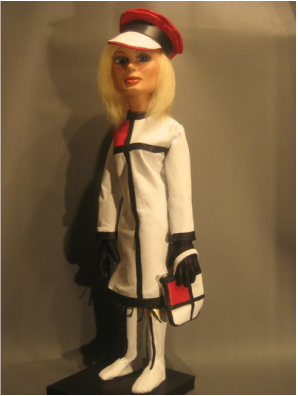 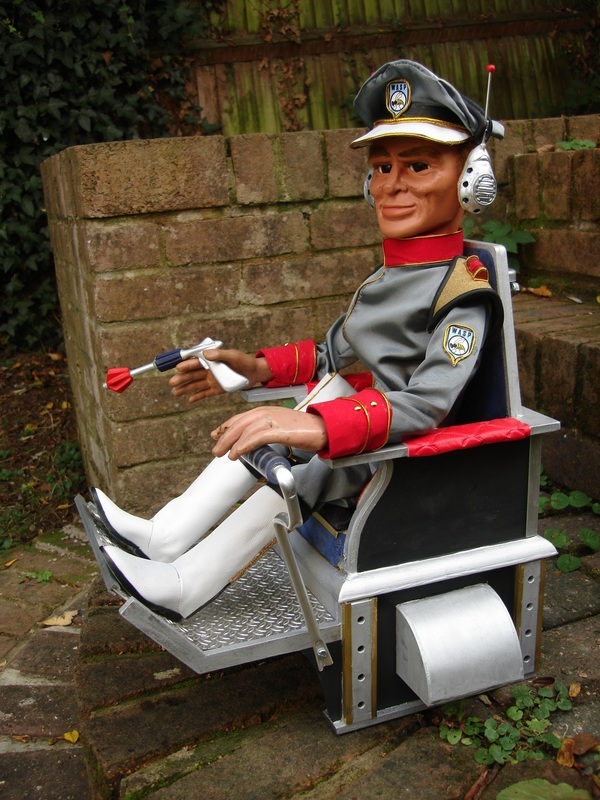 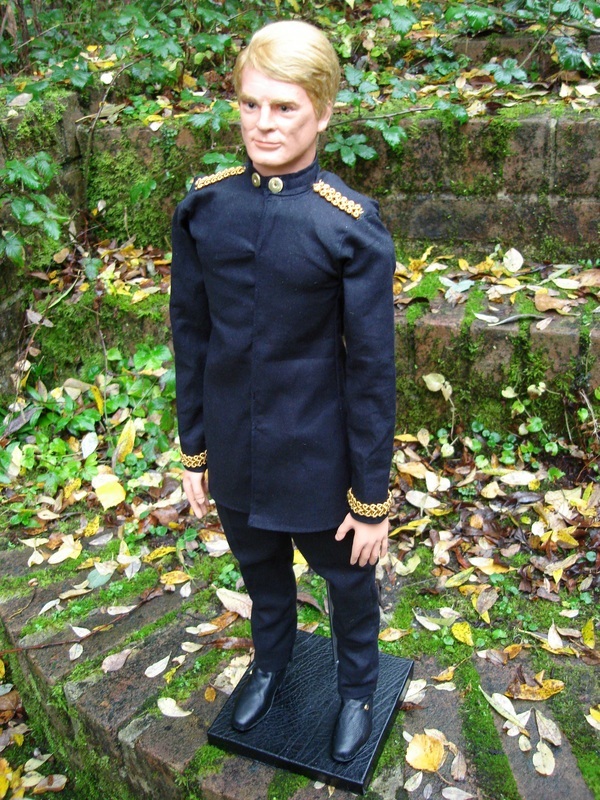 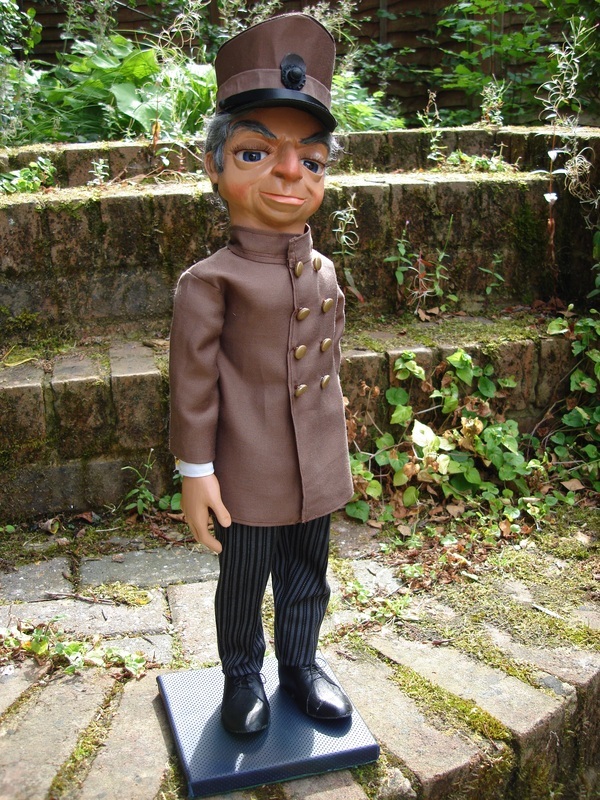 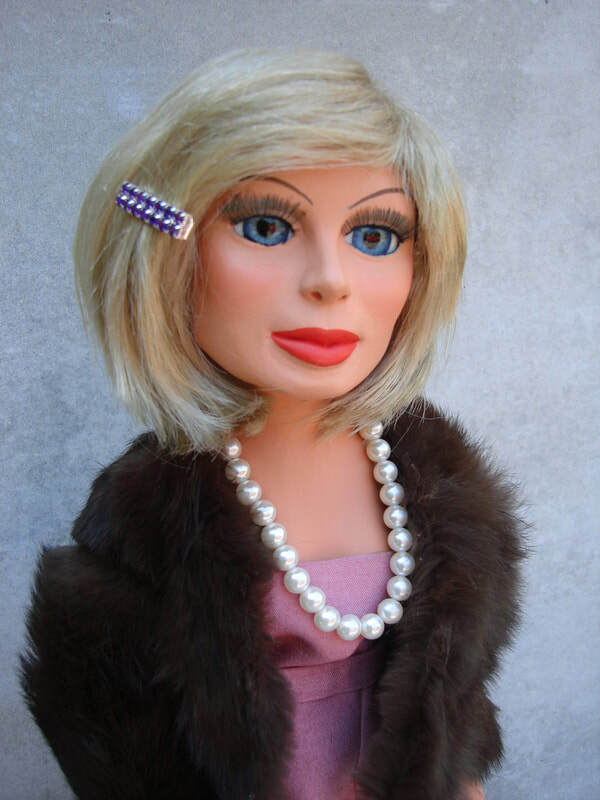 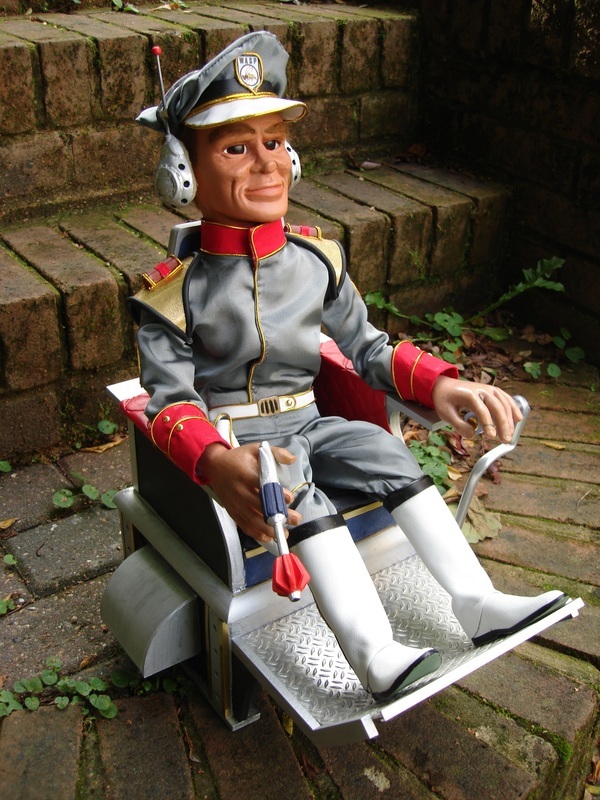 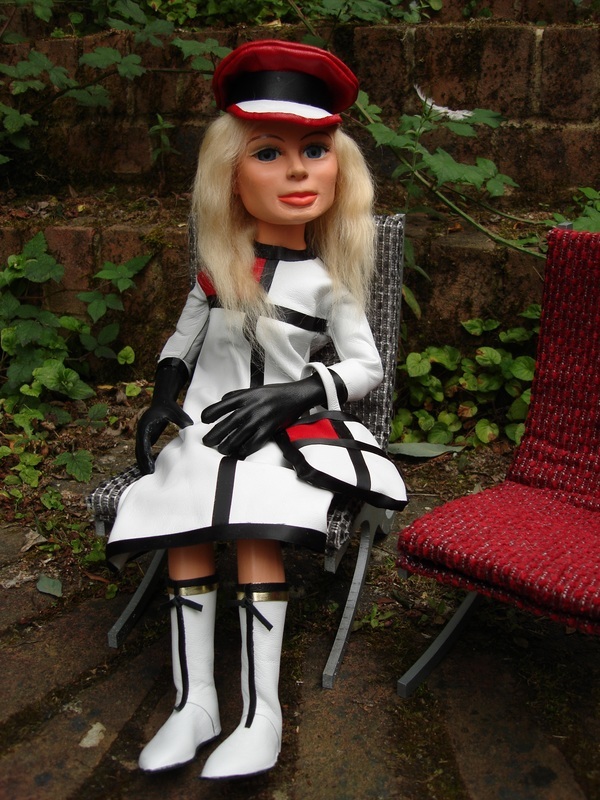 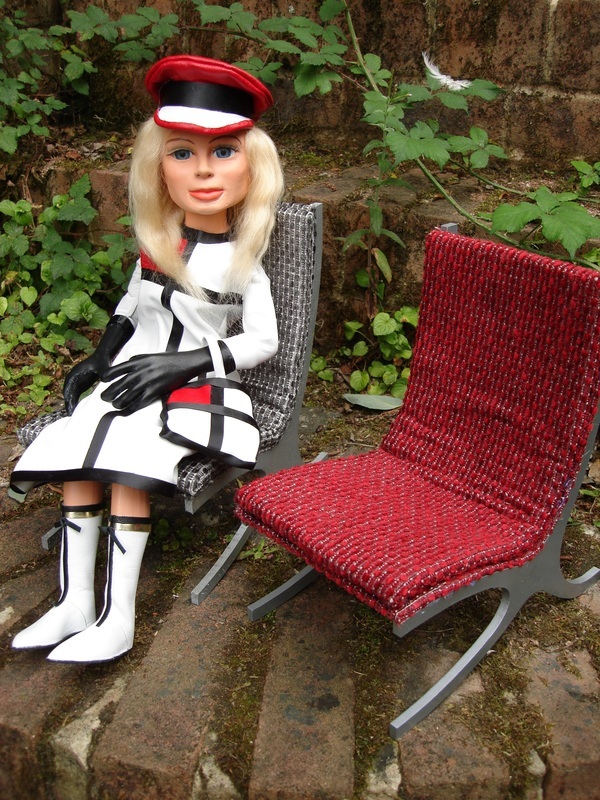 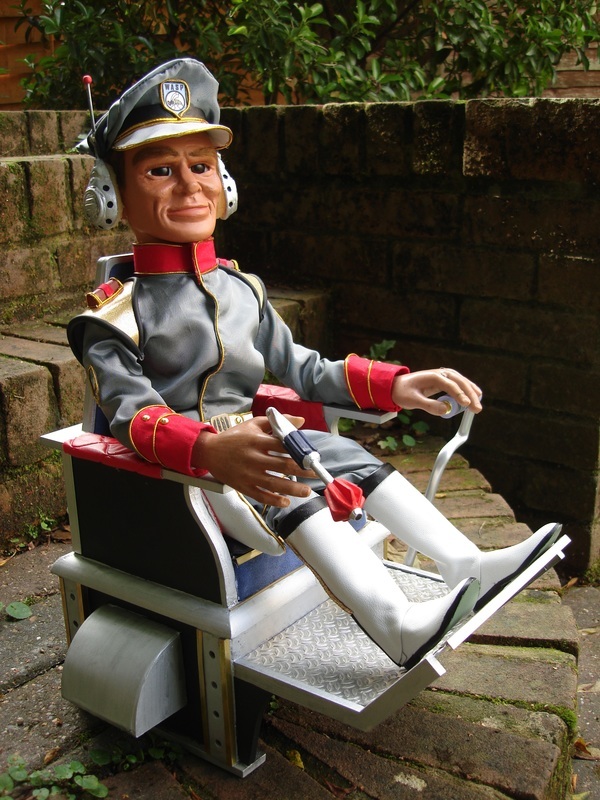 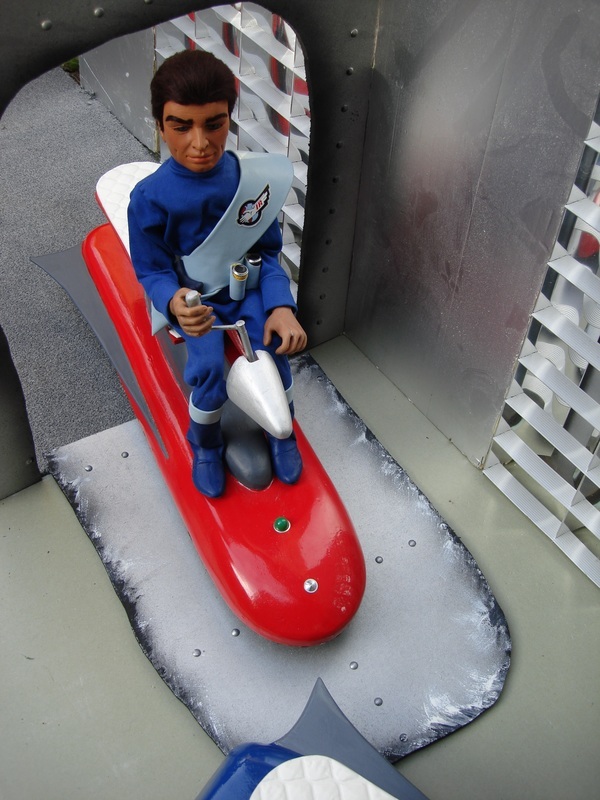 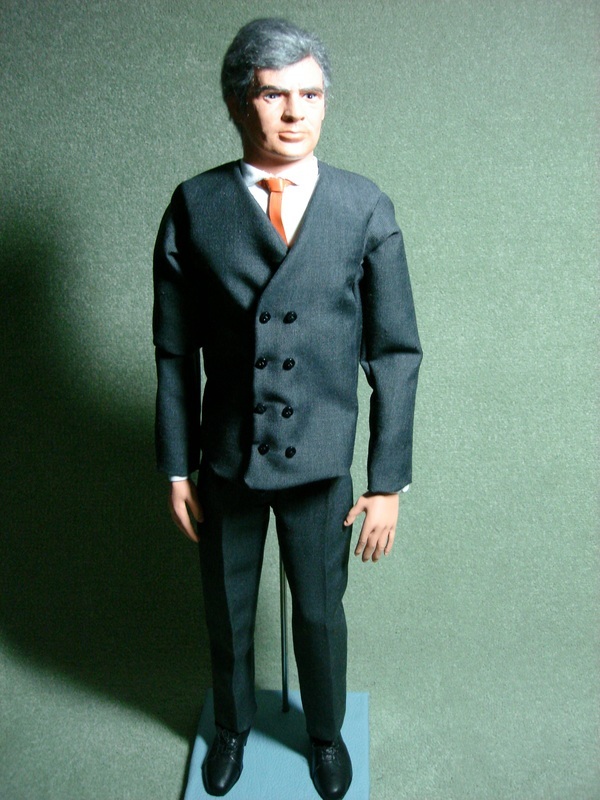 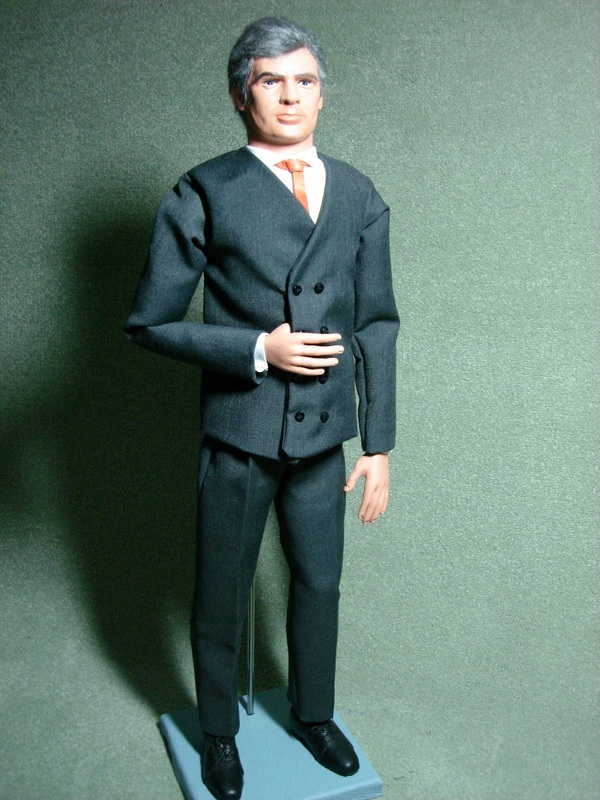 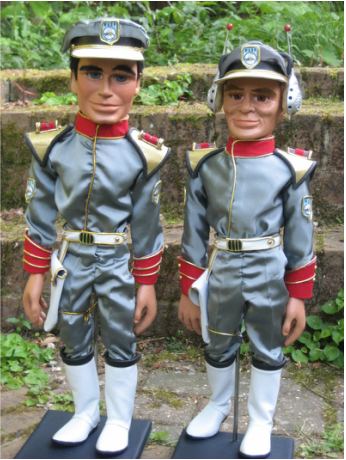 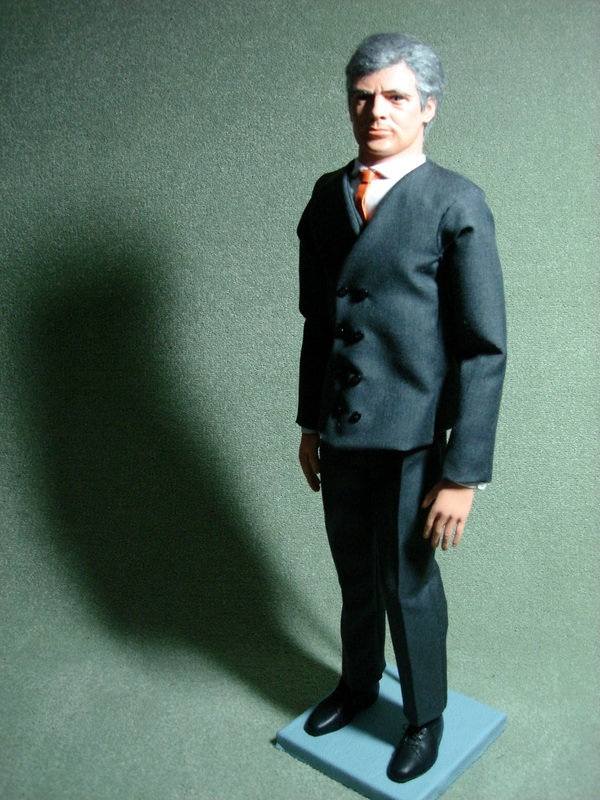 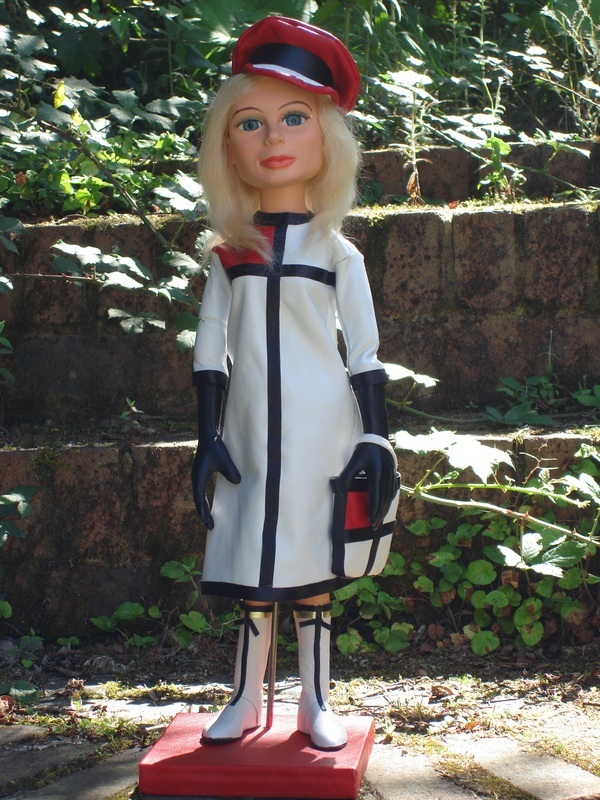 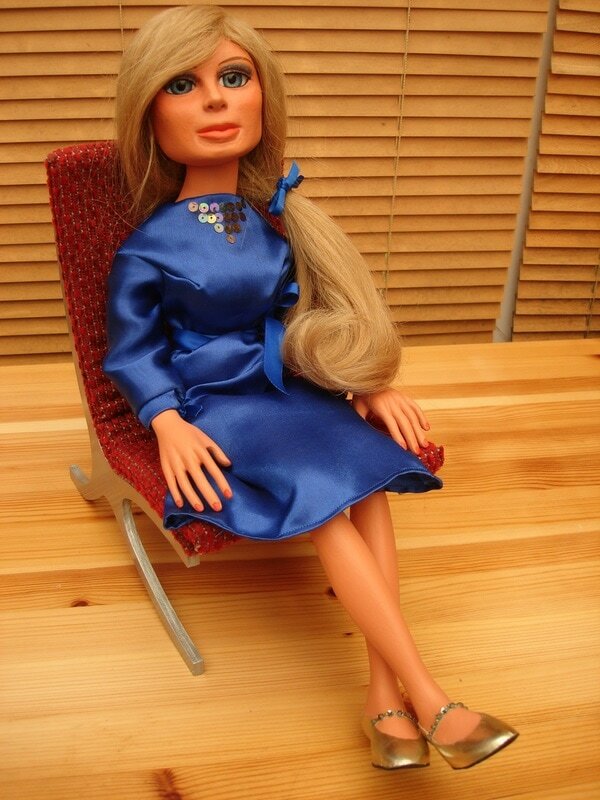 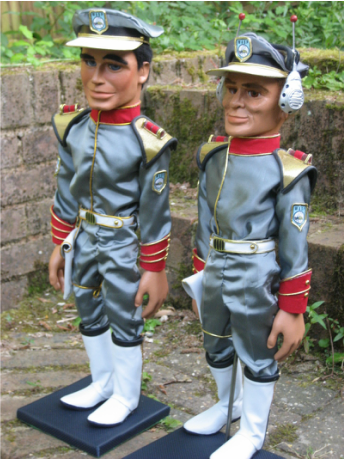 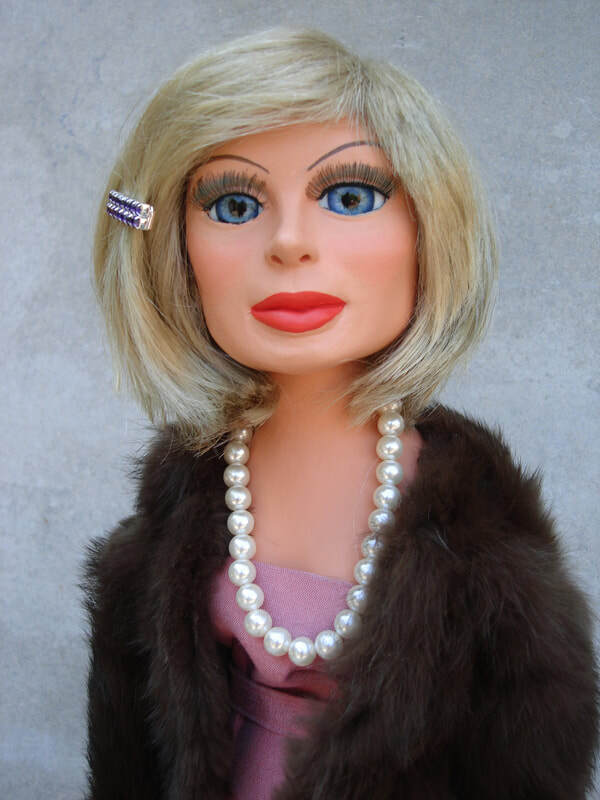 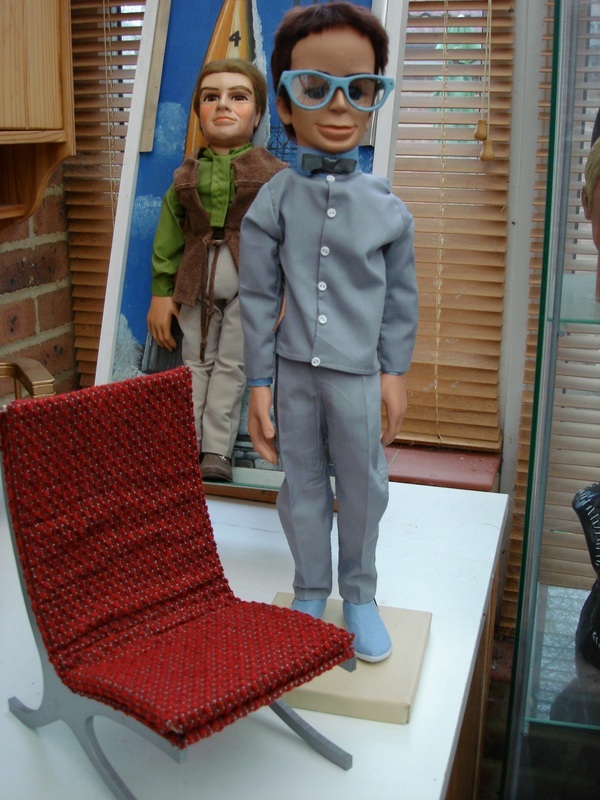 PLUS A UNIQUE BESPOKE SCULPTING SERVICE - YOU CAN BE IMMORTALISED AS A SUPERMARIONATION-STYLE PUPPET! 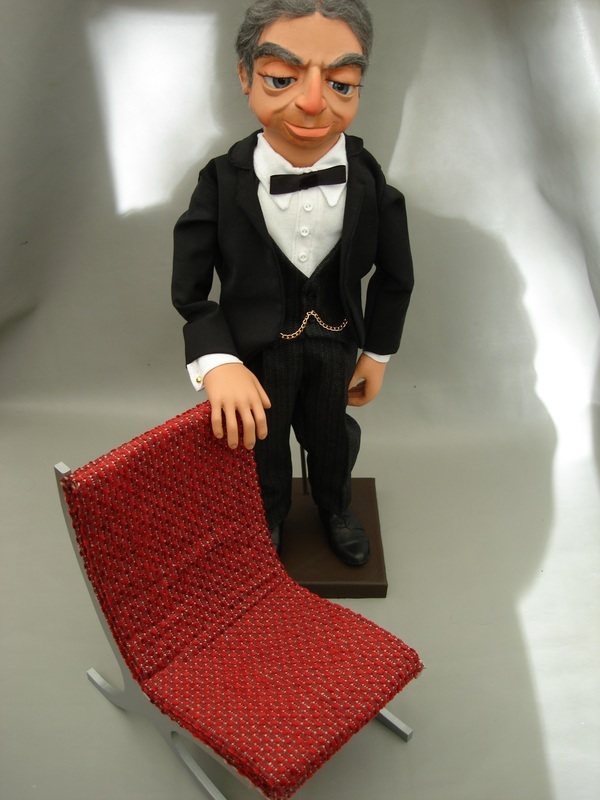 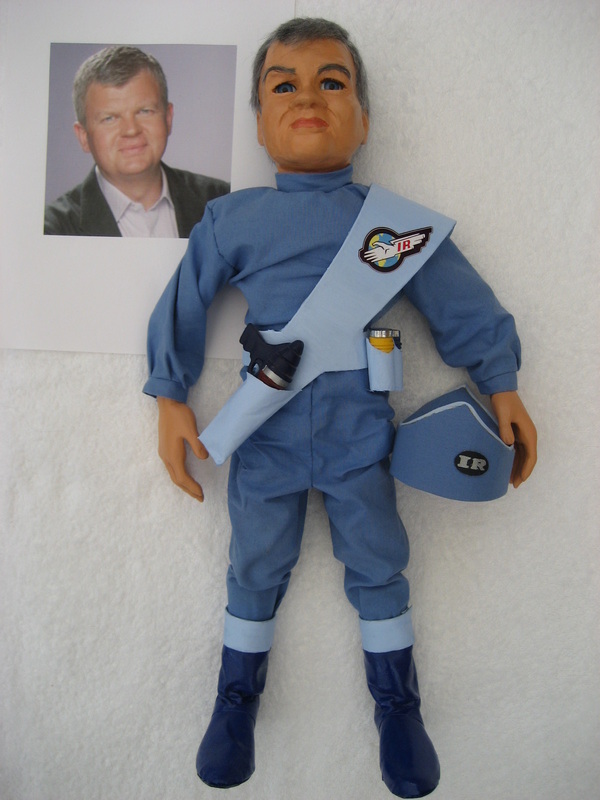 Custom-sculpt Adrian Chiles SUPERMARIONATION puppet which I created for ITV's Daybreak show in January 2011. 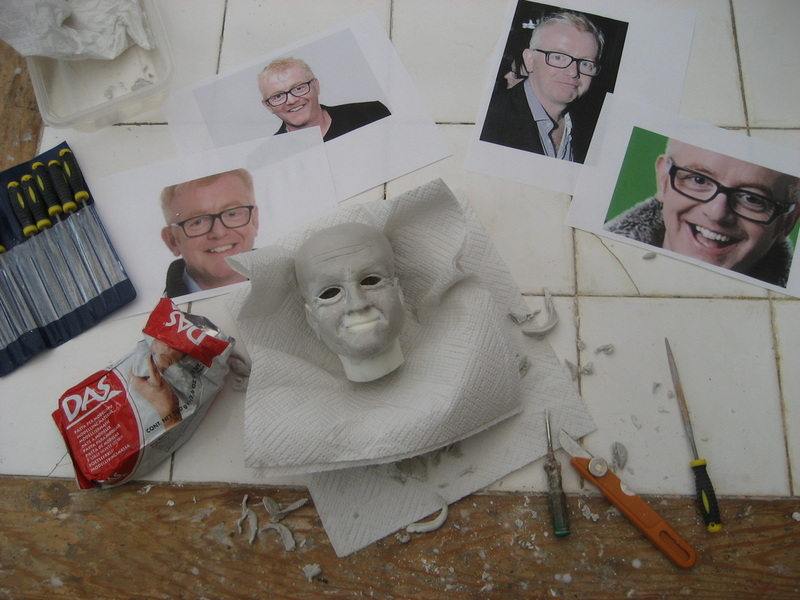 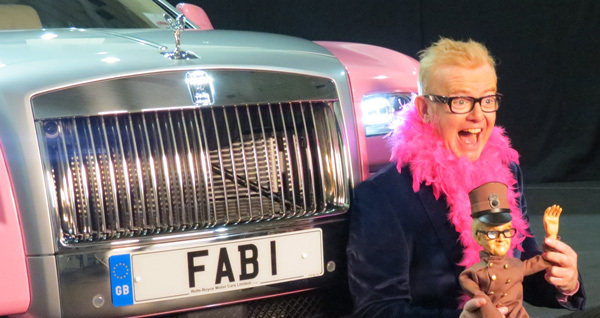 Custom-sculpt 'Chris Evans Parker', made by me for FAB 1 Million, April 2013. 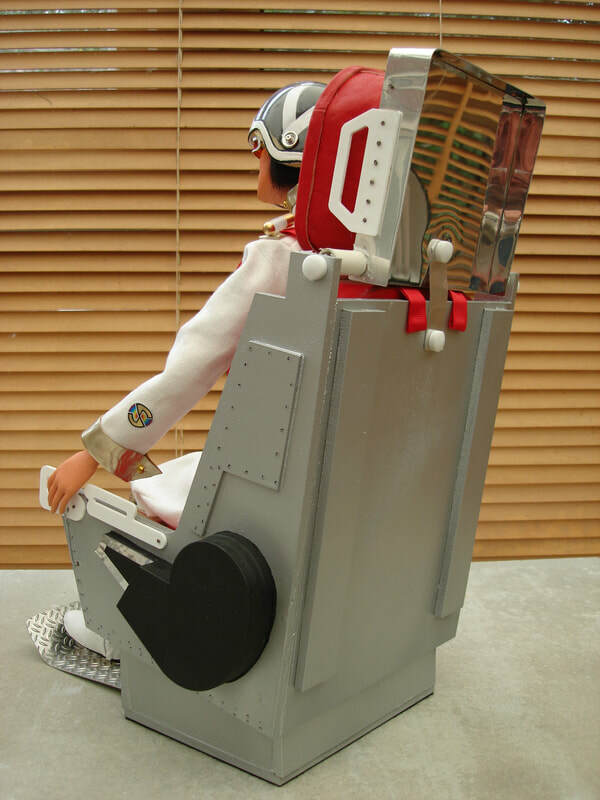 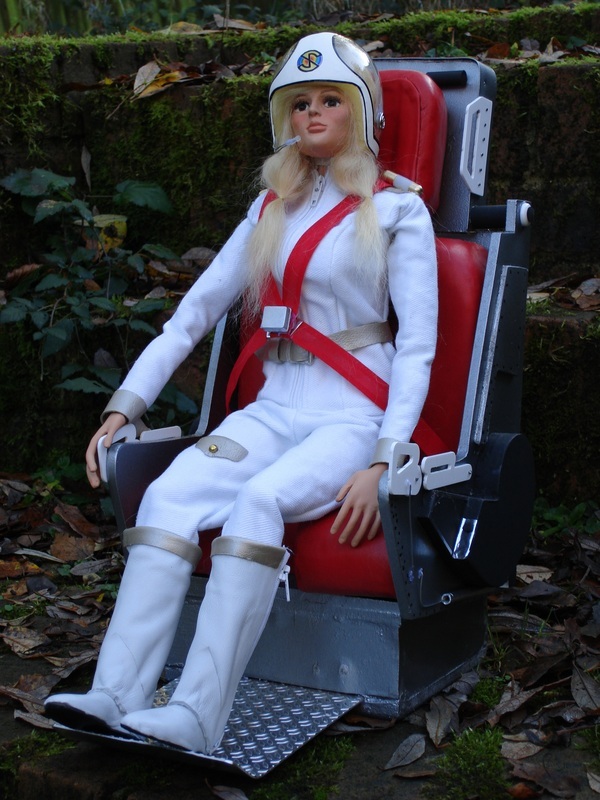 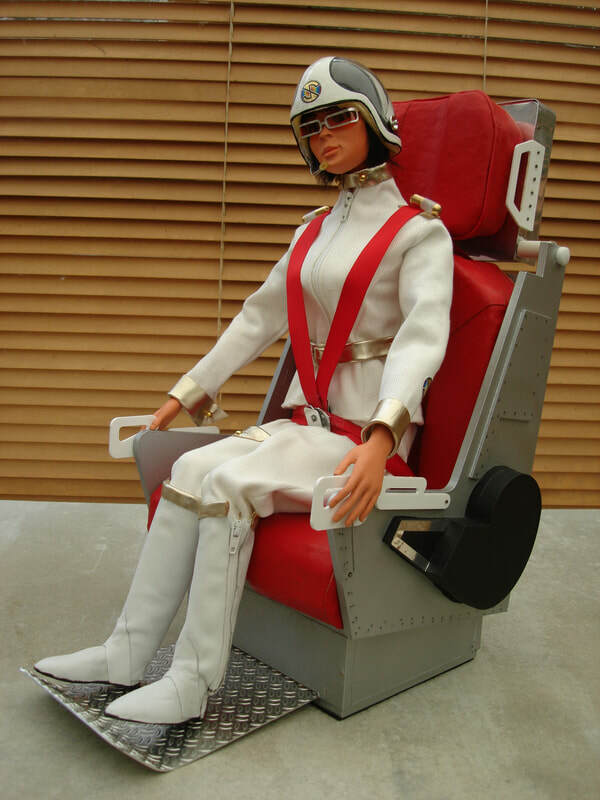 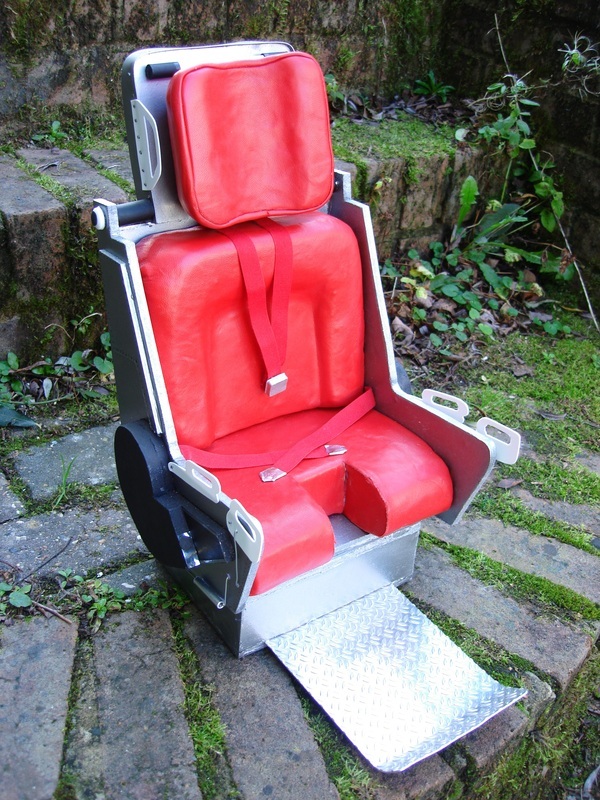 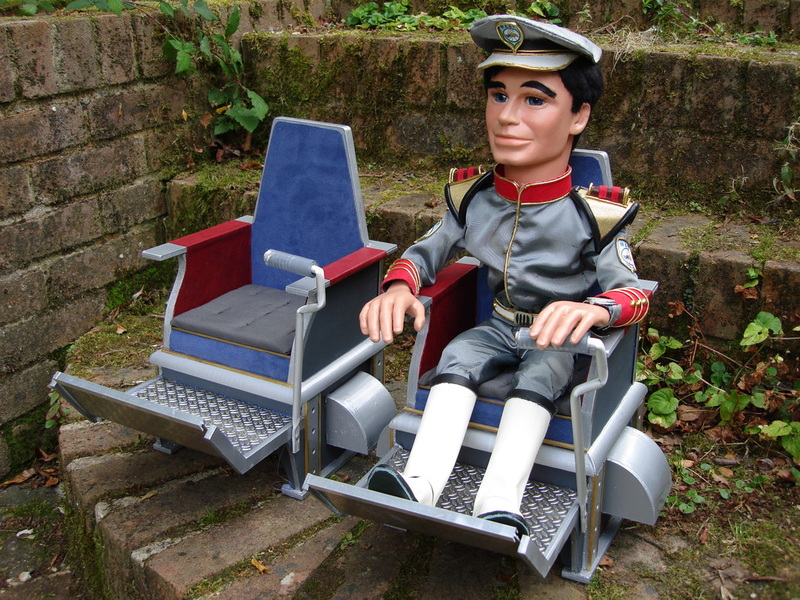 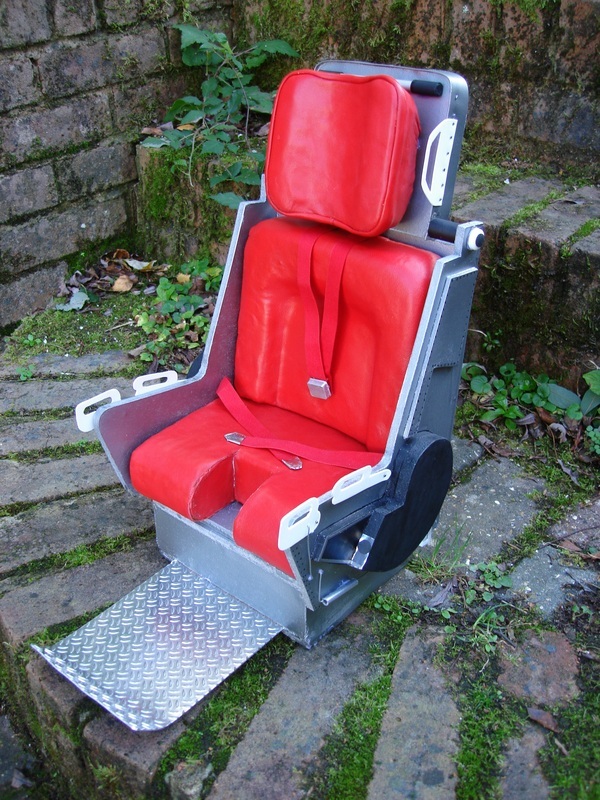 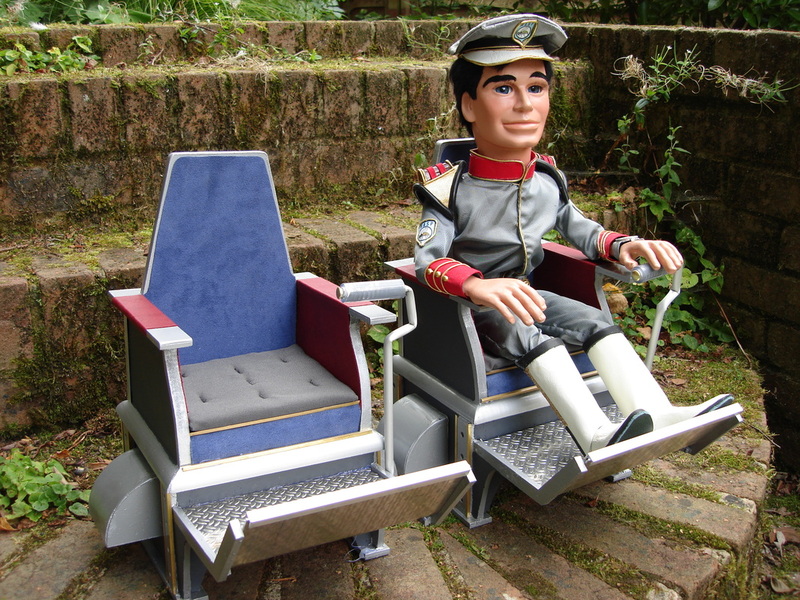 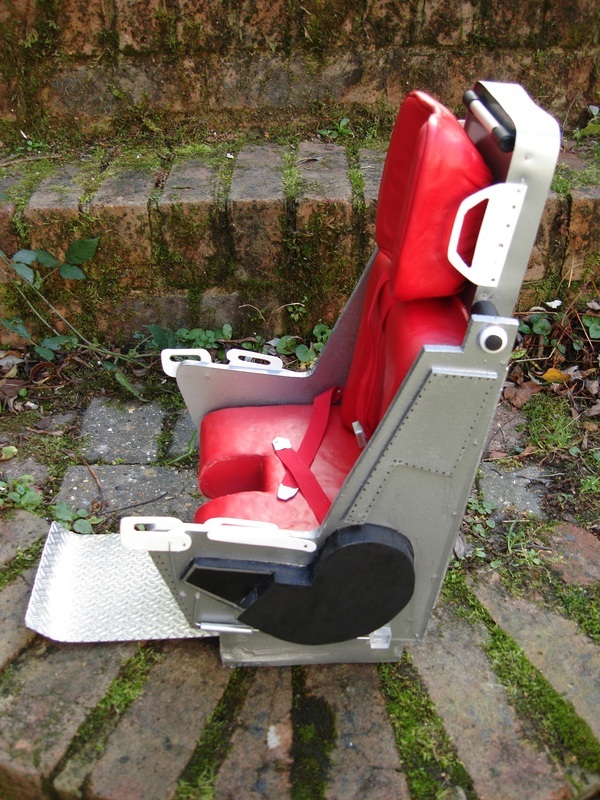 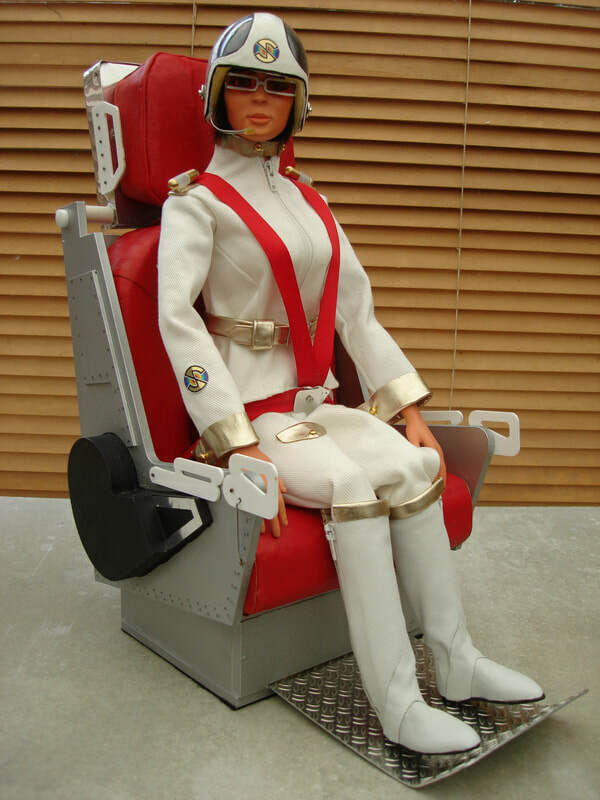 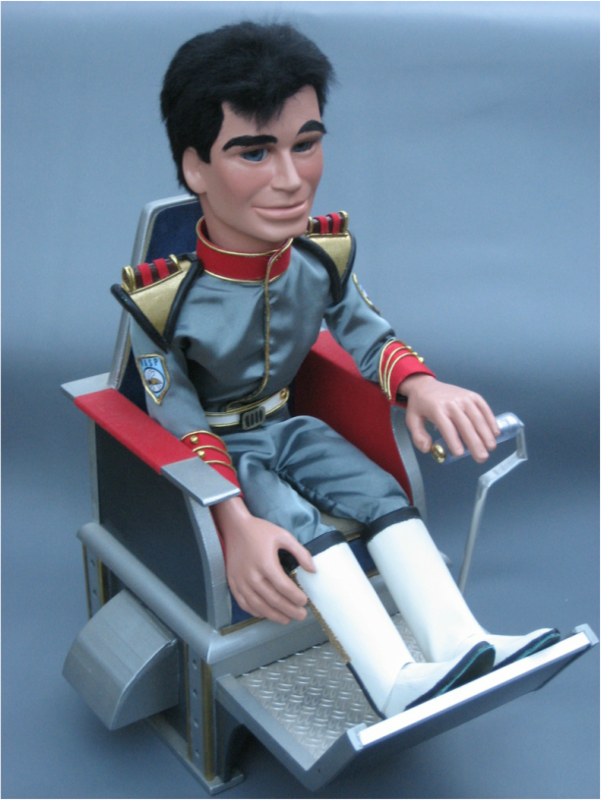 Fully finished Puppet-Scale SUPERMARIONATION INJECTOR SEAT (1 OF) £400 plus shipping. 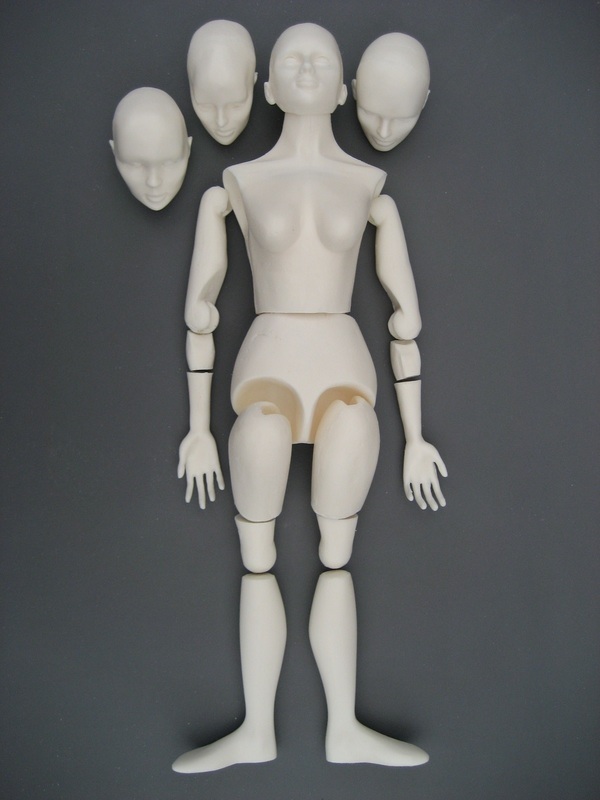 Puppet-scale props available in kit form. 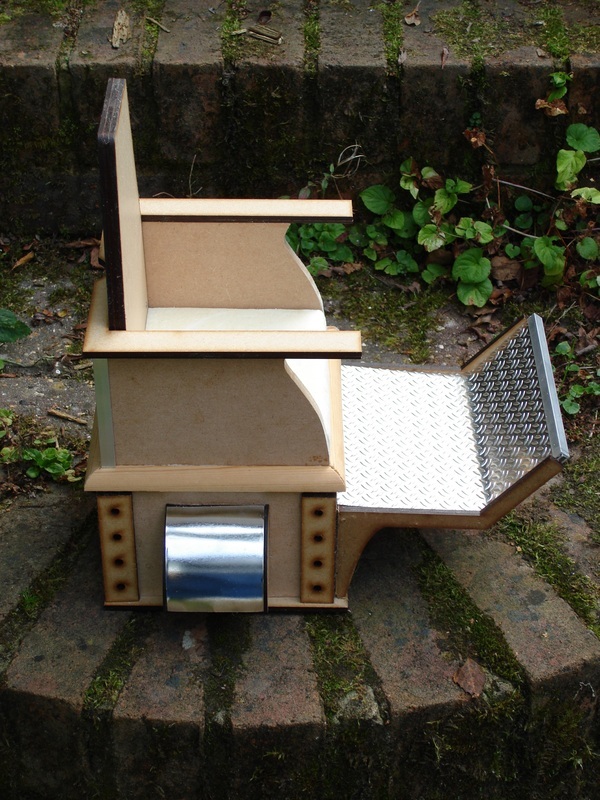 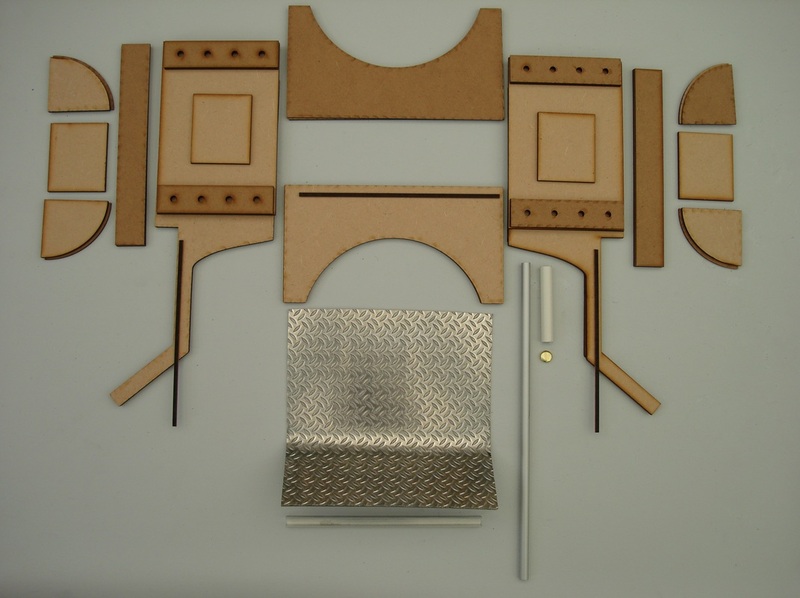 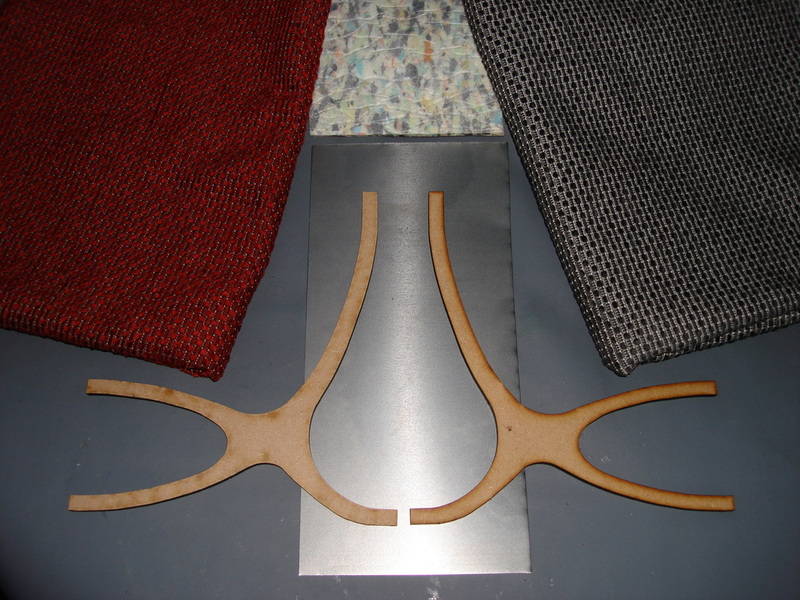 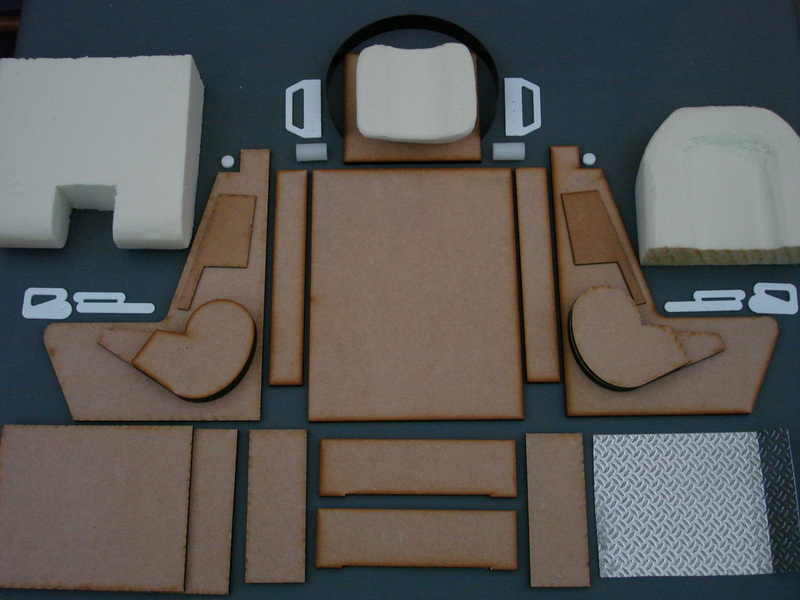 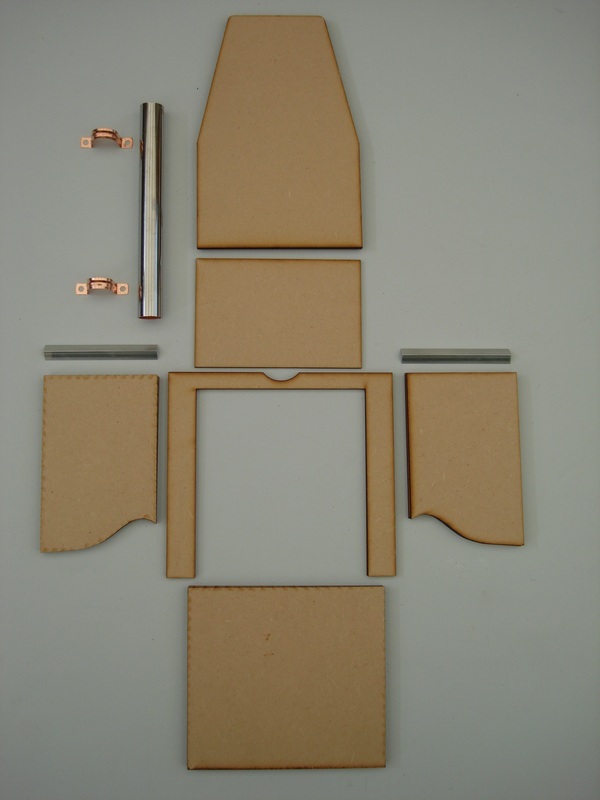 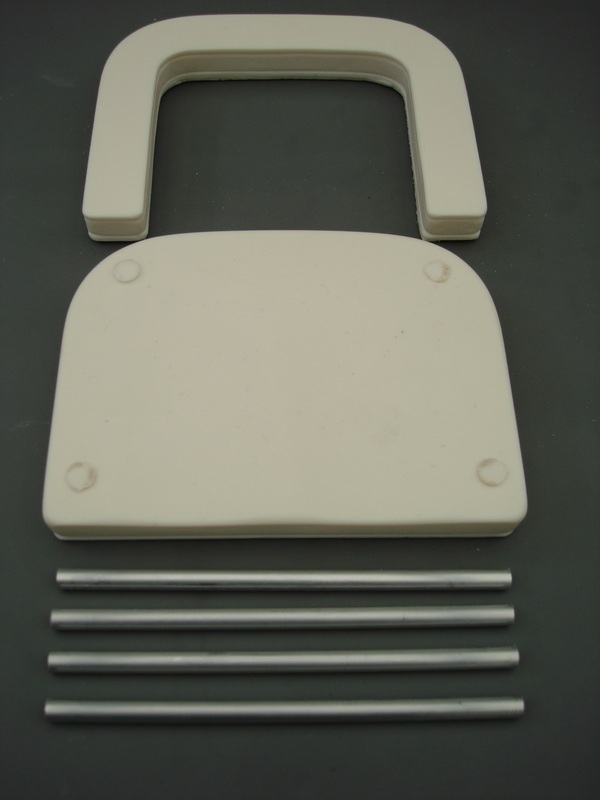 This puppet-scale Injector Seat KIT is laser-cut for 100% accuracy and is now available with metal barley-pattern footplate pre-shaped to fit plus aluminium accessories. 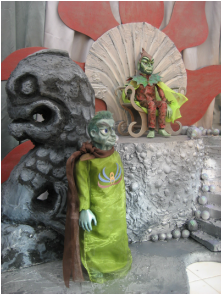 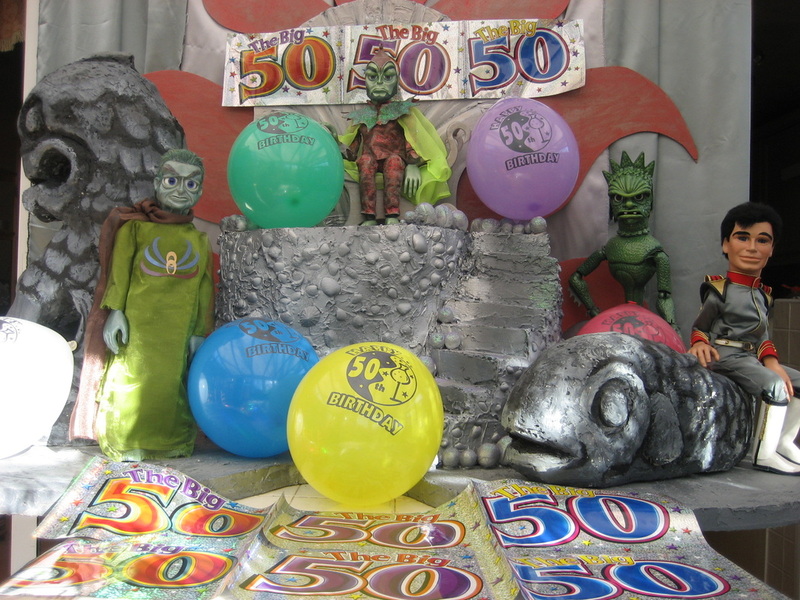 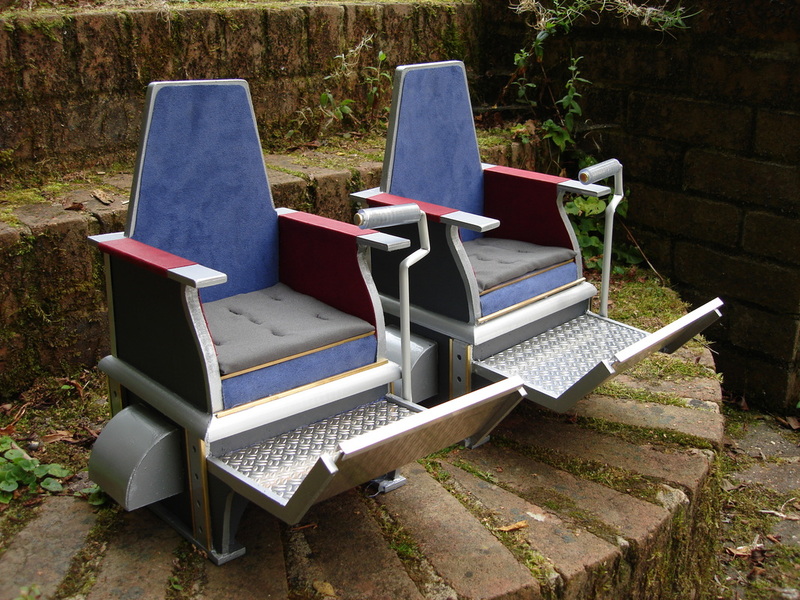 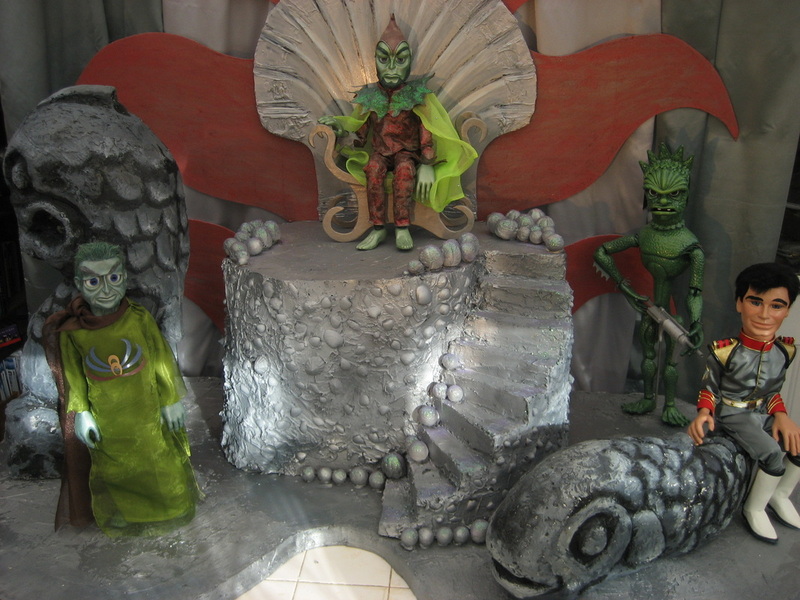 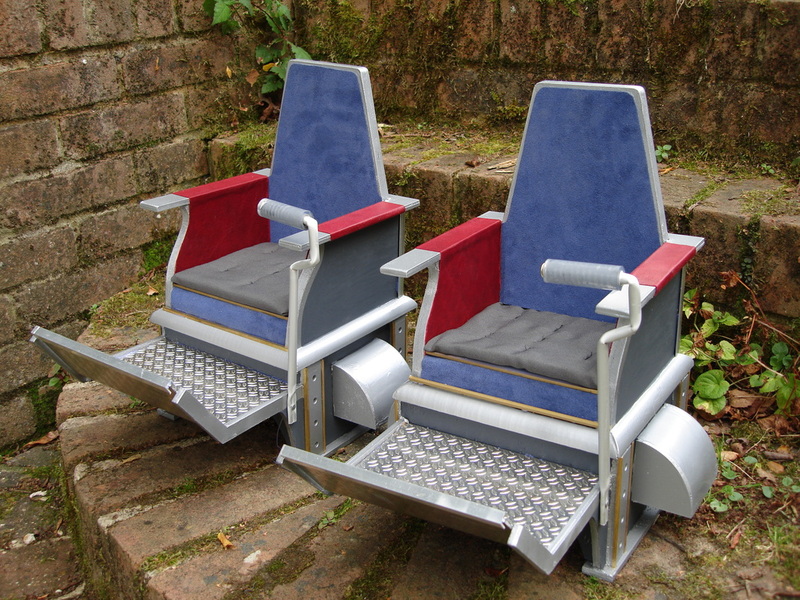 Titan's Throne Room Set INCLUDING PUPPETS £4,000 plus shipping. 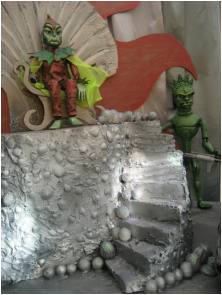 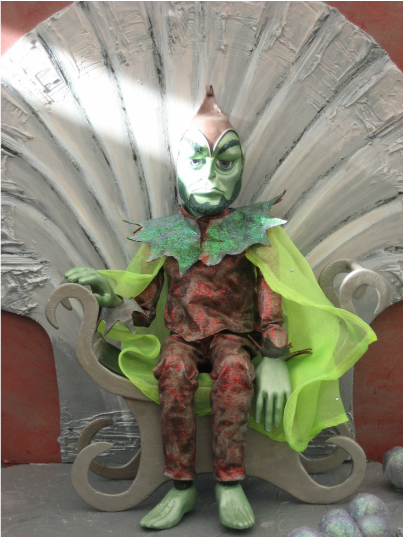 Titan's Throne Room SET ONLY (puppets not included) £1,500 plus shipping. 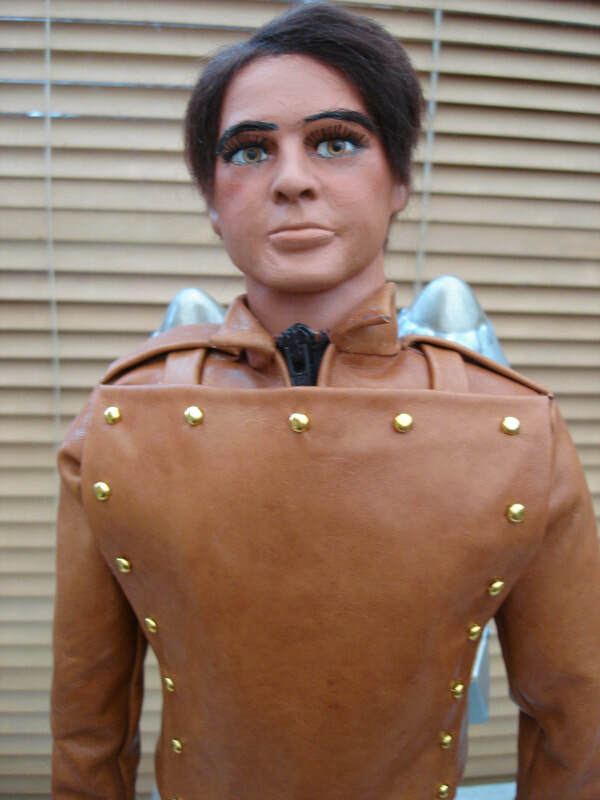 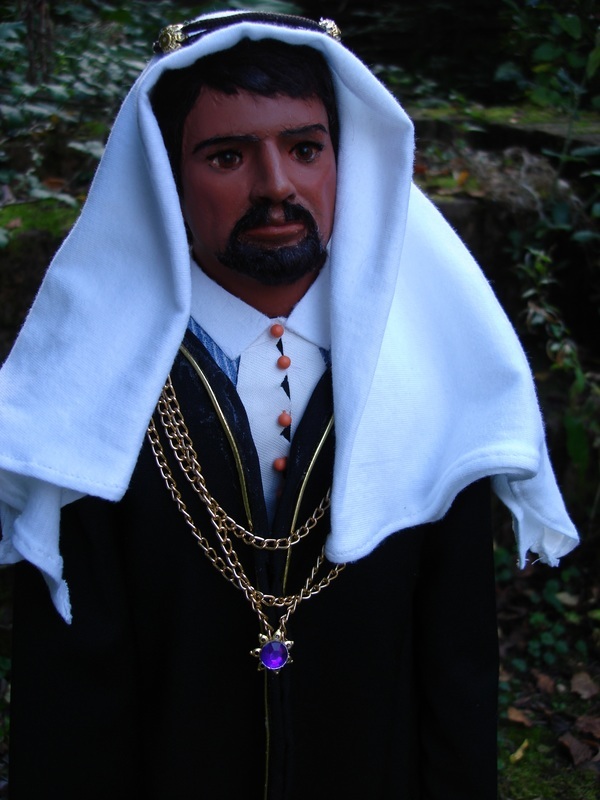 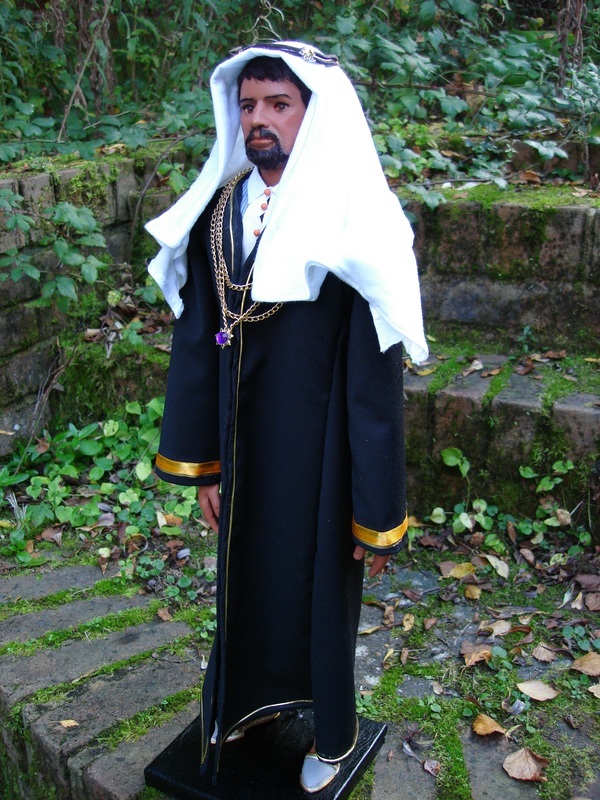 Completed Virgil replica puppet with tilting rocket painting/slide (hand painted in oils) £2,000 plus shipping. 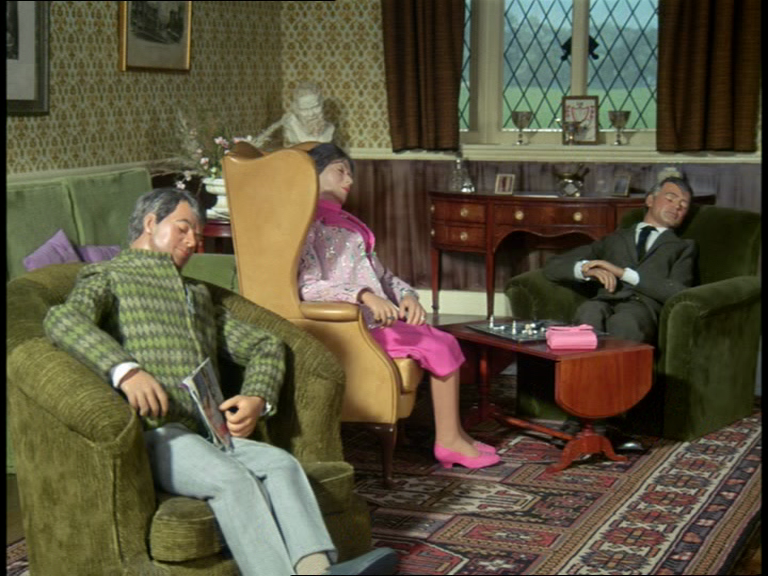 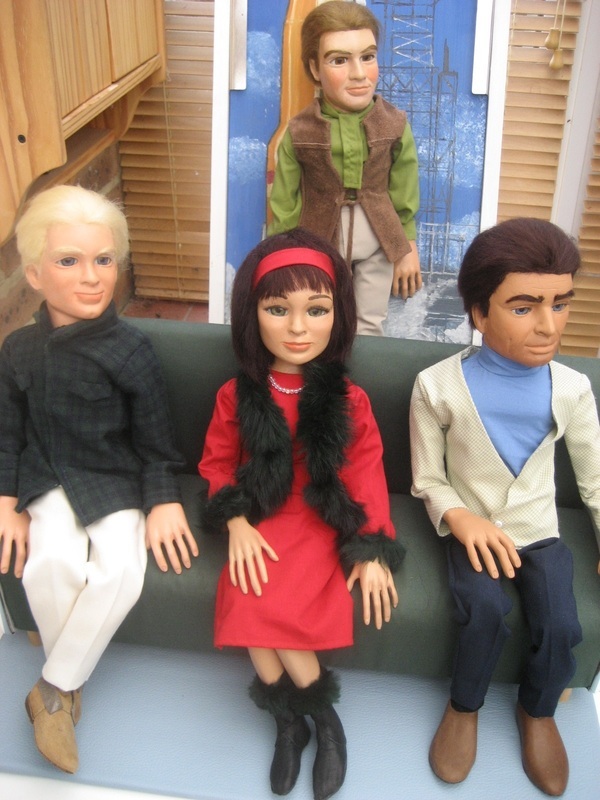 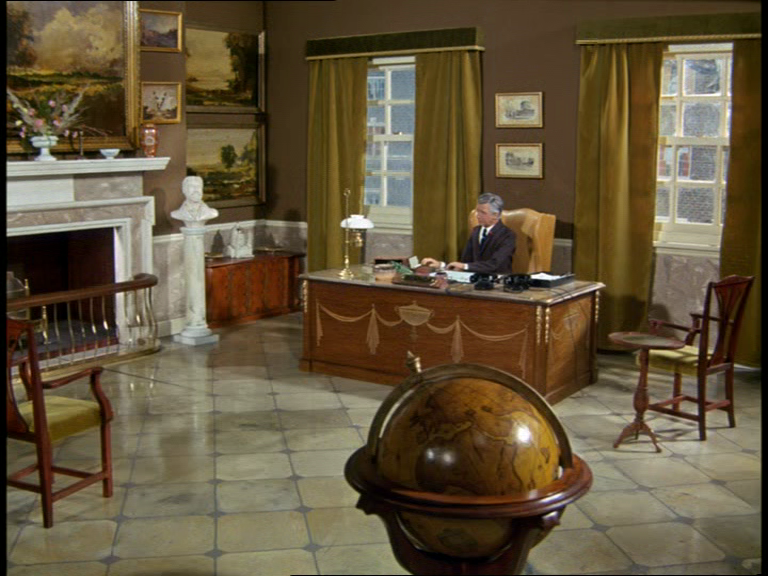 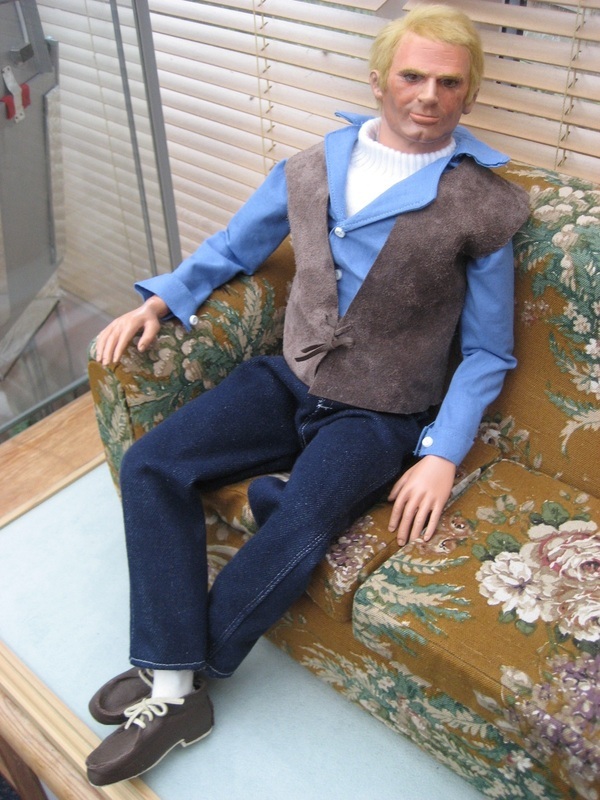 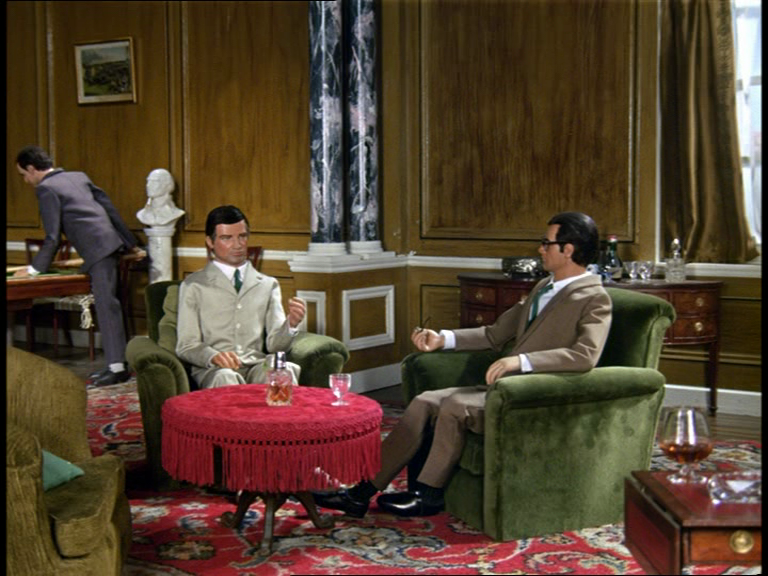 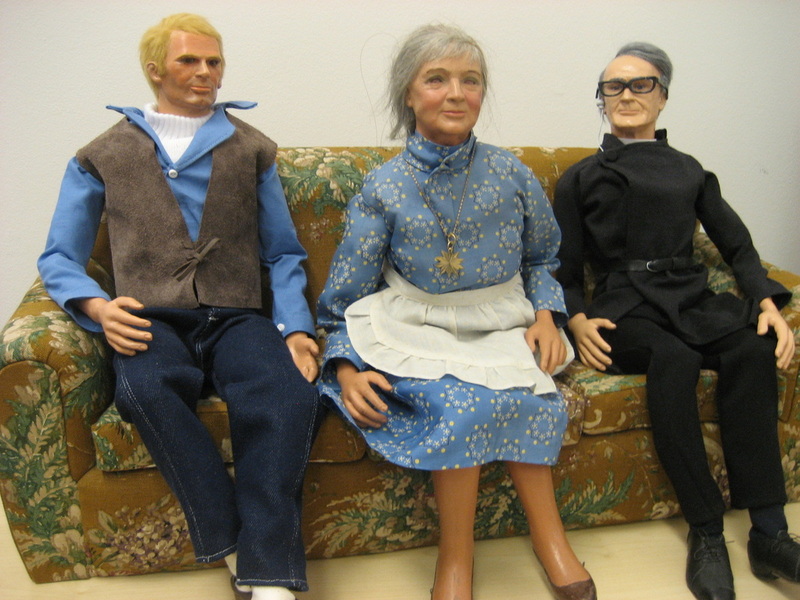 Completed Alan, Tin-Tin and Scott puppets (civilian clothes) and replica Tracy lounge/TB3 sofa £2,500 plus shipping. 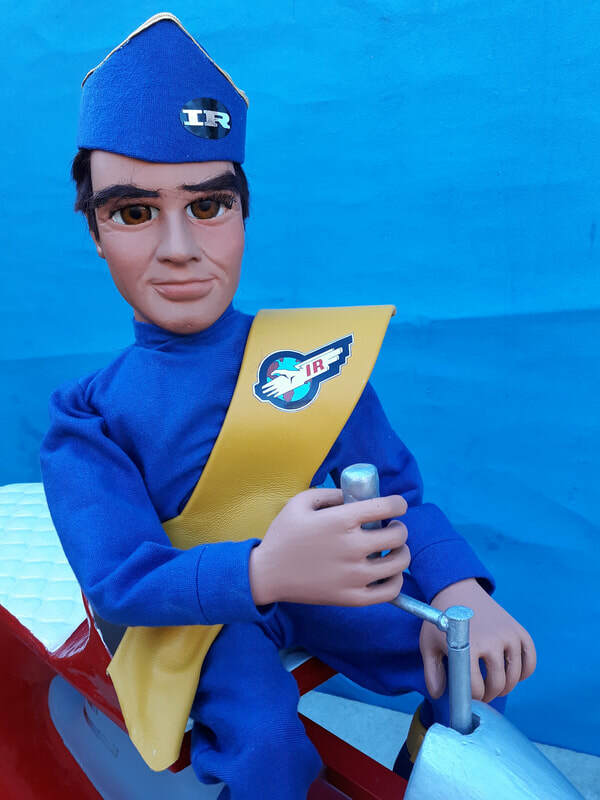 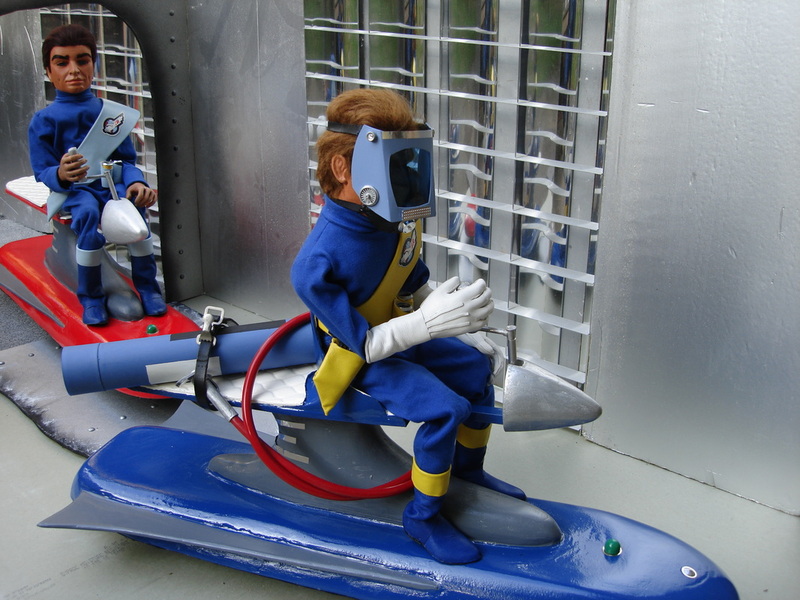 Completed Steve Zodiac replica puppet and replica puppet-scale Jetmobile. 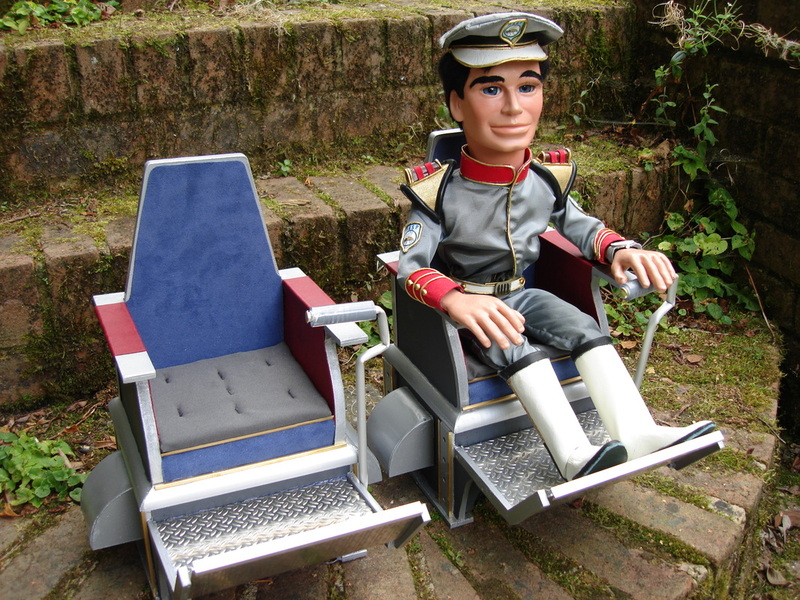 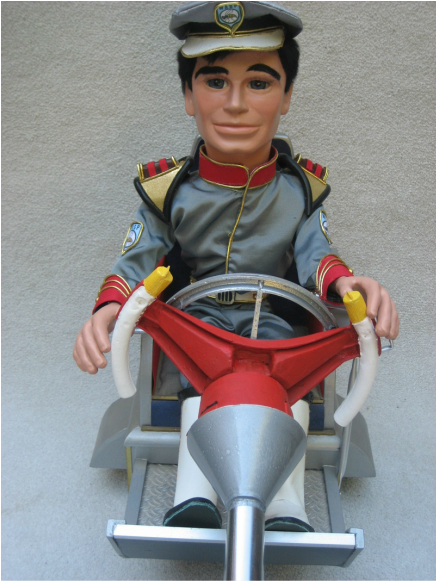 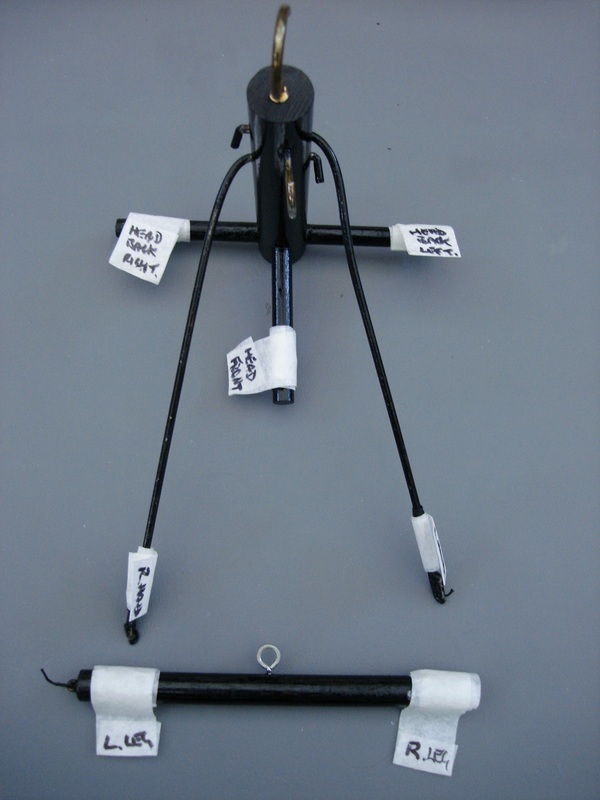 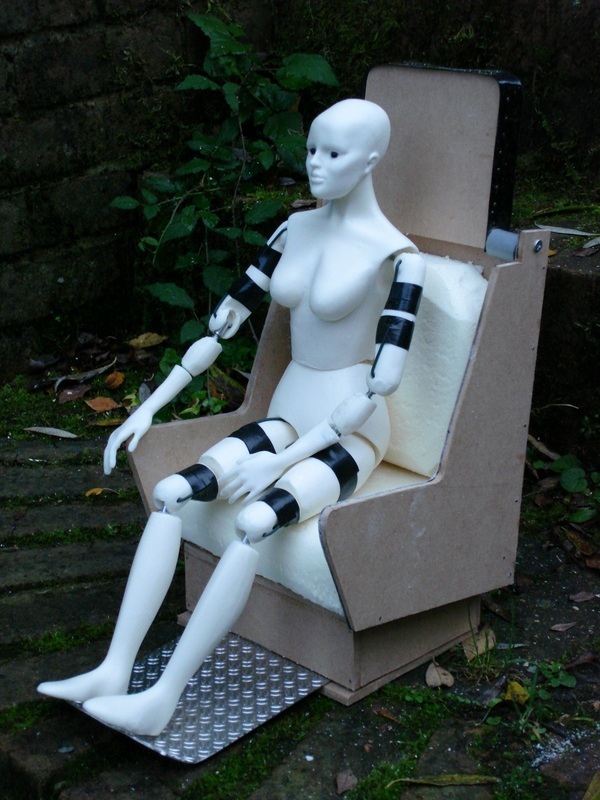 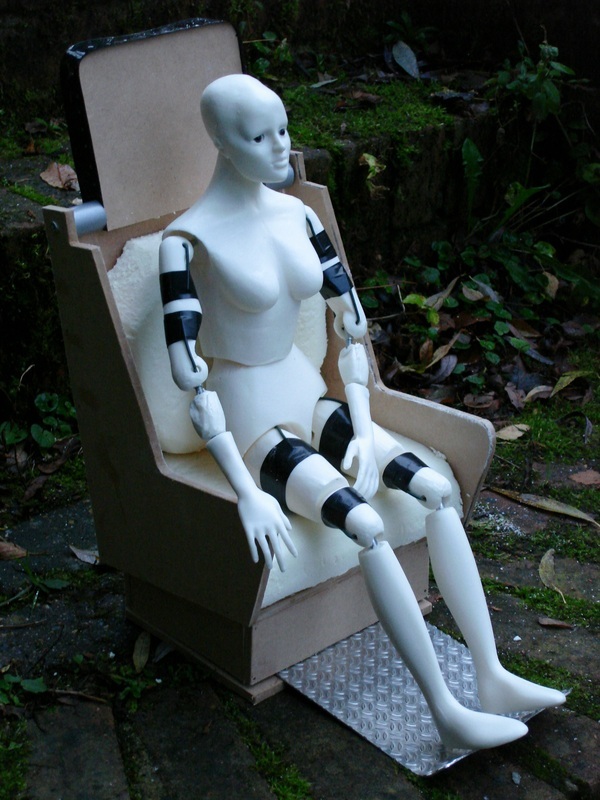 Completed replica Troy Tempest puppet with puppet-scale Injector Seat and Control Wheel assembly. 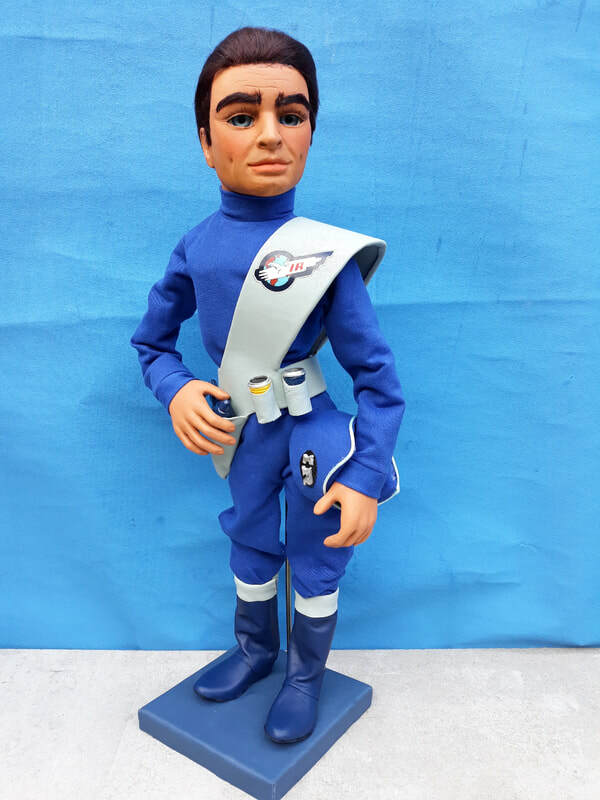 ...to the latest - currently Troy Tempest. 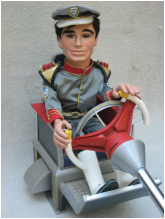 I have adapted and taken moulds from an early 60's toy steering wheel and dashboard in order to replicate the controls for Troy. 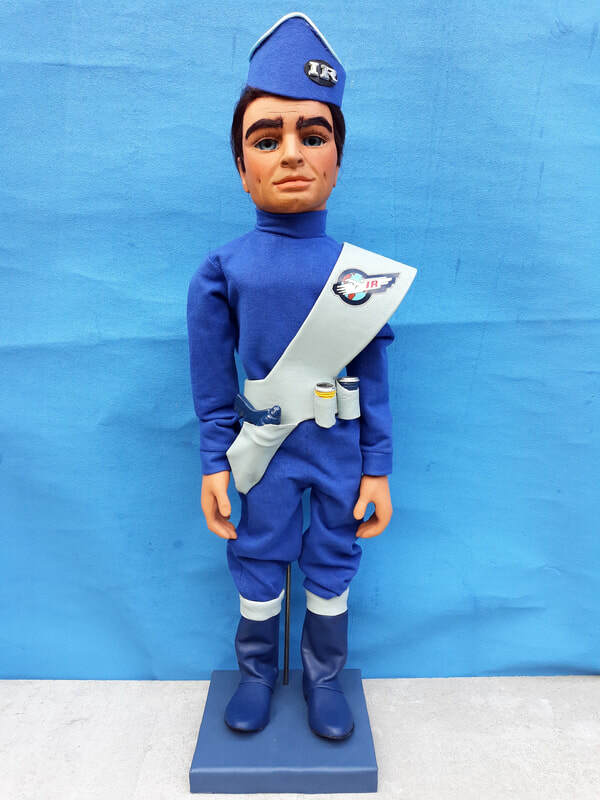 You can see major stages of the Troy build over on my PROJECTS page which is accessed from the Black Toolbar at the top of this page. 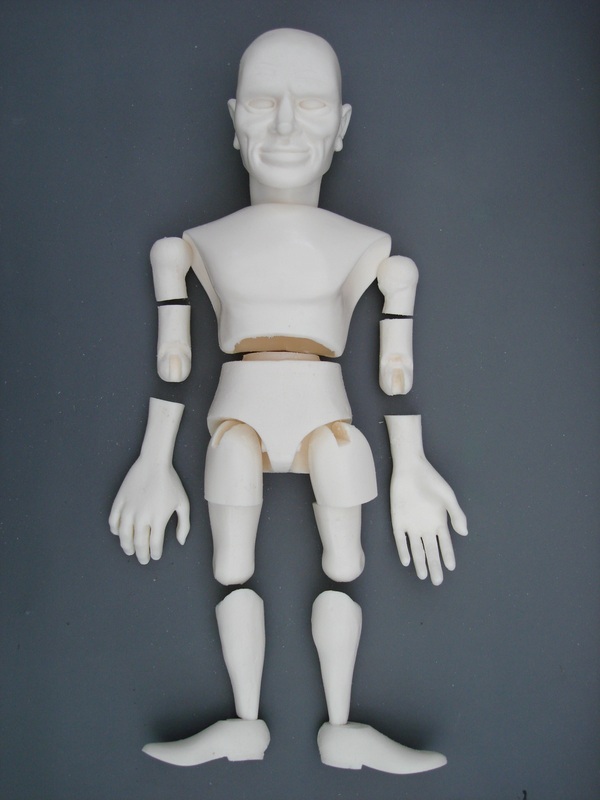 This lovely replica Brains puppet - complete with strings and hand-controller - came to me for some TLC in November 2014. 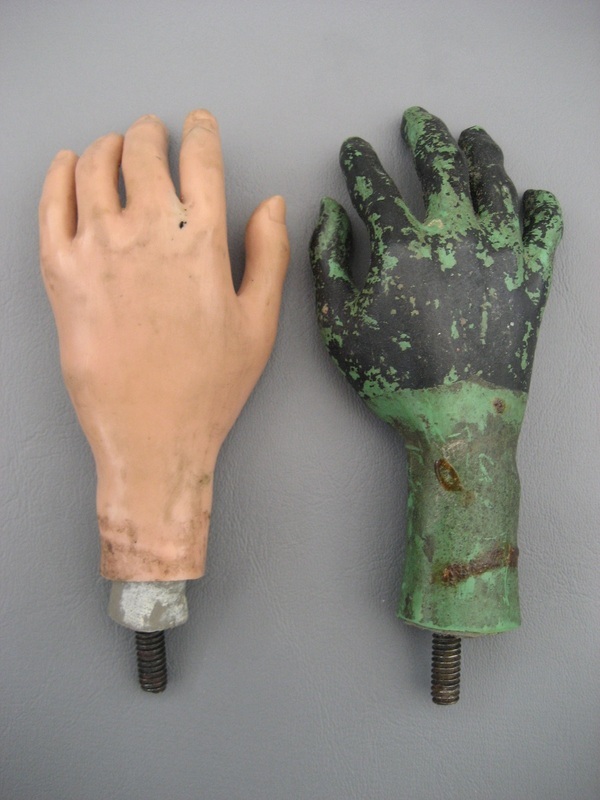 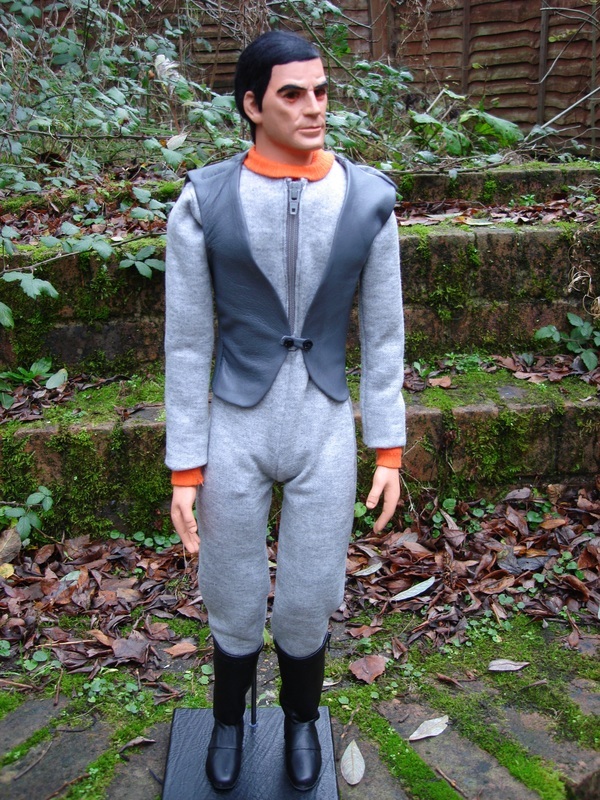 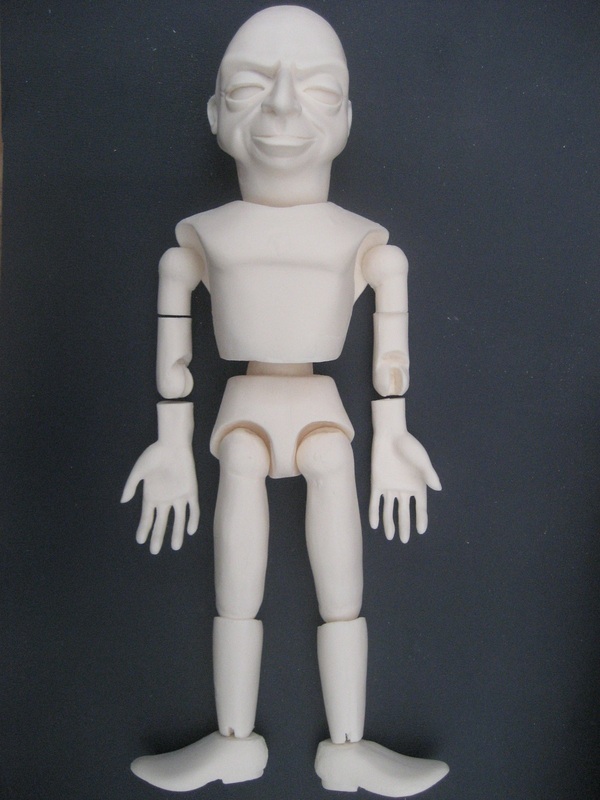 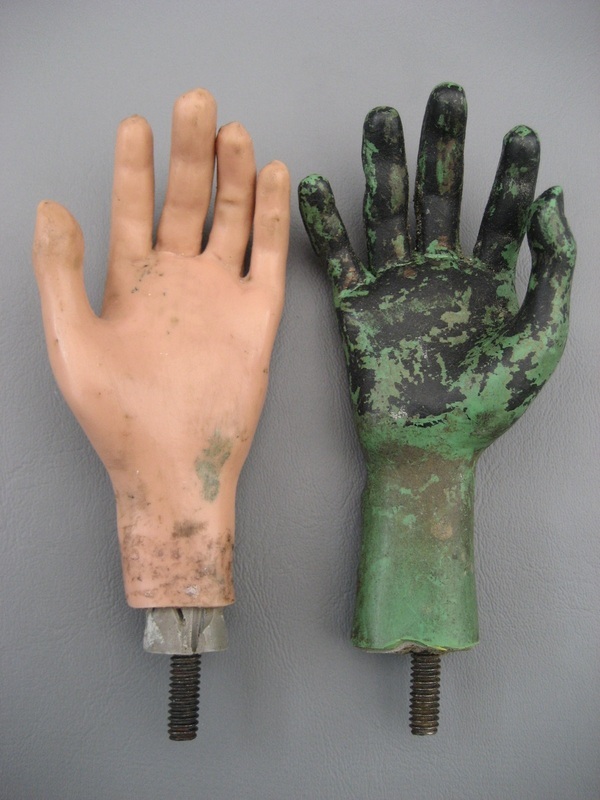 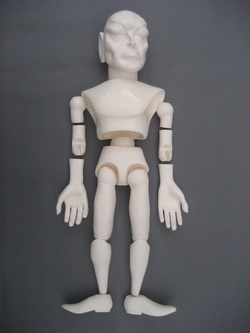 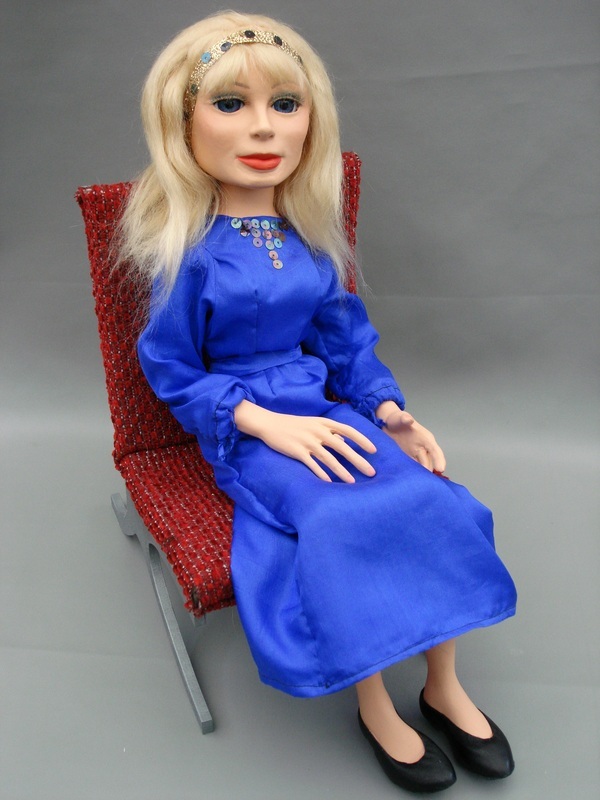 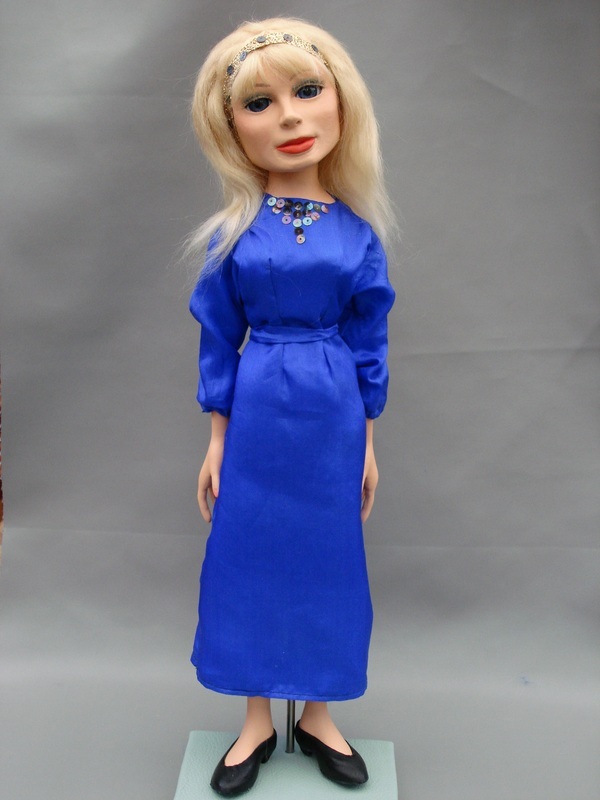 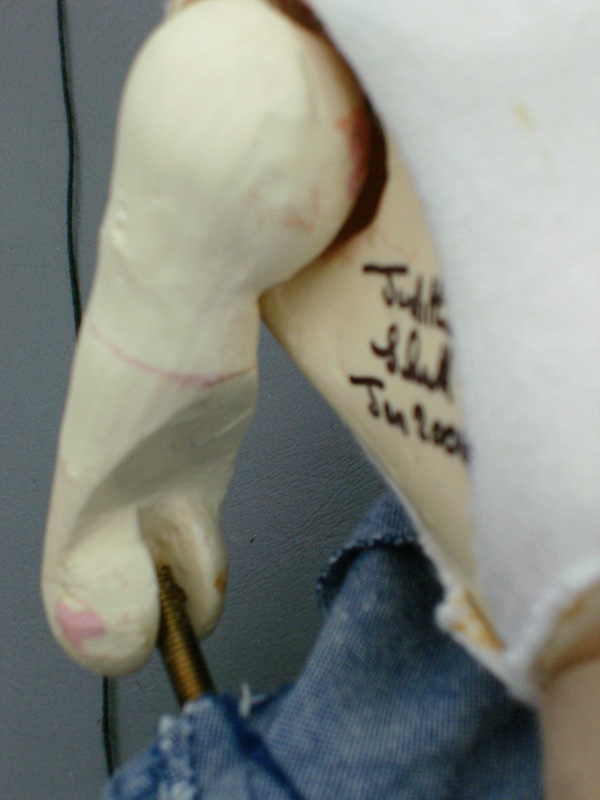 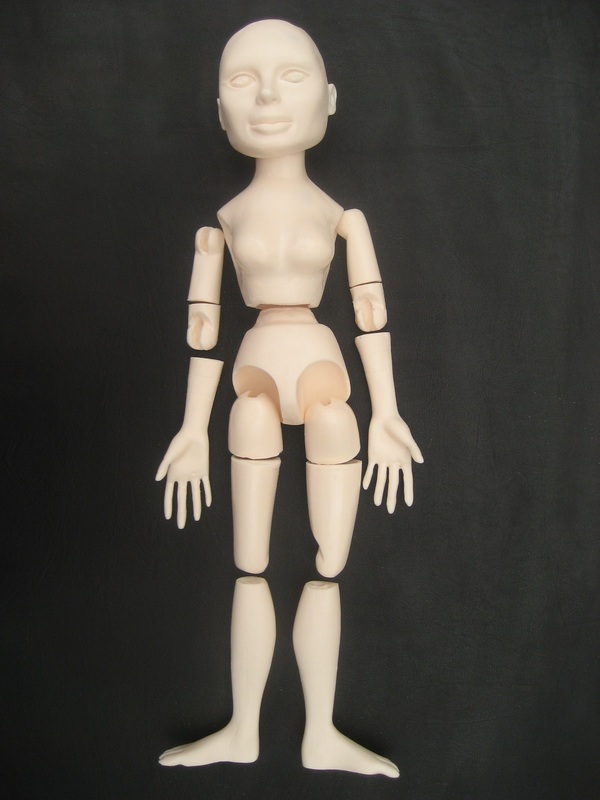 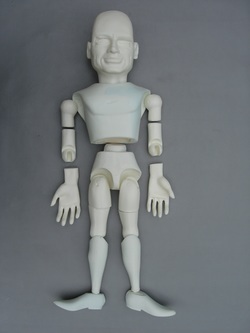 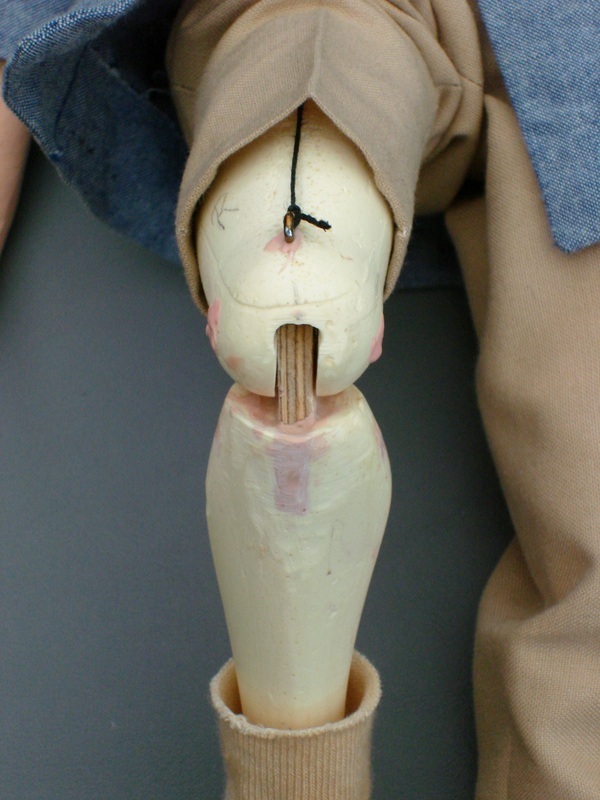 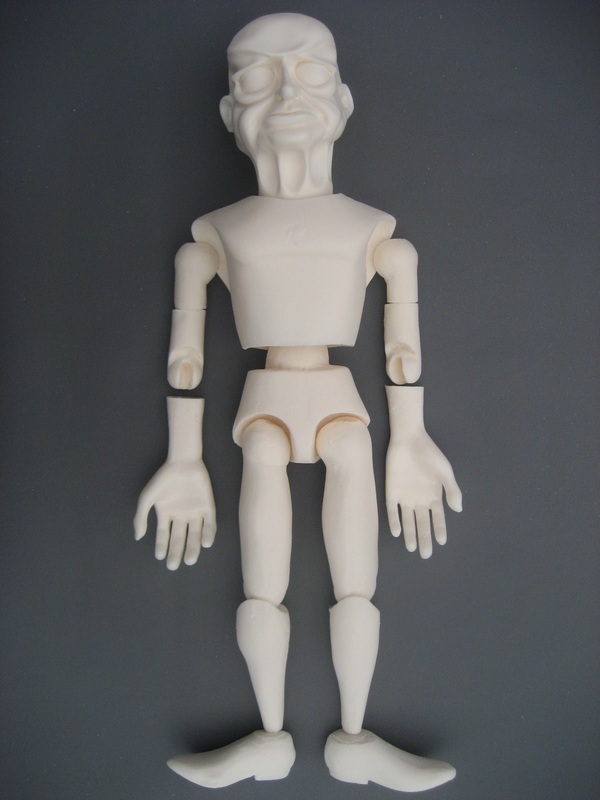 Originally made as a working marionette in 2000 by Judith Shutt, one of the original Supermarionation puppet-makers. 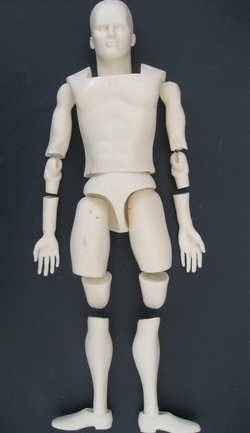 Brains' neck mechanism had become broken, his glasses lost/broken, and his owner had decided to have the strings removed so that Brains could be more easily displayed. 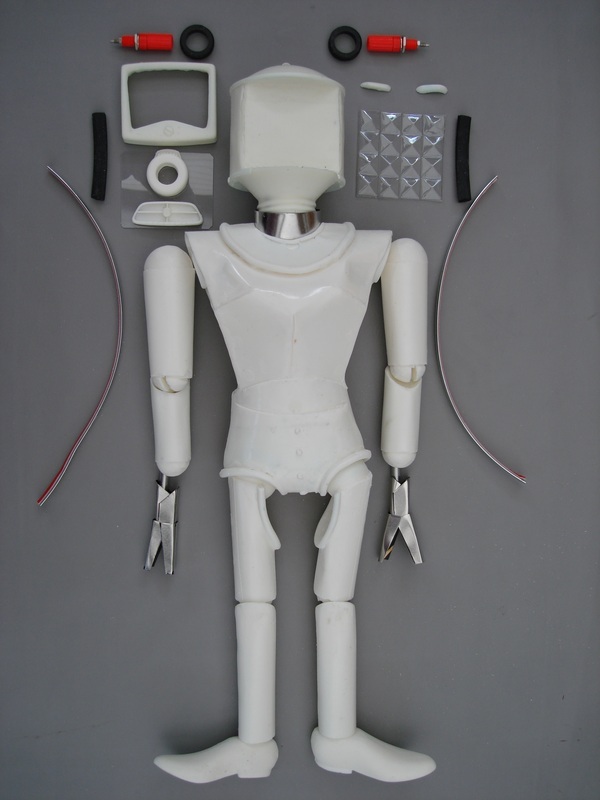 I made Brains a new neck mechanism that works around the original, leaving everything original in place and unchanged so that he could easily be restored to being a working marionette at any time in the future. 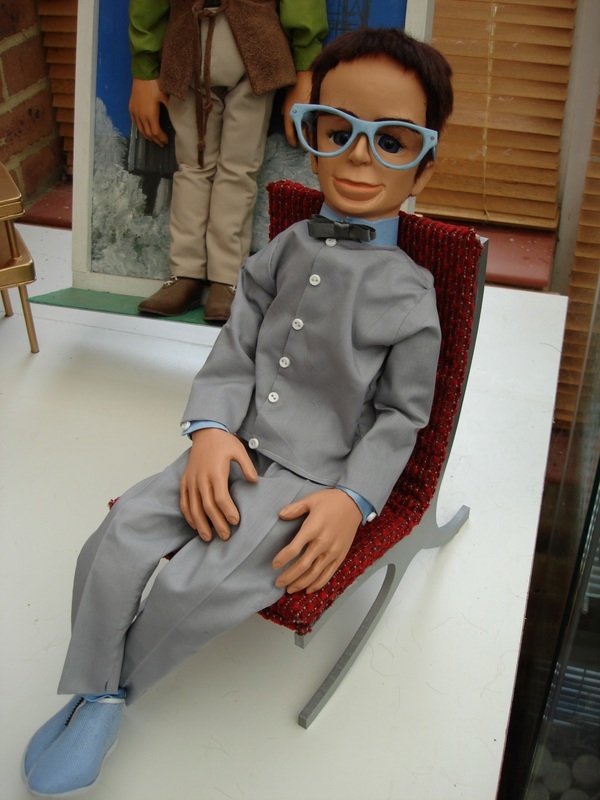 With new glasses and unencumbered by strings Brains is now ready to be proudly displayed posed on a seat in his owner's home. 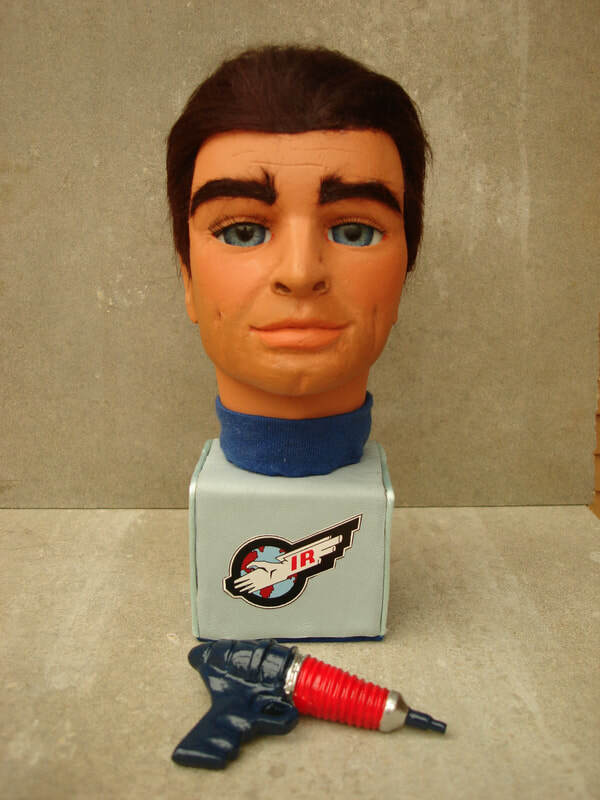 ...AND HERE'S ONE BEING USED AS A PROP ON JEFF'S DESK. 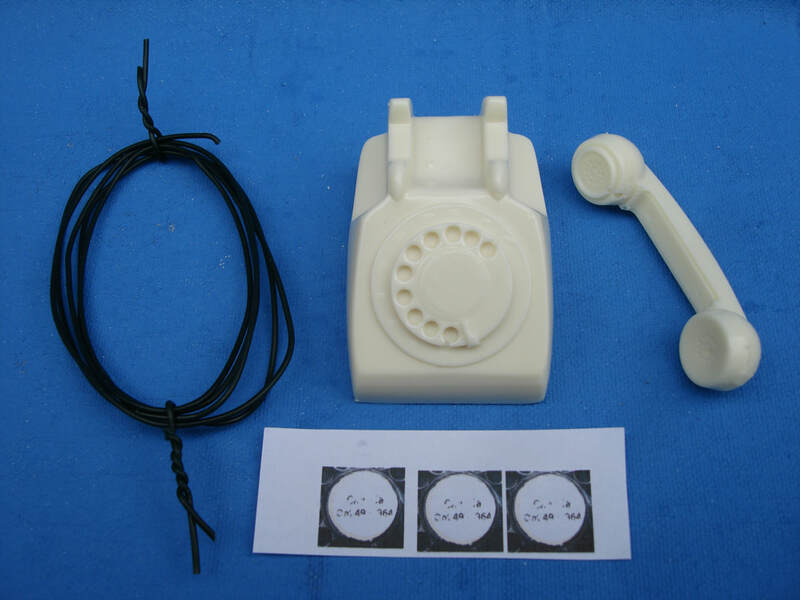 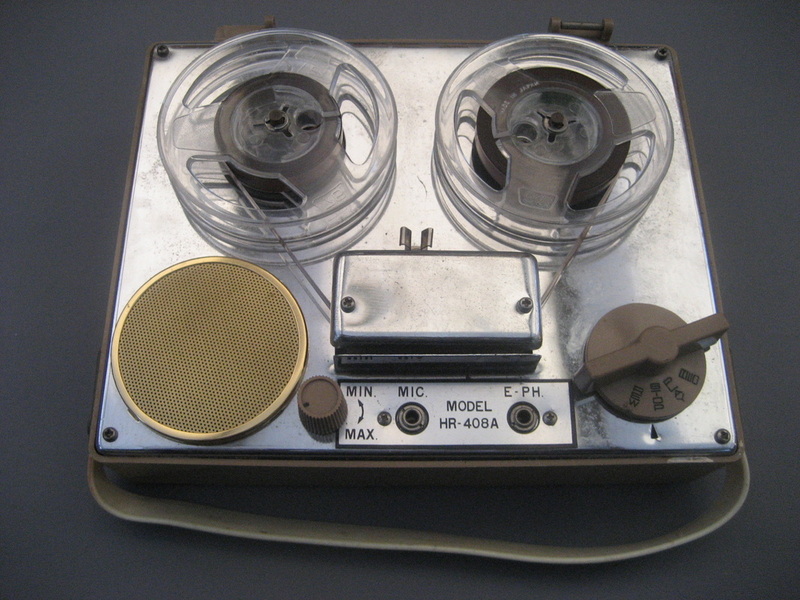 Here's a link to my video of this replica working; the lights blink, and the audio comes from the battery-operated tape recorder. 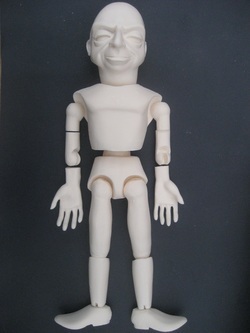 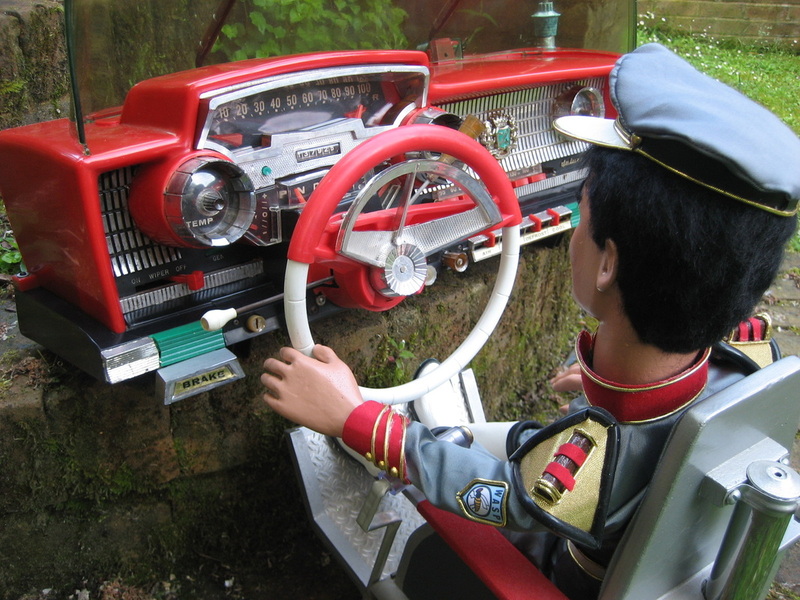 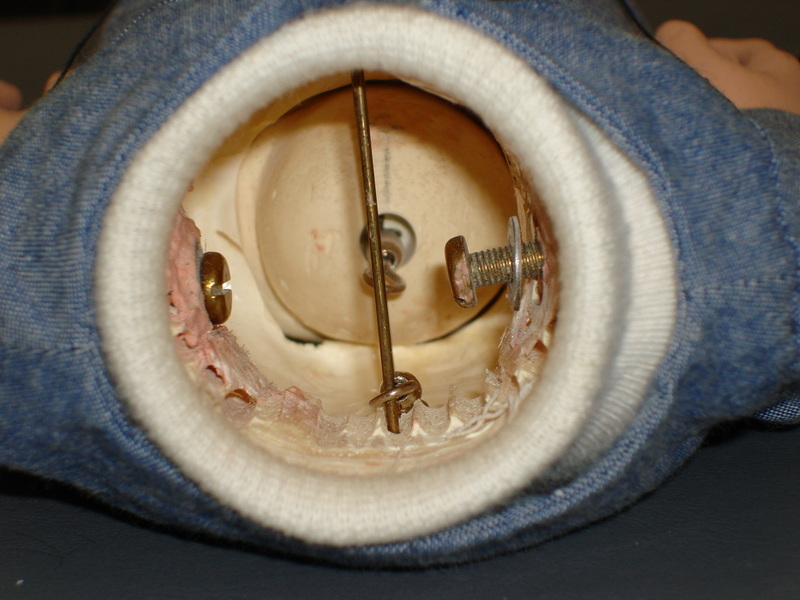 This is a replica puppet-scale control wheel. 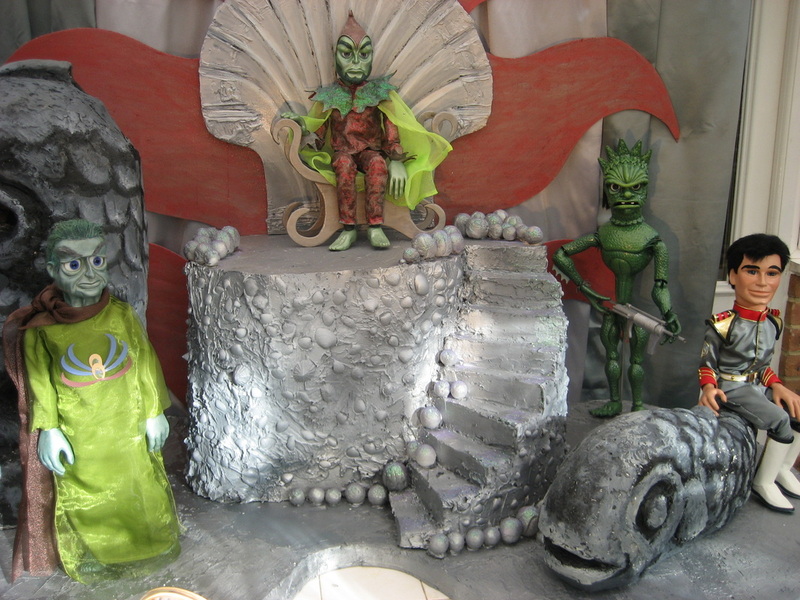 For more pictures and to see how I made it go to my PROJECTS Page - accessed from the black toolbar at the top of this page. 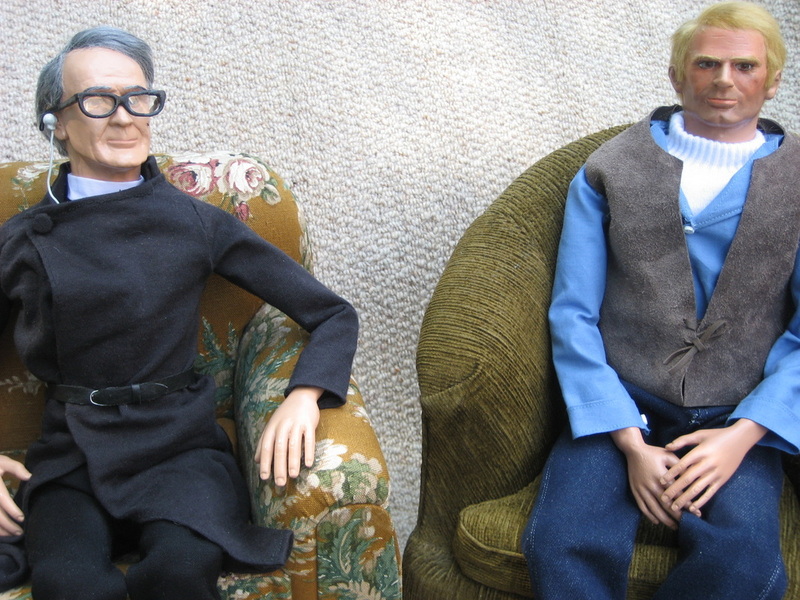 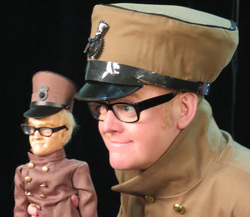 My own replica Father Unwin and Matthew Harding puppets with their original screen-used prop furniture. 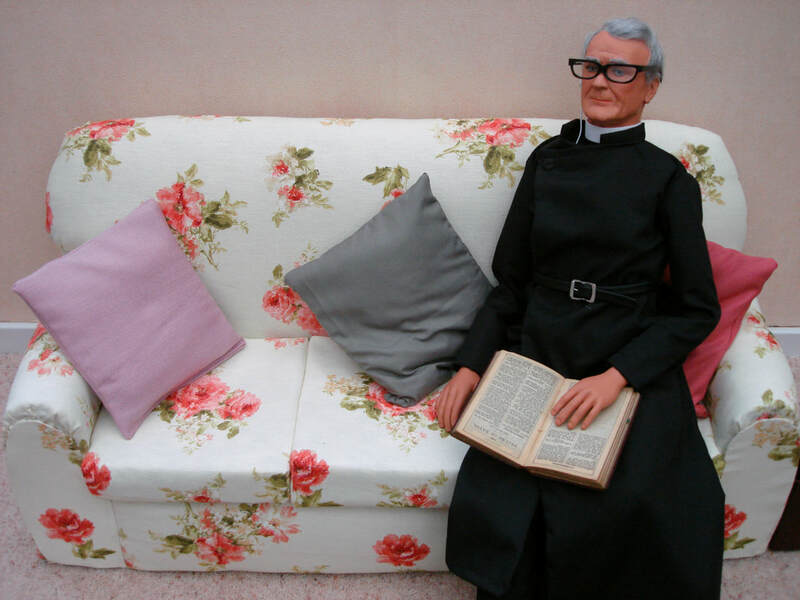 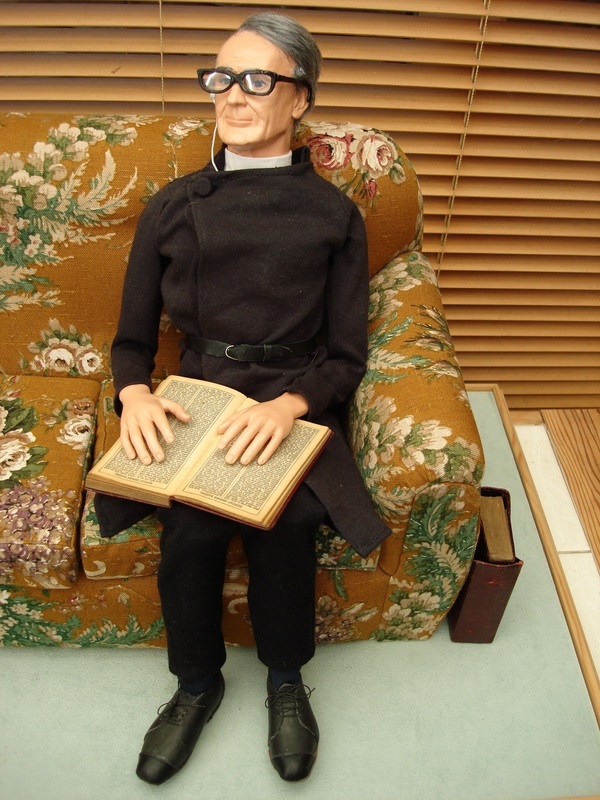 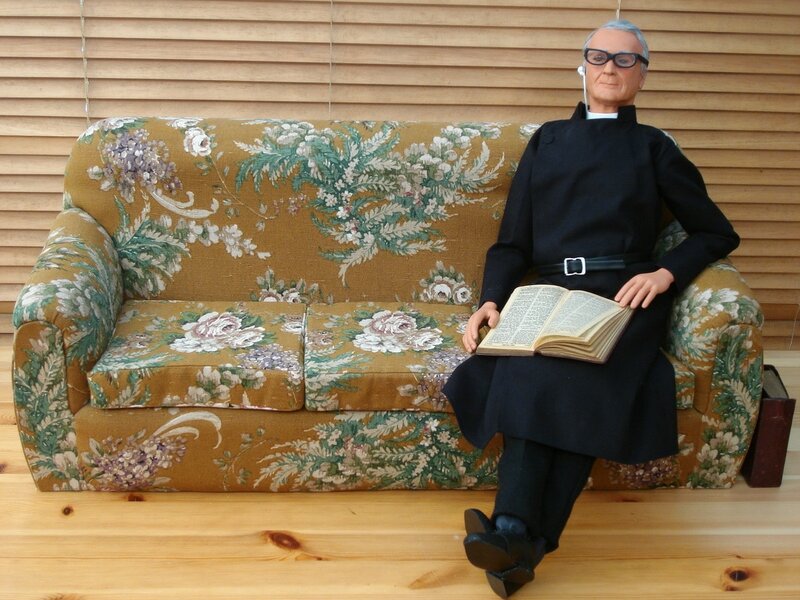 This beautiful boxed miniature Hymnal and Common Prayer book are perfect as set dressing with Father Unwin and his sofa. 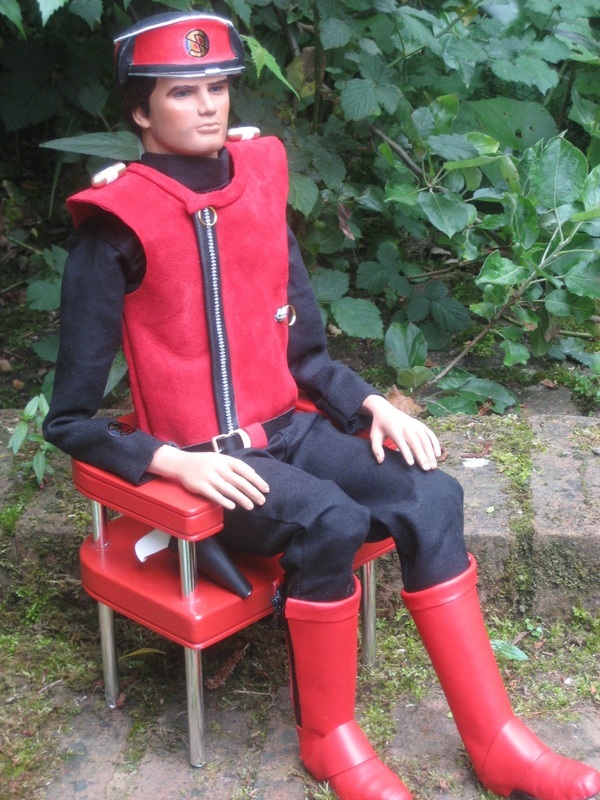 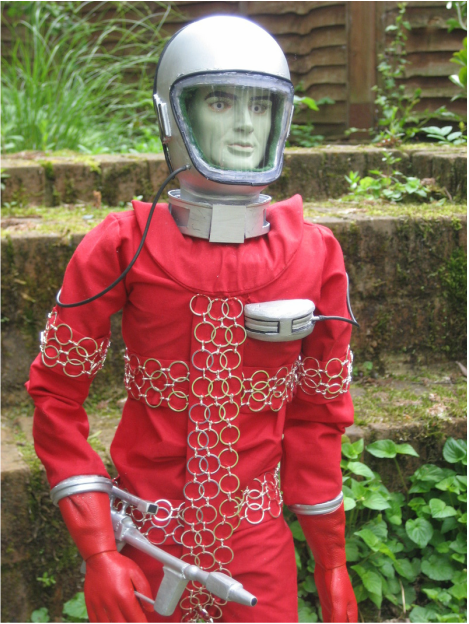 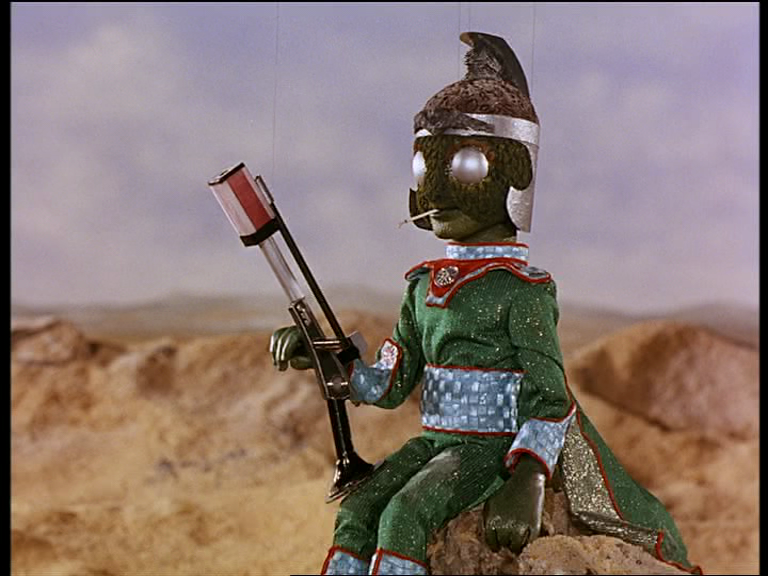 A UFO Alien which I made as a Supermarionation style puppet using a Captain Scarlet-type body with custom space suit and accessories. 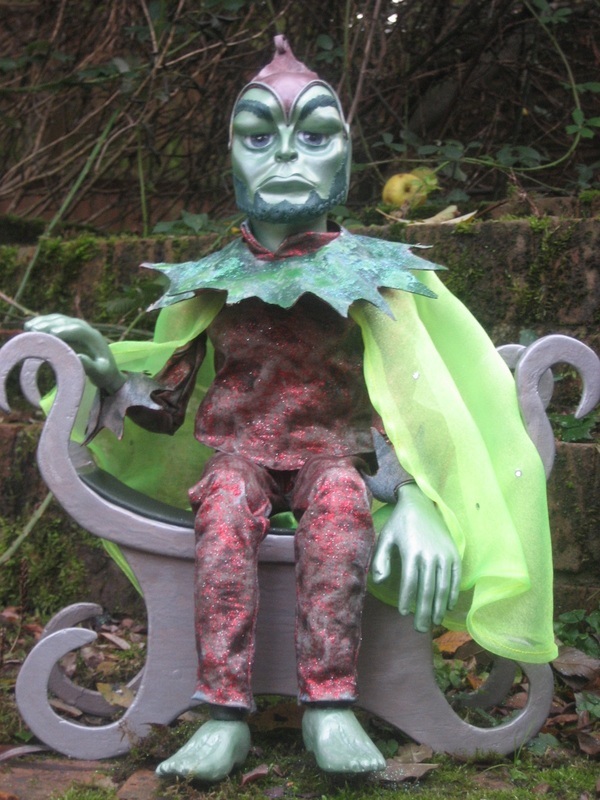 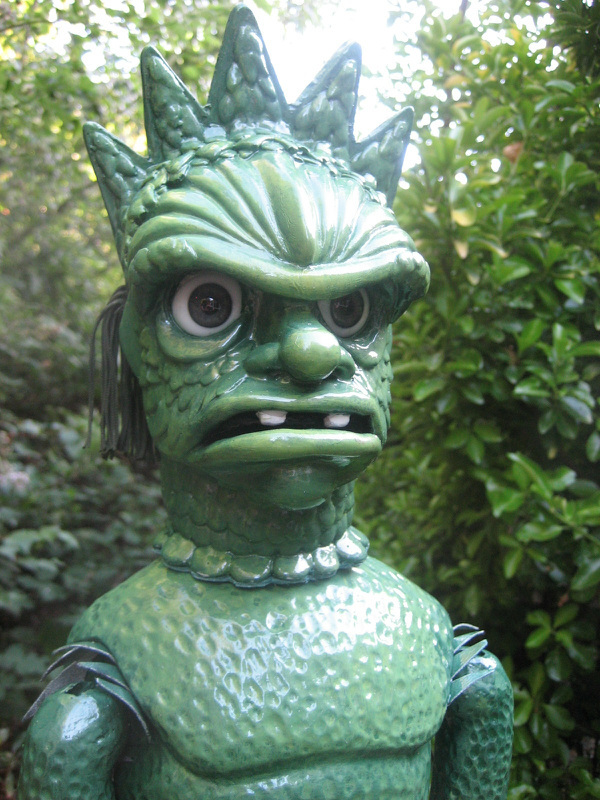 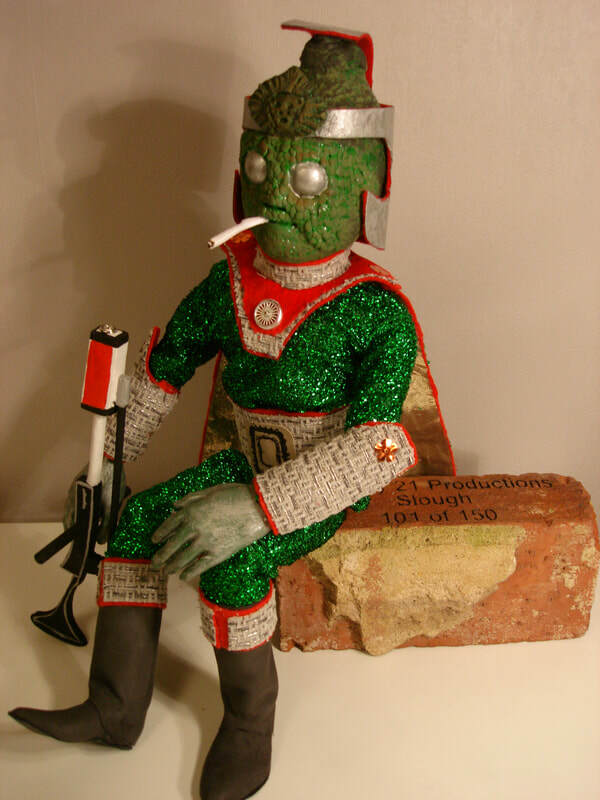 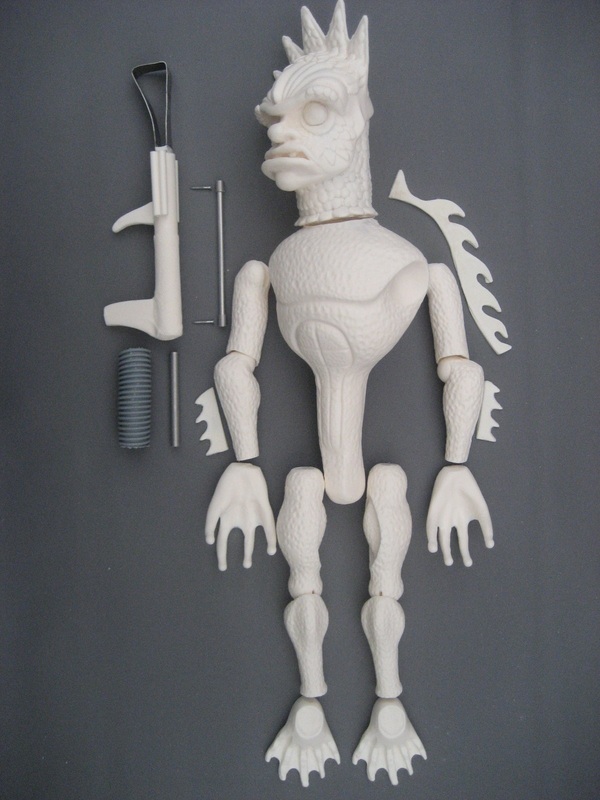 UFO Alien character re-imagined as a Supermarionation-type puppet £1,000 plus shipping. 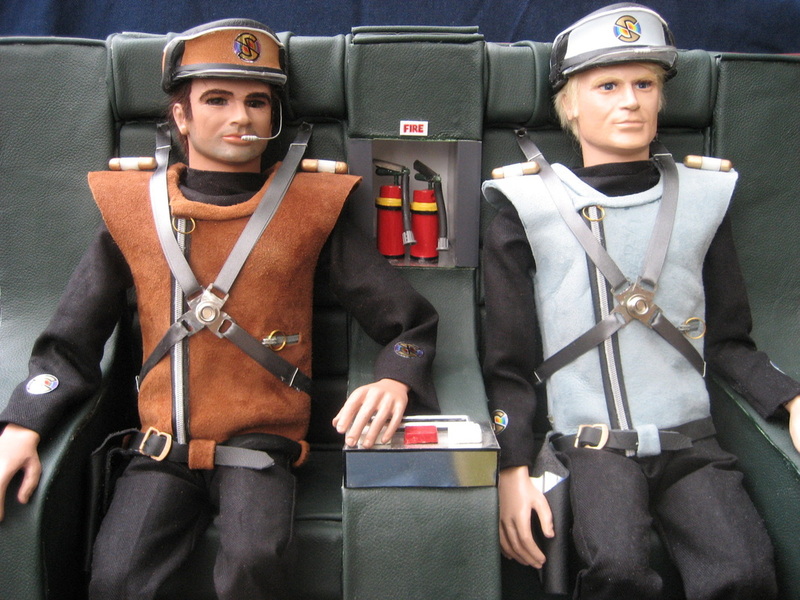 Original set showing the toy dash's main instrument cluster as the centrepiece of a communications console. 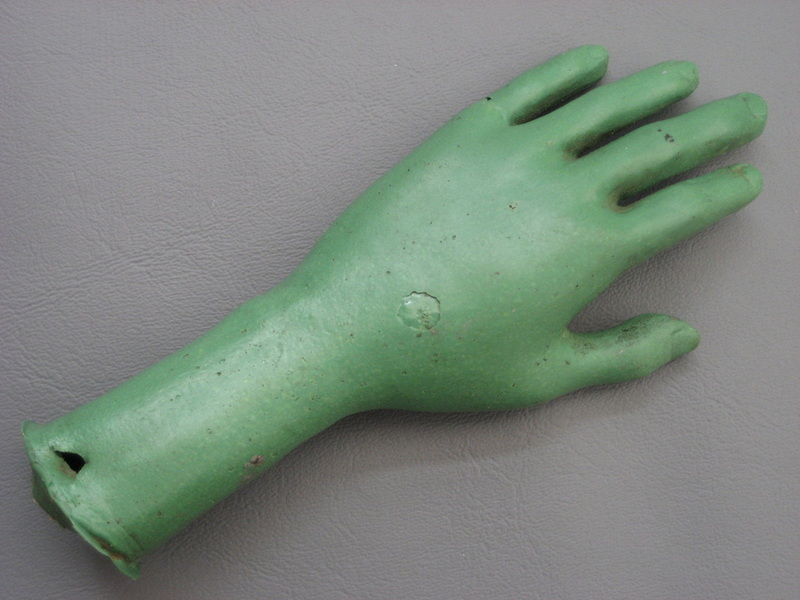 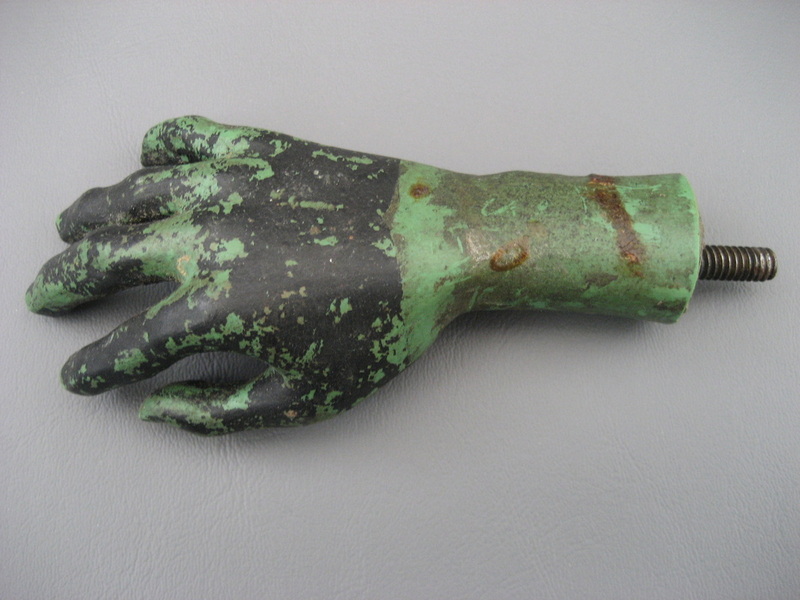 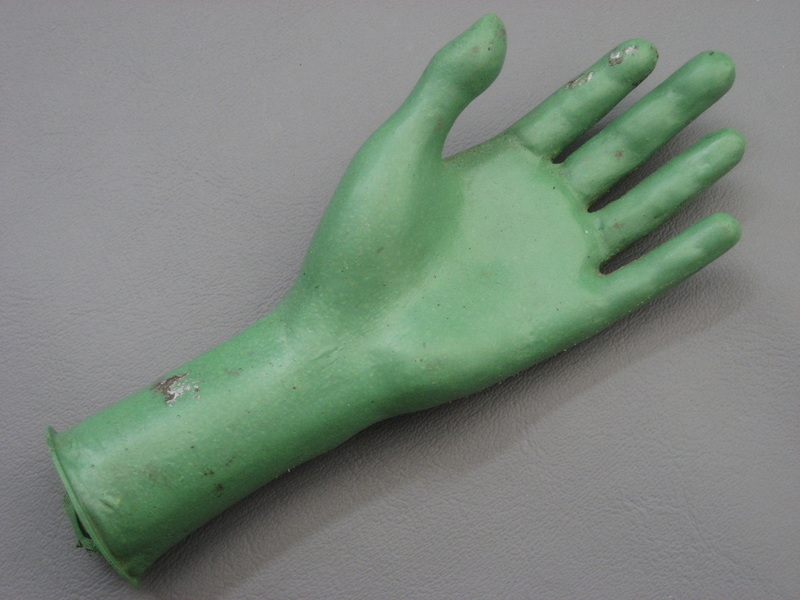 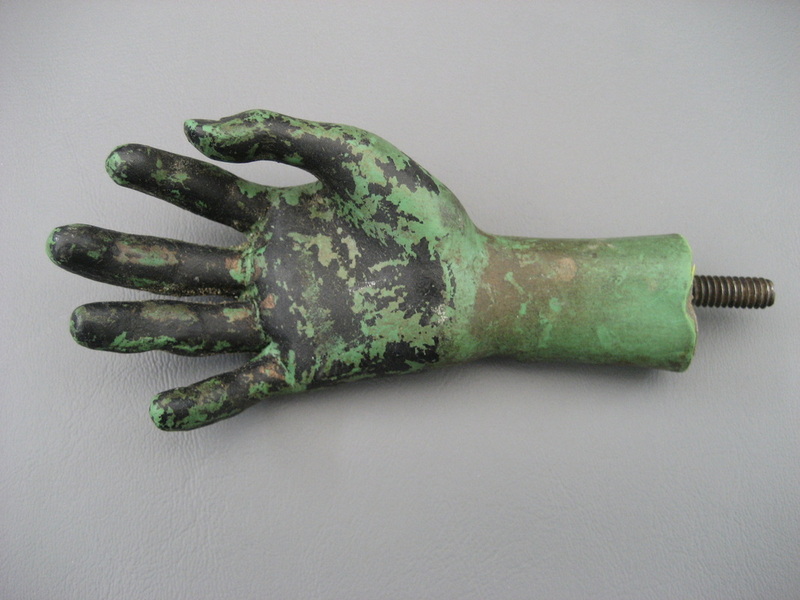 ...probably because of the small circular flaw in the cast on the back of the hand. 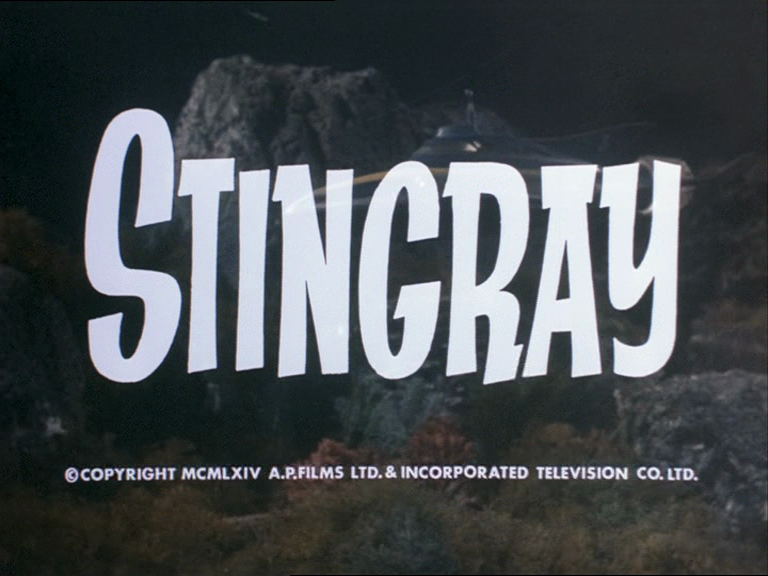 I am delighted to have been able to add this highly unusual - and possibly unique - piece of Stingray history to my collection. 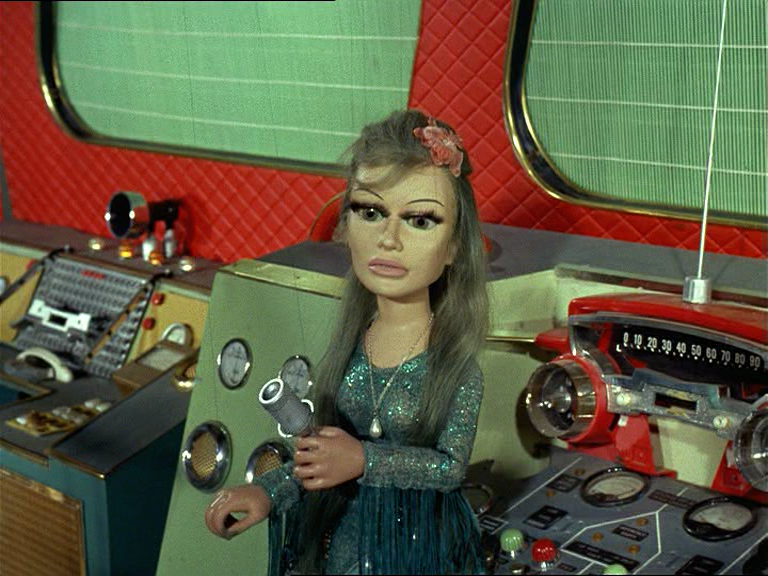 Legendary sculptress, puppeteer and puppet-maker Mary Turner worked on every Supermarionation series. 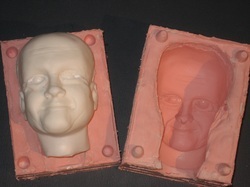 Among her many creations for Gerry Anderson was the original sculpt for Stingray Captain and hero Troy Tempest's head. 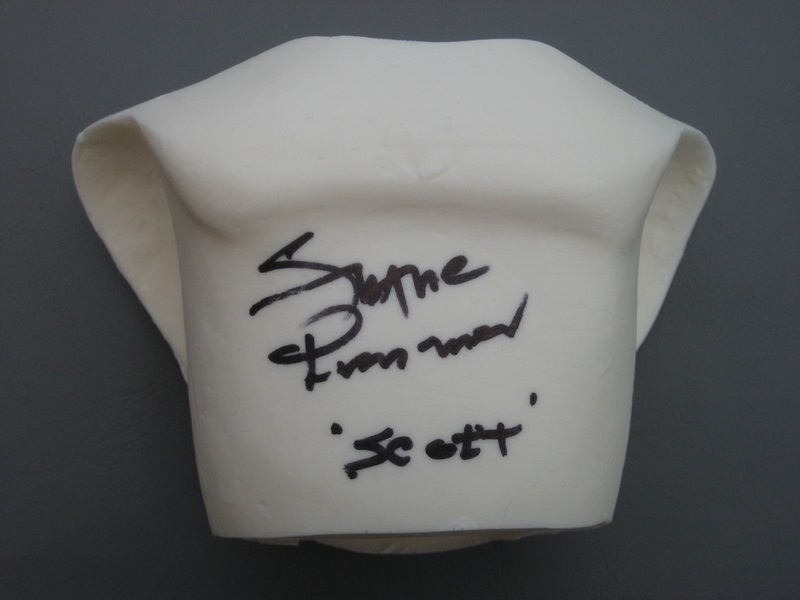 On 18th May 2014 Mary kindly made her signature for me on my replica Troy's chest. 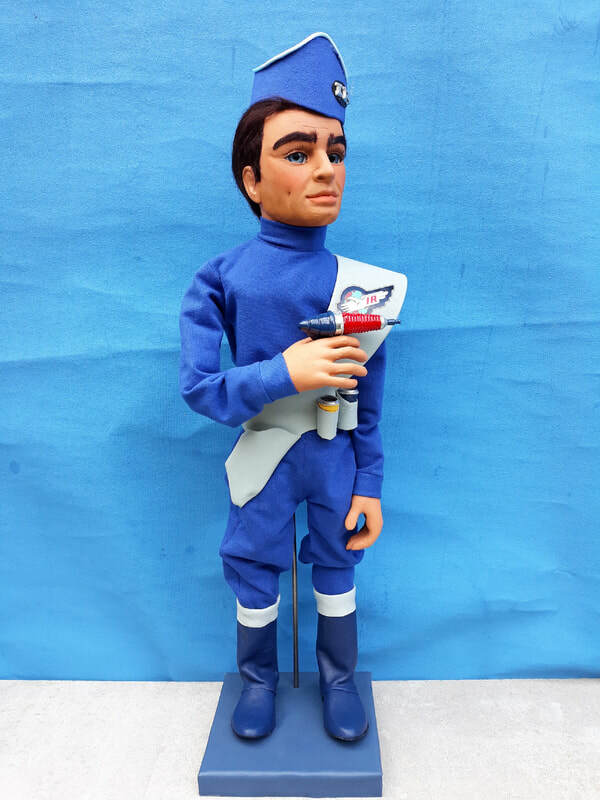 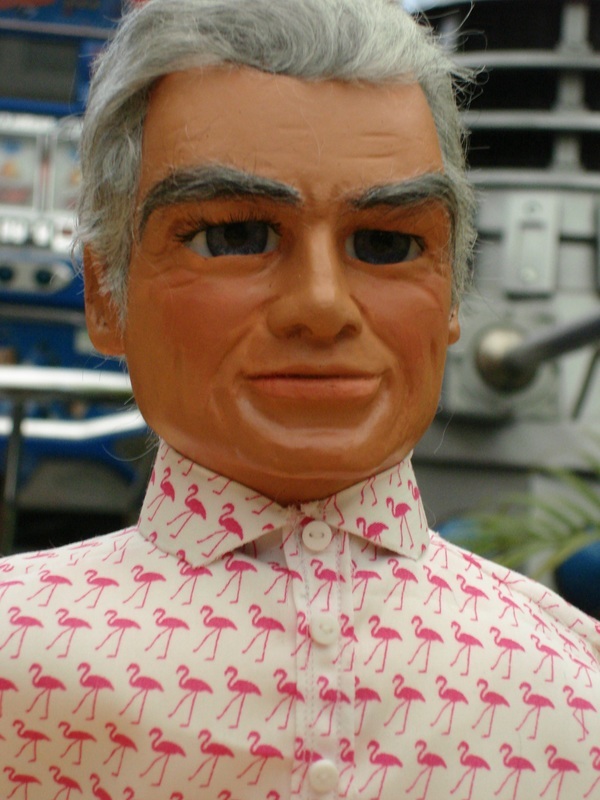 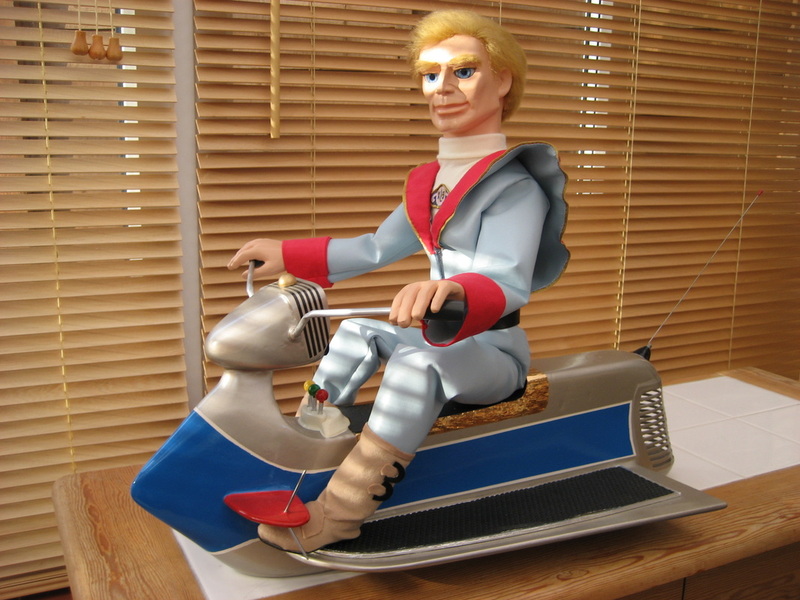 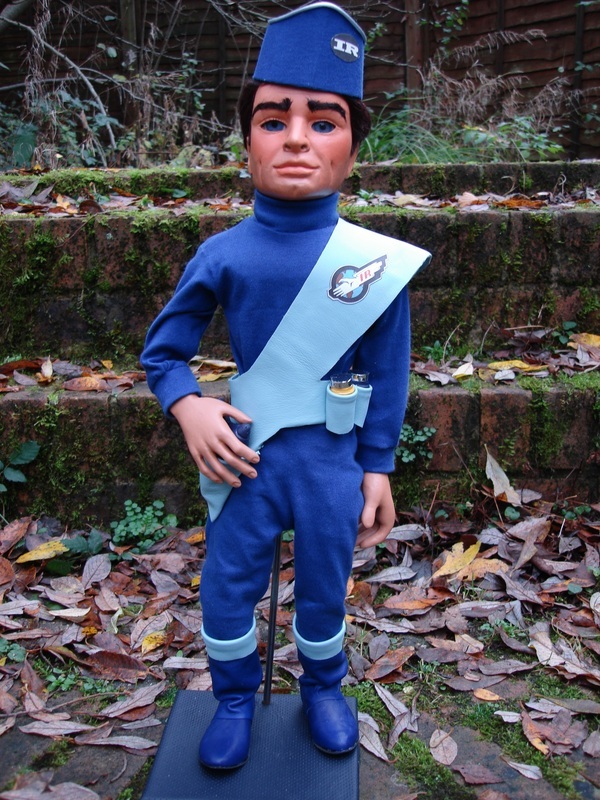 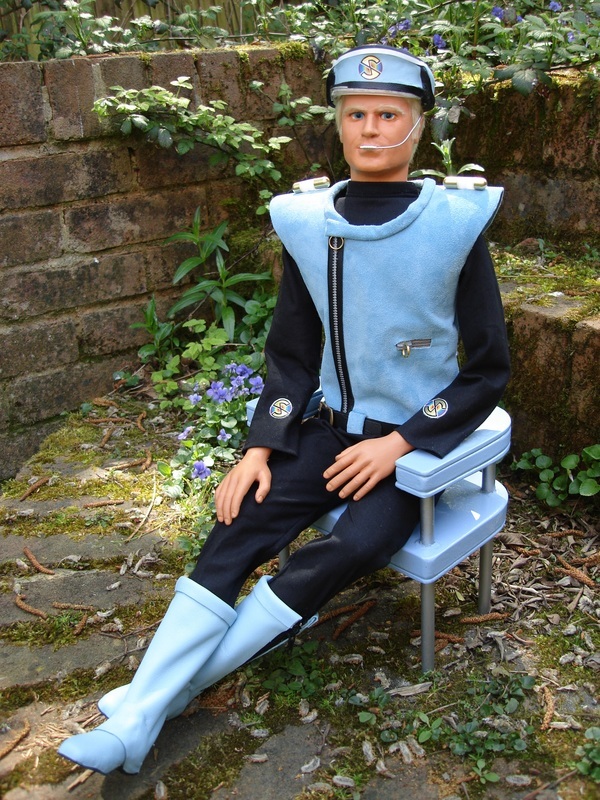 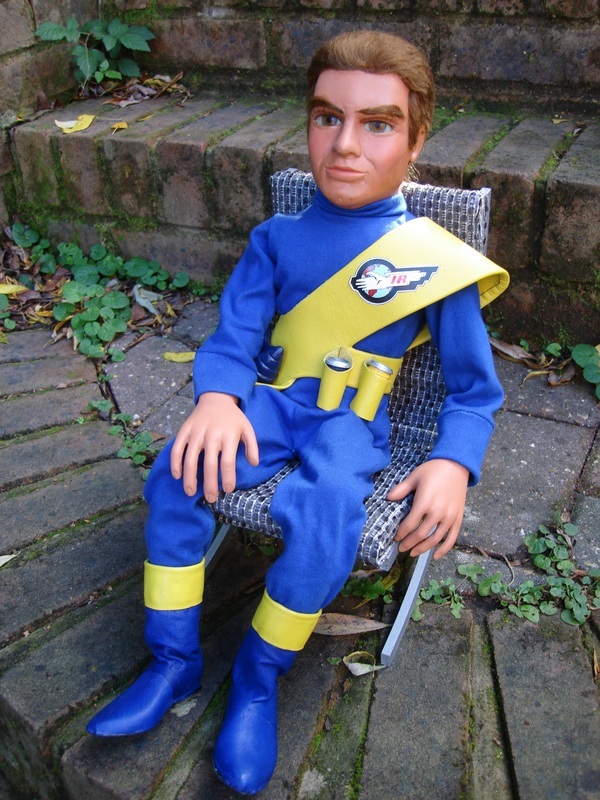 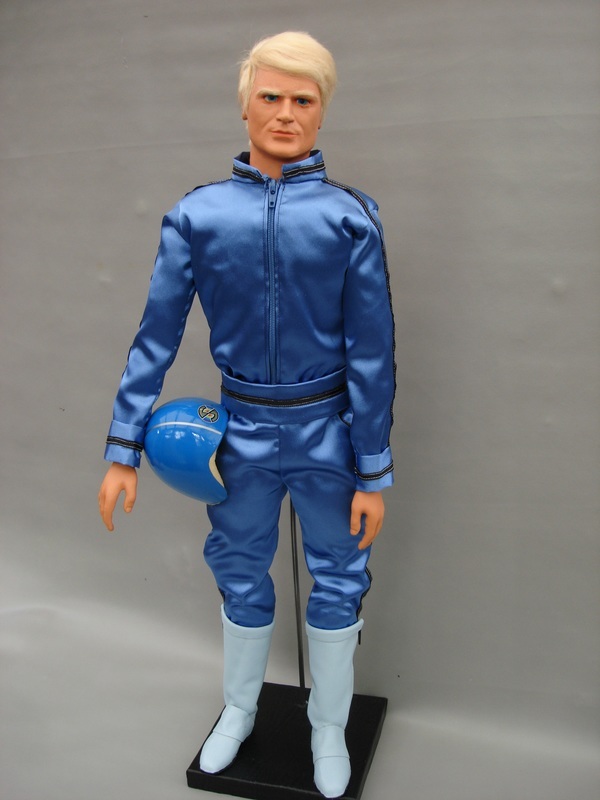 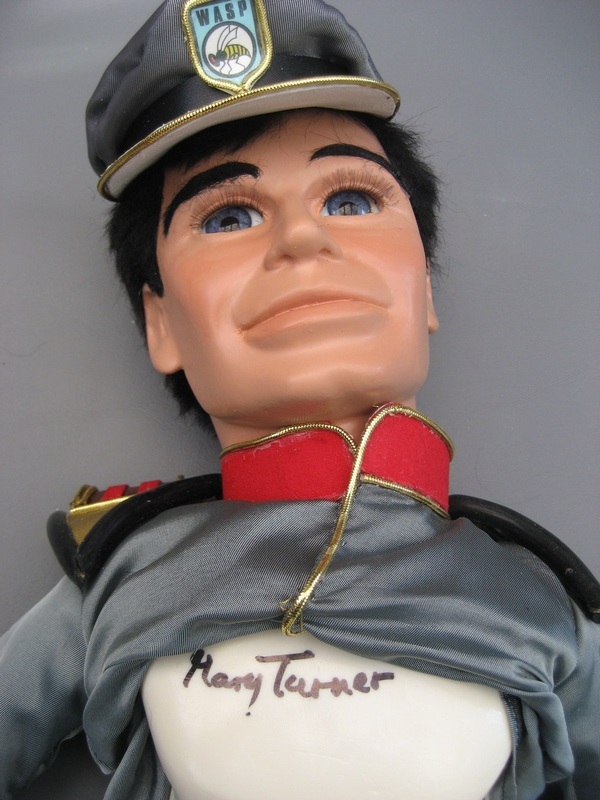 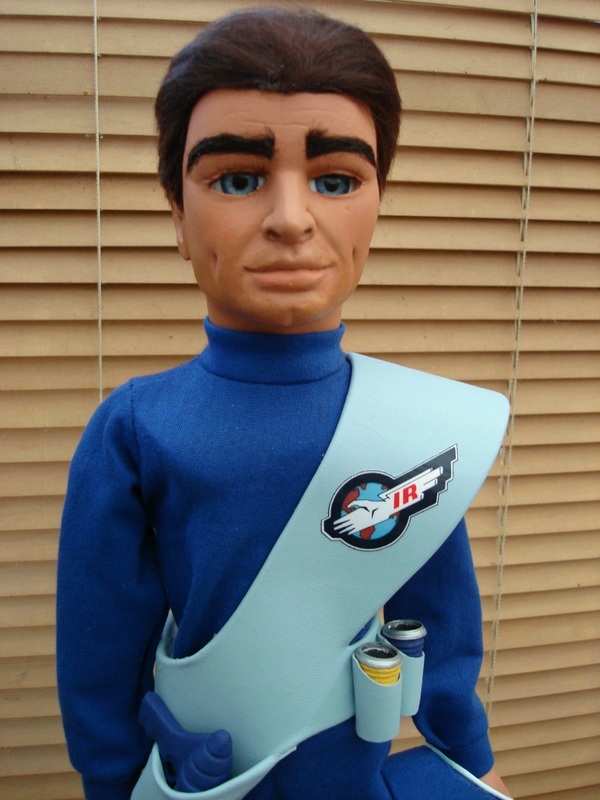 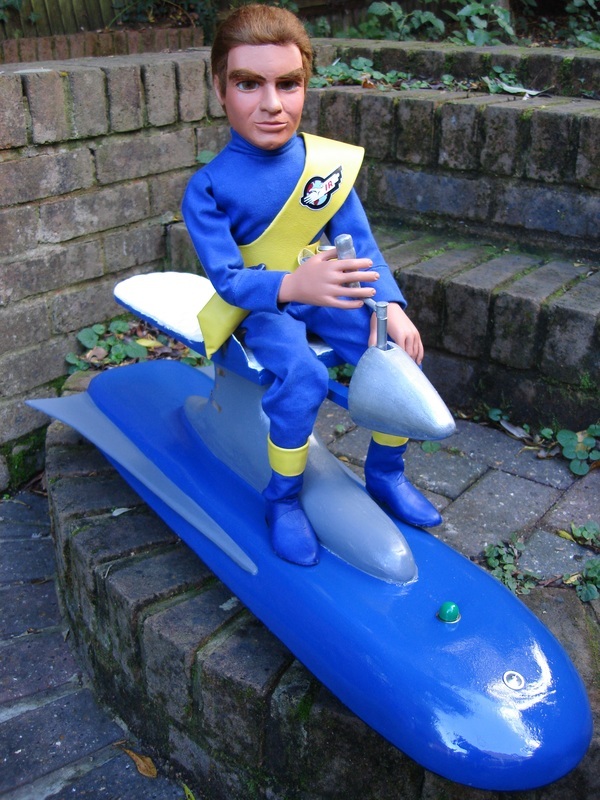 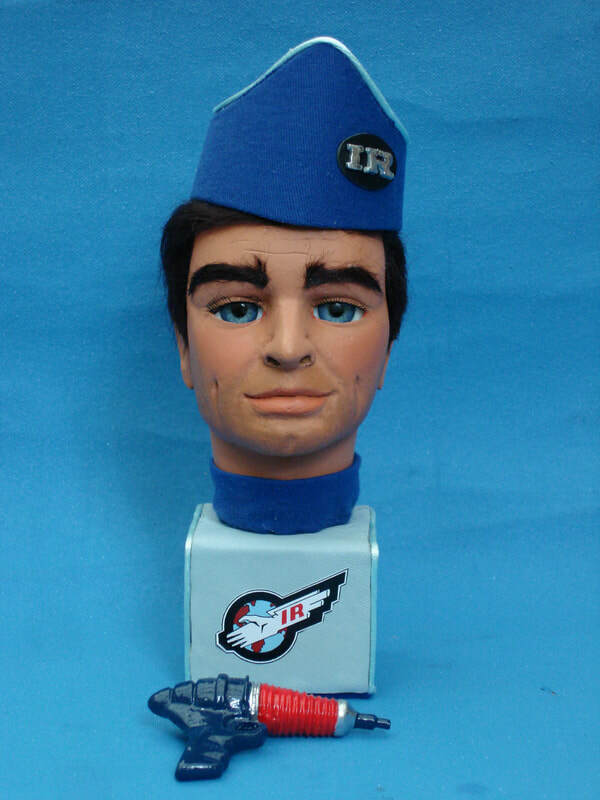 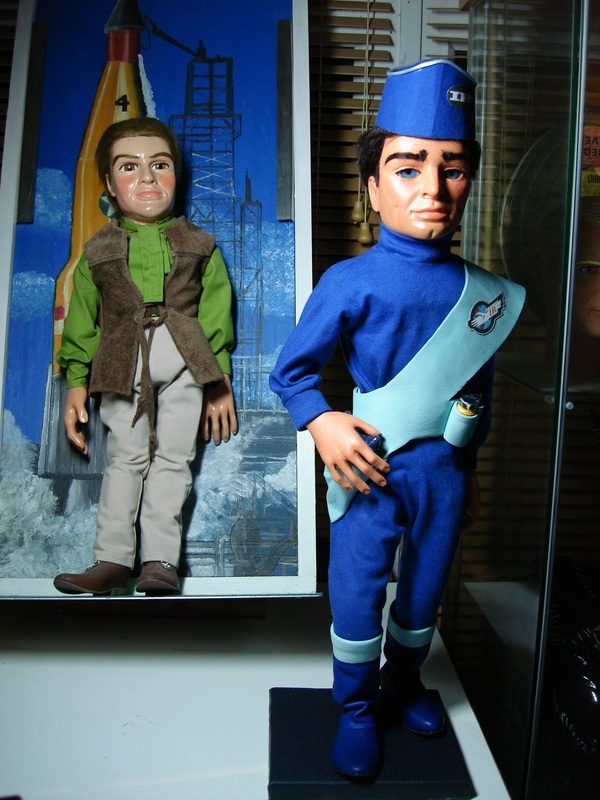 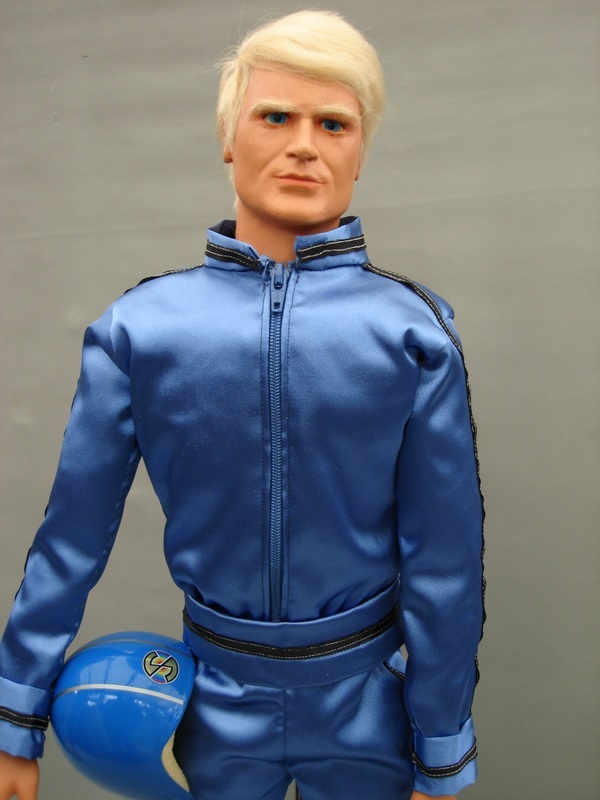 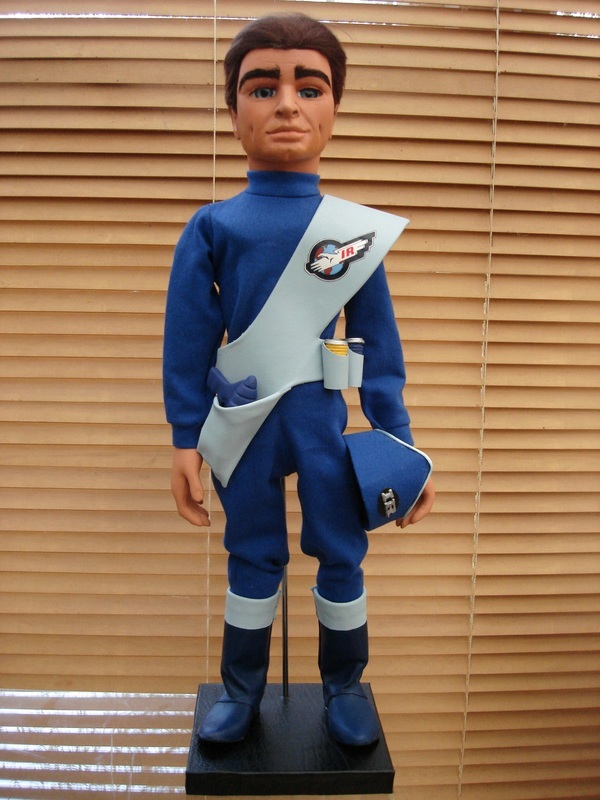 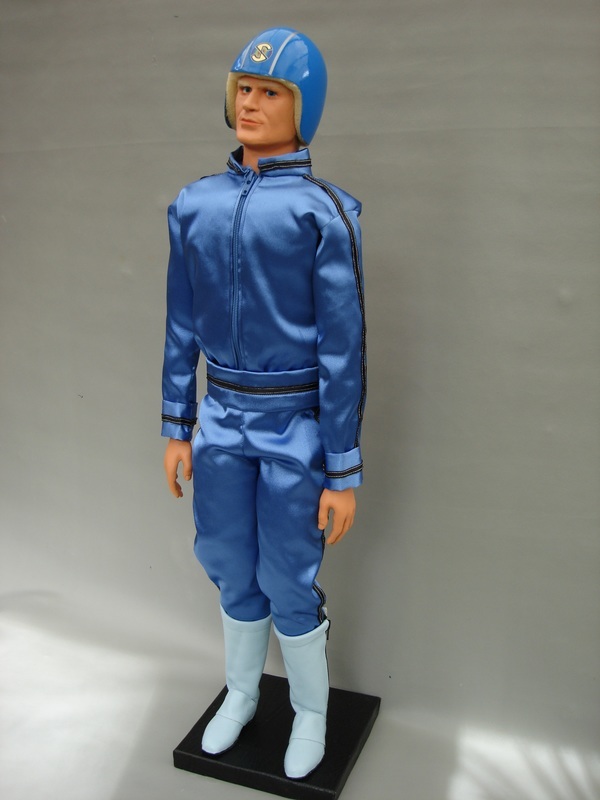 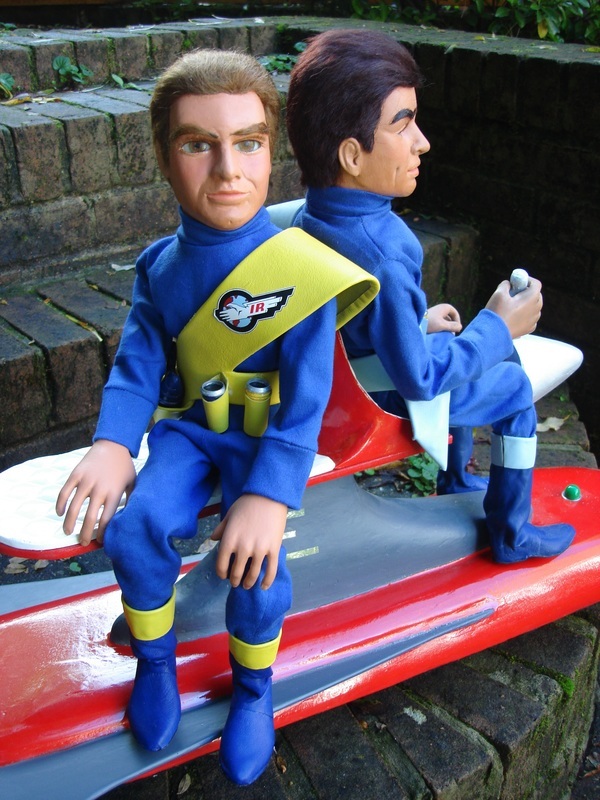 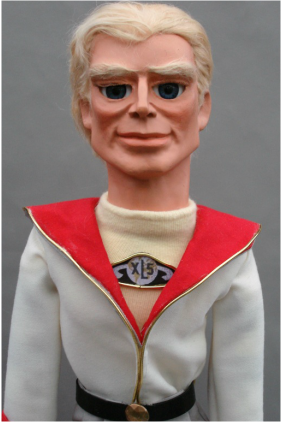 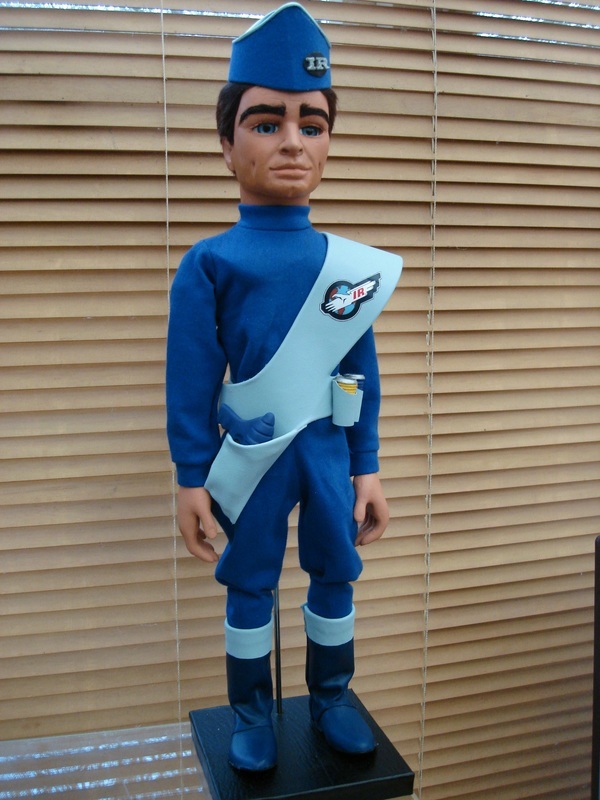 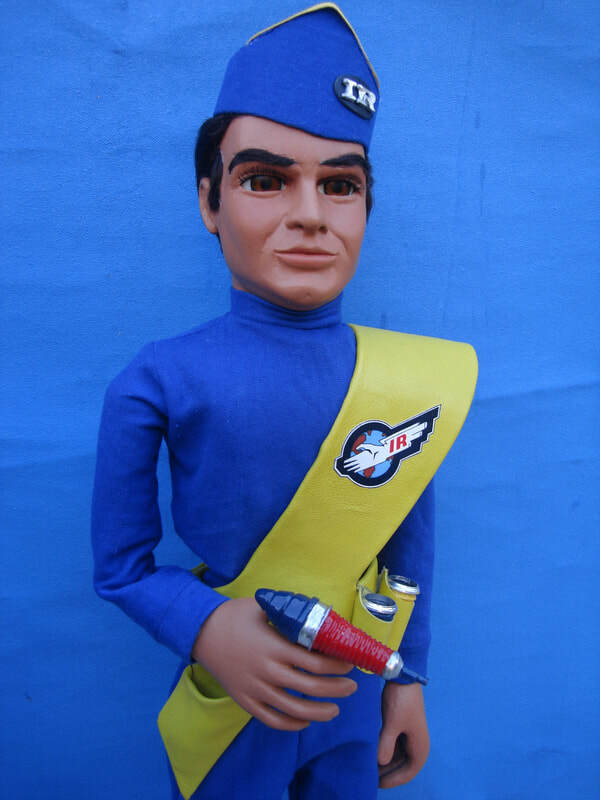 Actor Shane Rimmer famously gave voice to the hero pilot of Thunderbird 1, Scott Tracy. 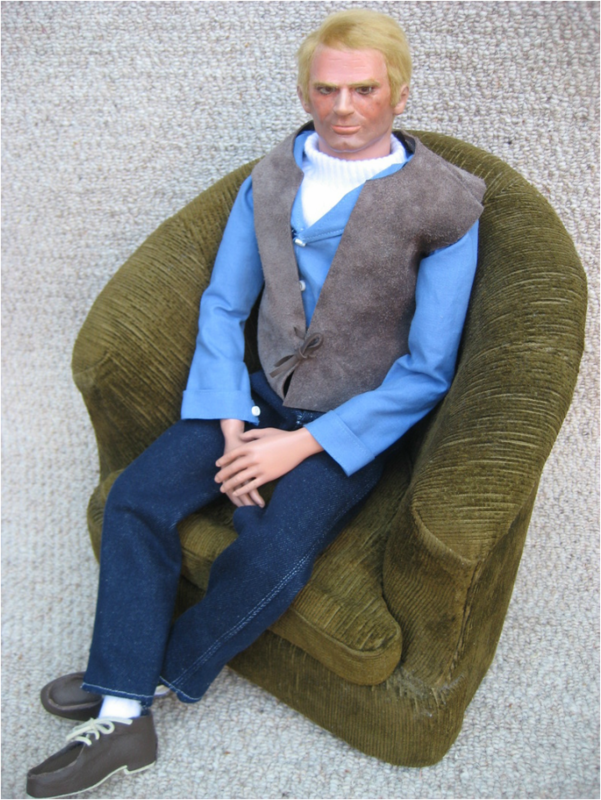 Shane was a delight to meet; he and his wife were incredibly kind to me when I met them on 18.05.14. 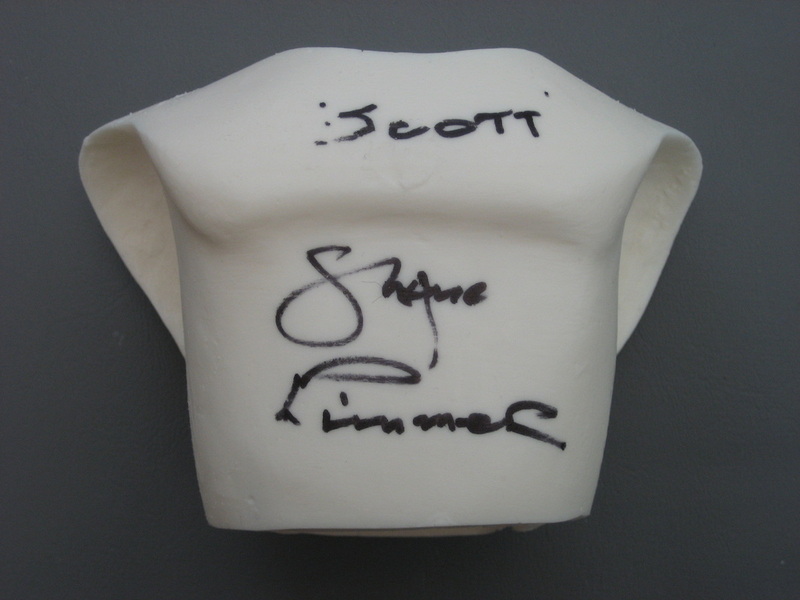 Shane willingly added his signature and "Scott" to these two puppet chests which I will one day work up into completed Scott Tracy puppet replicas. 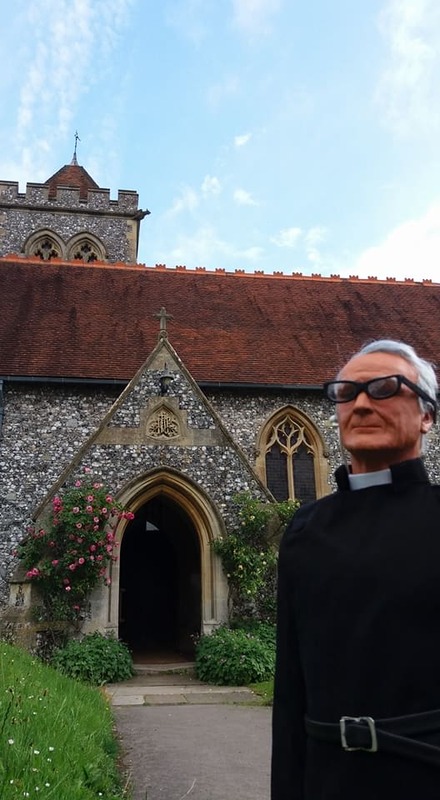 See my 'Original' Page for a full photo diary of when I took my replica Father Unwin and Matthew Harding puppets along with my original sofa from The Secret Service to see the one and only complete Mrs Appleby puppet known to exist. 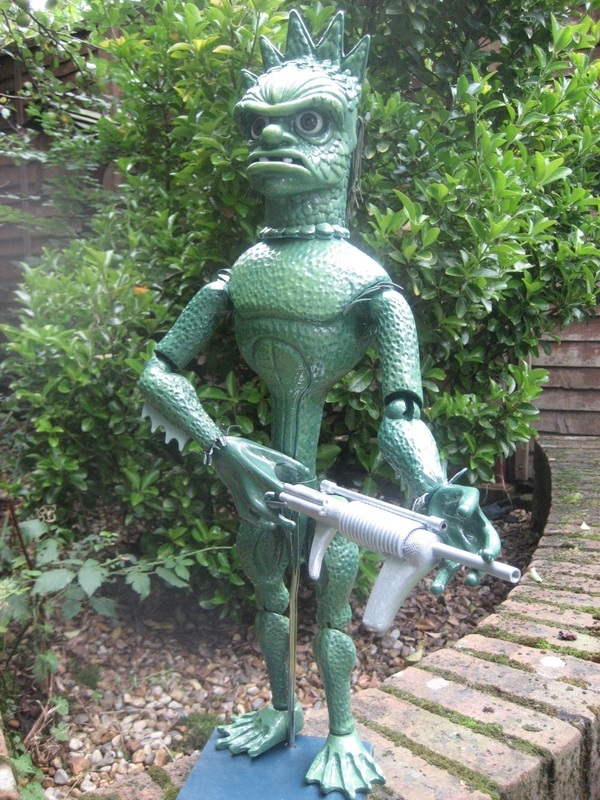 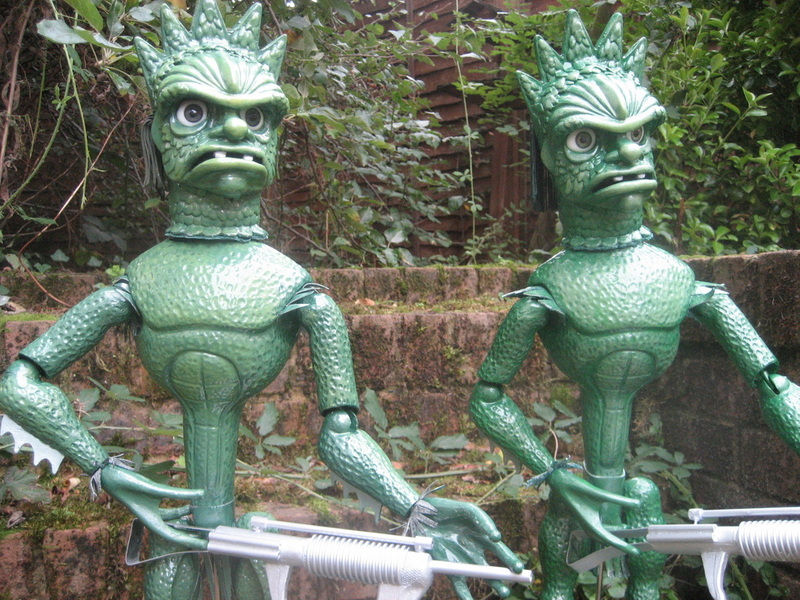 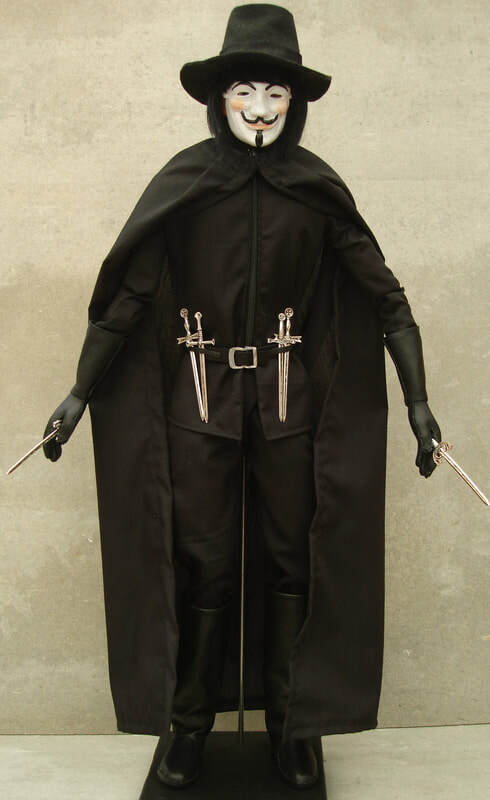 Completed Aquaphibian puppet replica (with gun) £750 plus shipping. 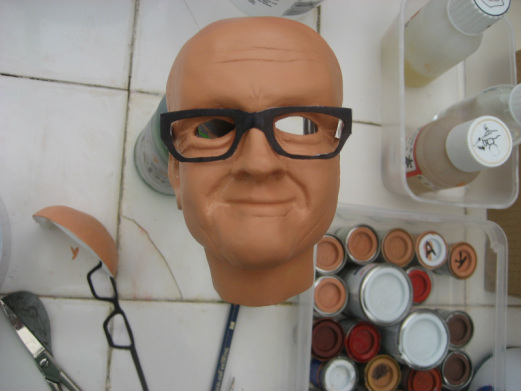 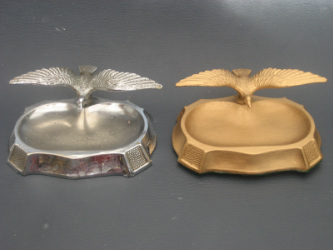 There will be regular updates on new character and prop casts as they become available - September 2013 saw the arrival of Jeff's ashtray/communications device. 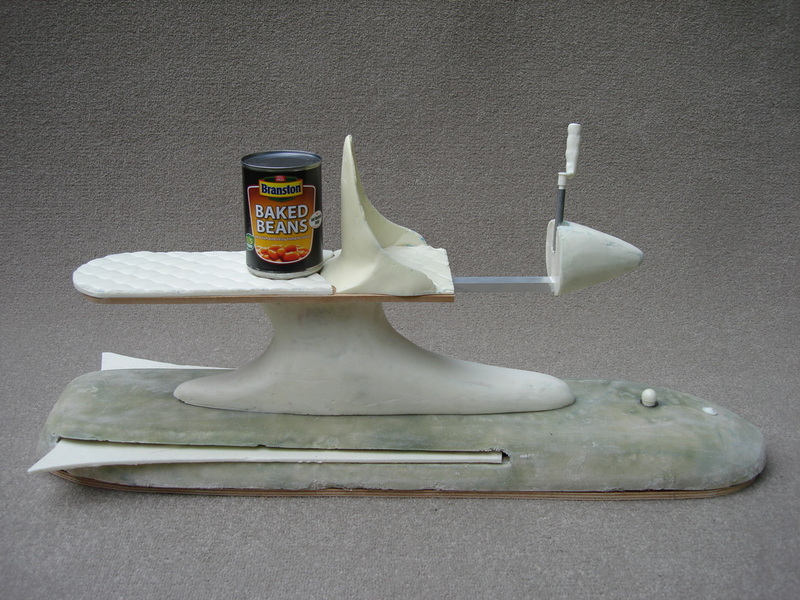 Here's an original 60's ashtray alongside my resin copy which I have painted and dressed to look like the prop. 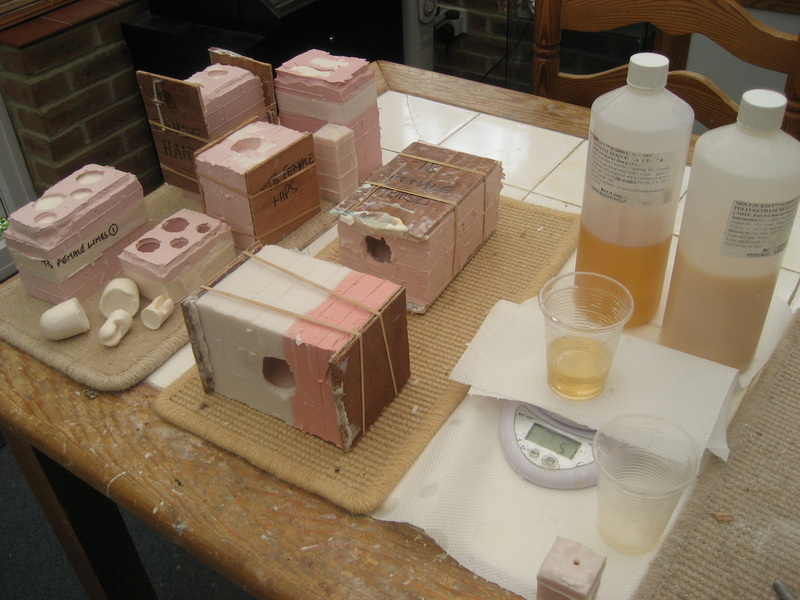 and to show every stage of the process. 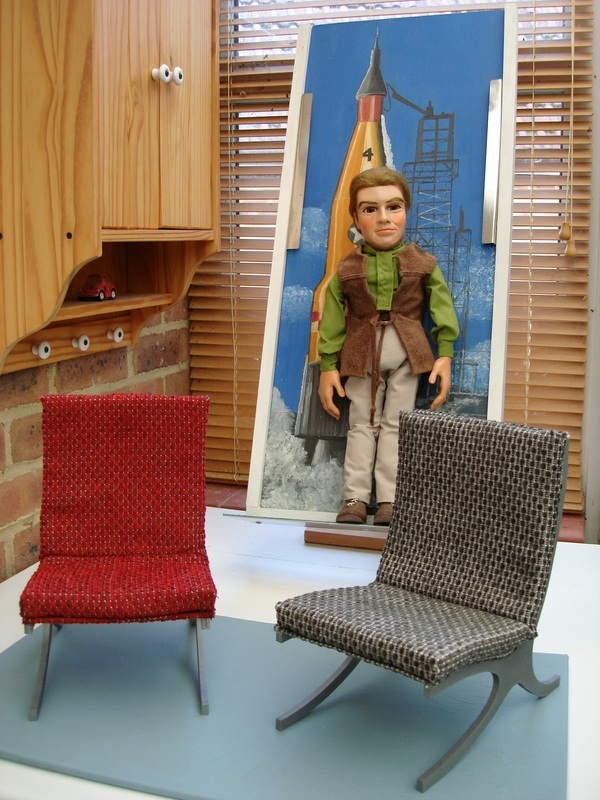 Parker with his Driver's Seat from FAB 1, Virgil Tracy with his Rocket Painting. 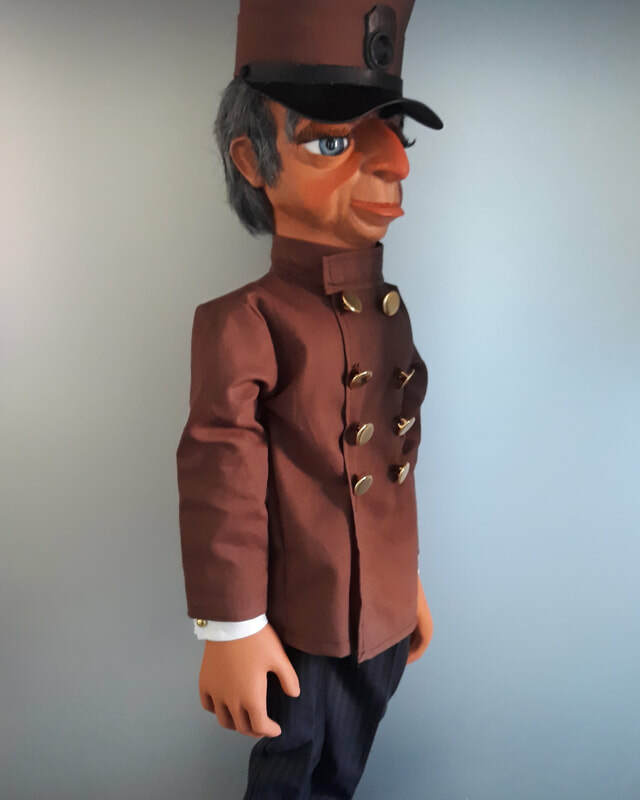 ...to full puppet replicas with seats, and puppet-scale props - please enquire for a quote if you don't already see the particular puppet-scale prop that you would like on my site.